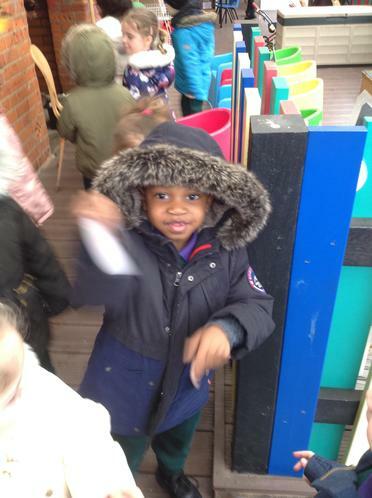 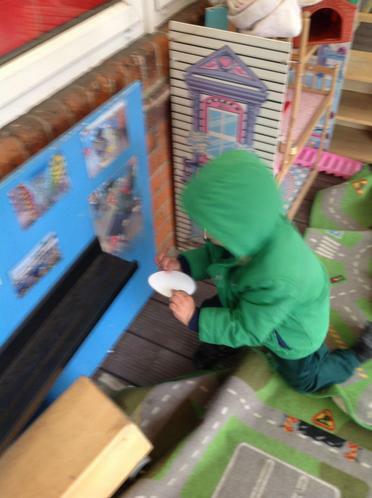 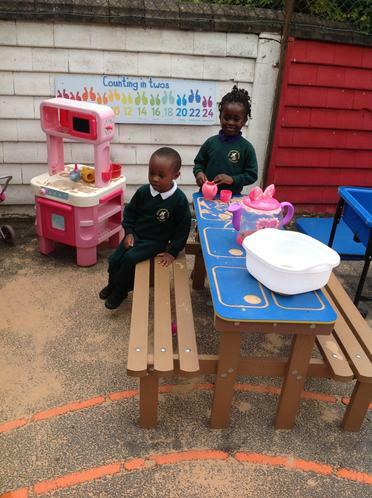 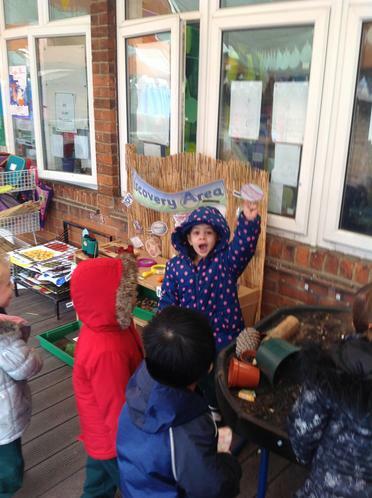 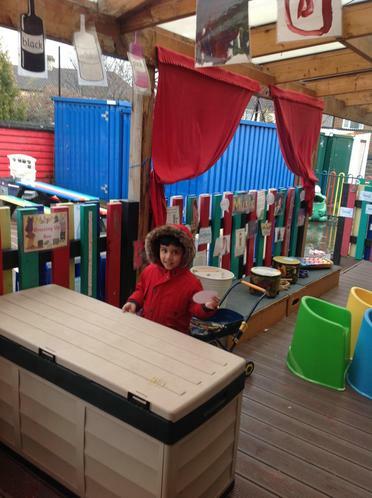 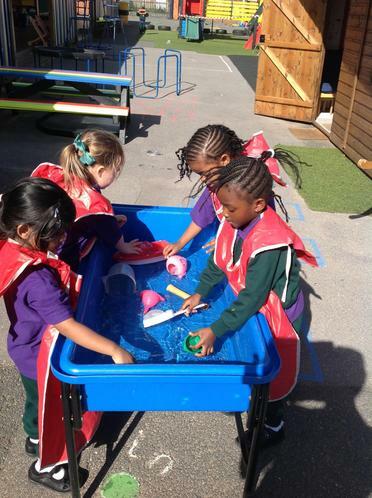 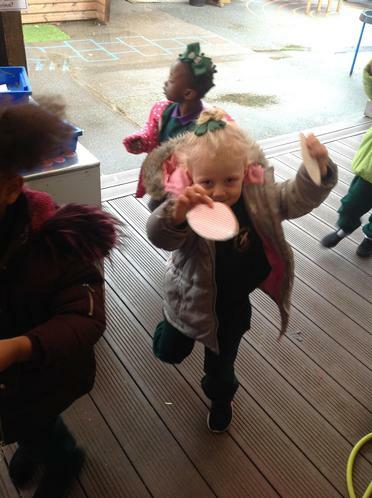 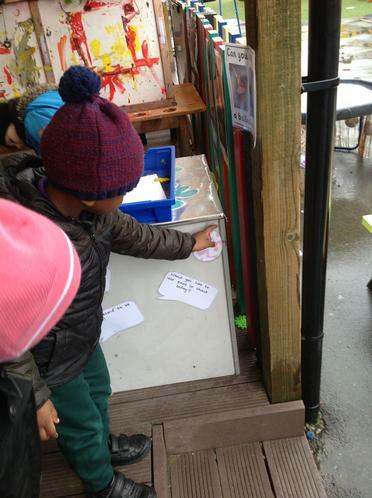 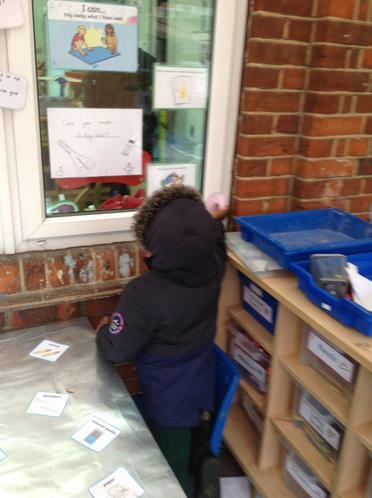 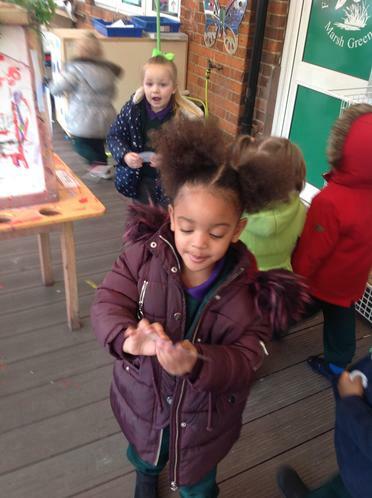 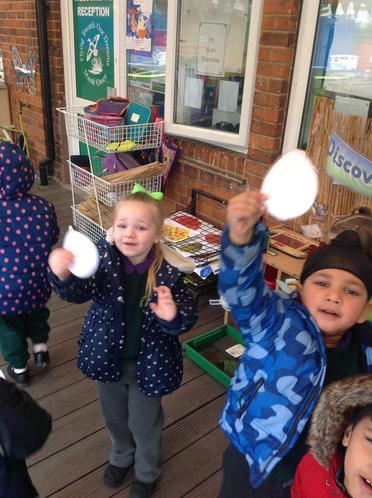 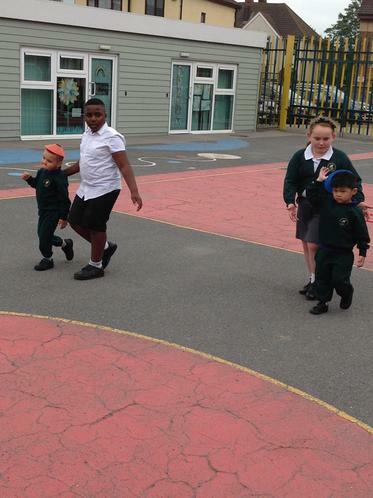 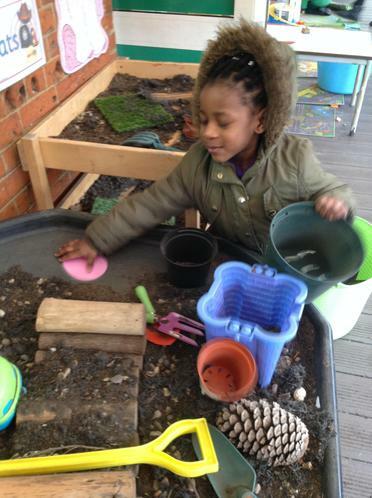 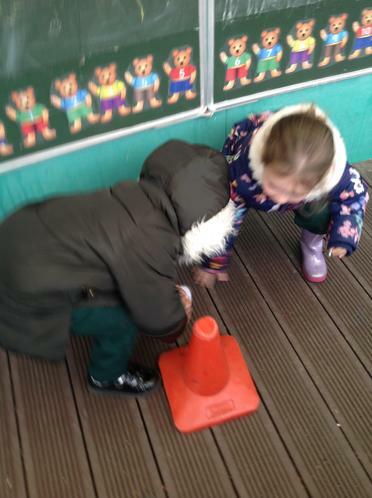 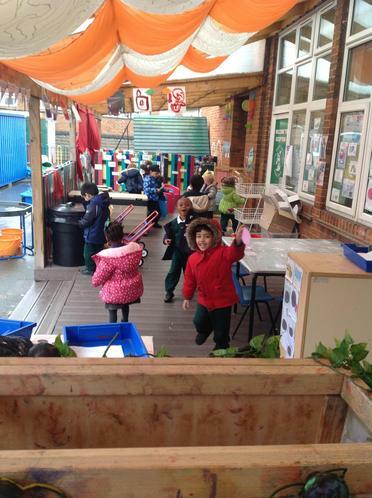 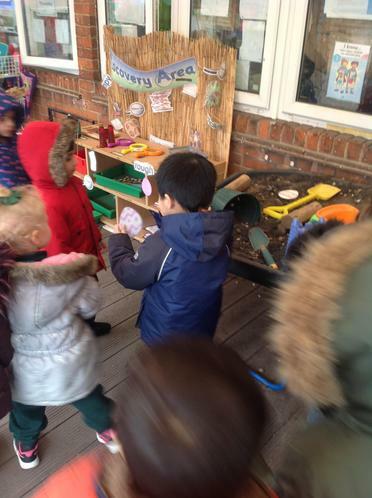 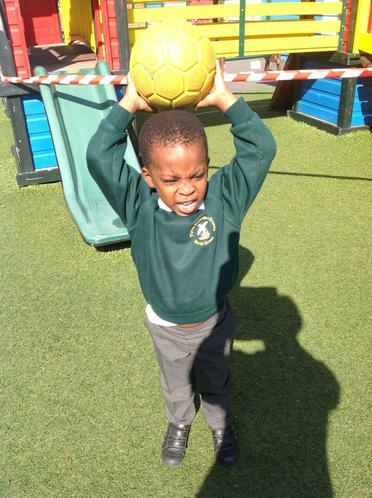 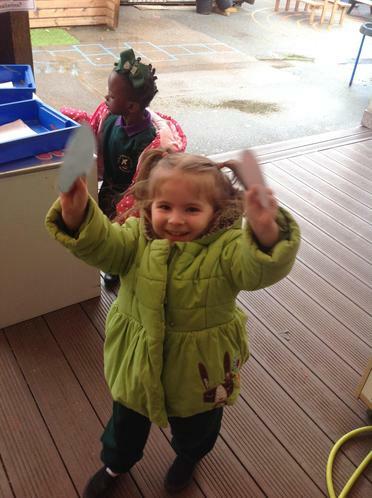 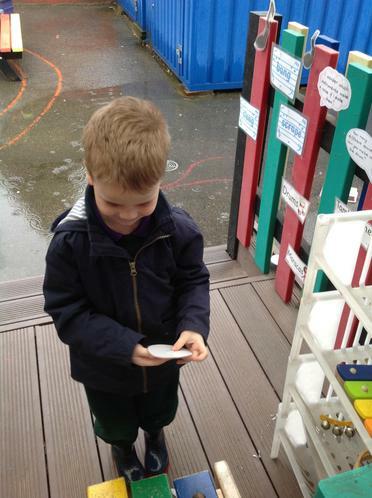 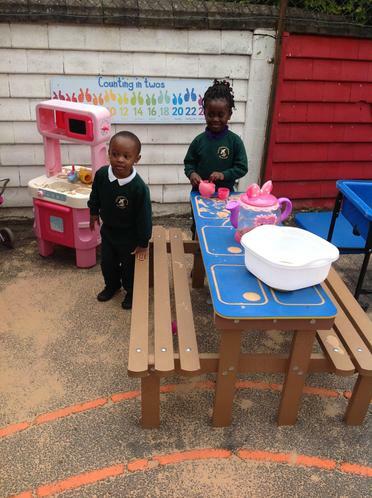 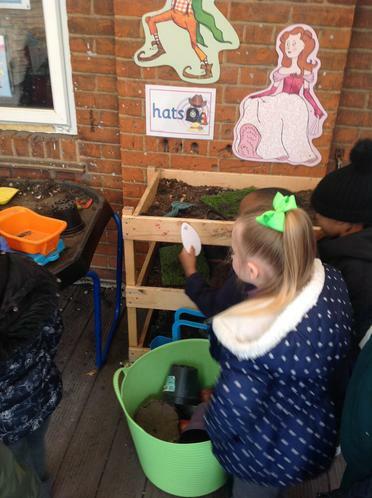 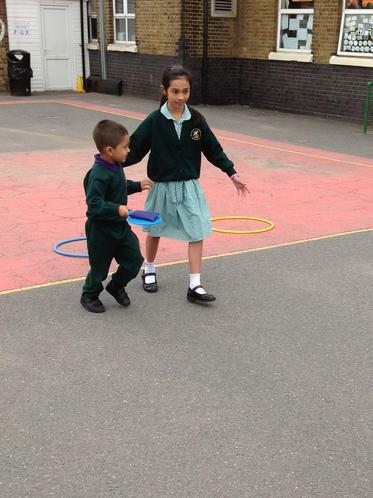 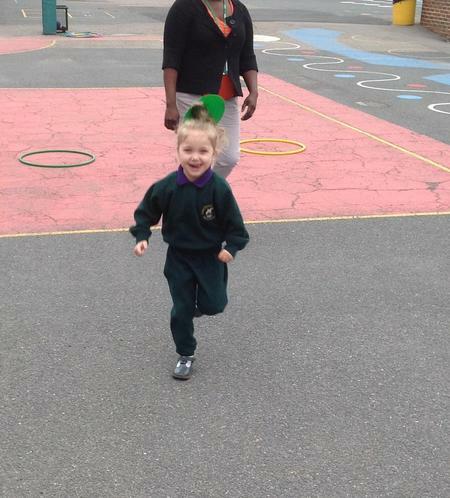 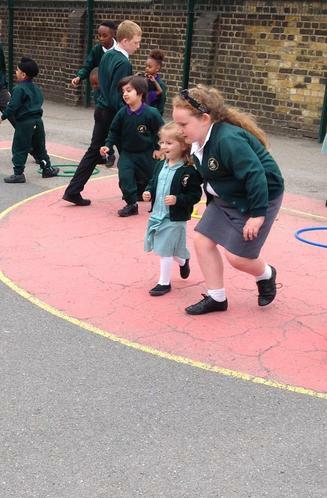 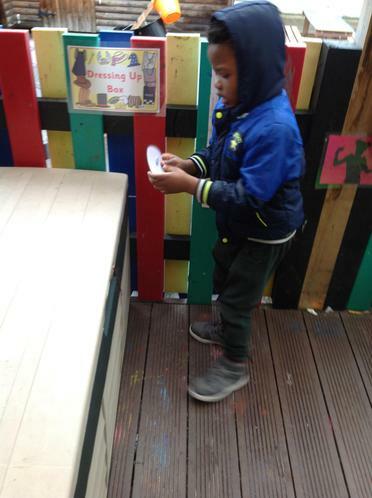 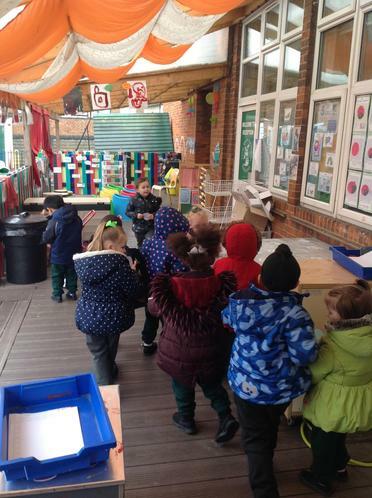 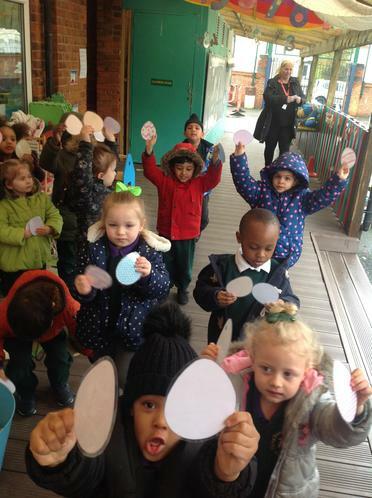 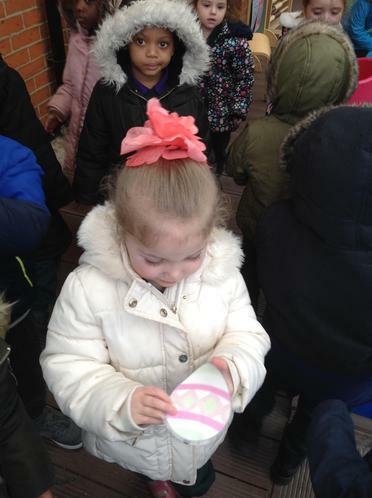 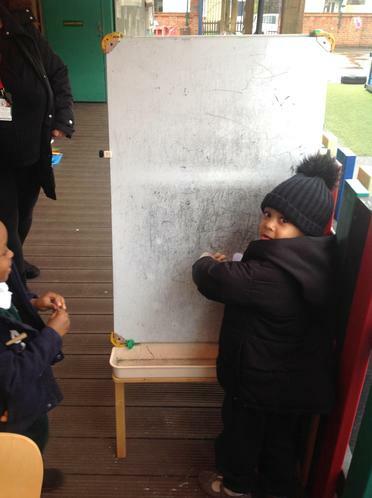 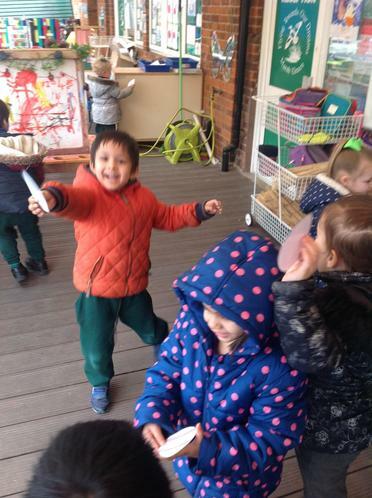 All the children were very excited to look for Easter eggs hidden by the Easter bunny outside! 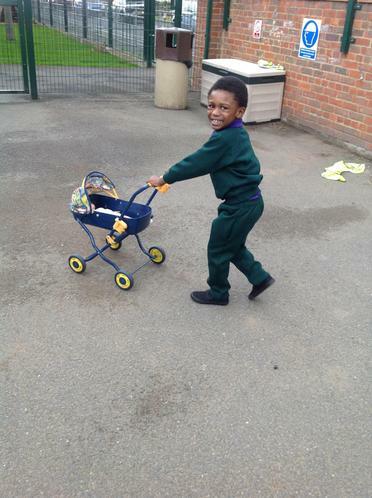 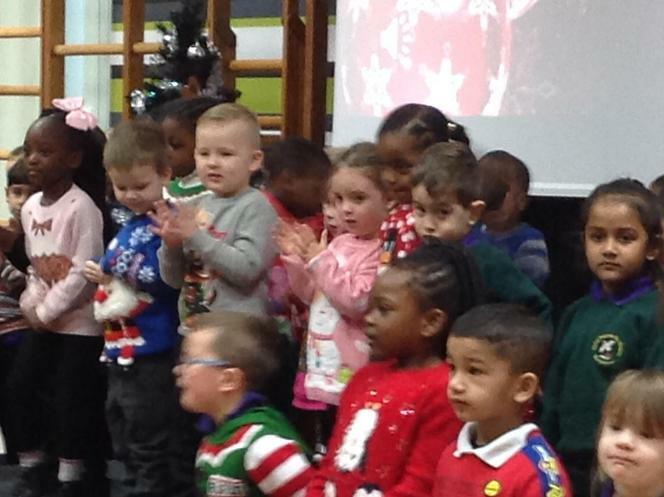 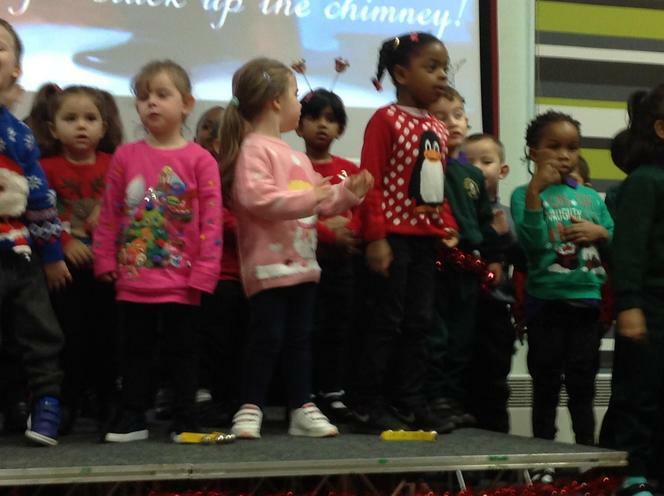 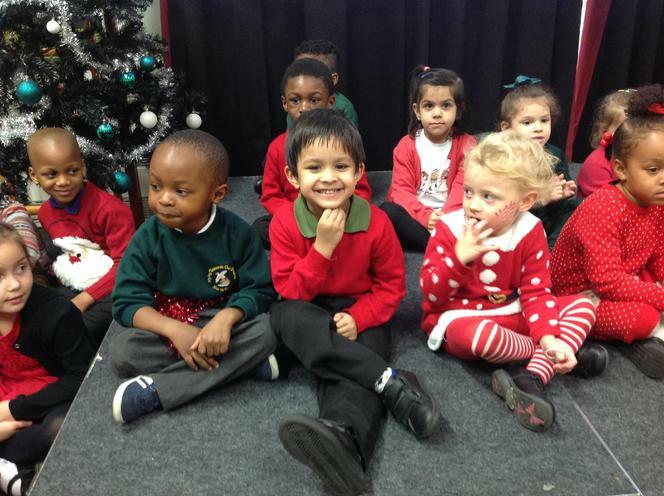 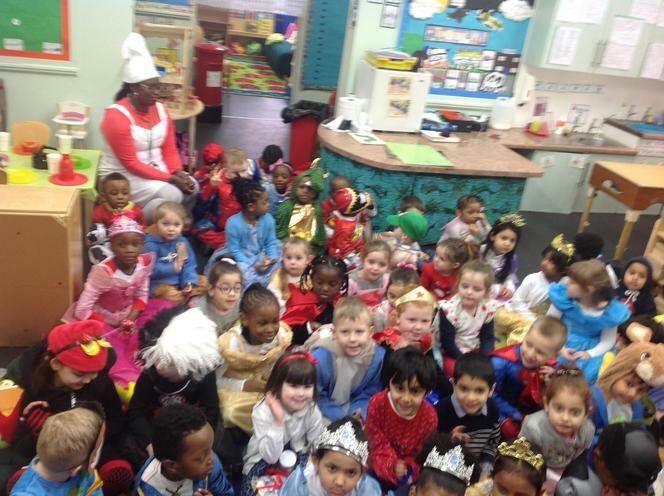 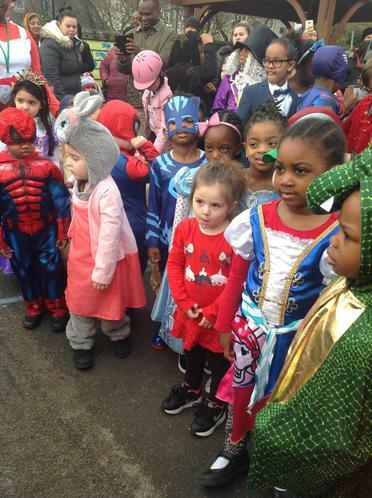 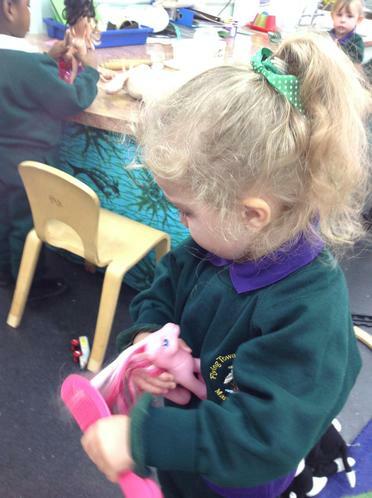 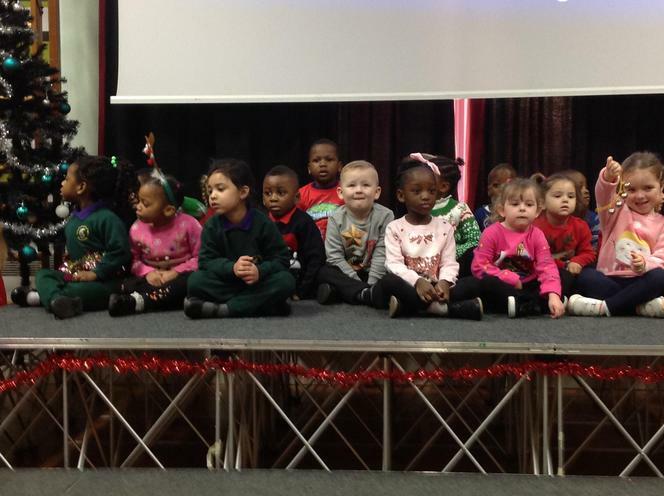 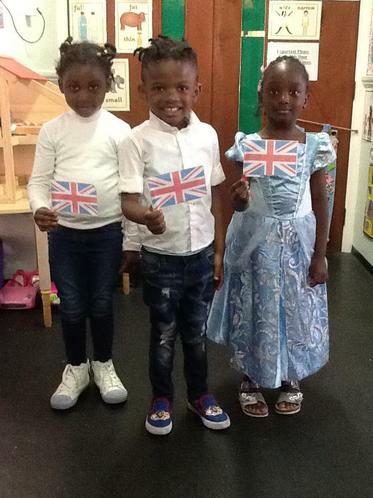 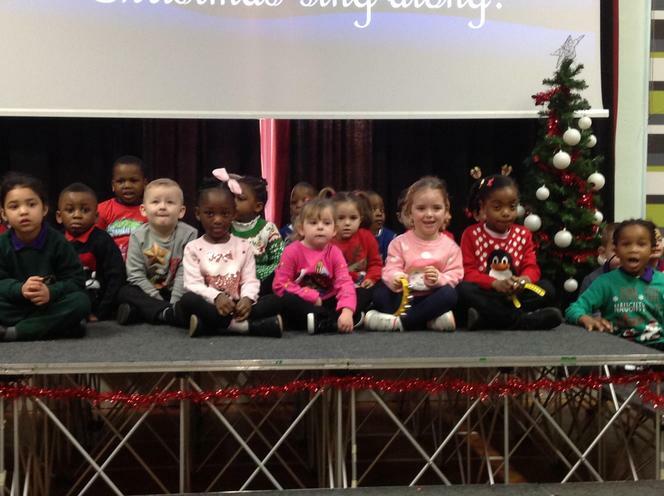 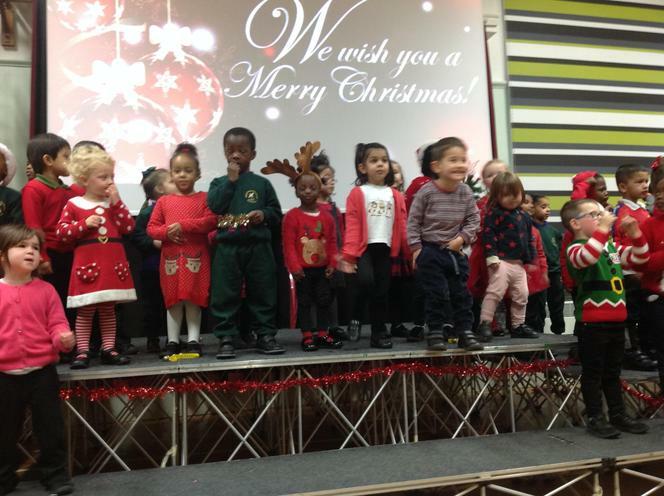 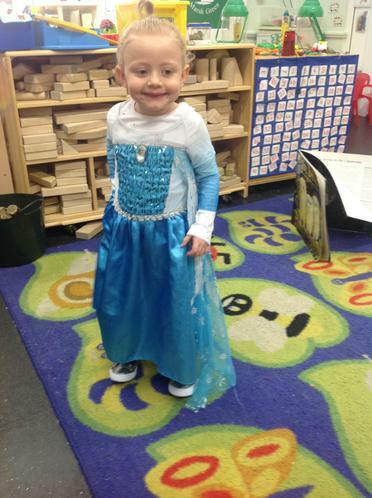 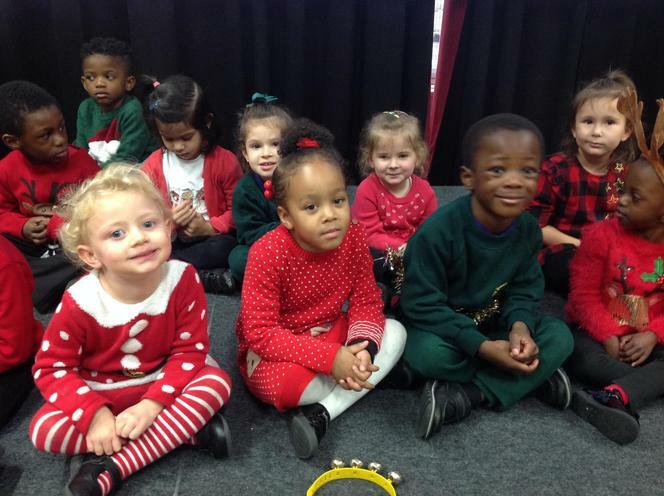 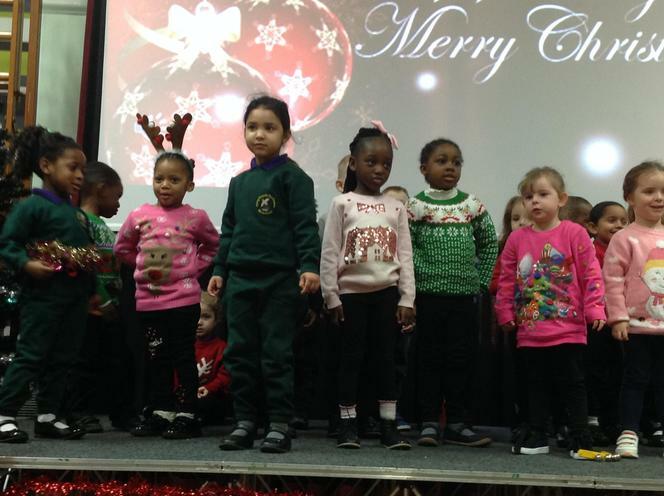 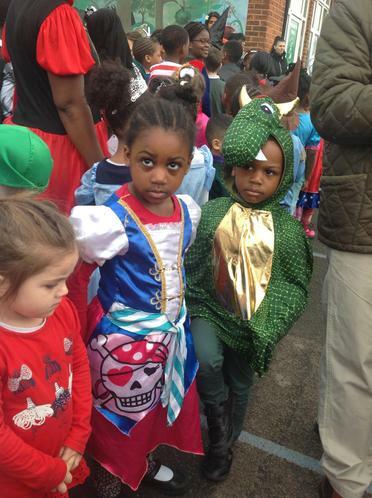 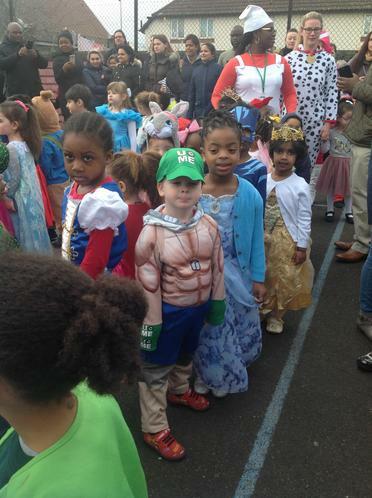 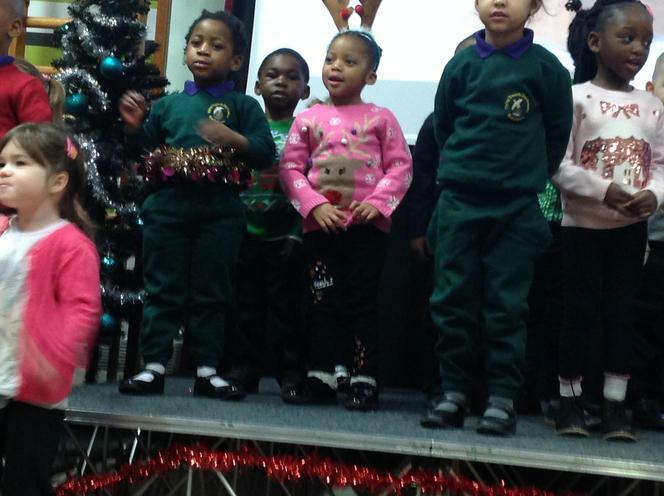 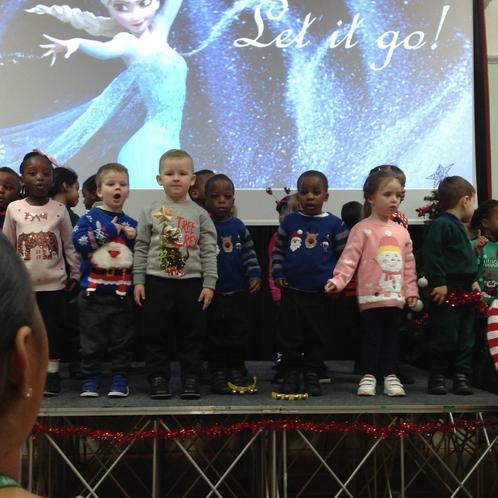 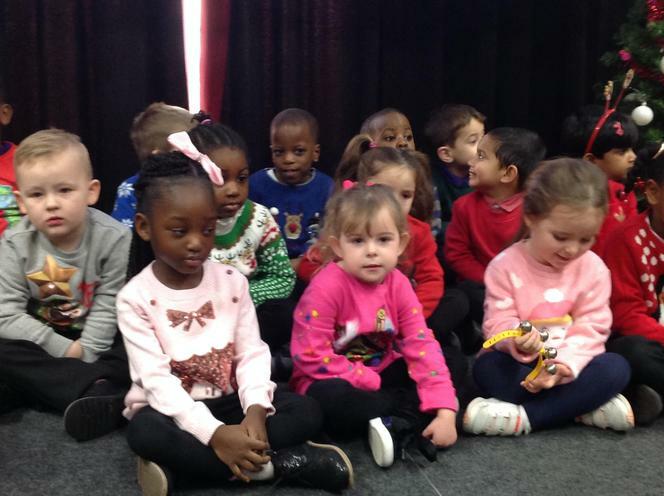 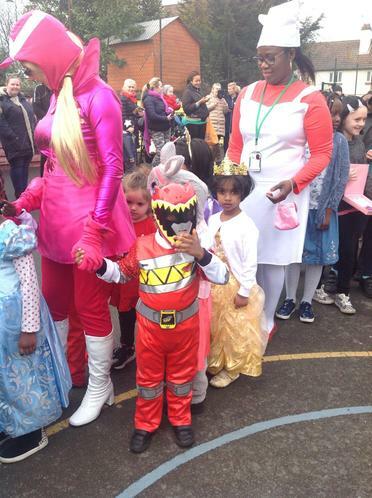 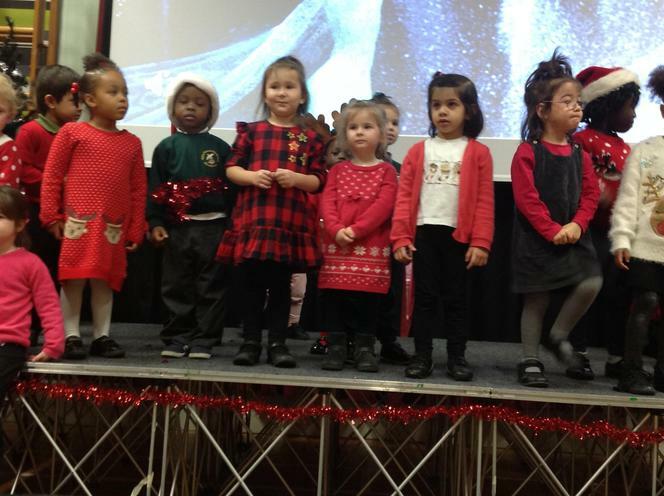 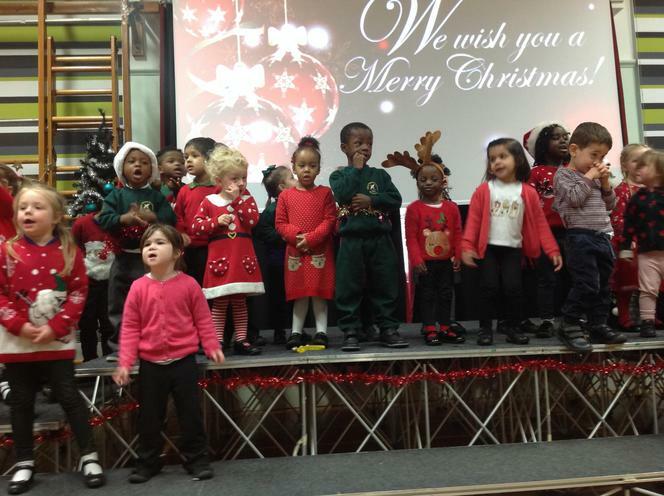 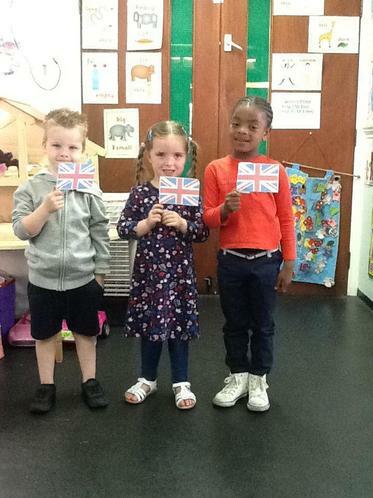 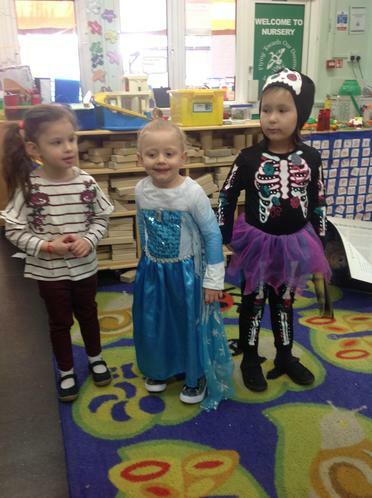 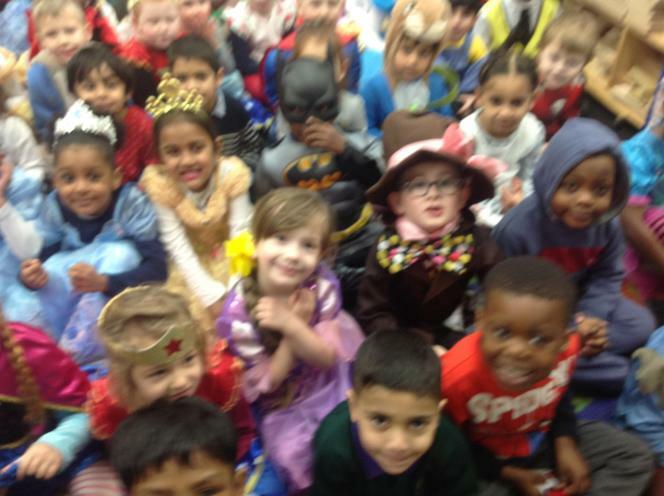 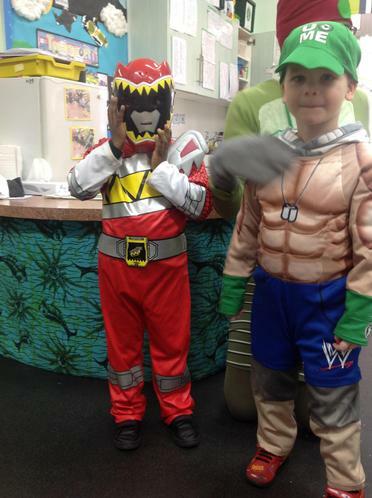 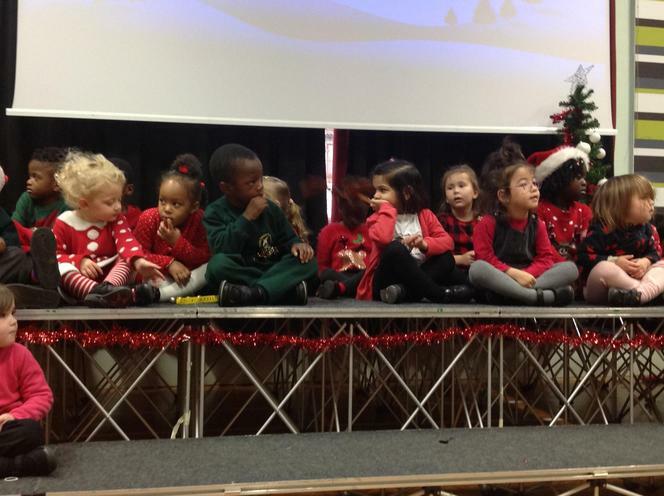 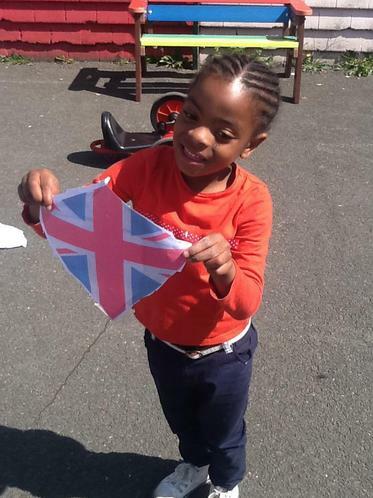 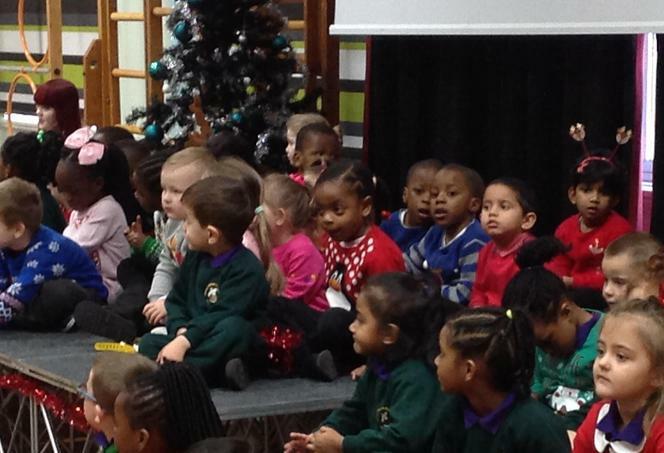 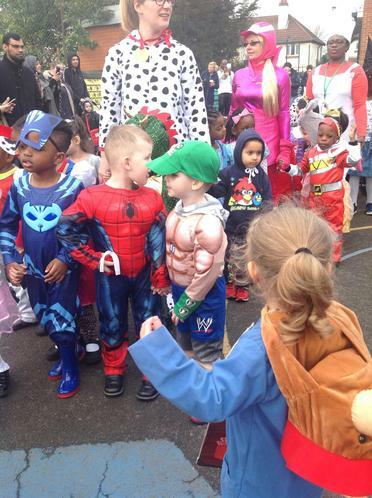 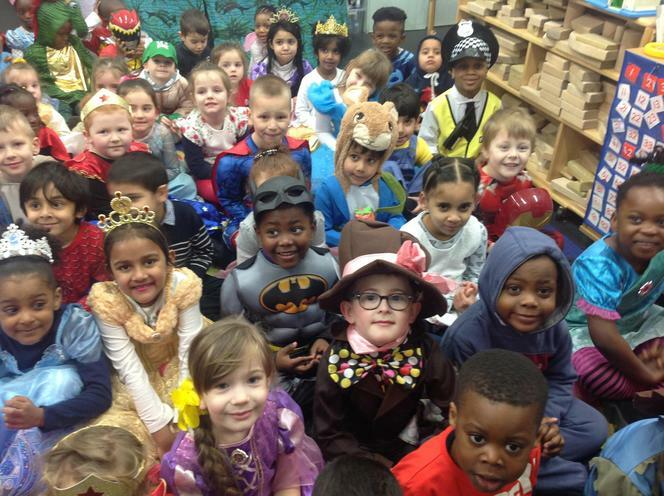 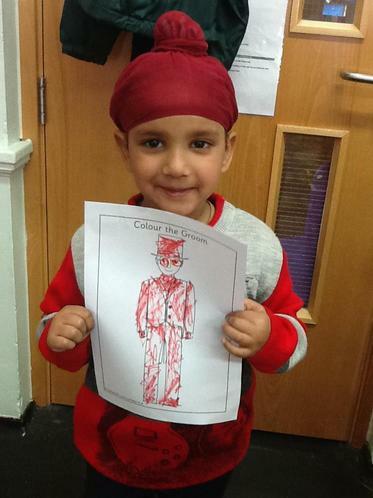 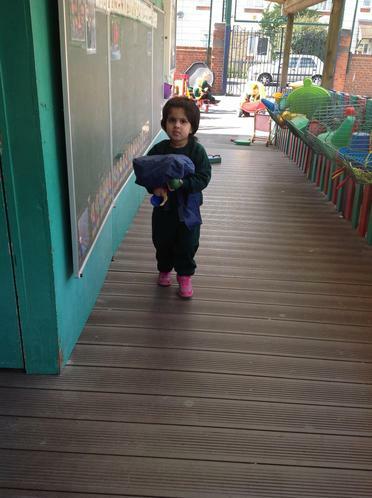 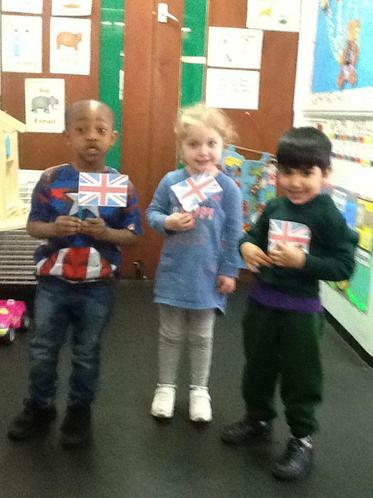 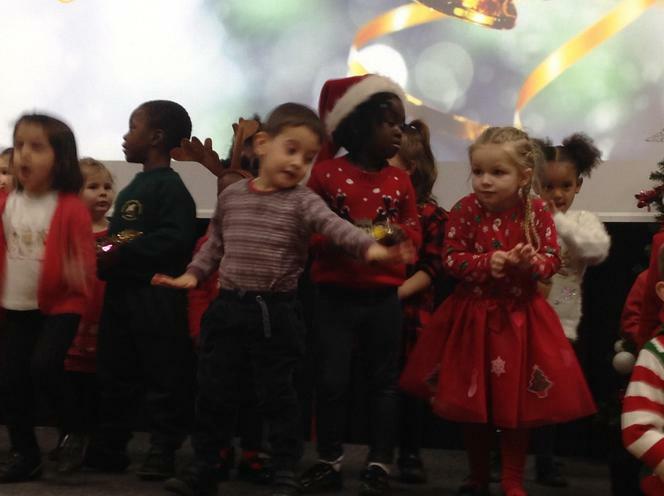 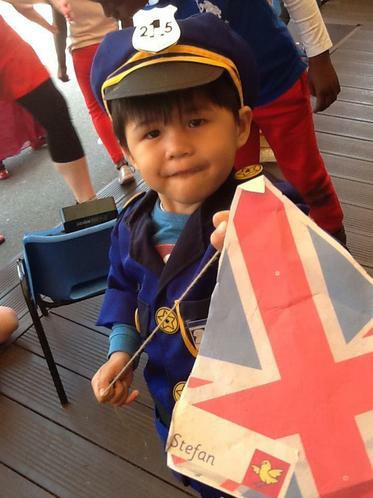 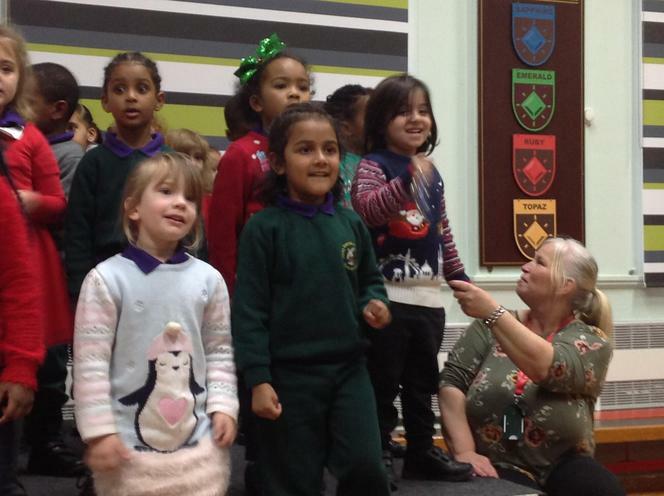 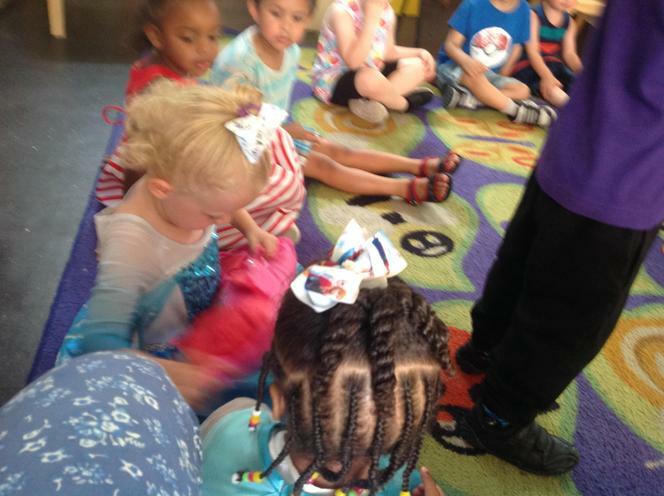 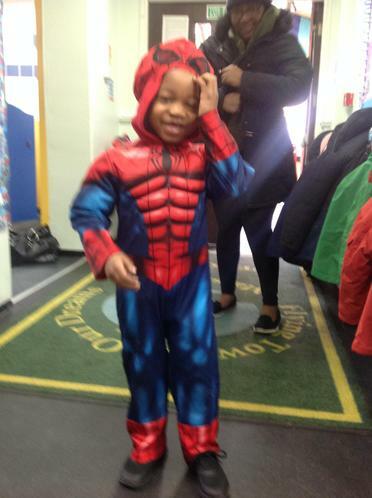 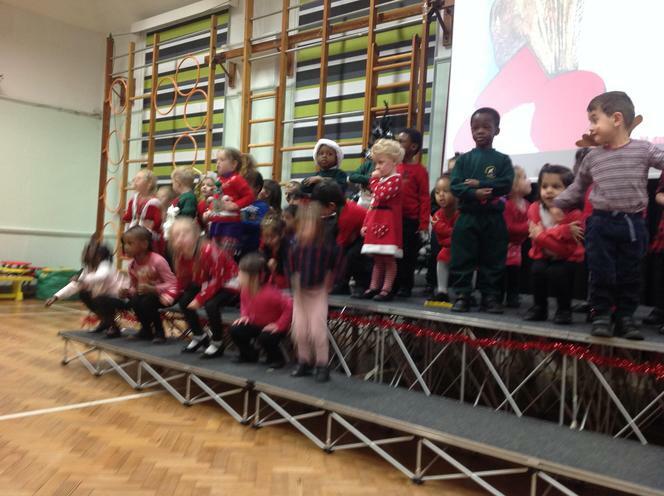 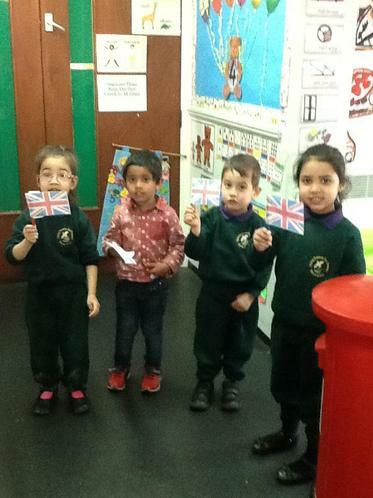 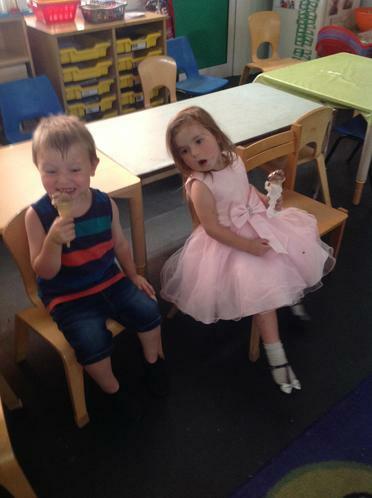 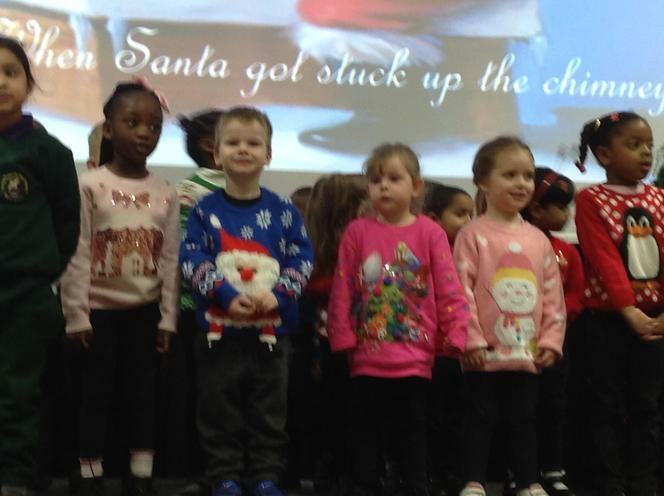 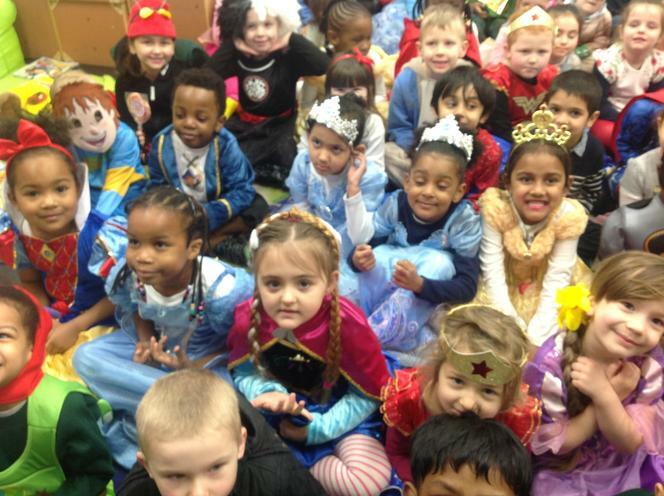 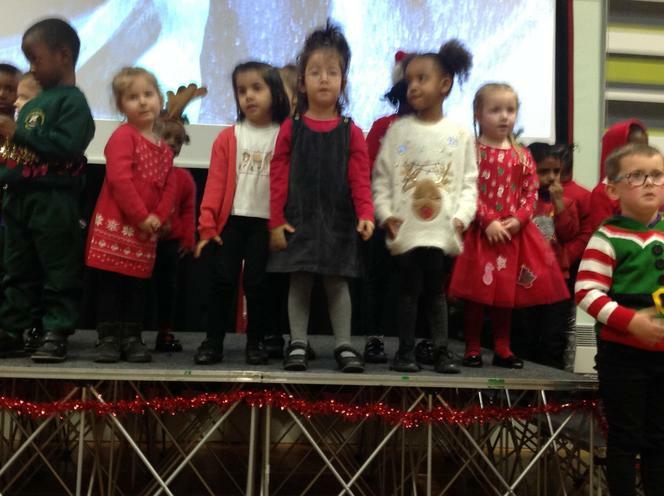 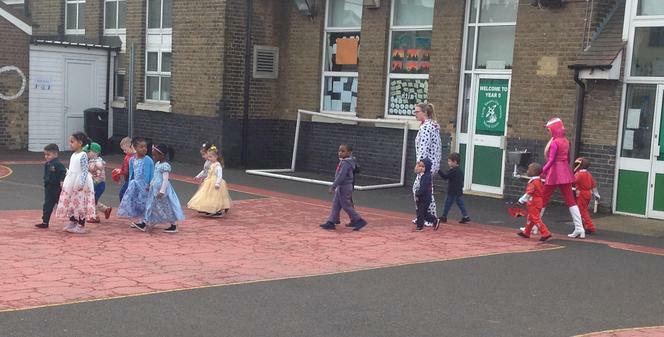 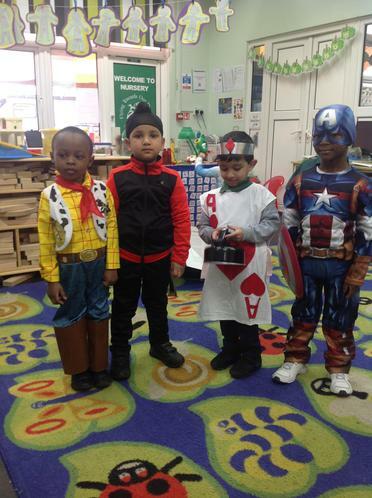 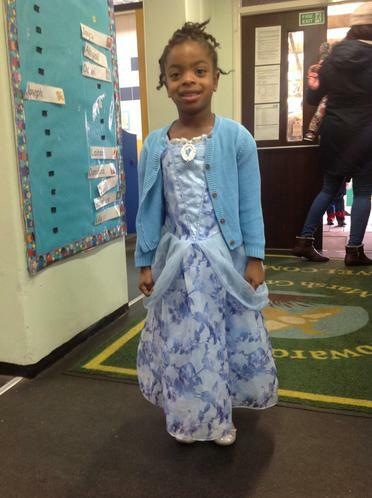 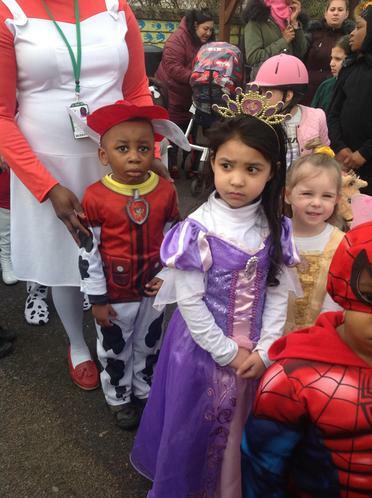 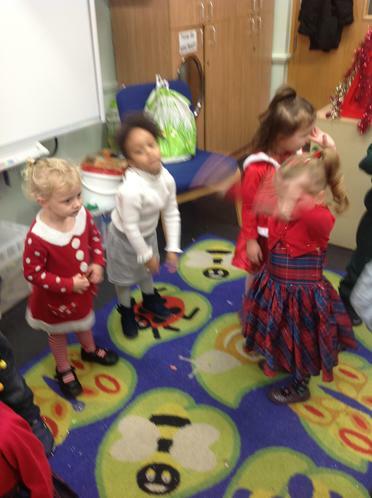 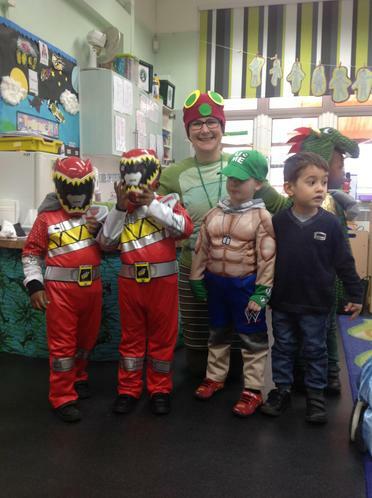 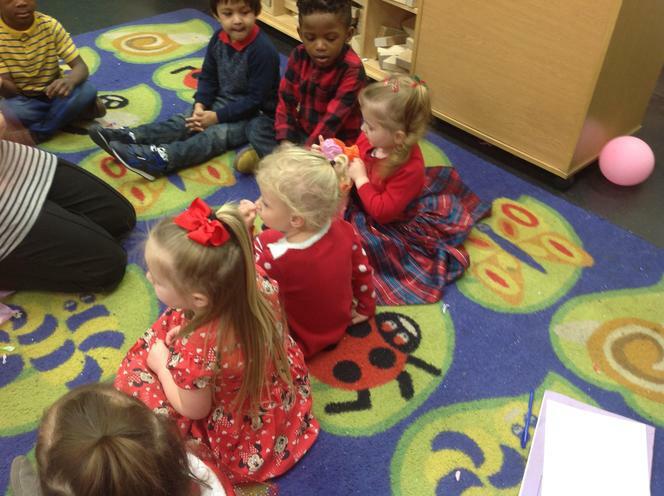 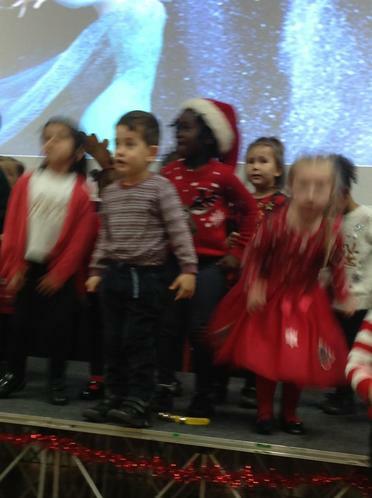 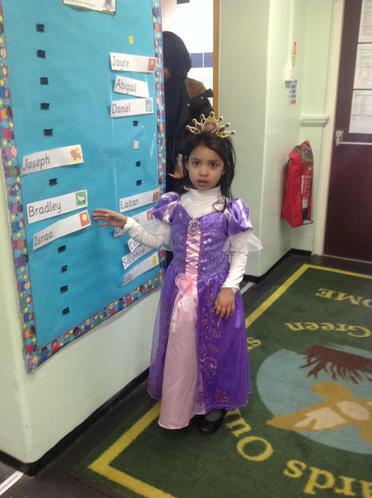 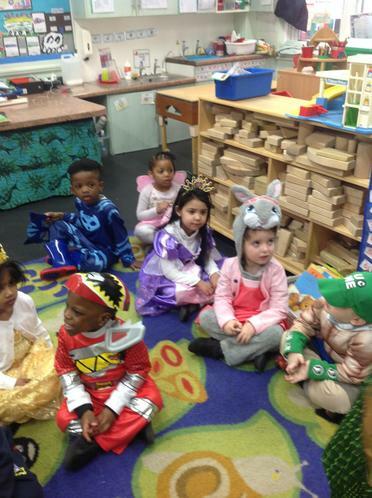 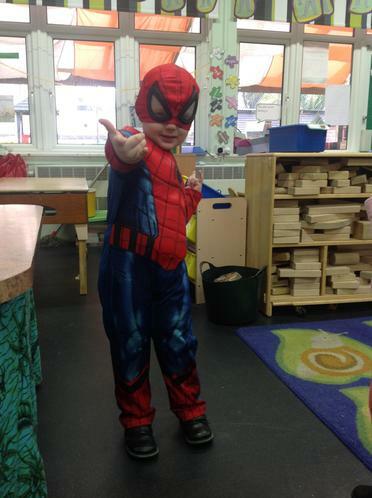 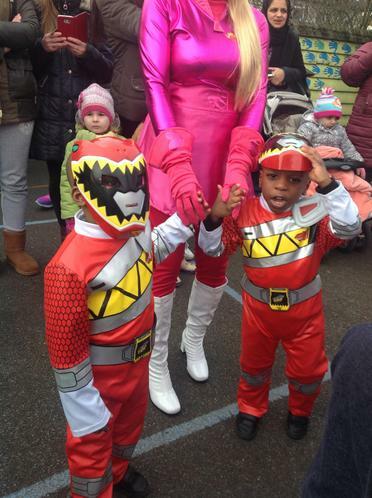 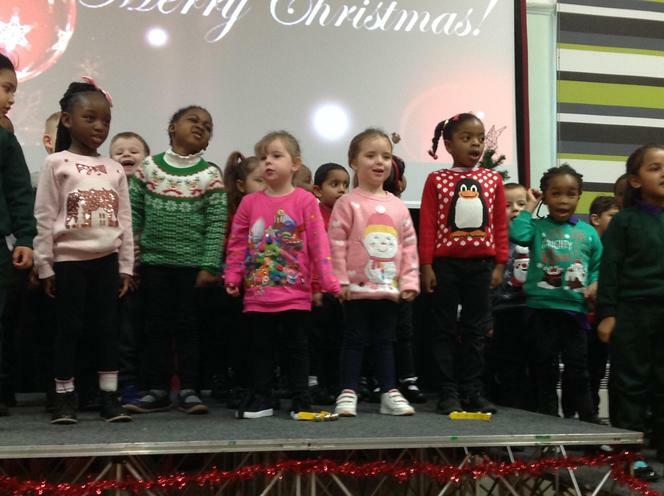 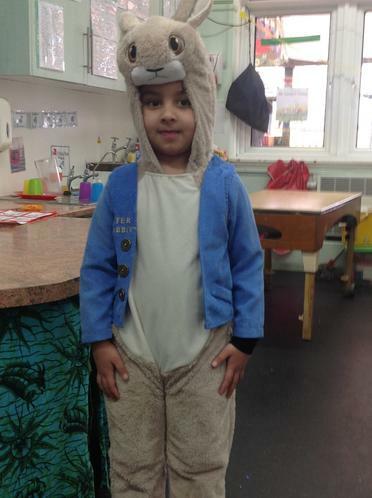 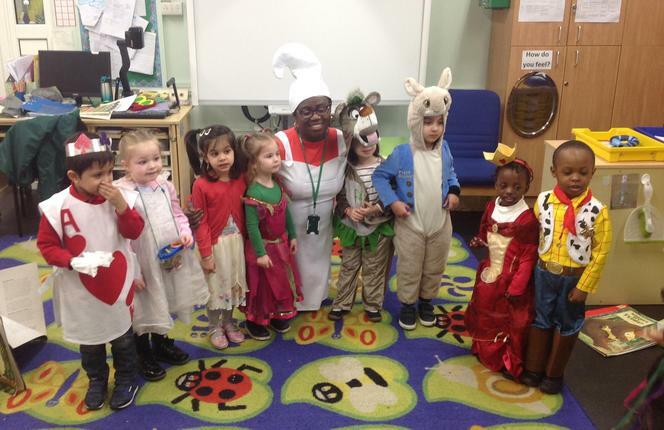 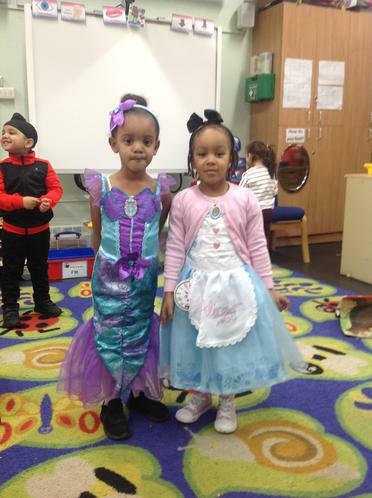 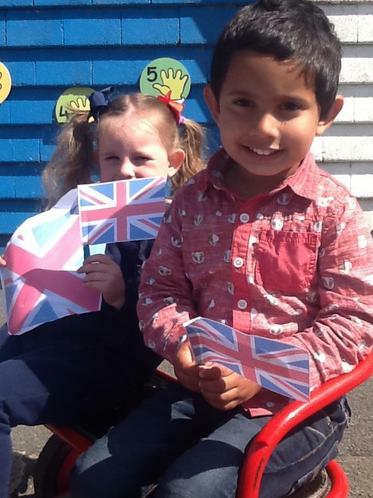 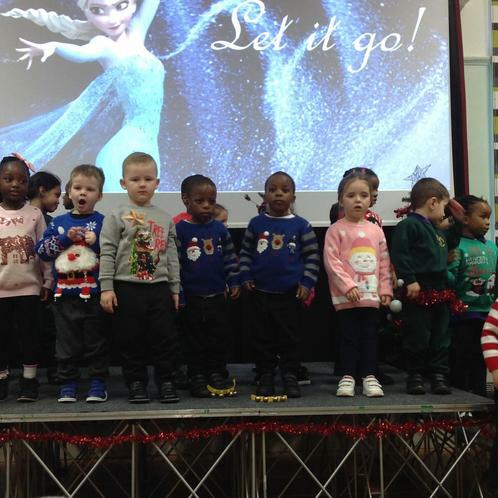 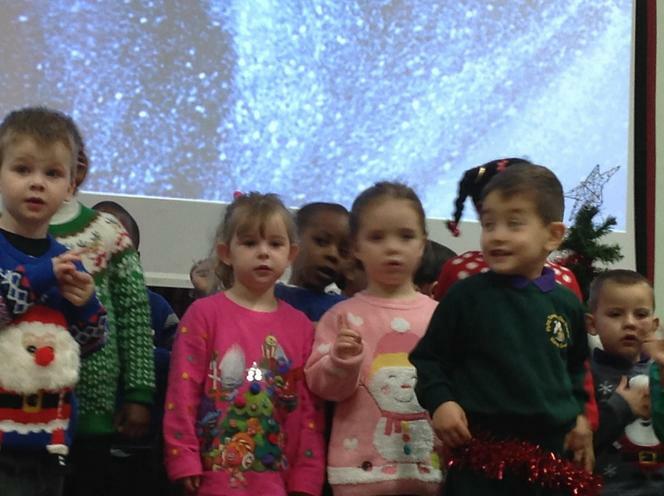 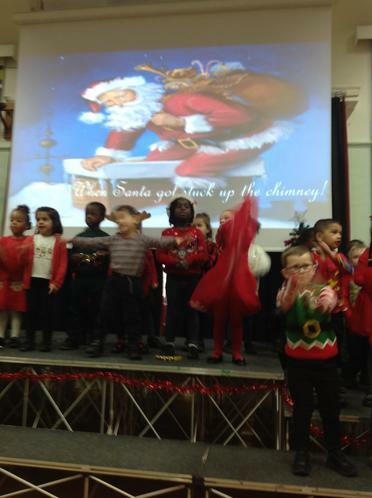 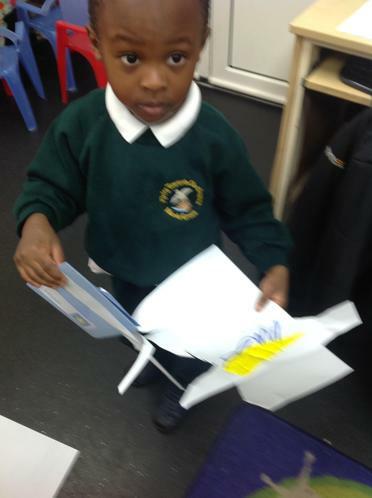 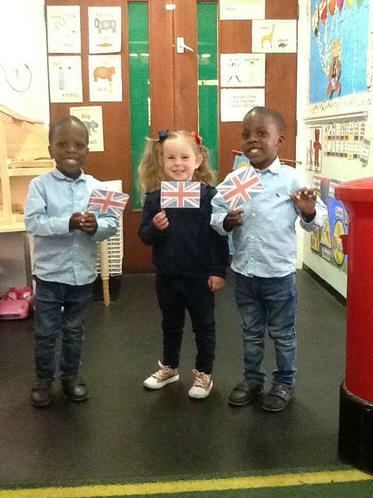 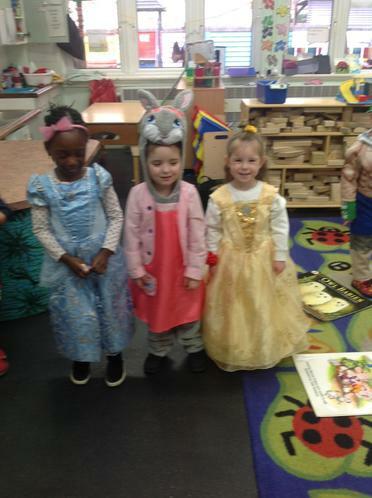 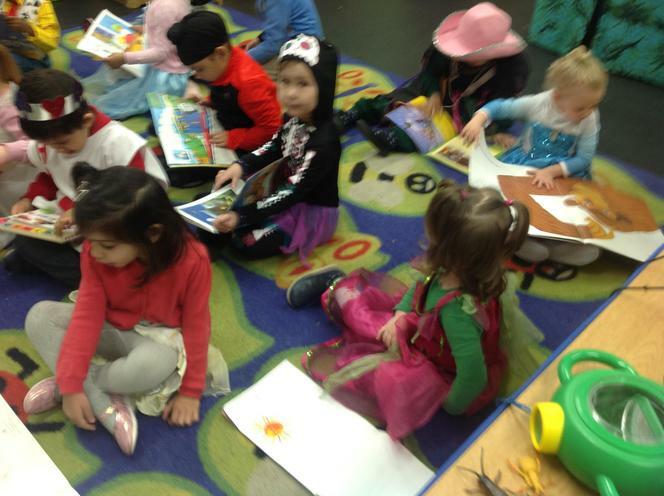 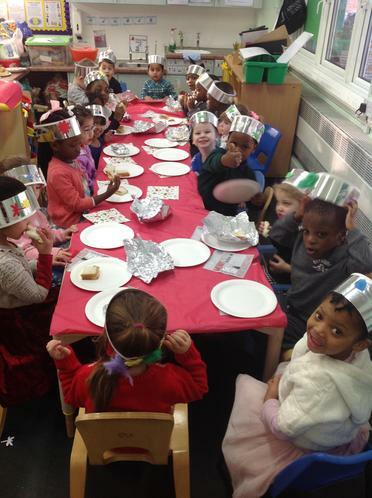 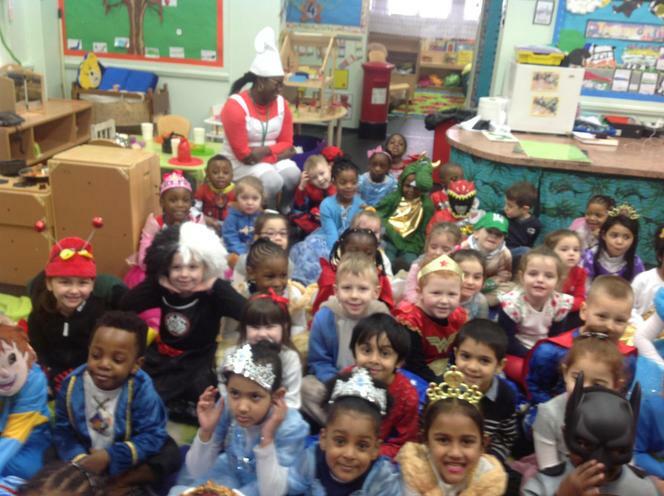 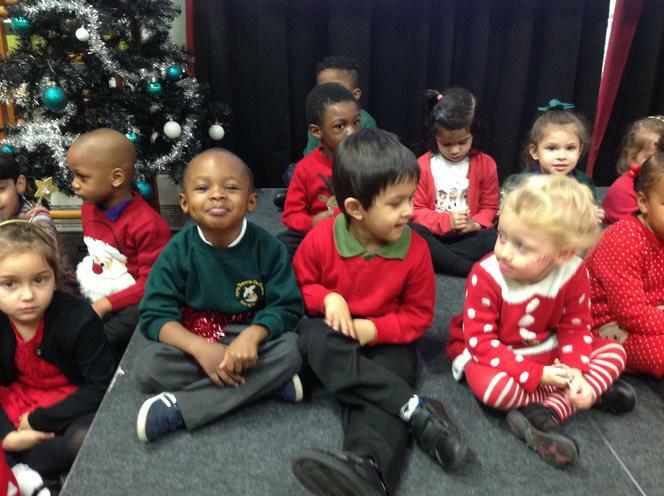 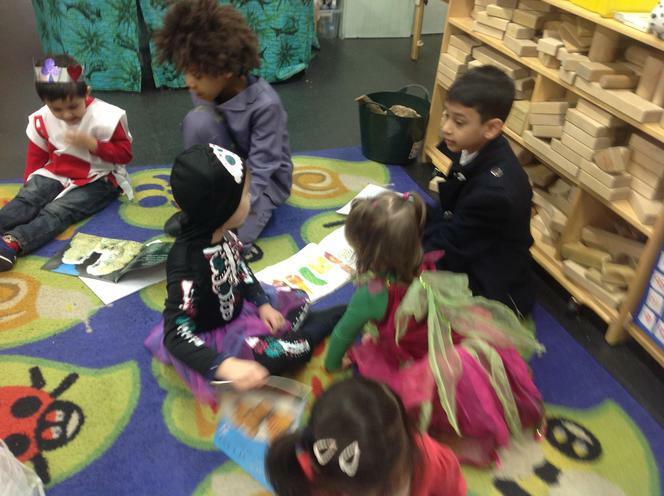 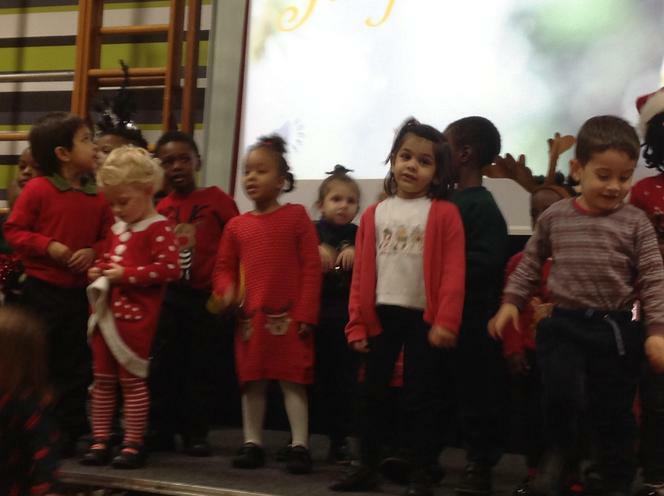 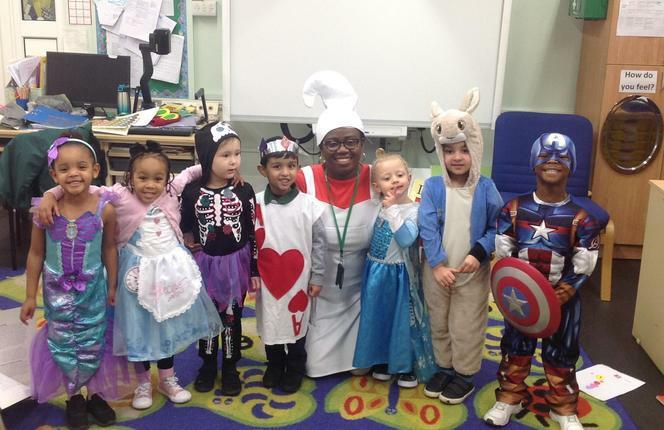 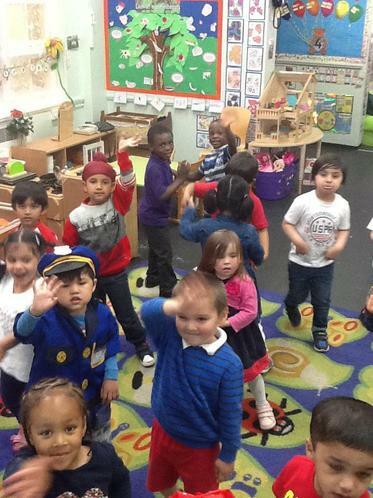 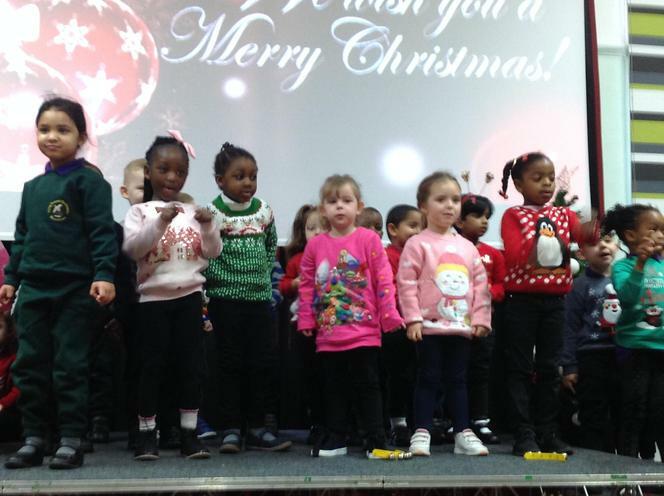 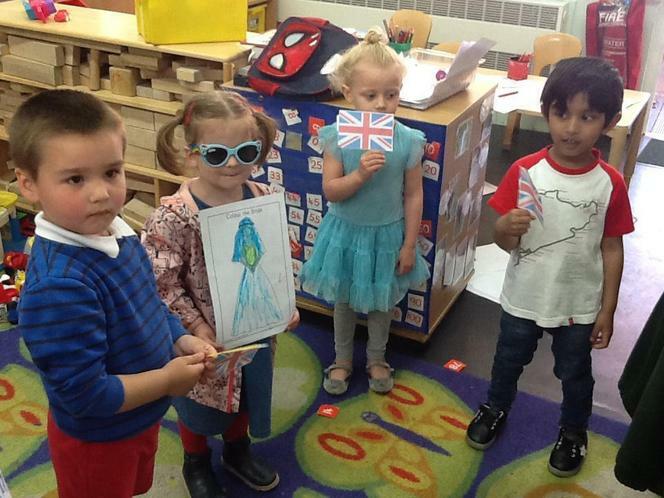 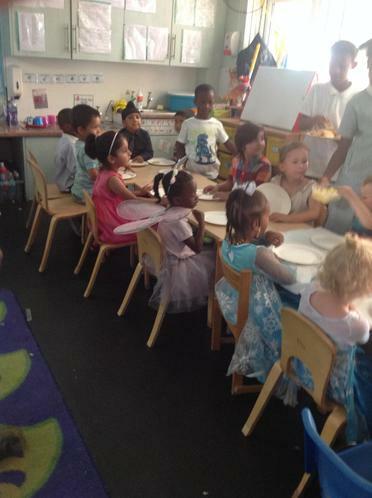 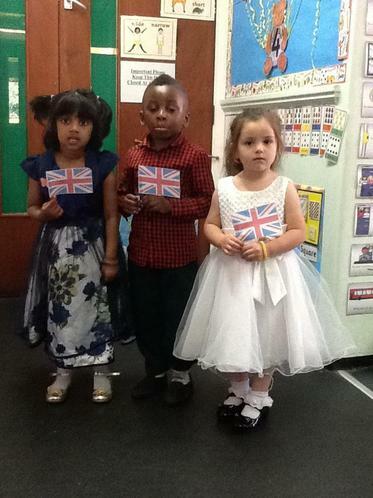 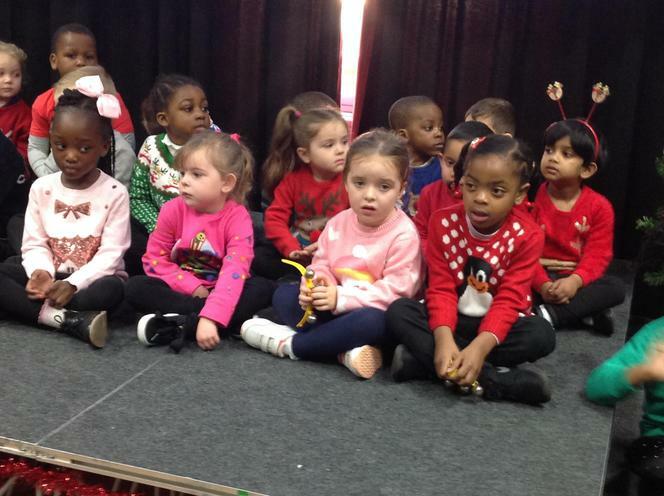 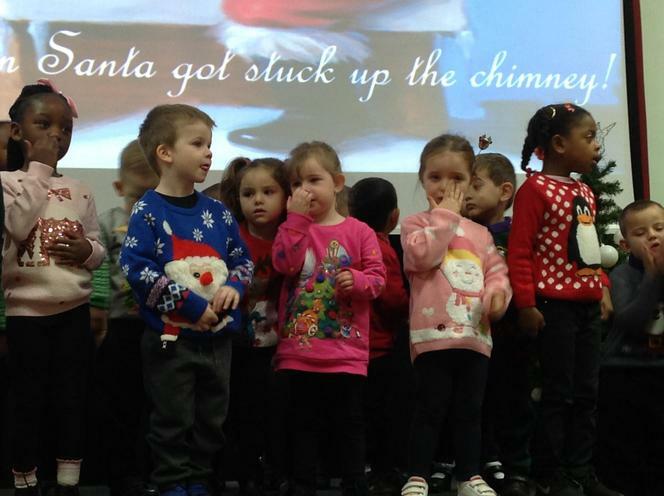 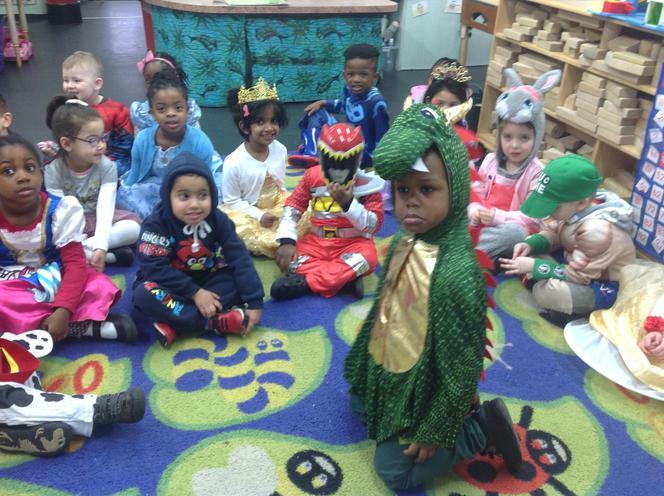 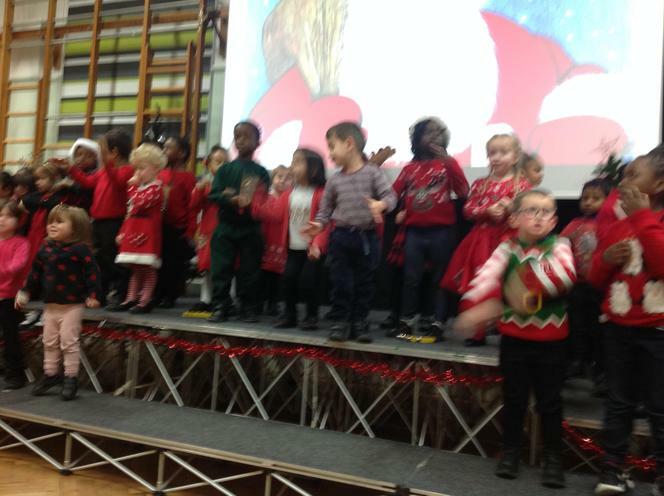 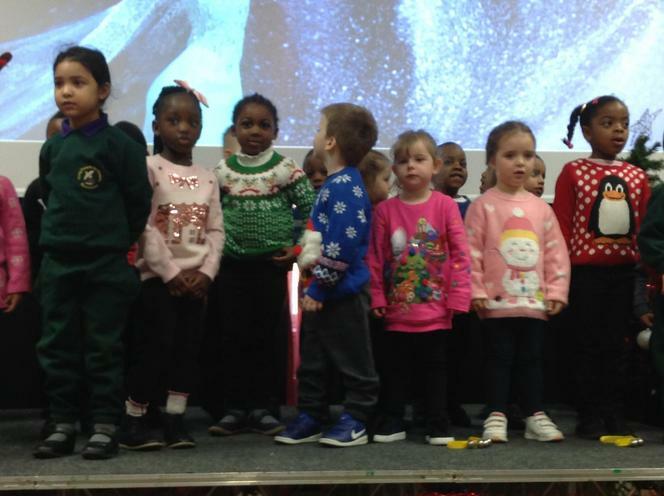 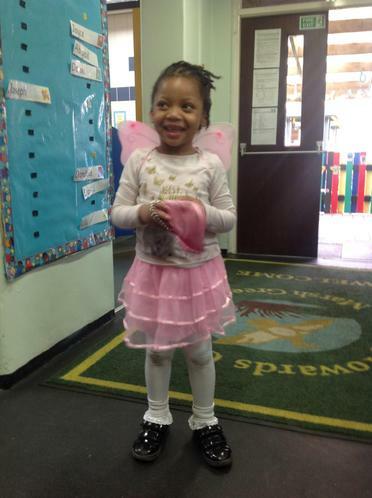 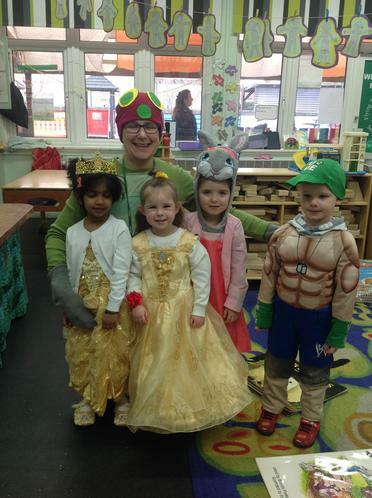 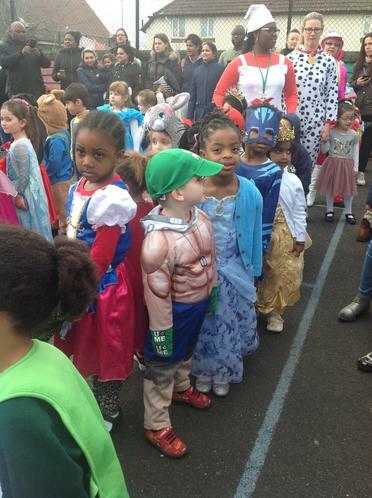 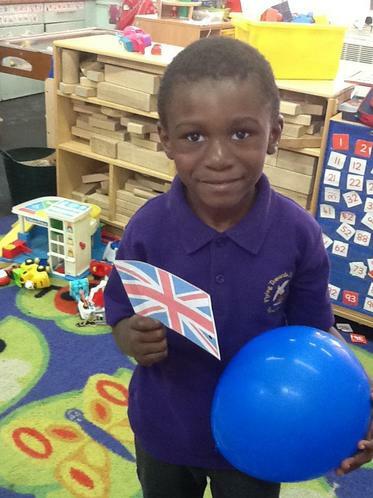 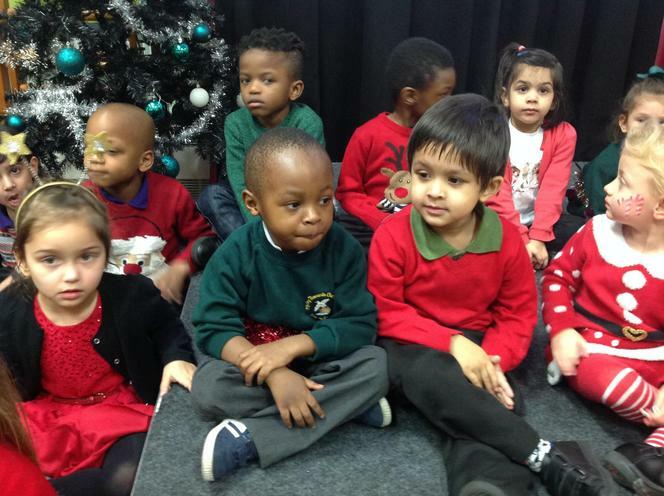 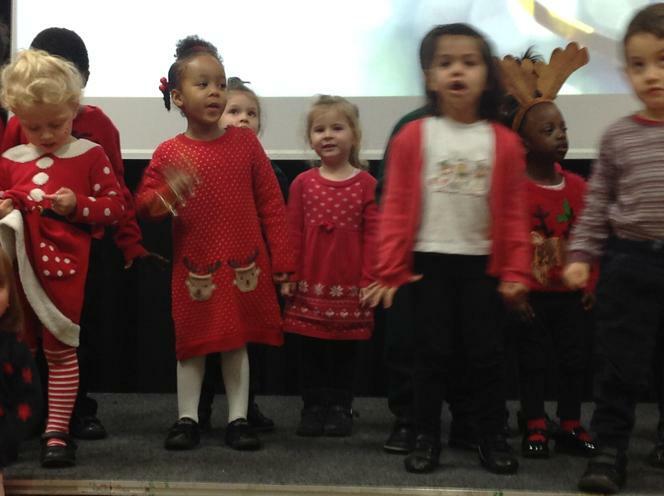 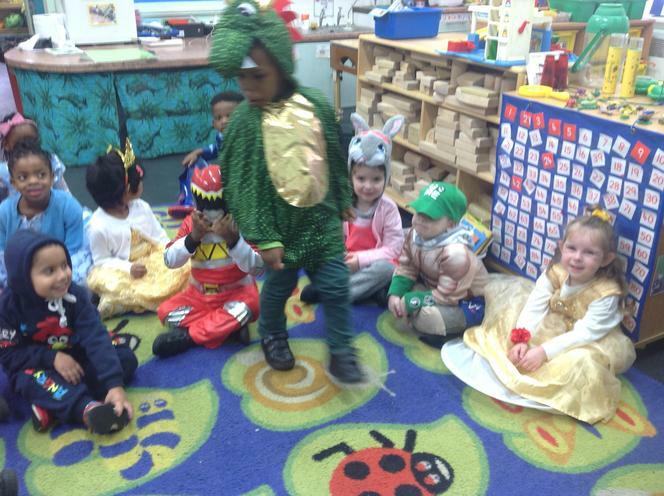 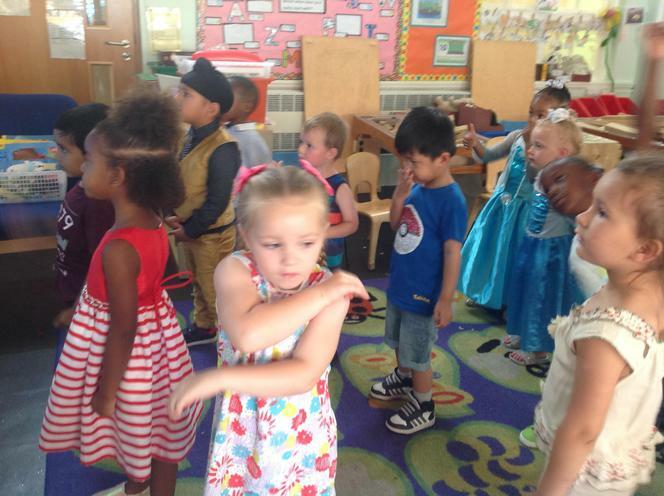 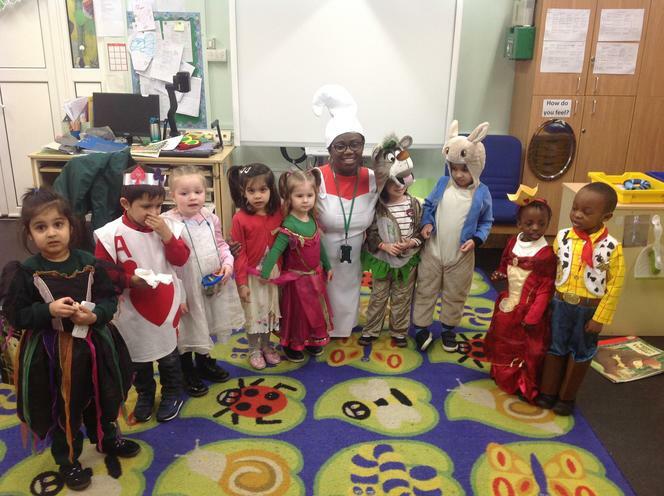 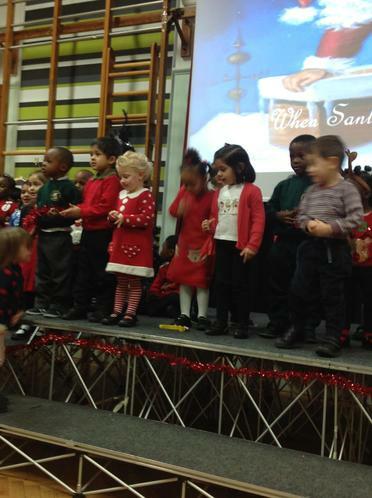 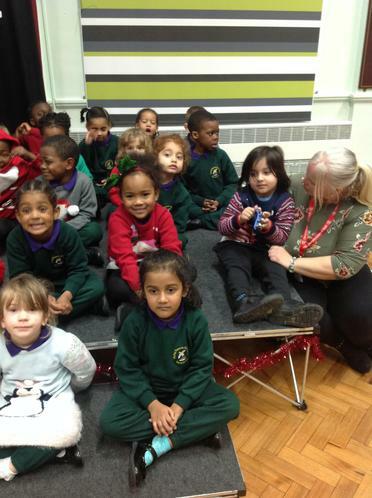 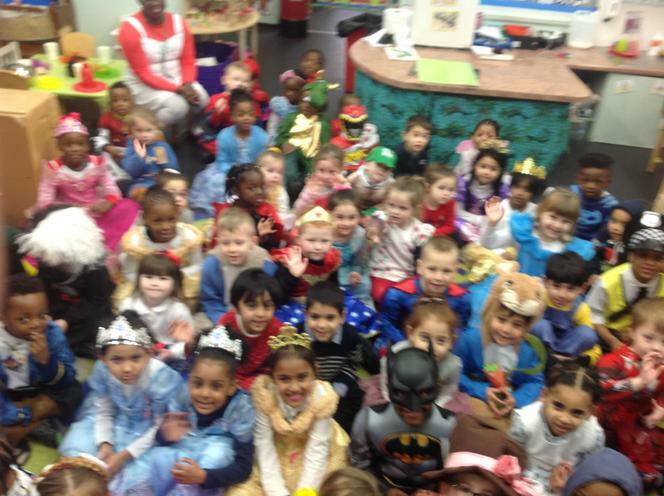 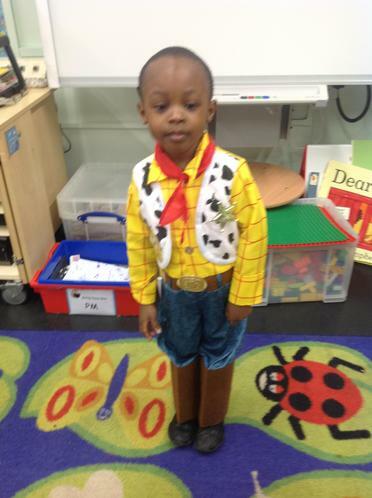 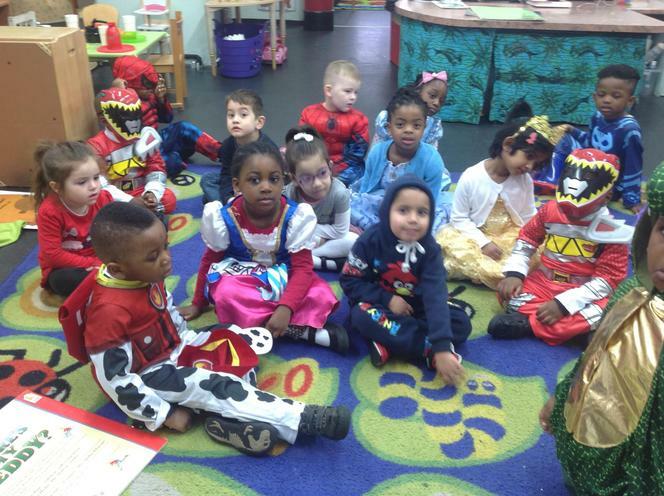 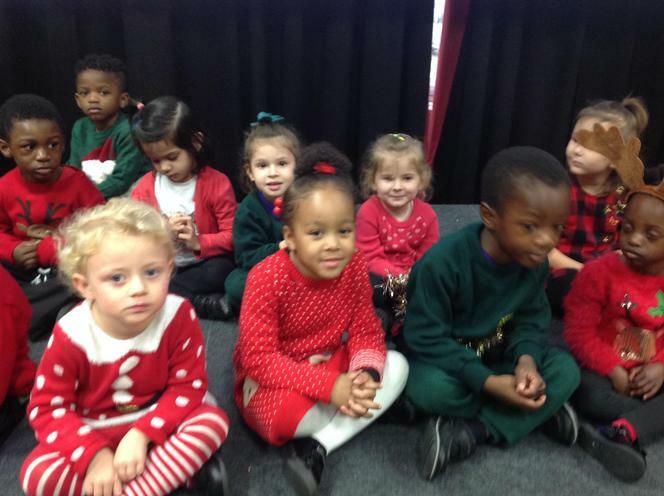 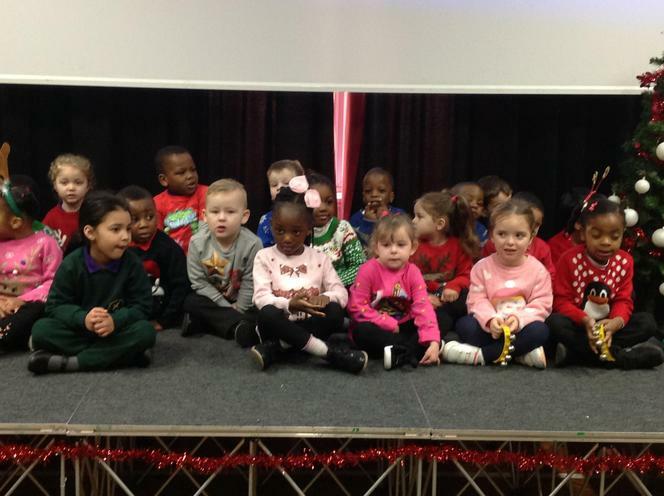 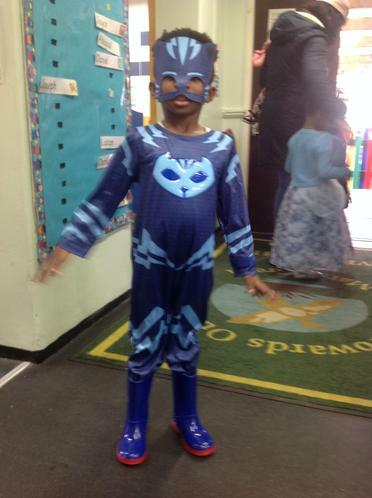 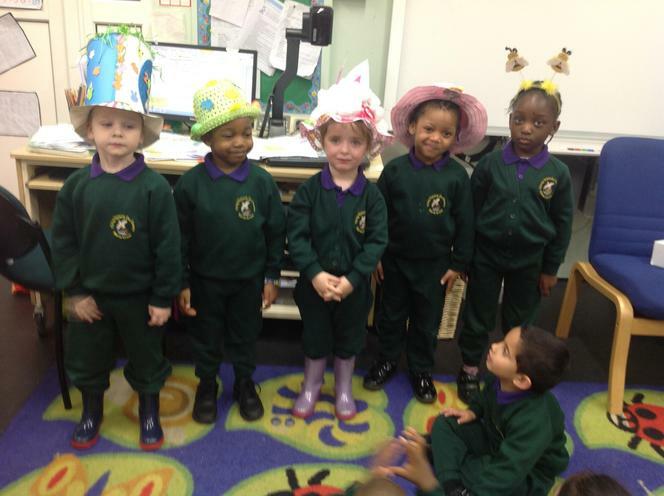 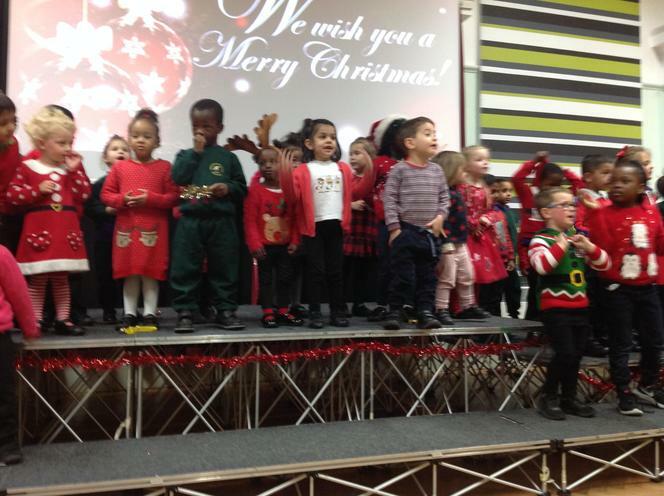 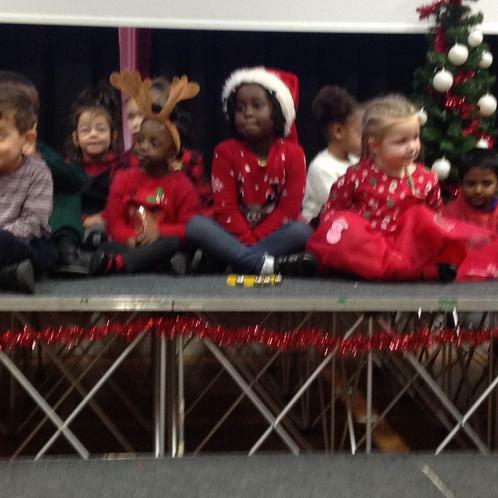 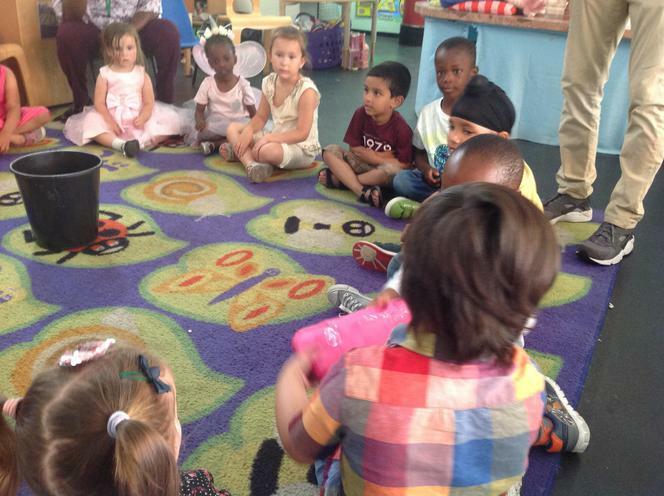 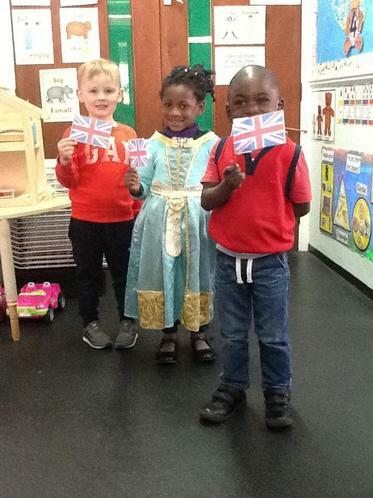 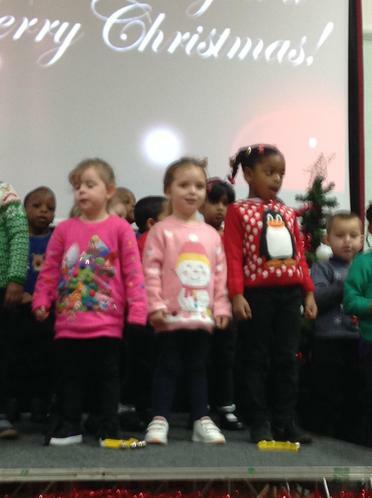 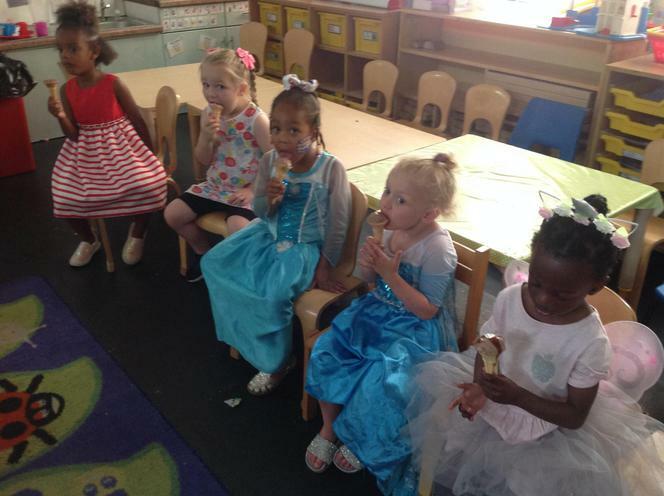 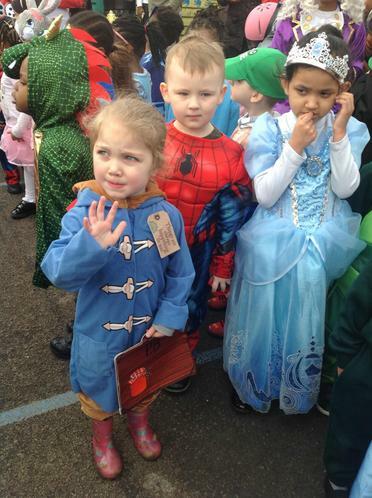 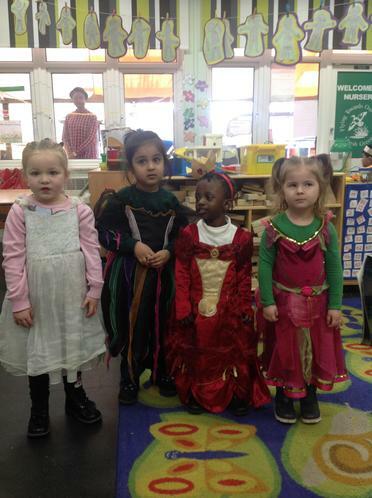 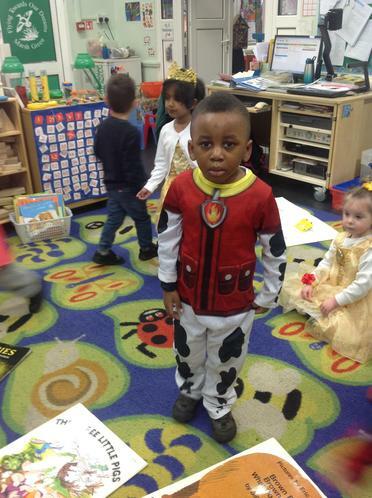 The morning children dressed up, went on a parade and had an assembly with the reception classes. 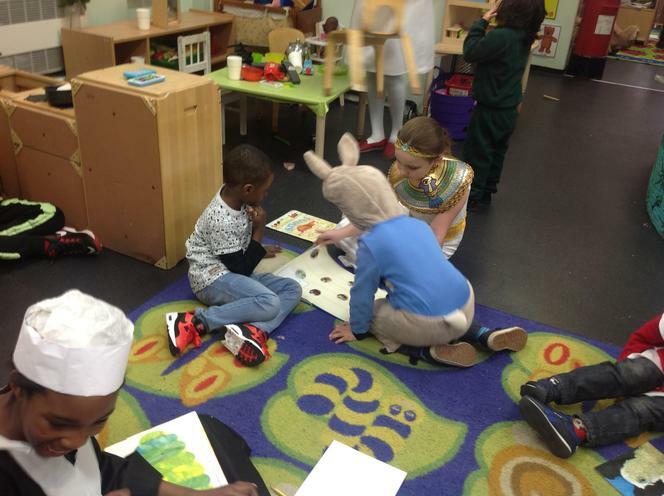 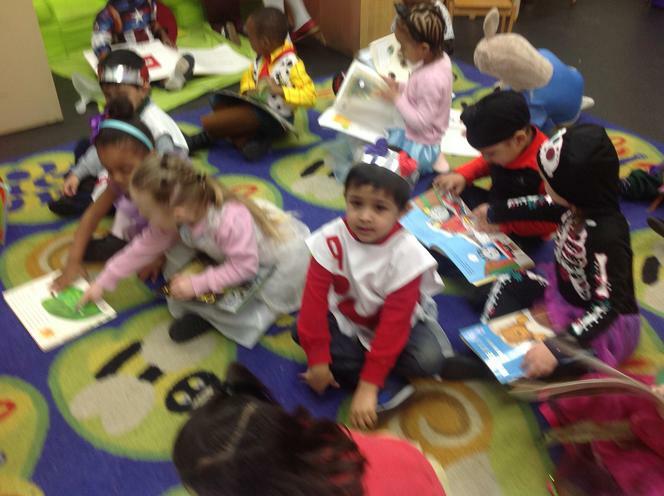 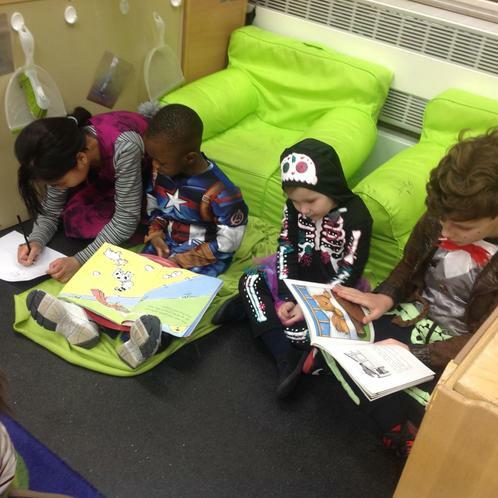 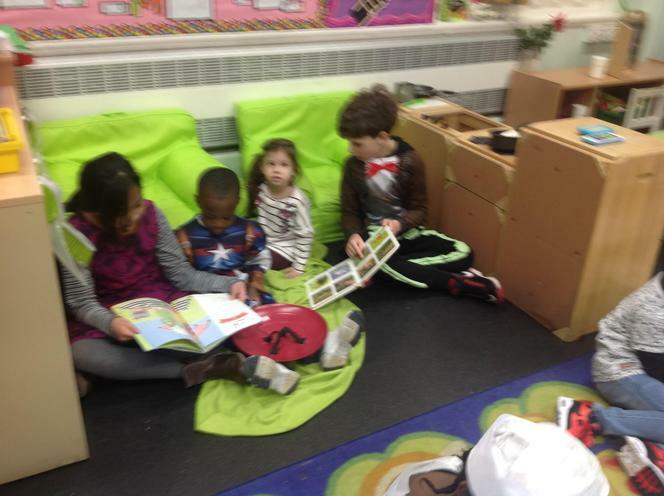 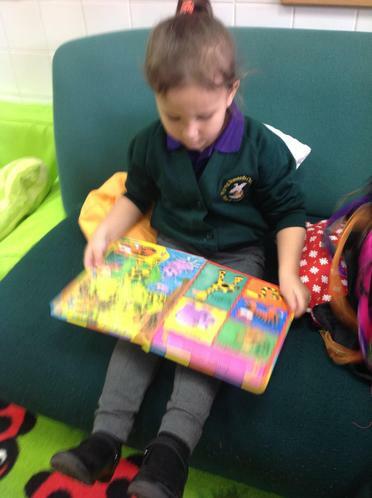 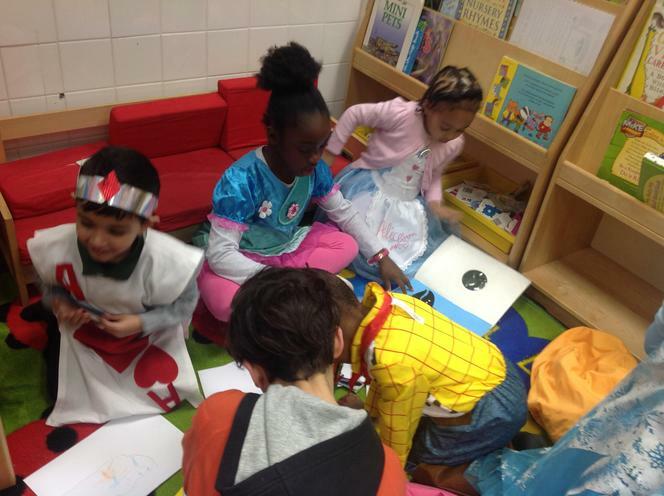 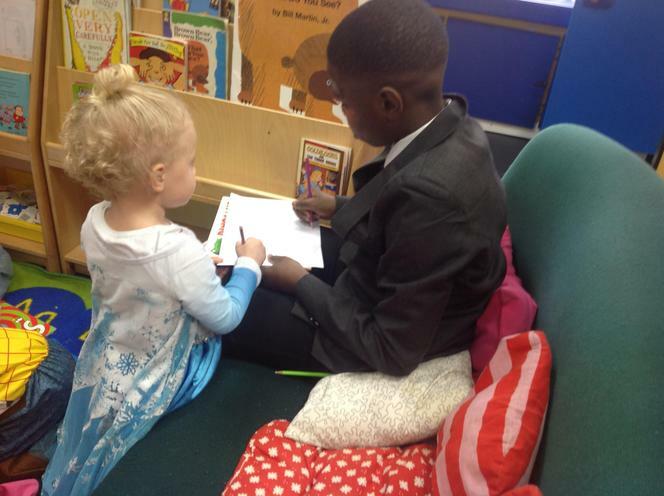 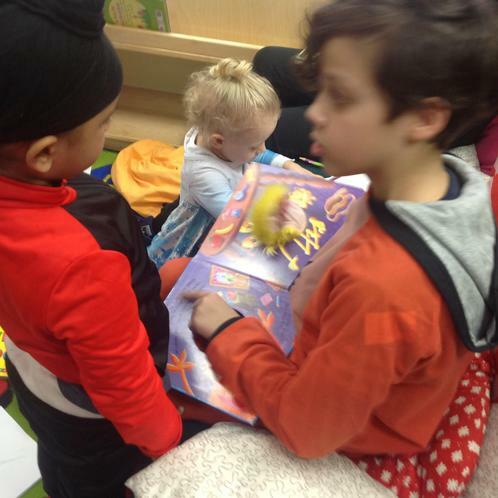 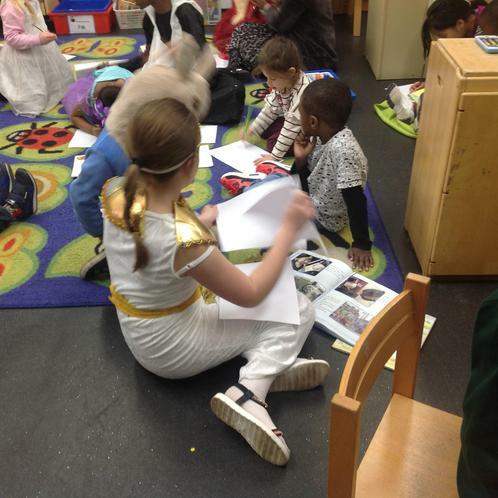 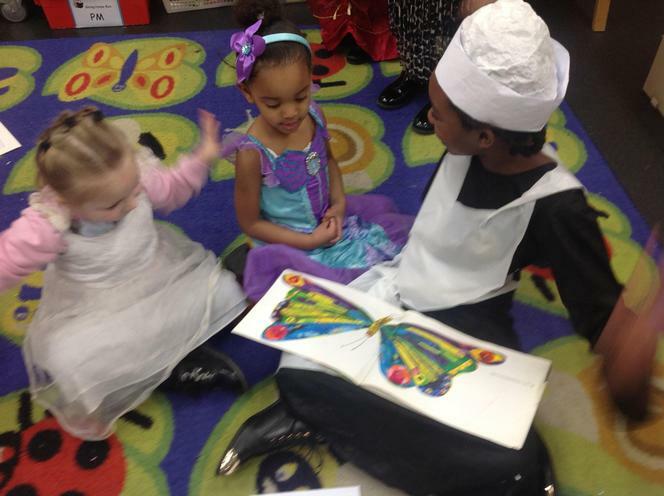 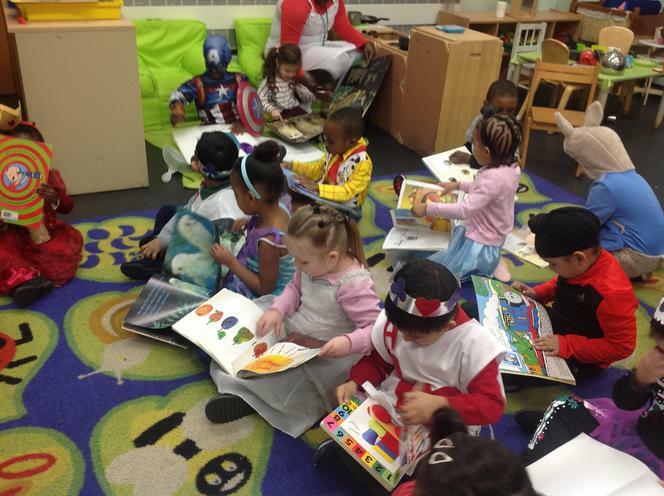 The afternoon children dressed up and read with children from year 5. 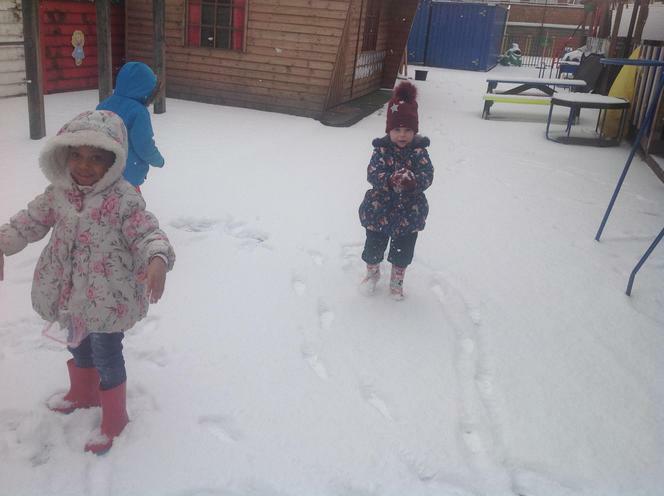 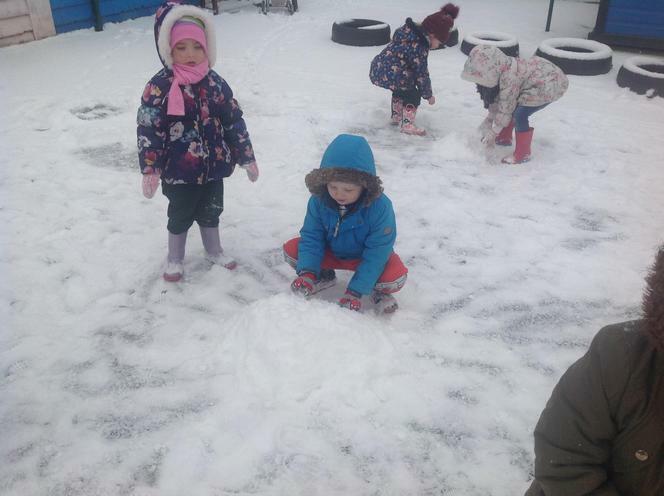 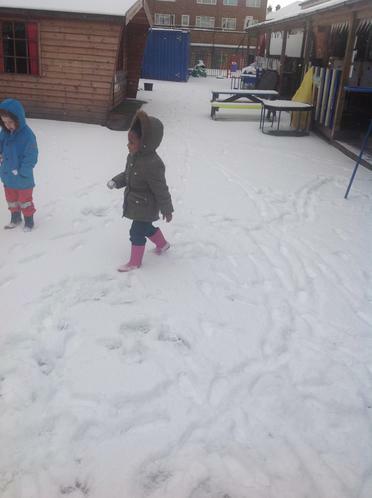 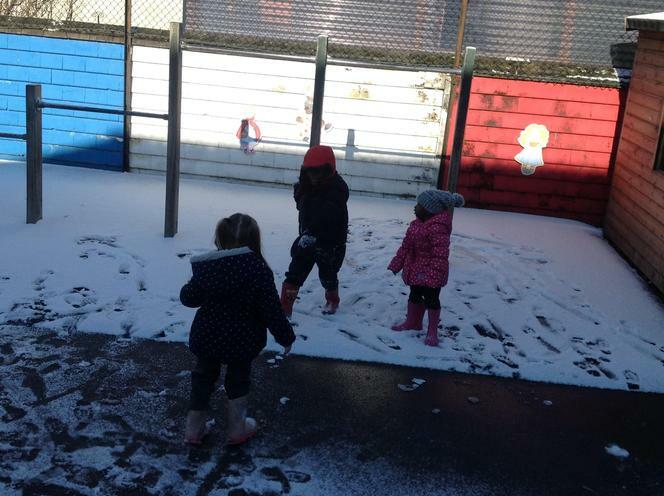 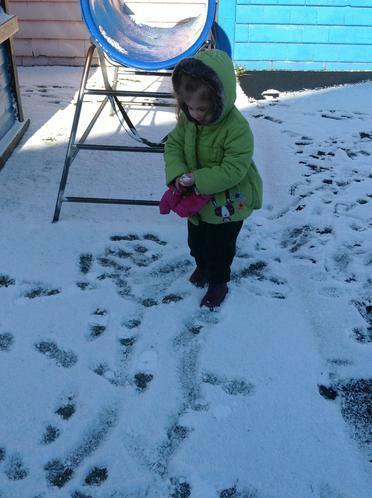 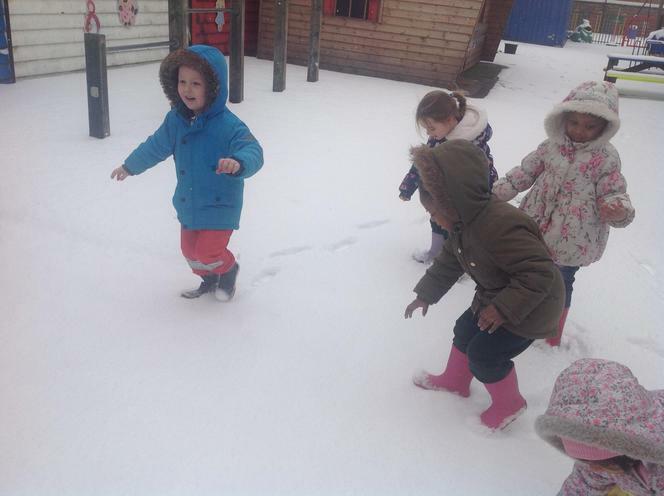 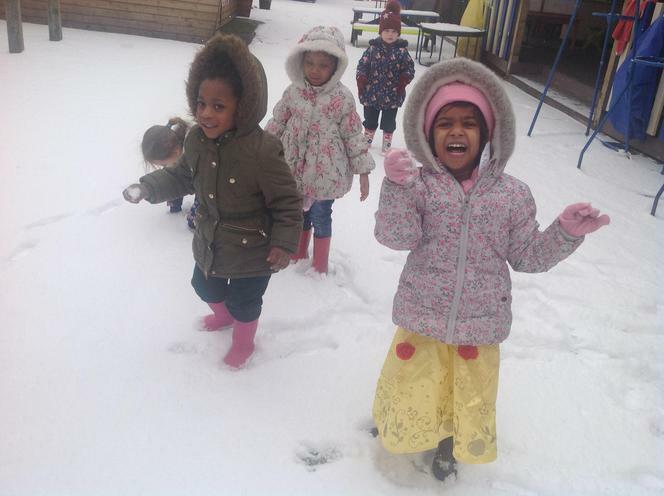 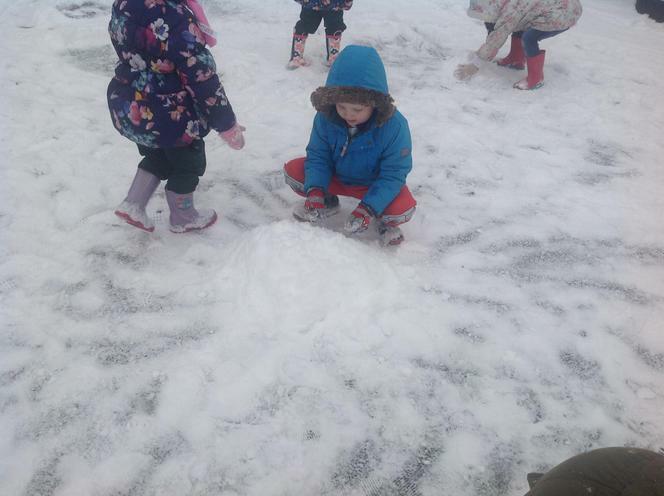 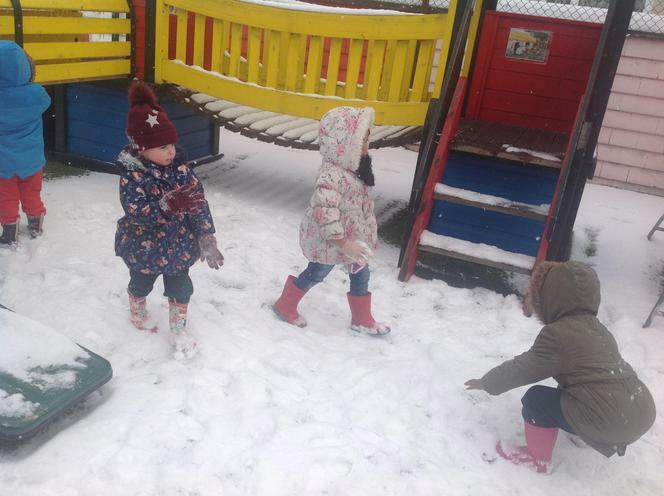 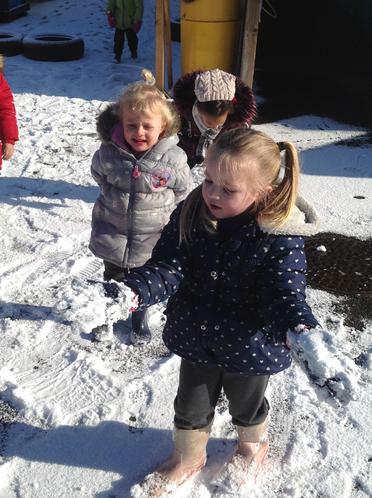 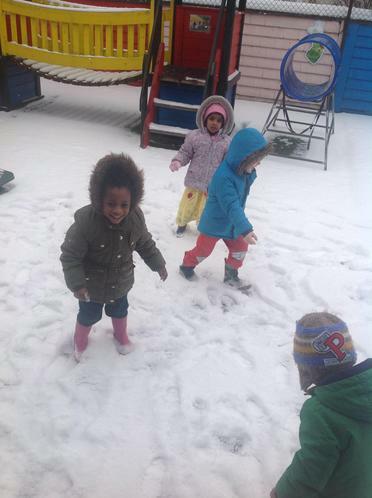 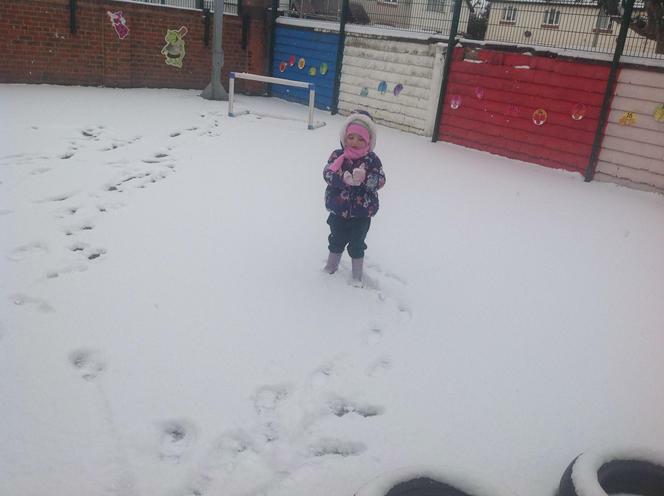 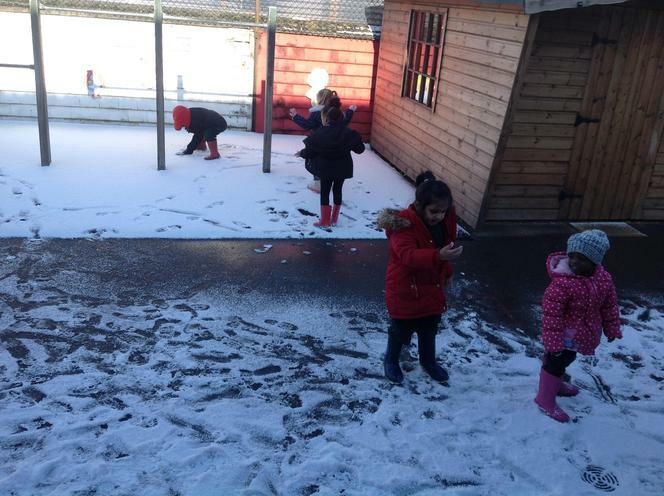 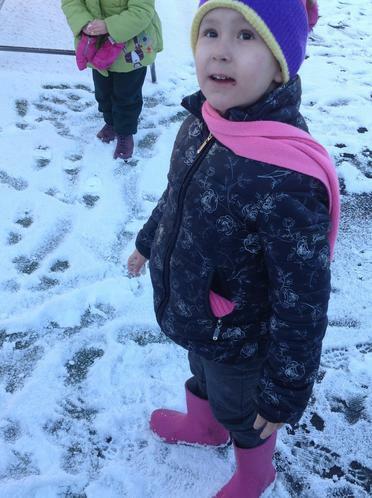 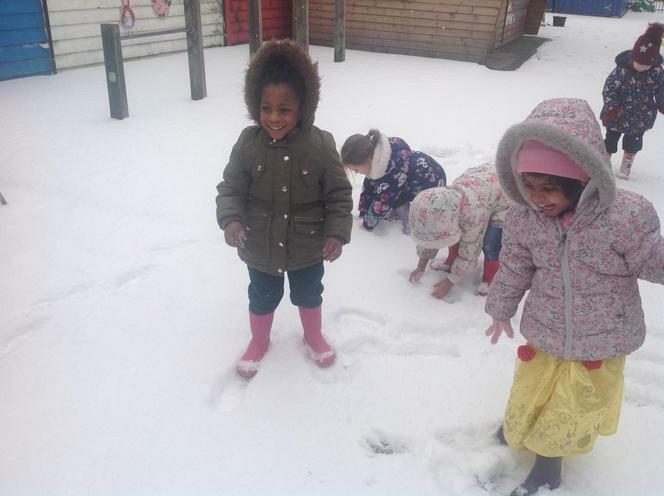 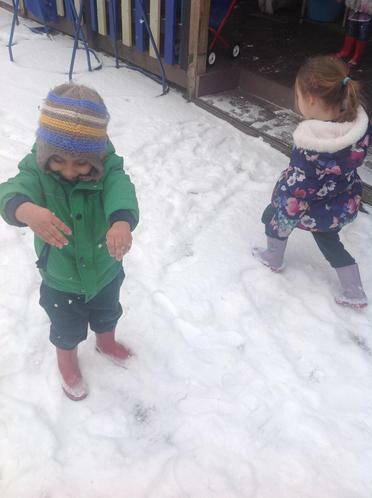 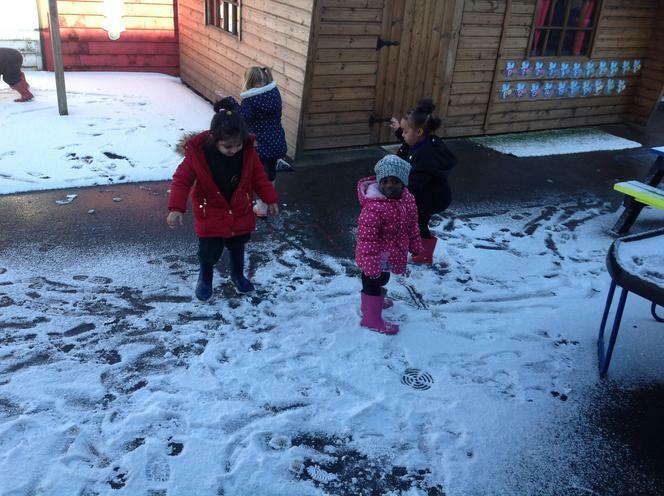 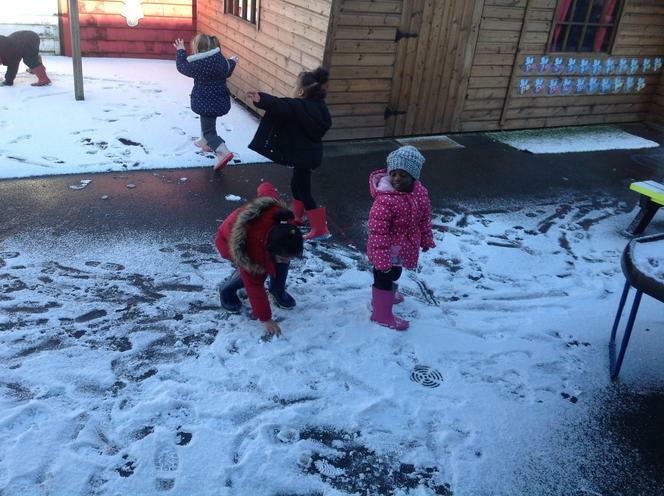 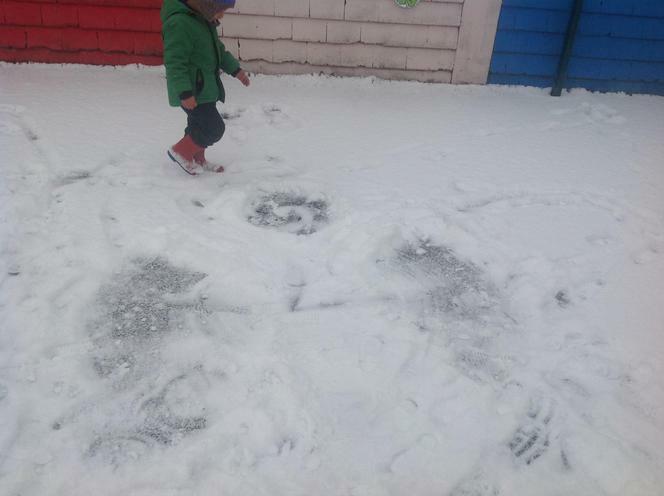 Playing in the snow was such fun! 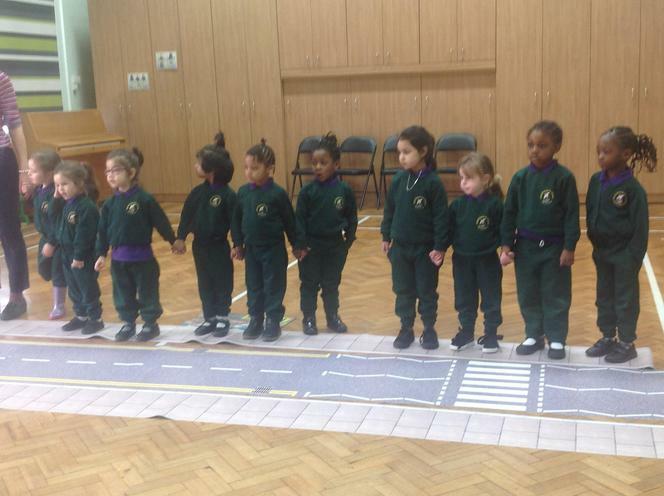 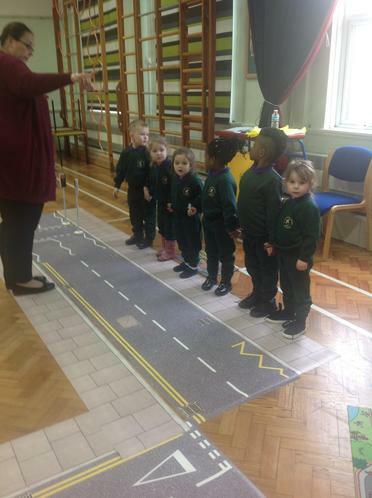 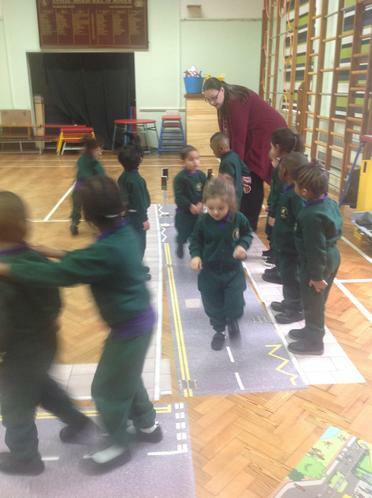 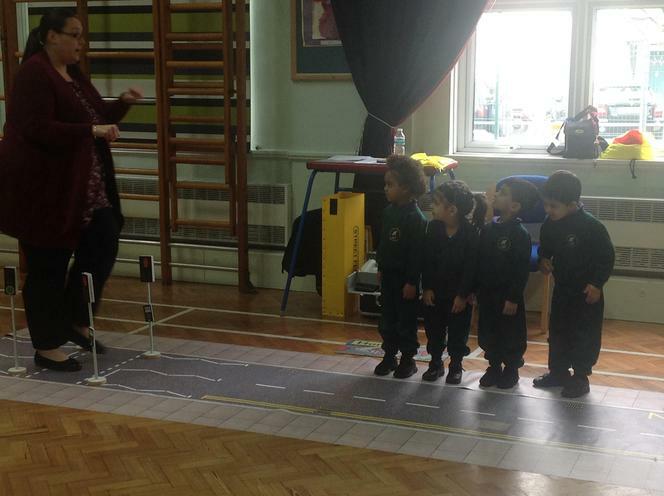 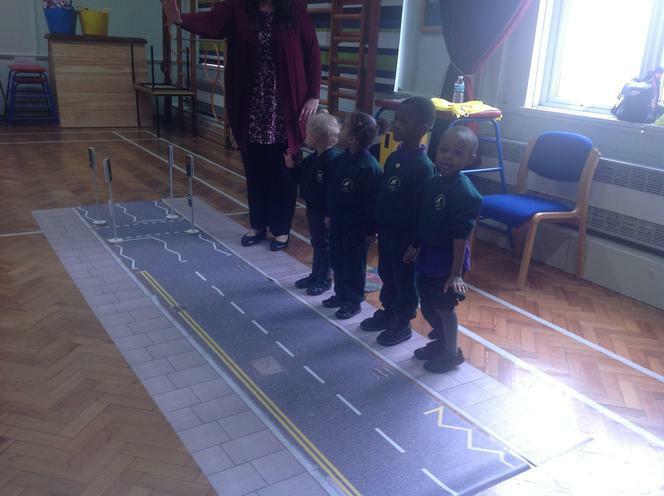 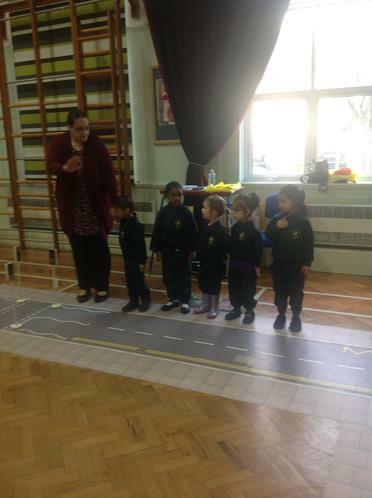 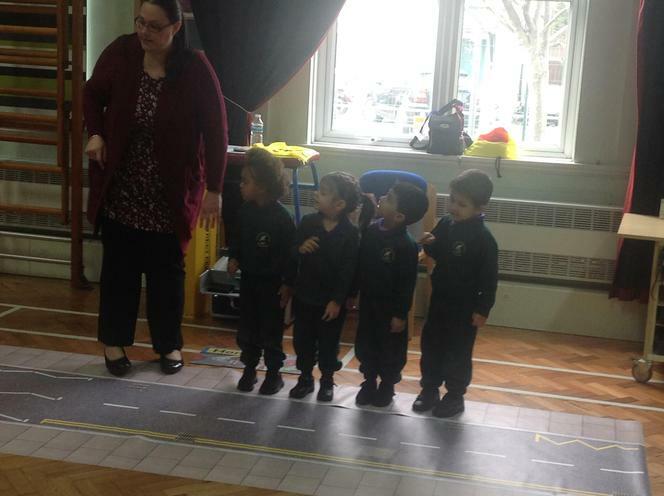 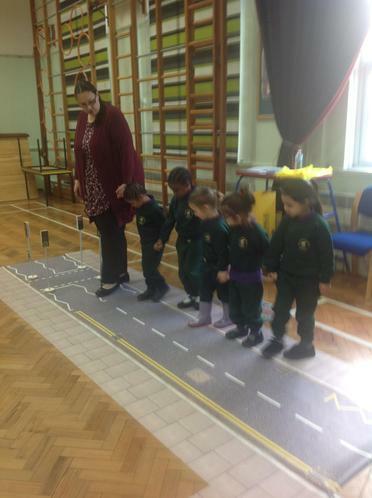 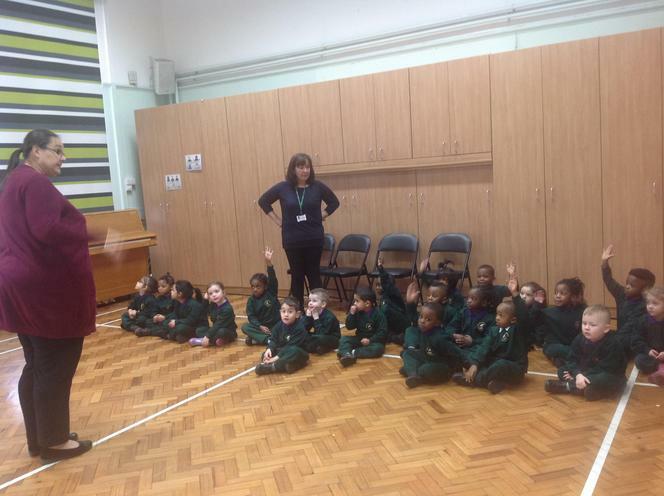 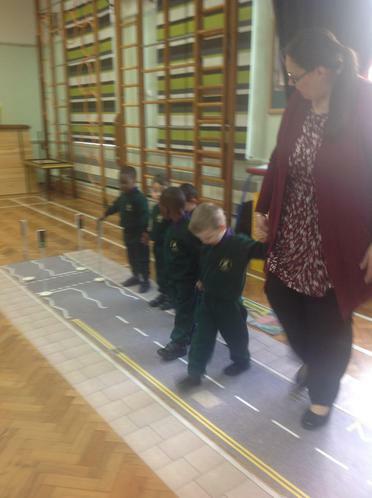 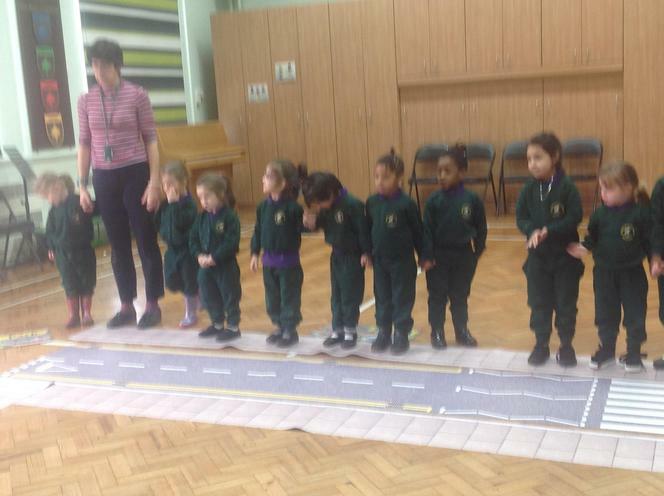 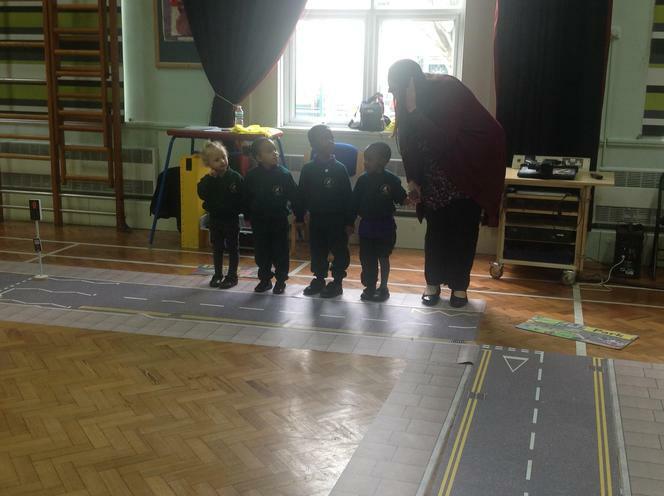 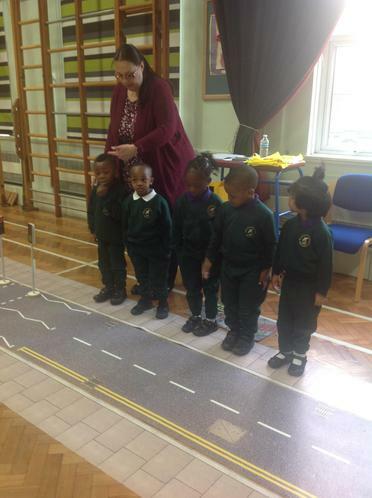 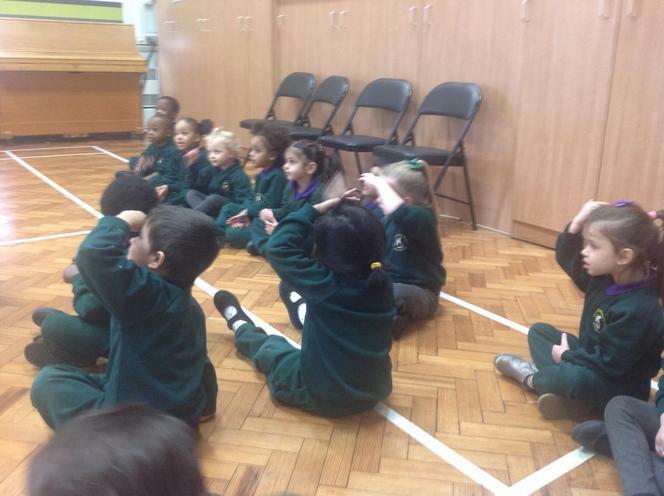 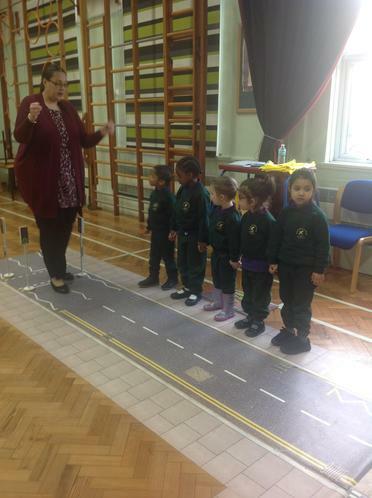 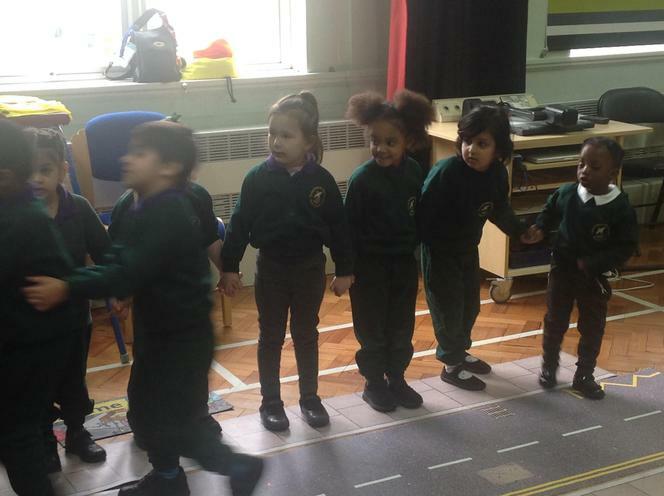 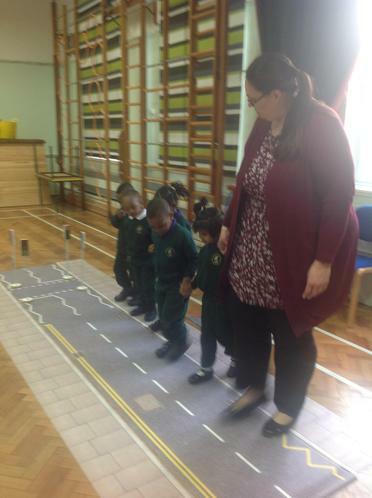 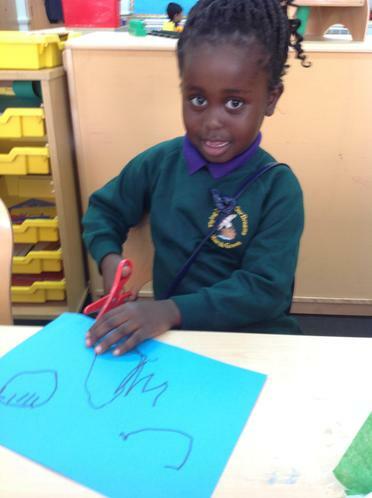 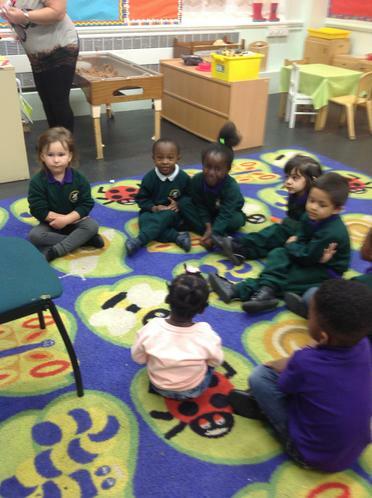 We went into the hall and learnt about road safety with Penny. 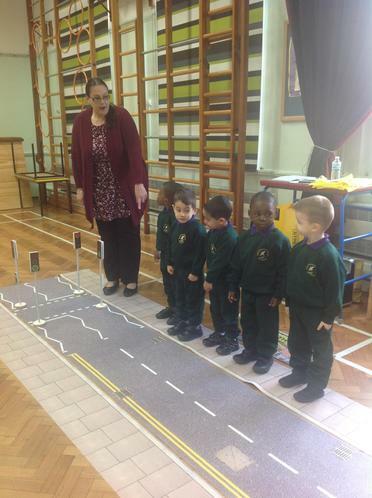 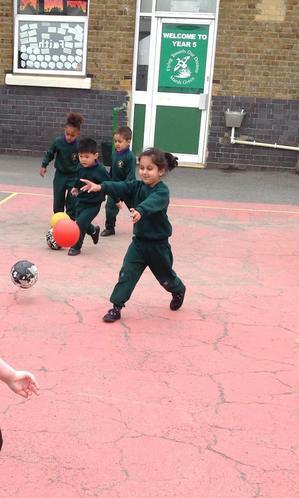 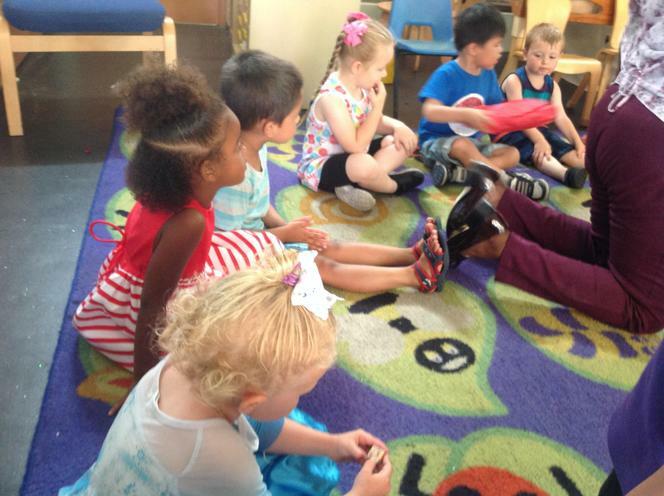 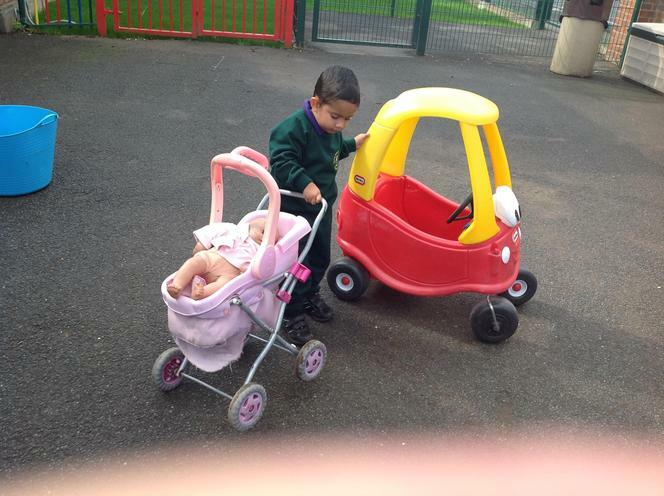 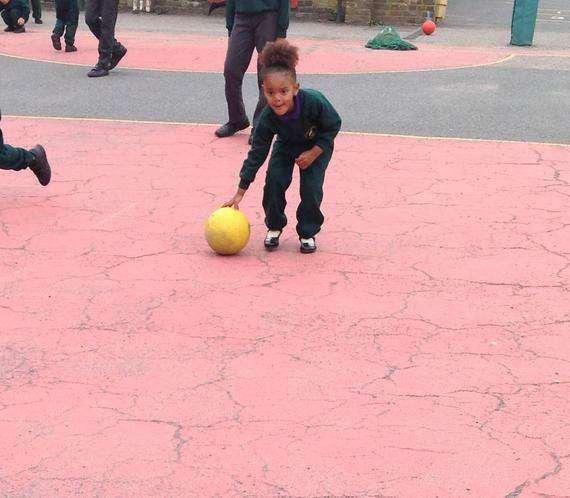 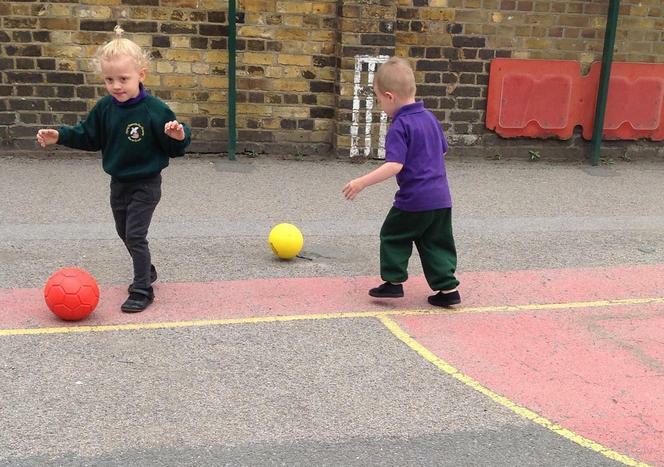 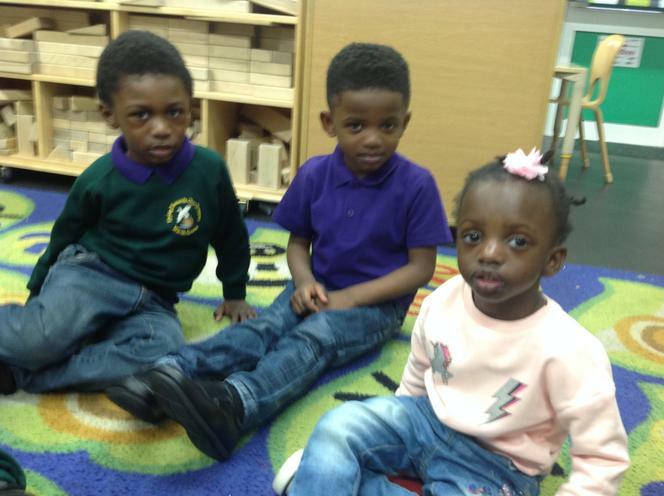 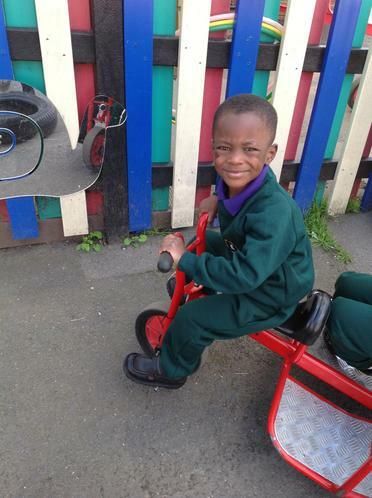 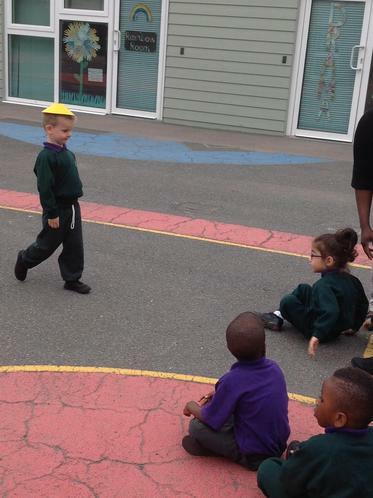 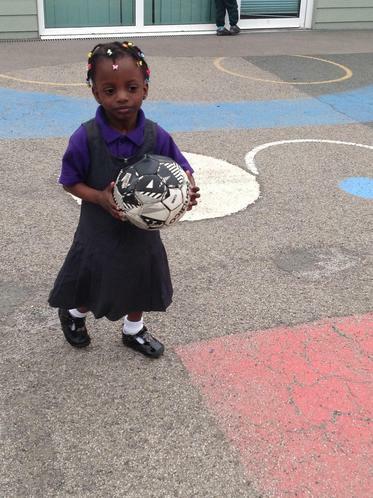 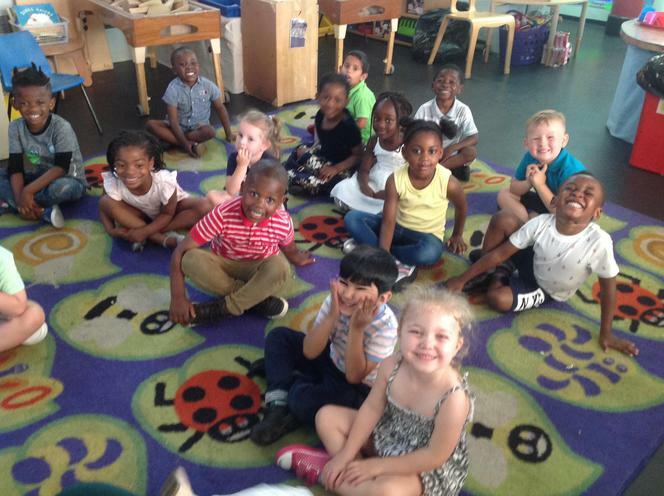 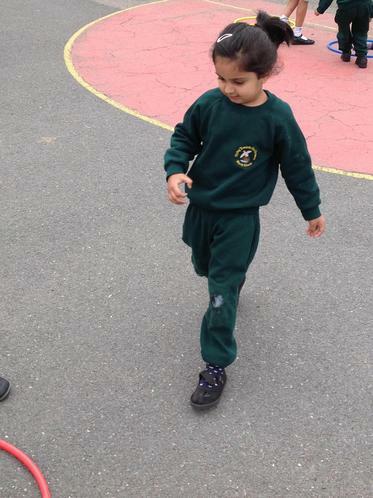 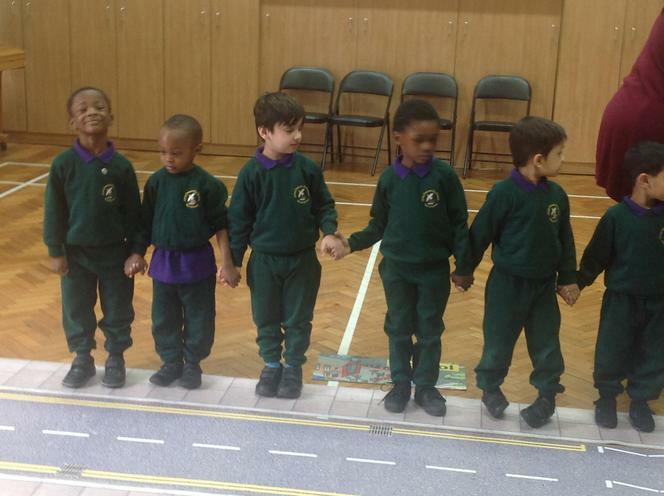 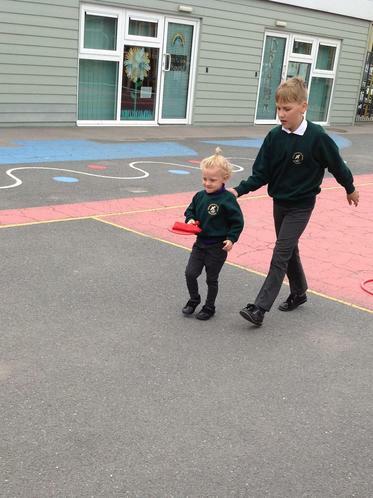 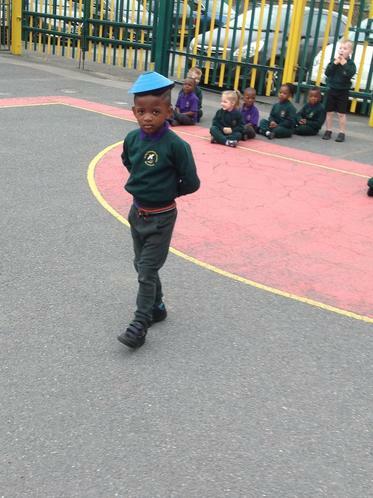 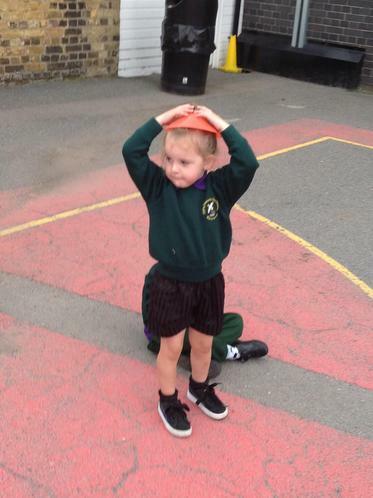 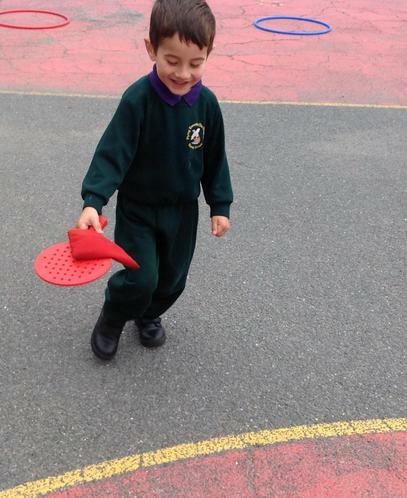 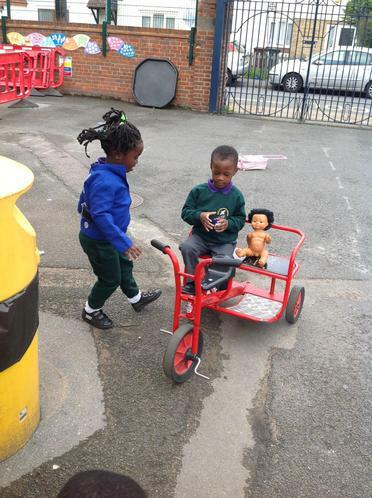 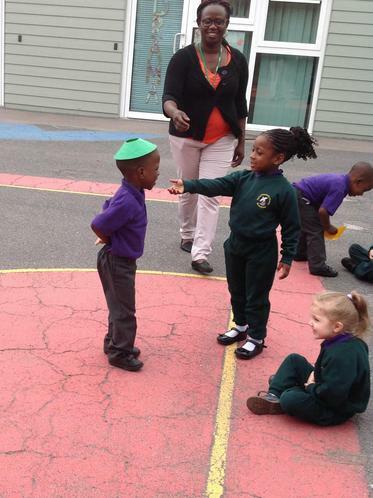 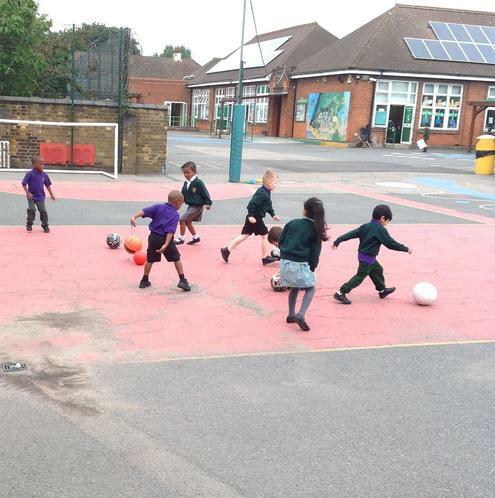 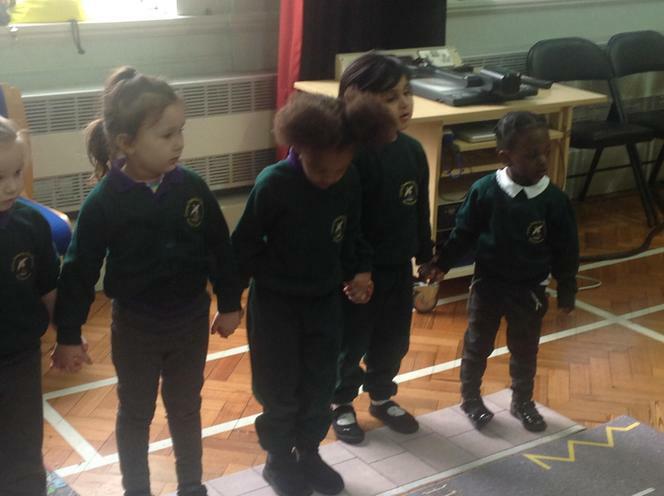 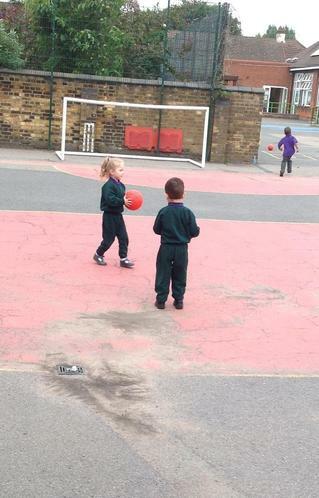 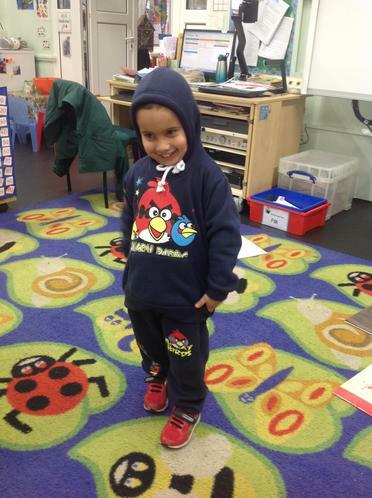 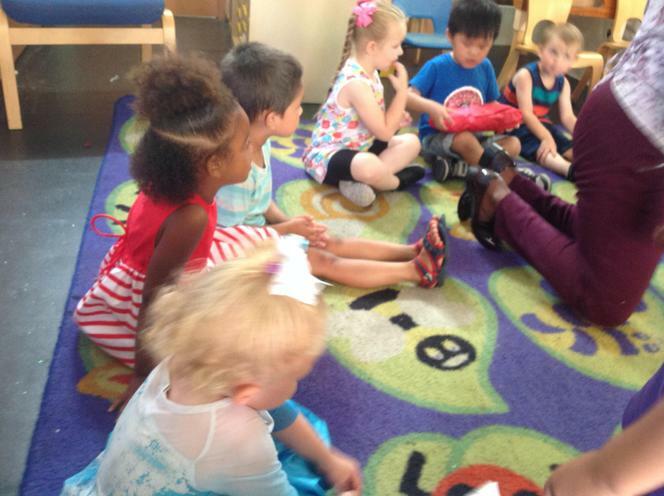 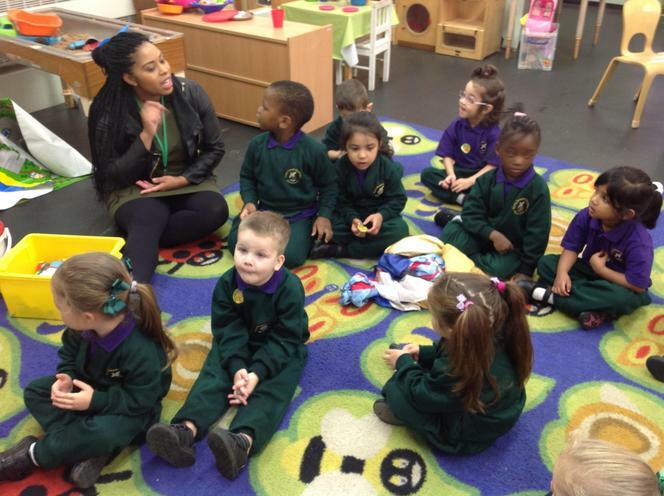 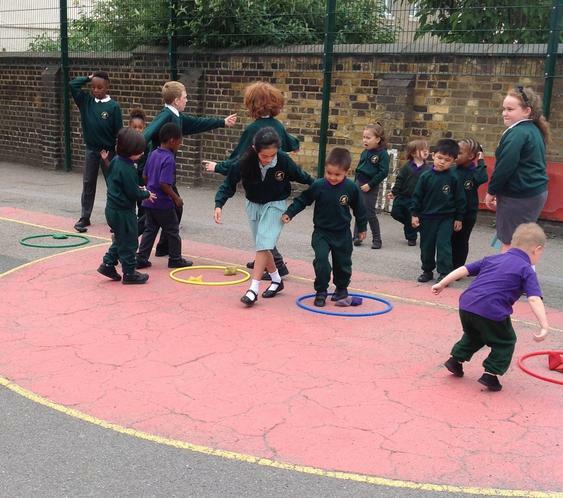 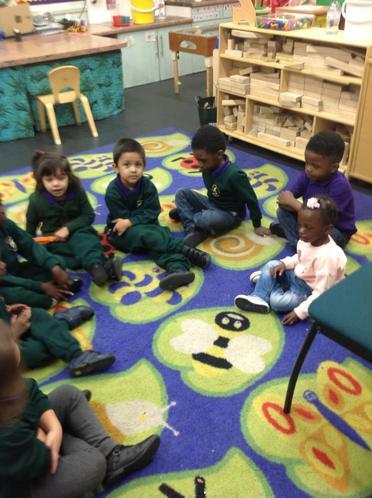 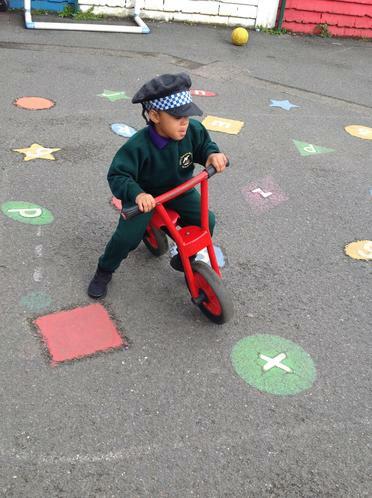 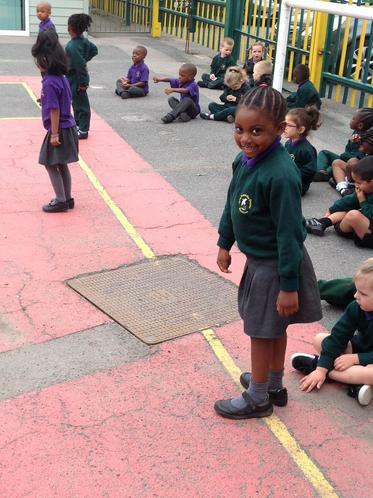 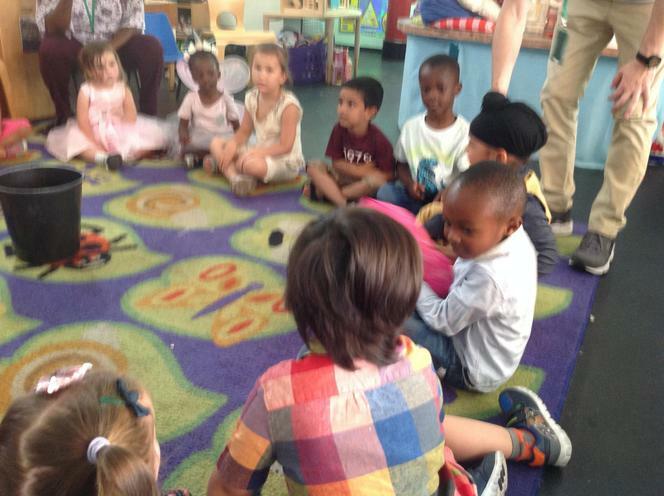 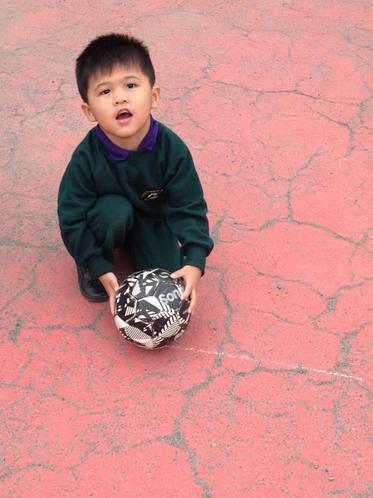 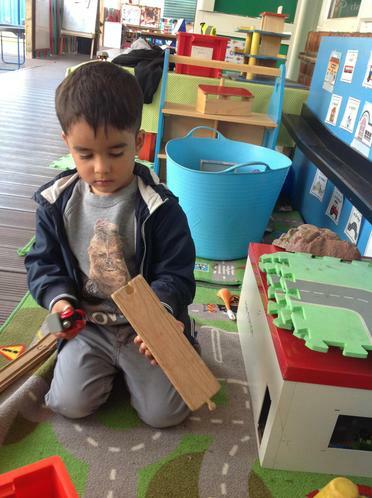 We learnt to always Stop, Look and Listen, before we cross the road. 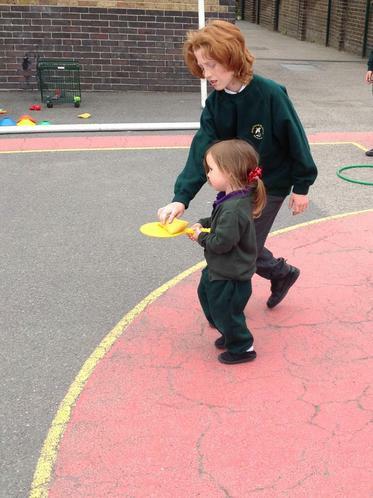 It is safer to hold a grown ups hand. 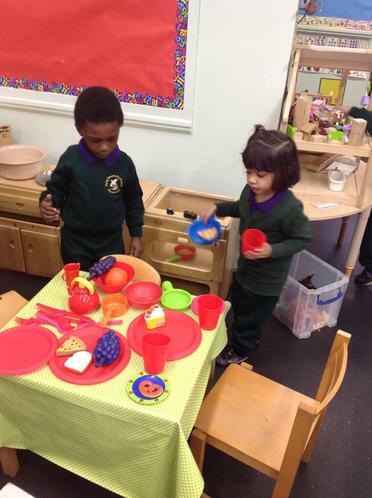 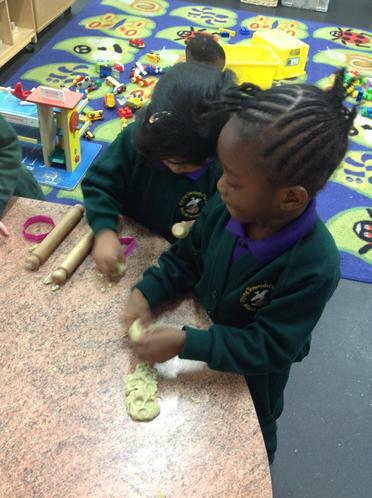 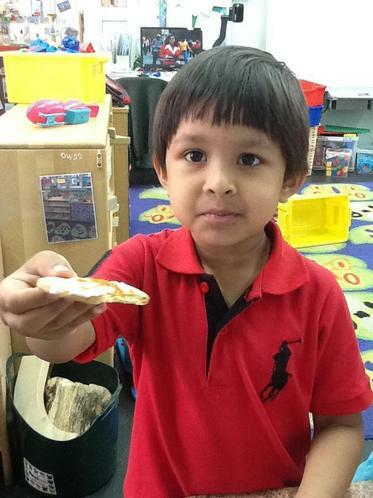 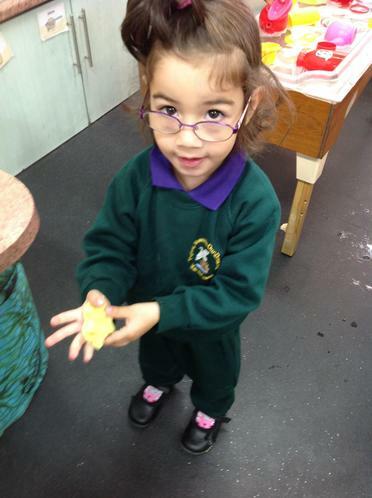 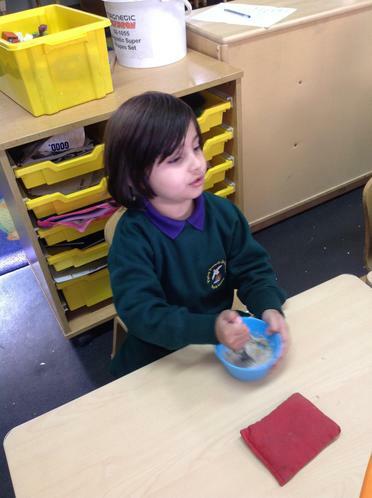 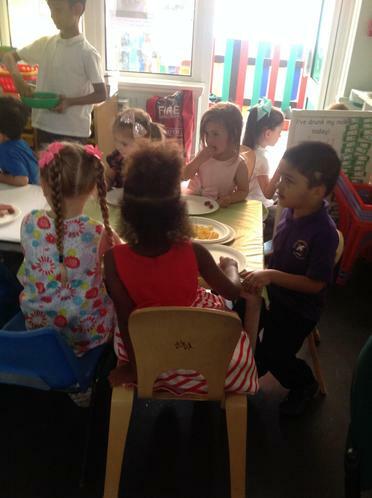 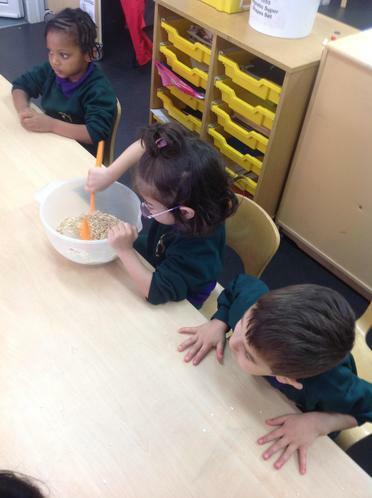 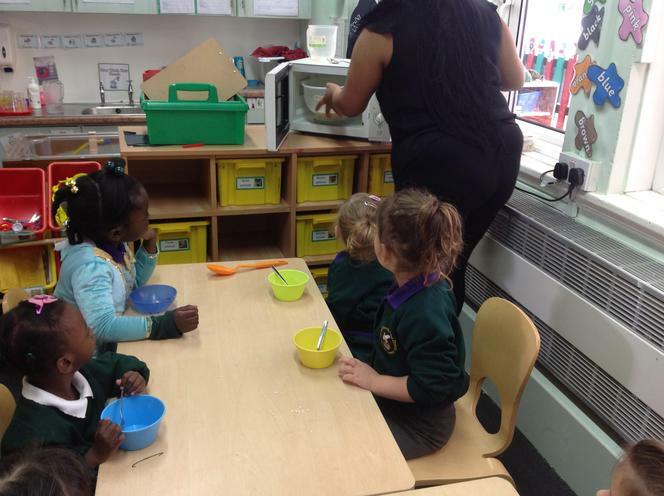 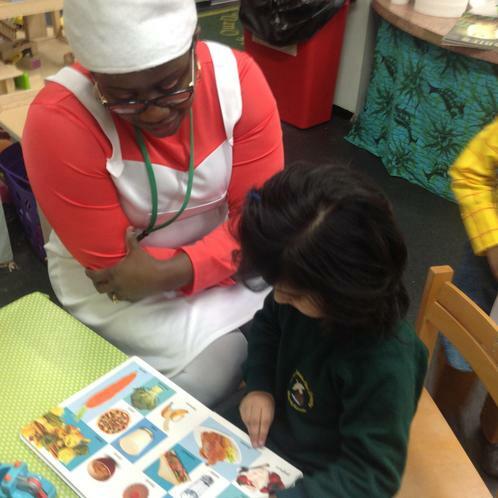 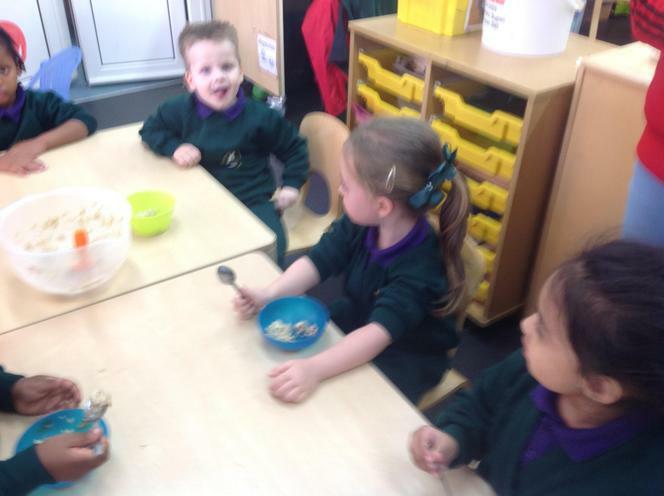 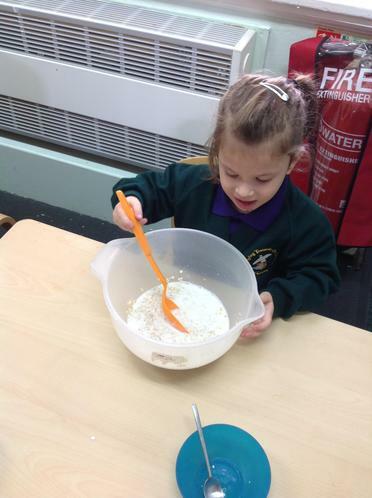 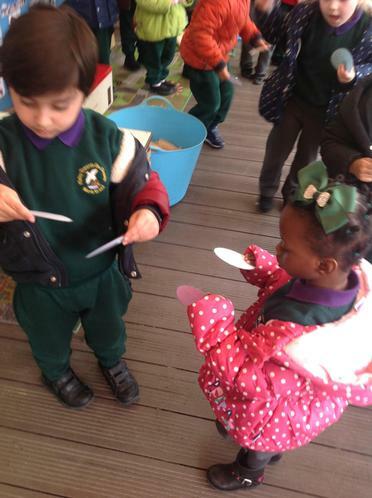 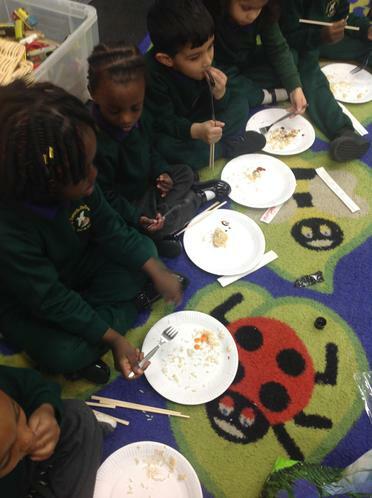 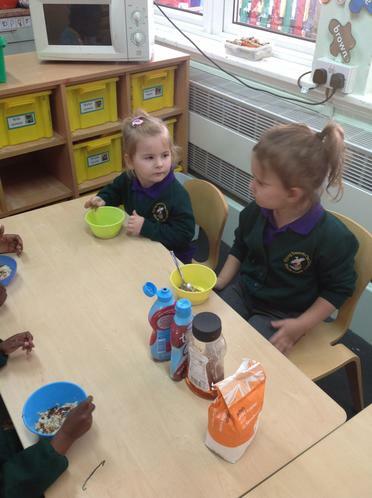 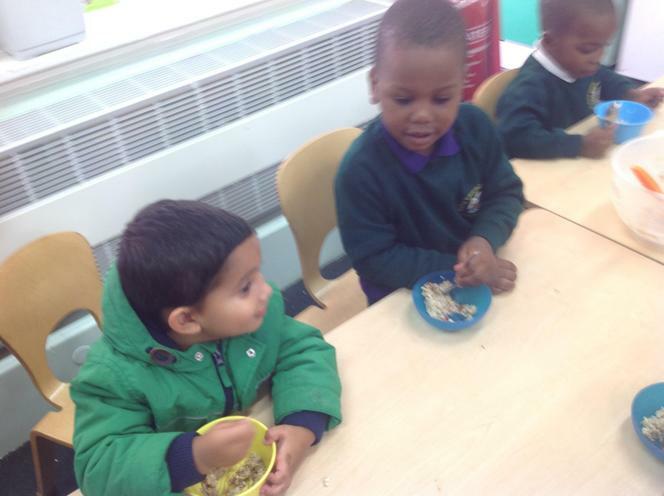 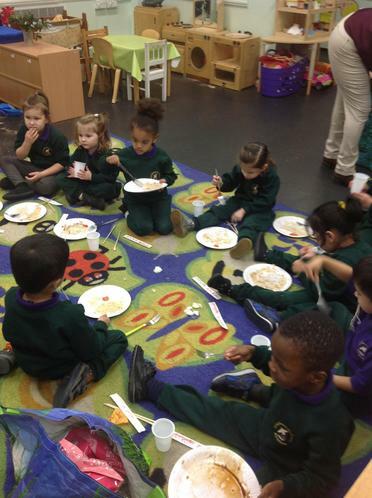 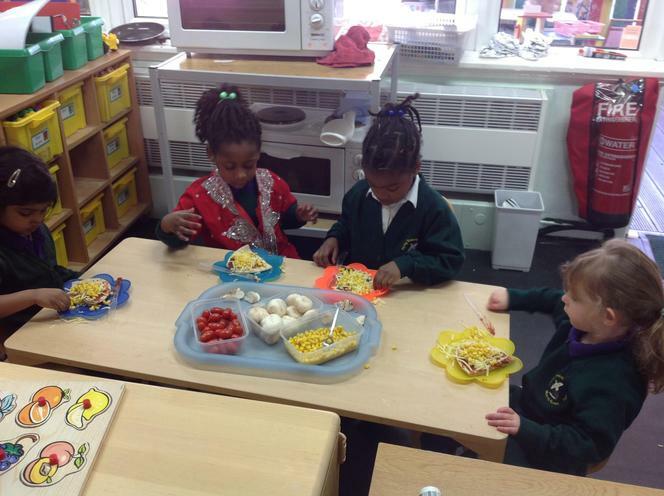 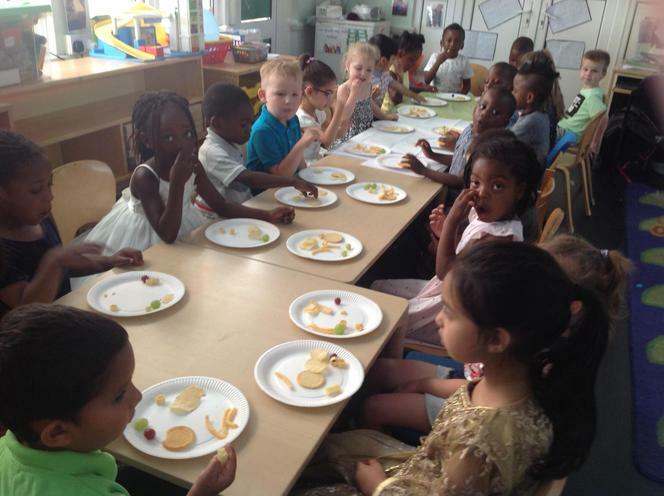 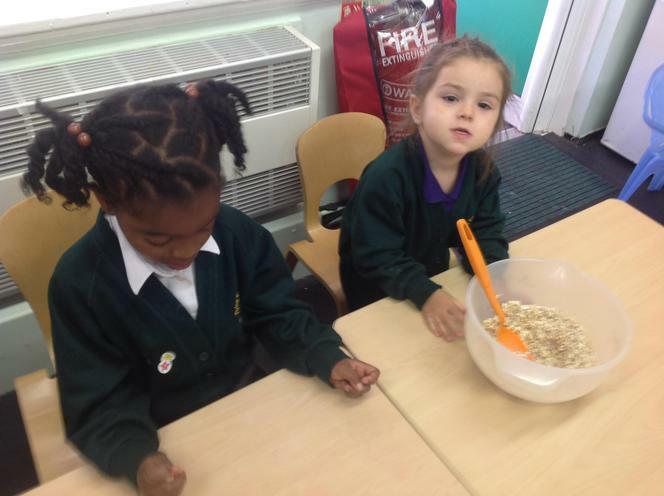 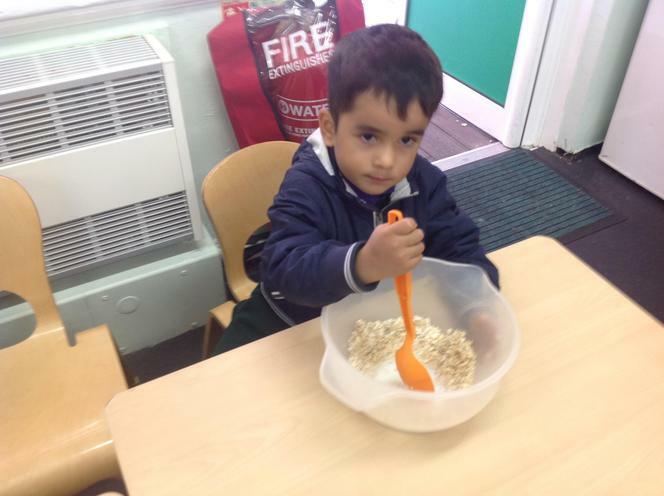 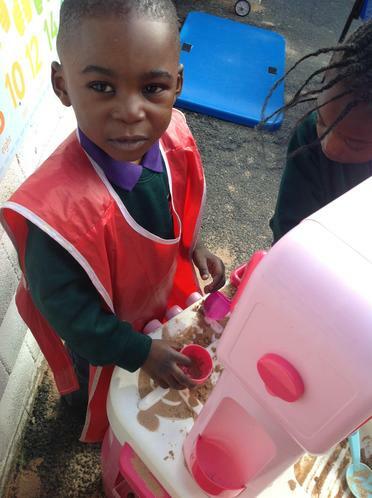 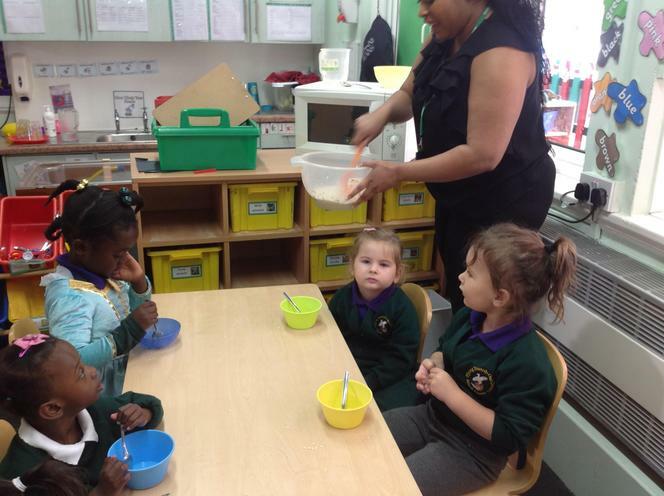 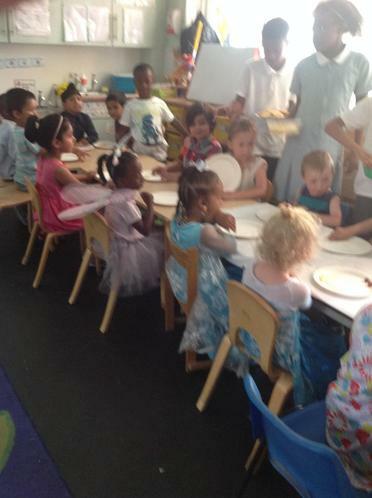 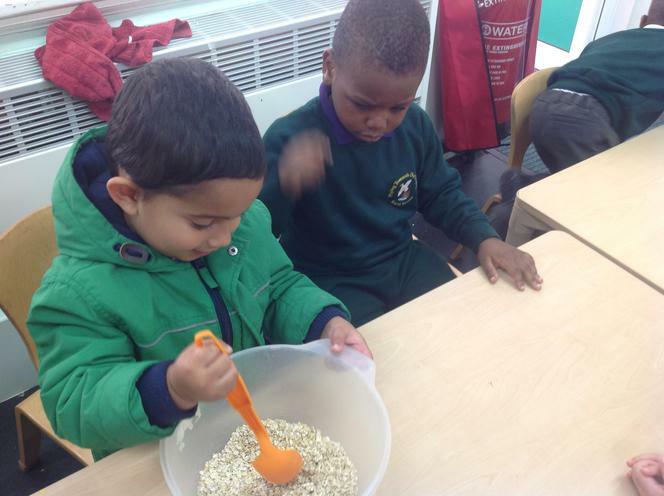 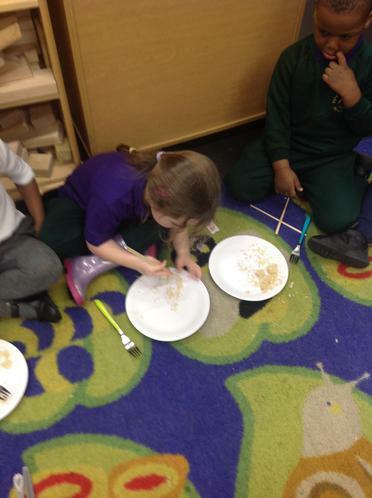 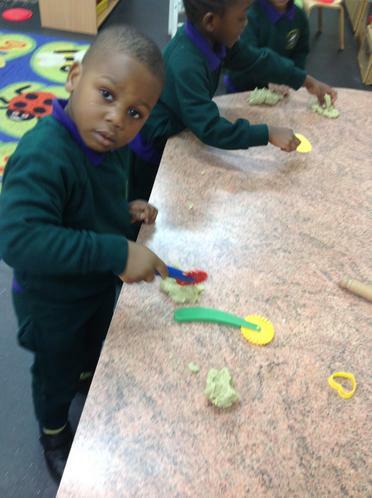 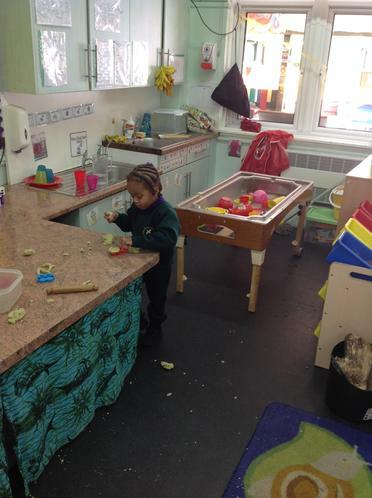 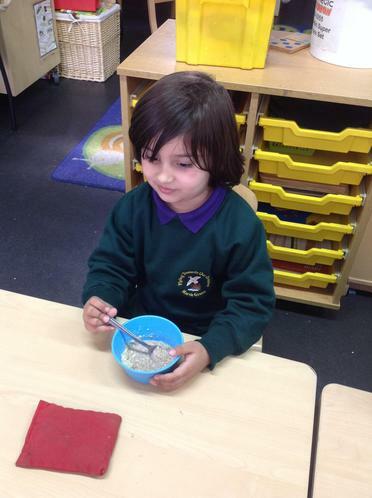 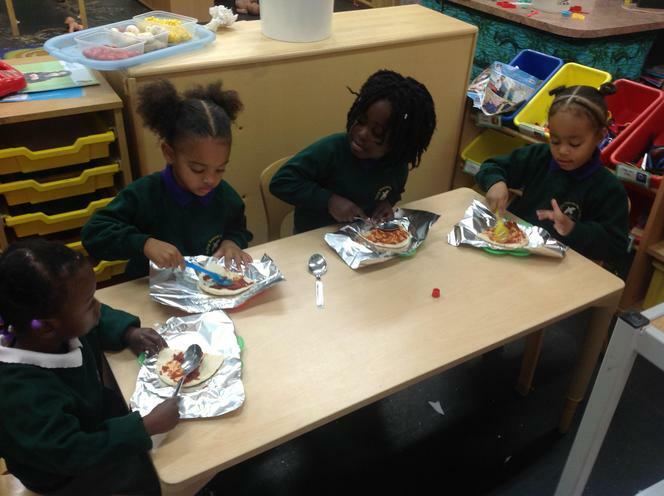 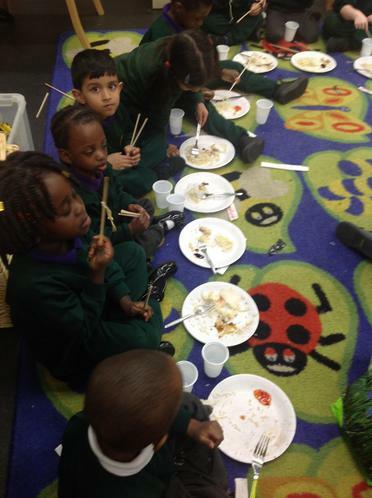 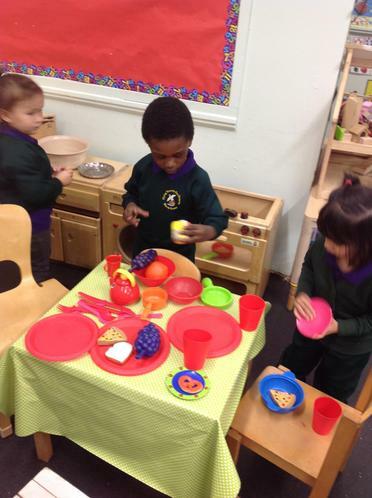 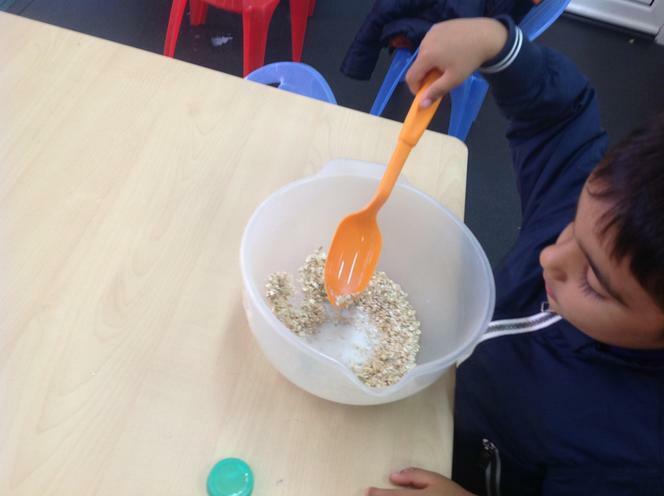 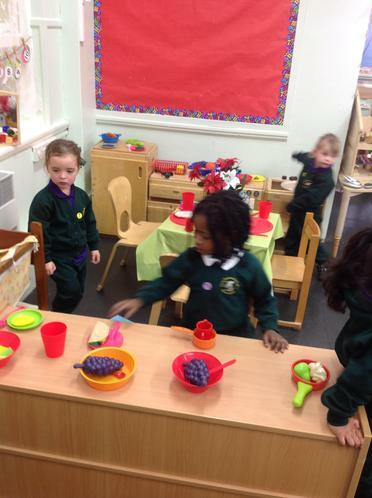 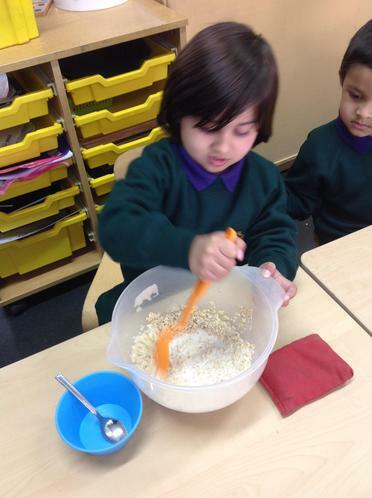 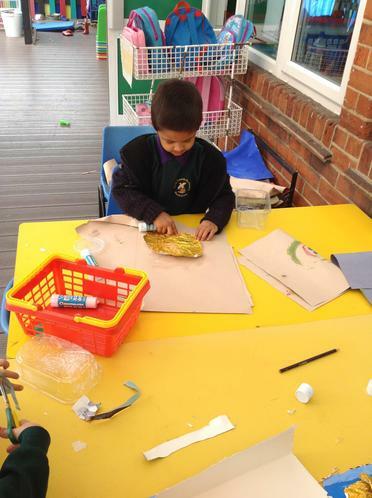 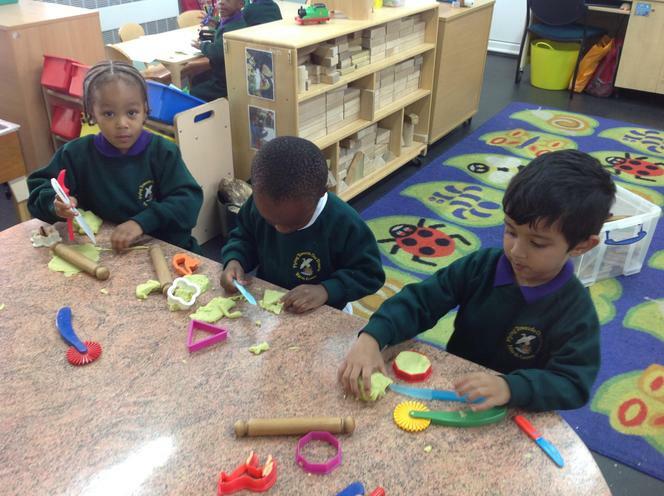 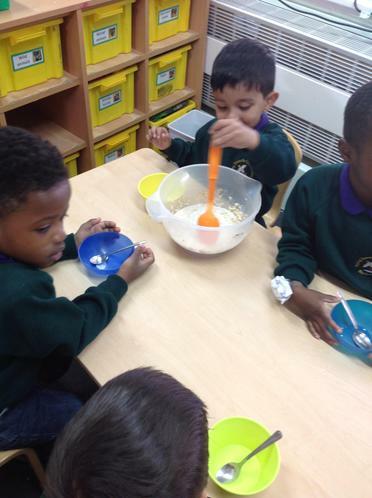 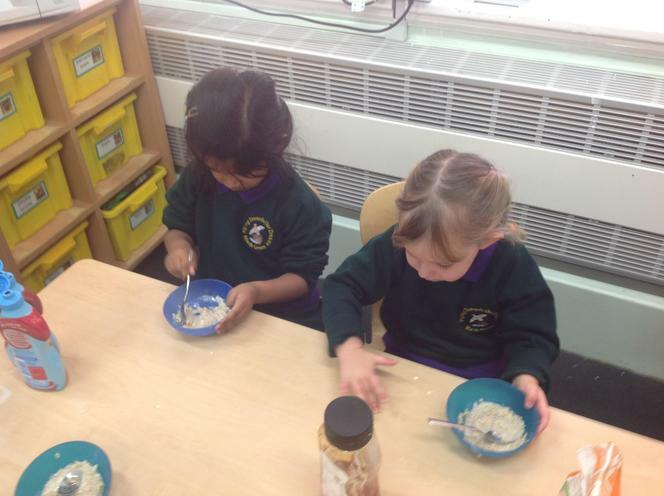 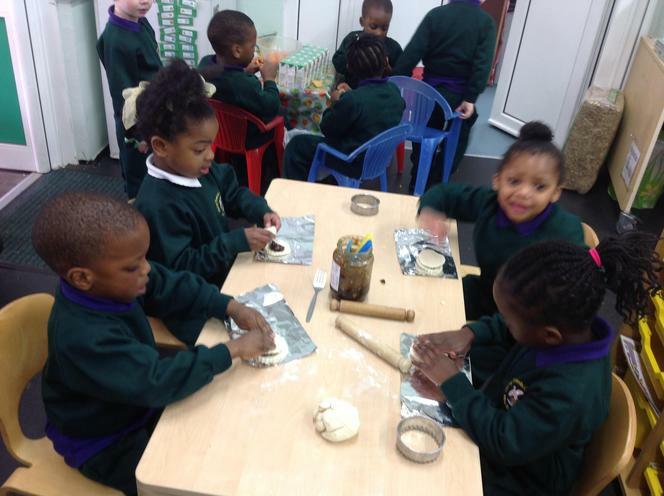 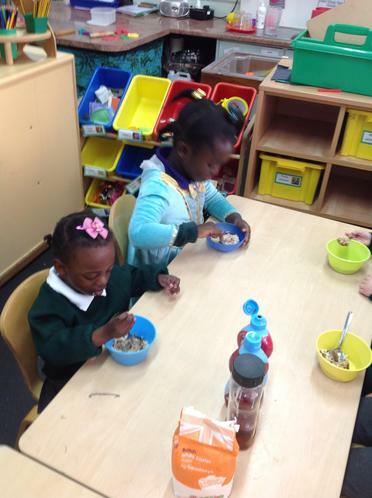 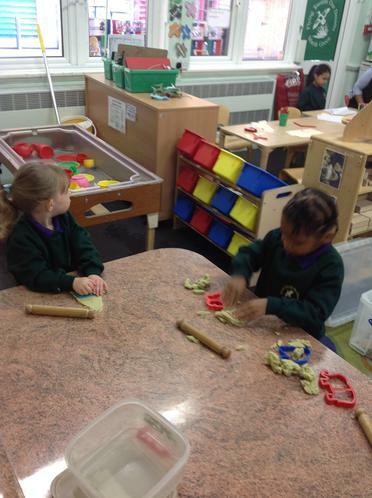 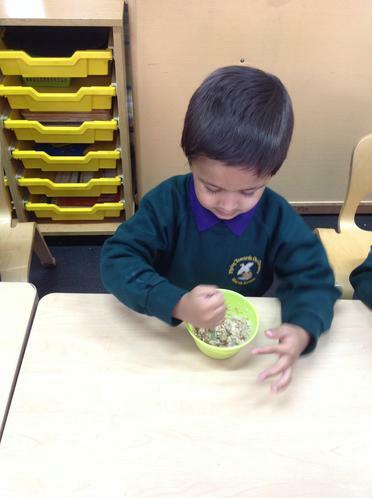 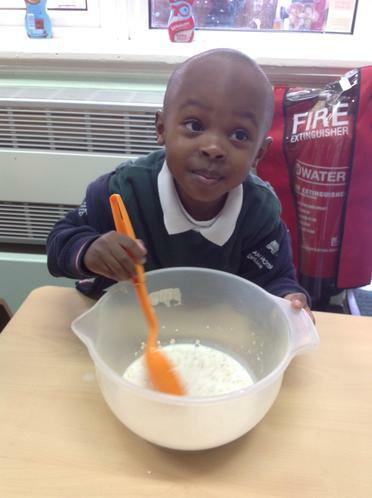 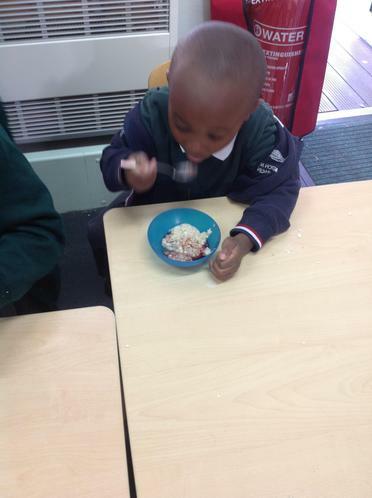 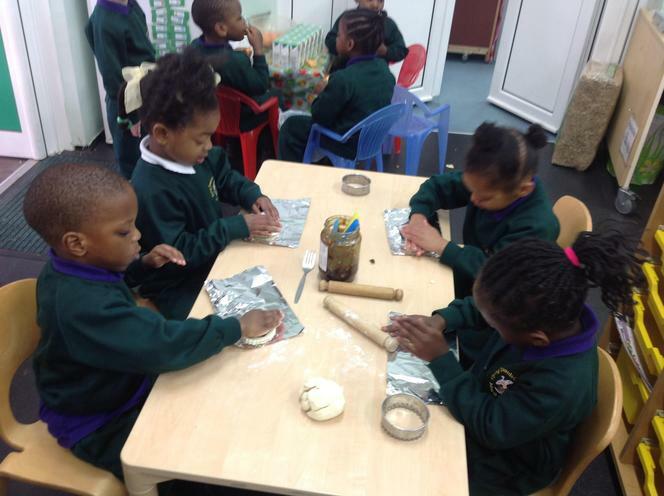 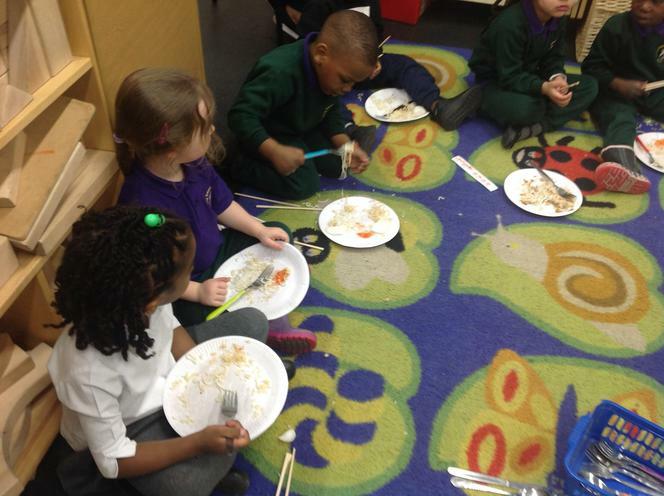 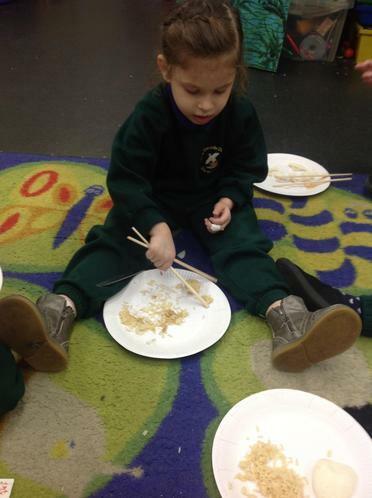 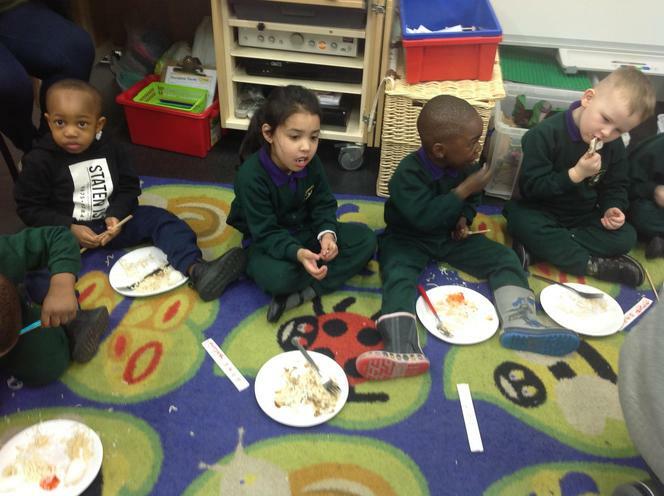 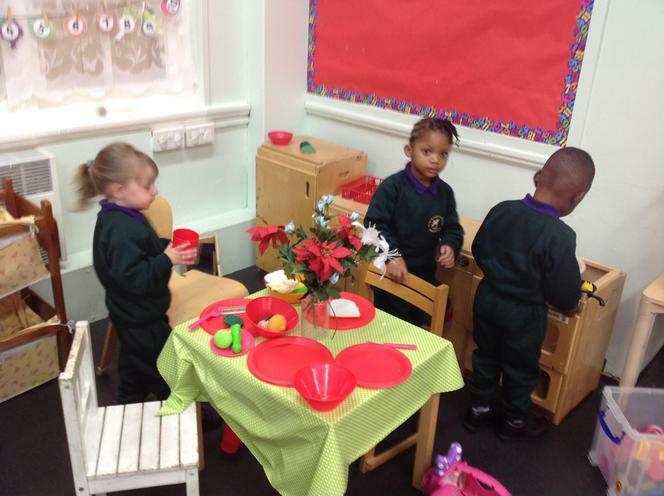 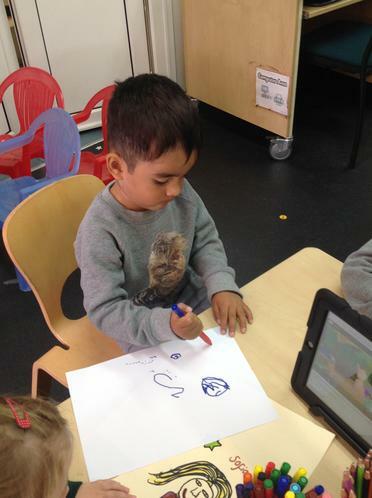 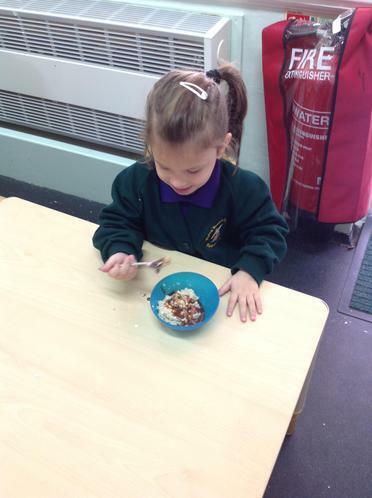 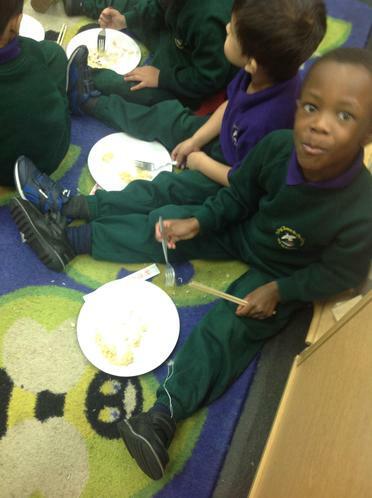 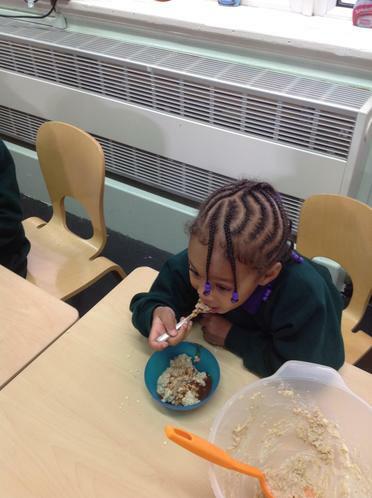 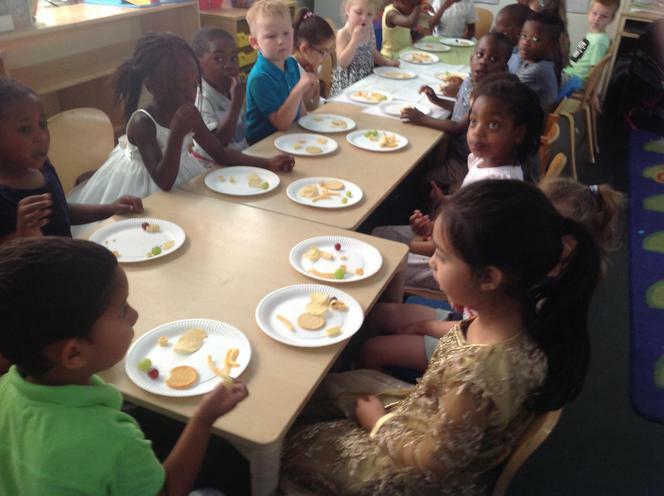 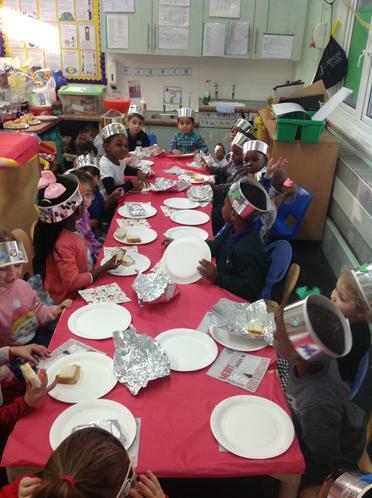 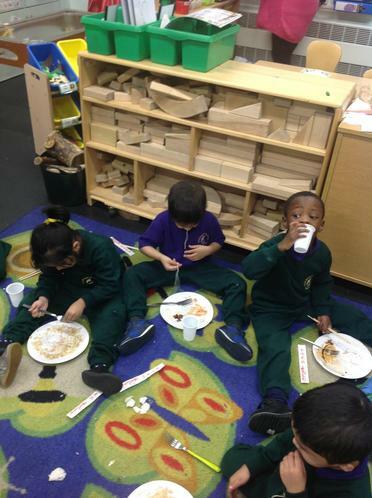 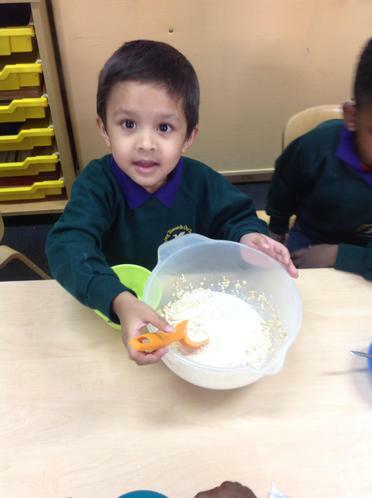 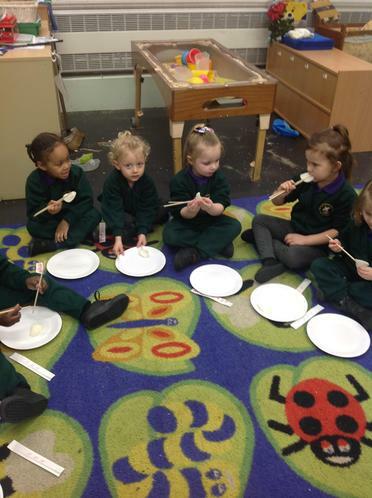 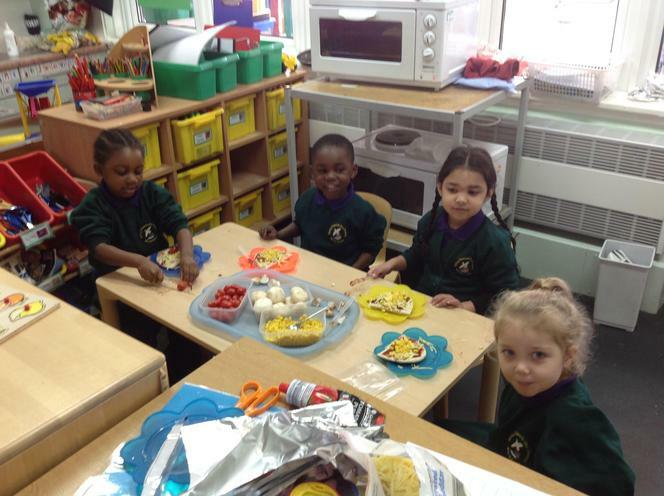 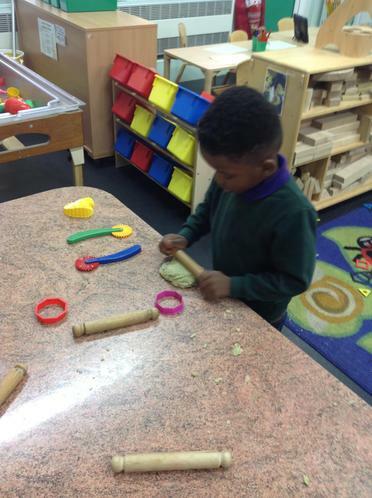 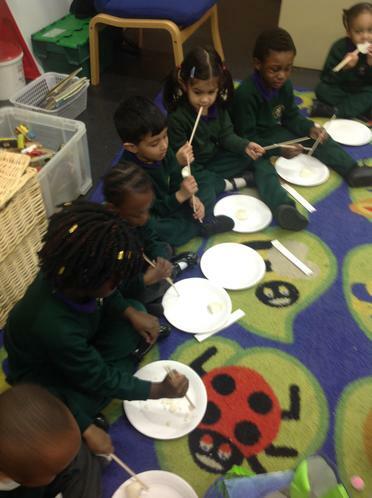 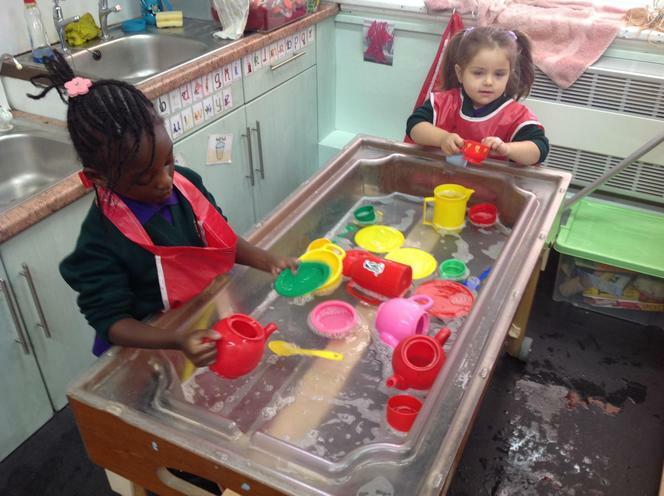 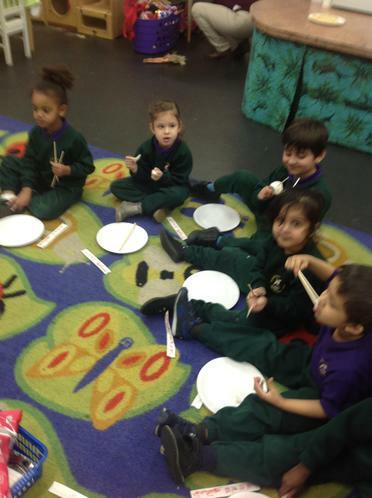 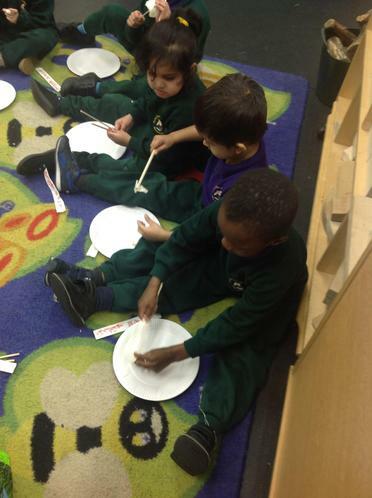 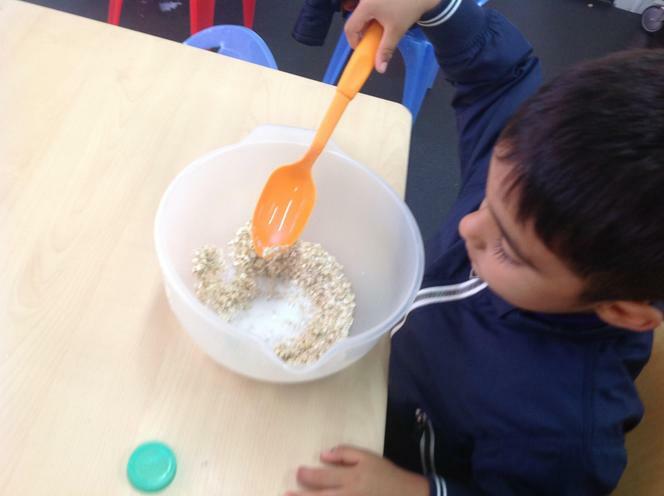 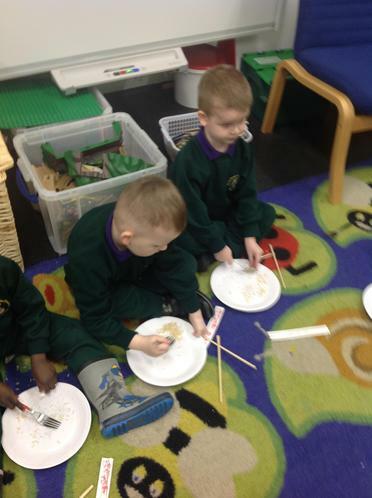 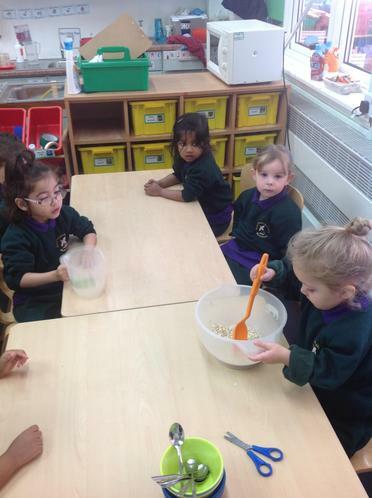 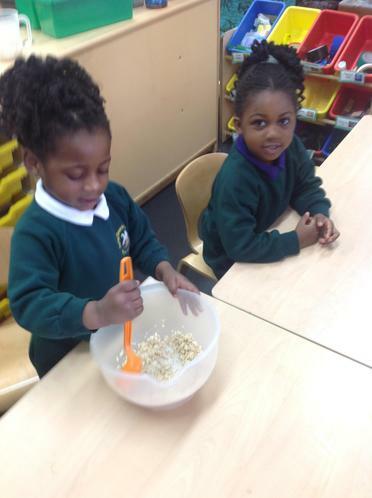 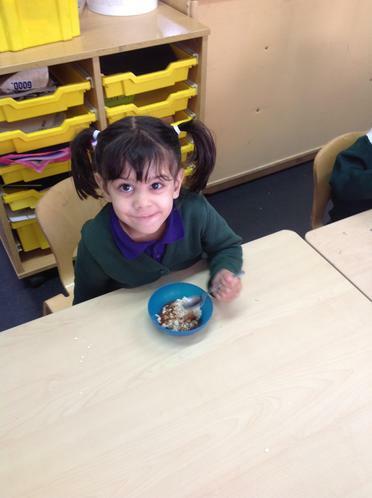 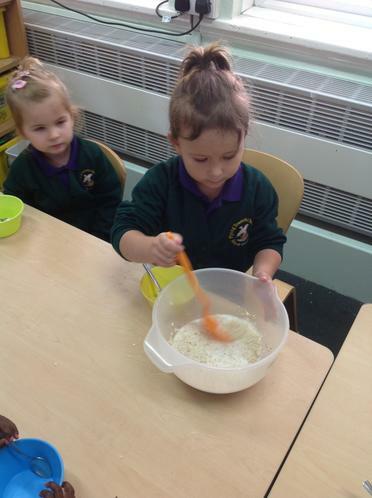 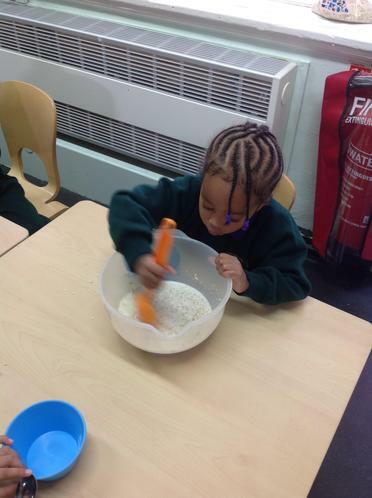 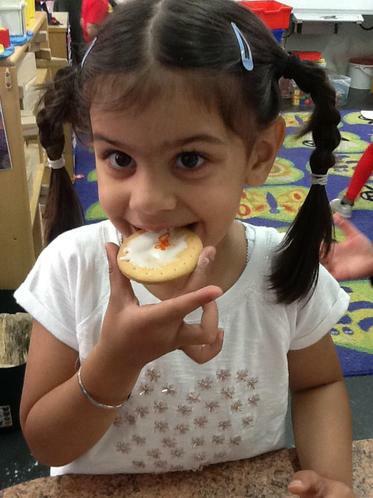 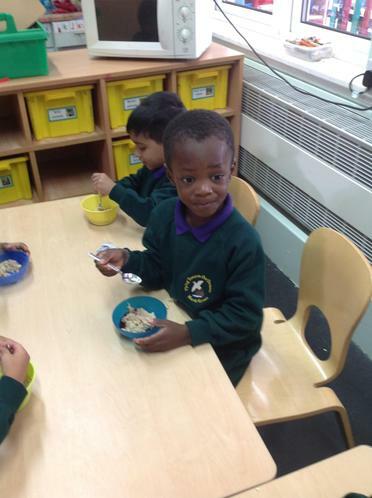 The children tried noodles, rice and prawn crackers. 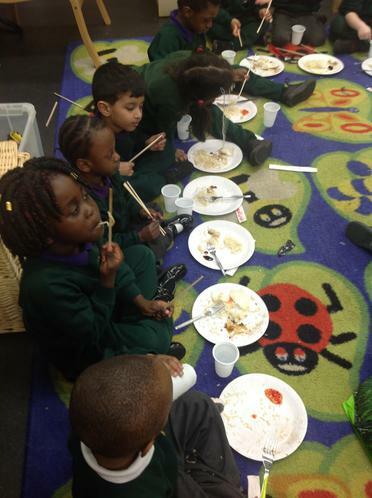 We gave them chop-sticks and some children could use them! 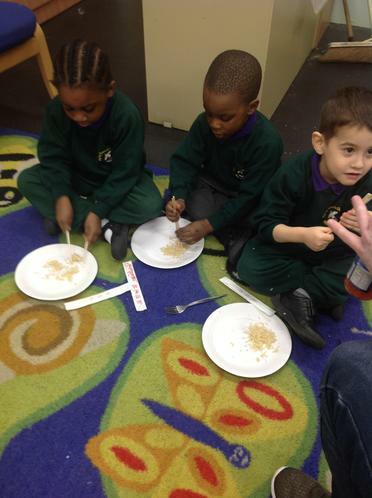 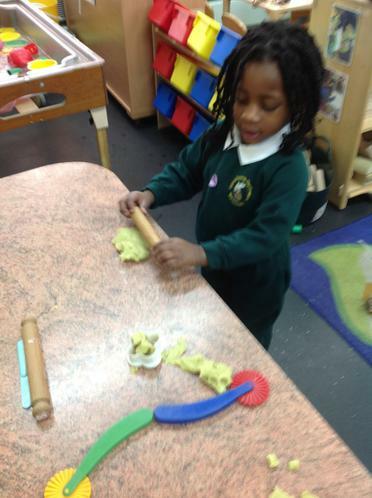 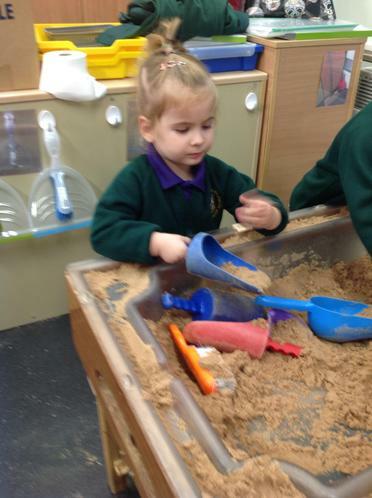 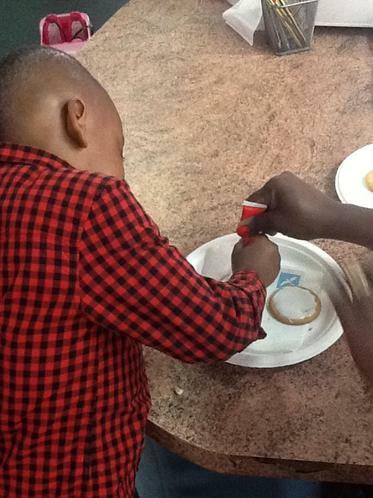 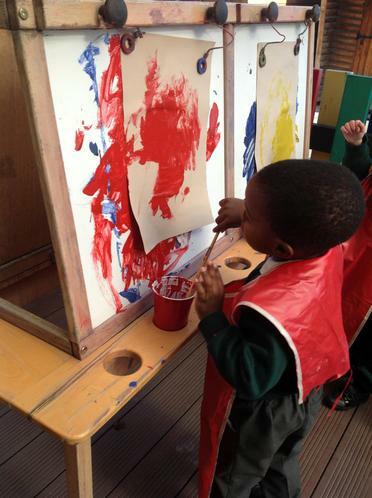 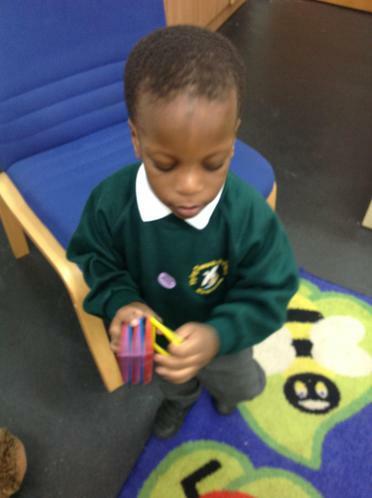 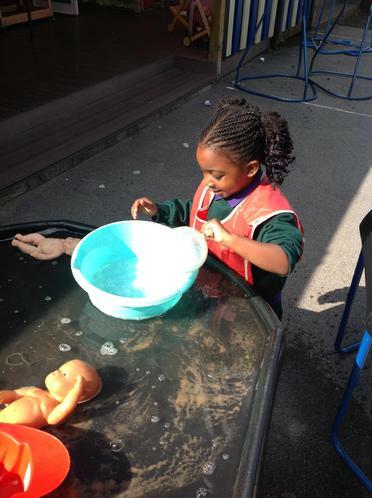 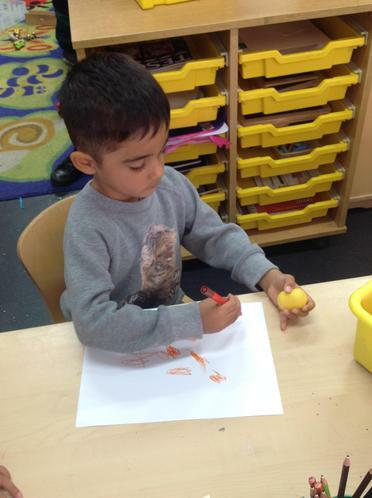 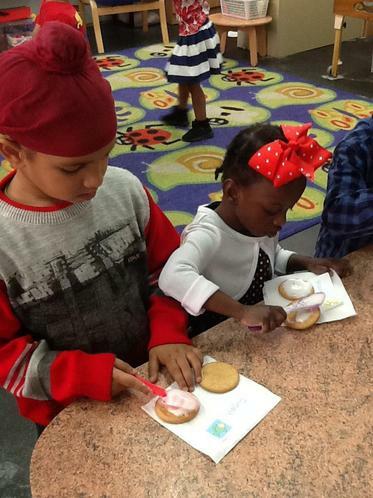 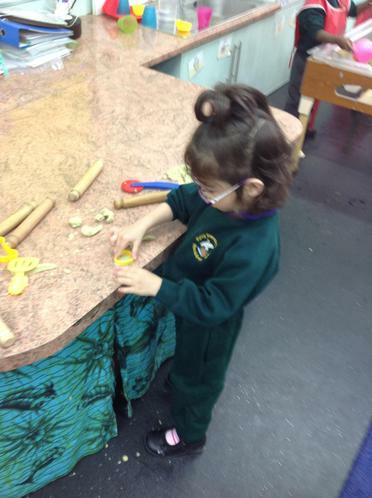 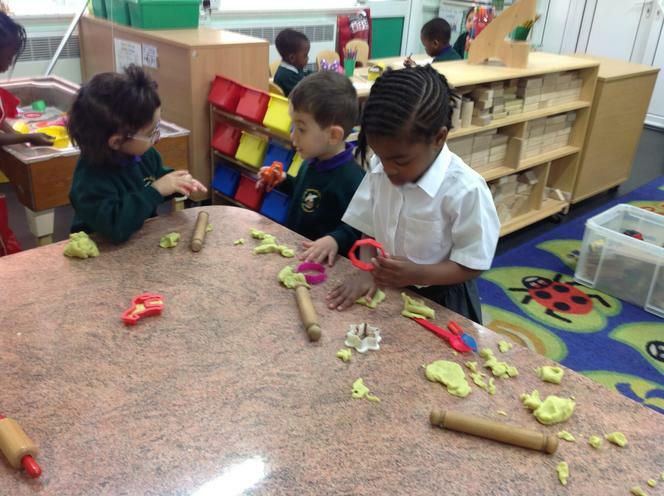 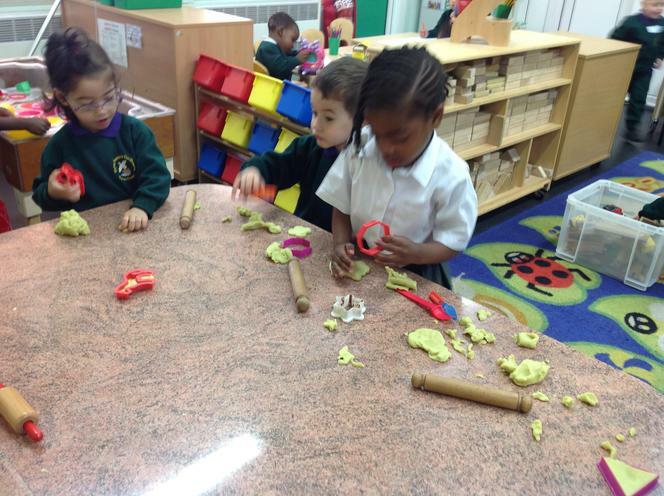 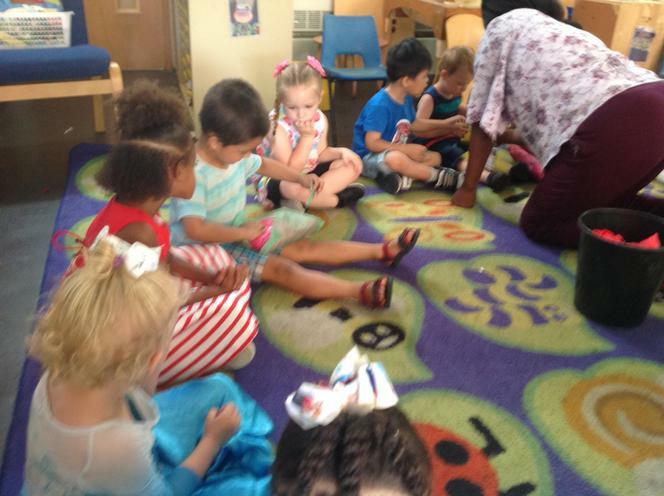 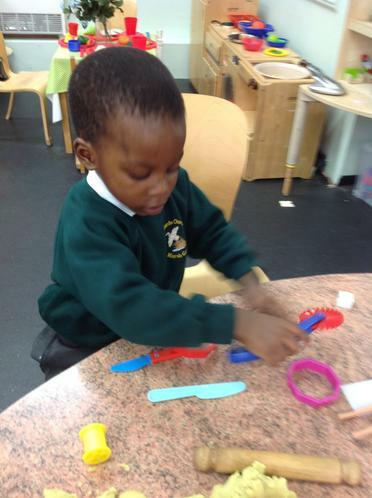 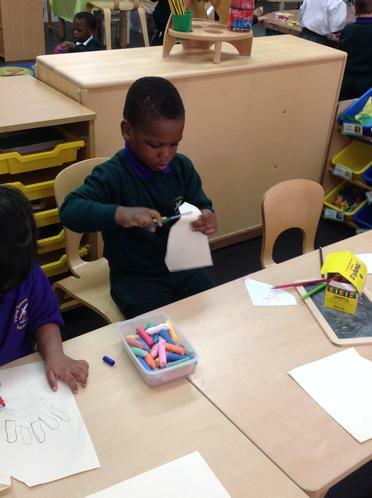 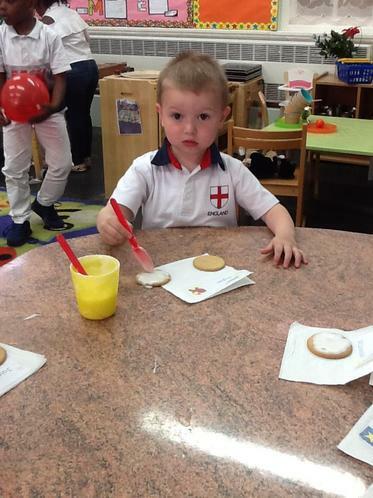 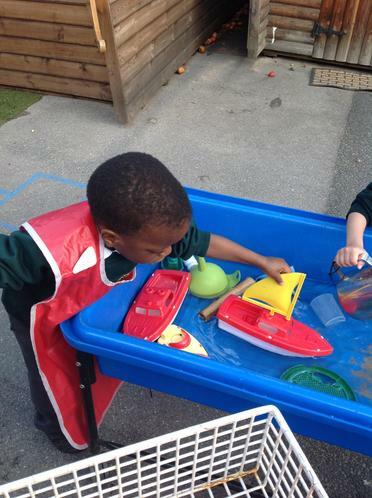 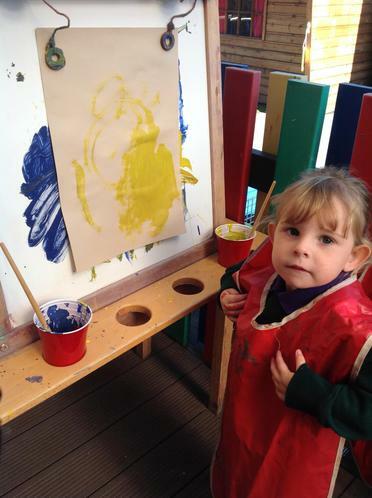 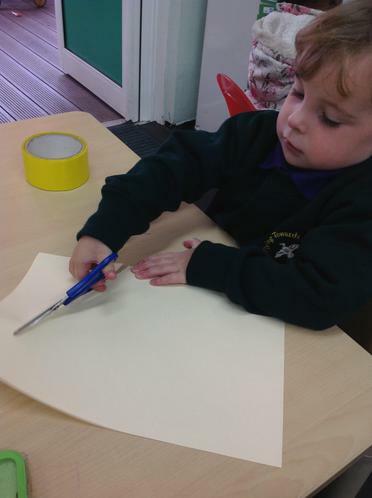 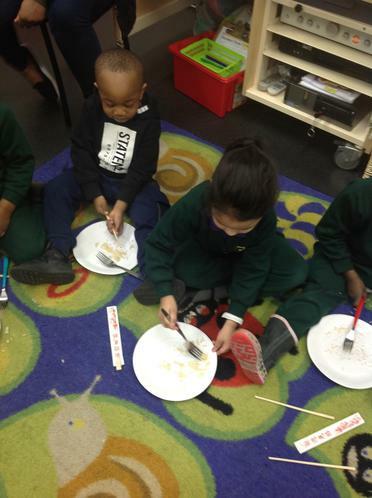 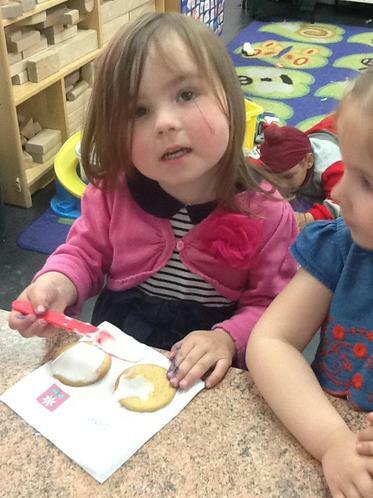 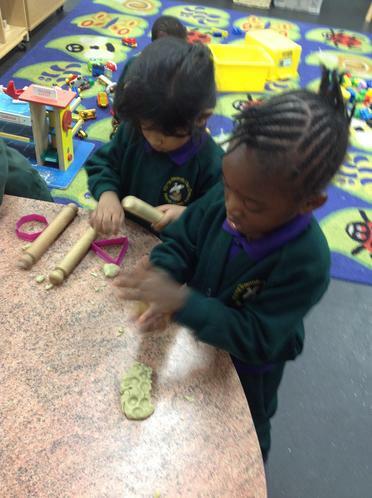 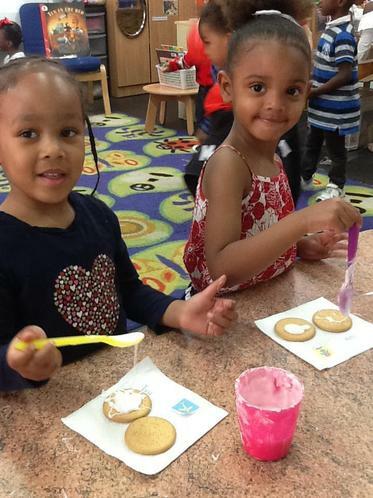 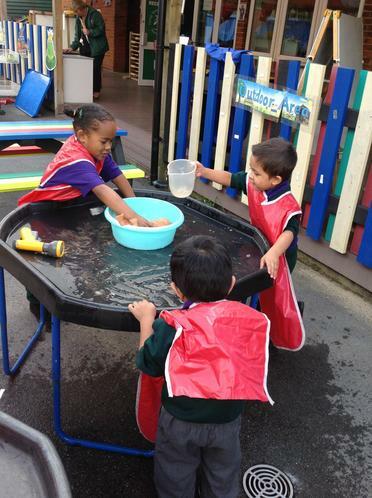 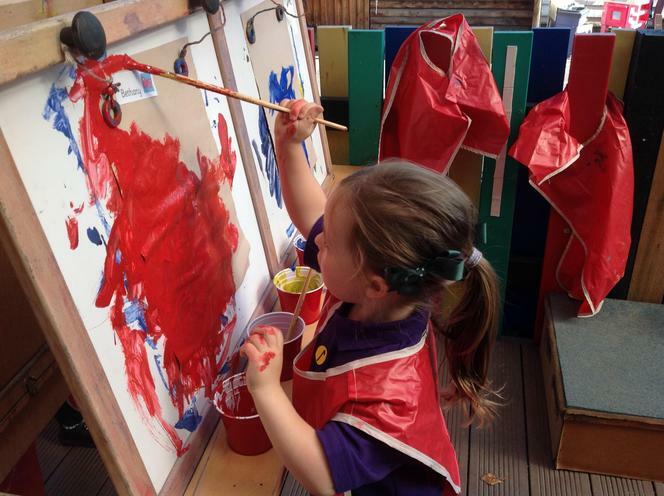 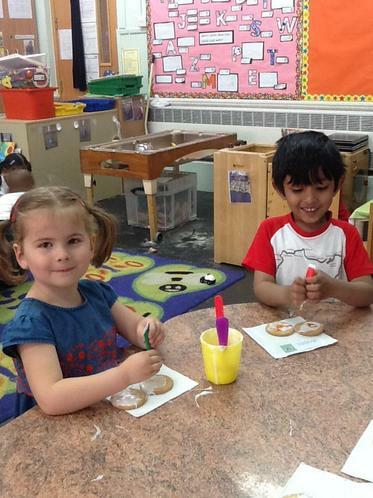 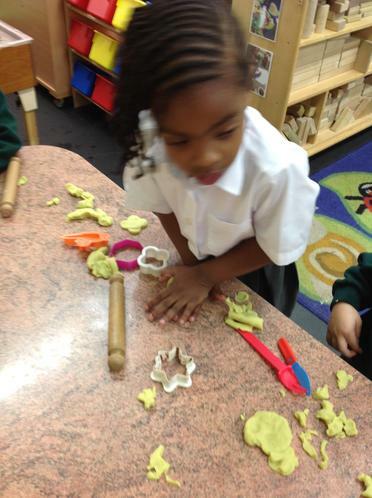 Others used a fork or spoon and some used their fingers. 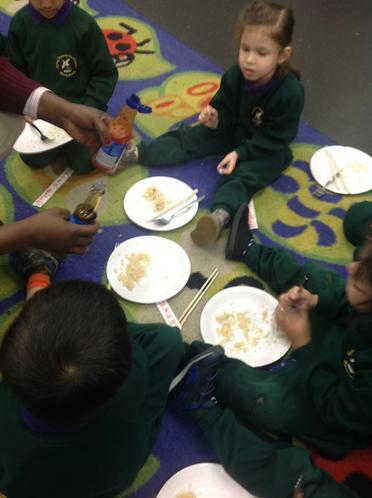 We offered chilli sauce and soy sauce. 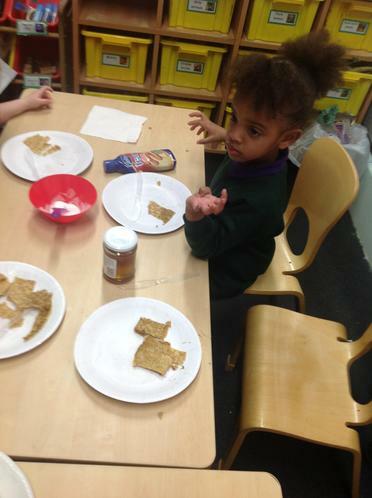 "It is too spicy for me!" 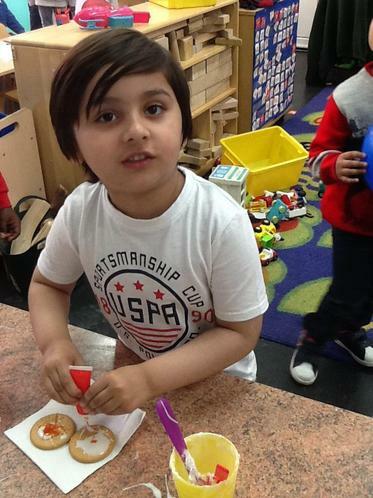 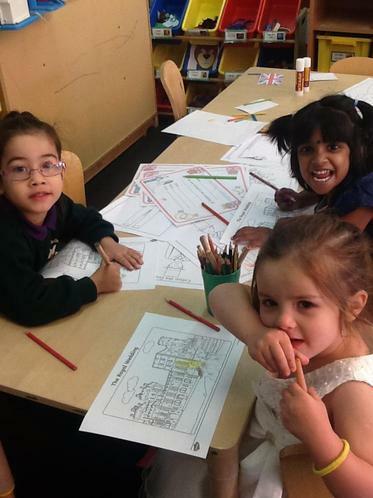 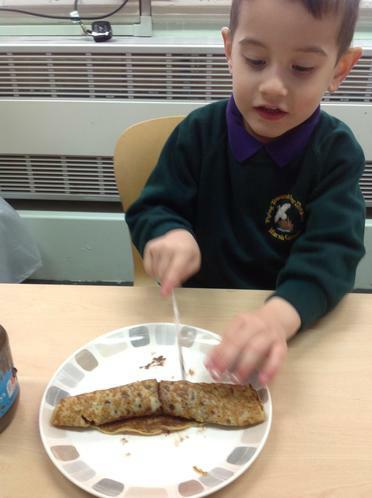 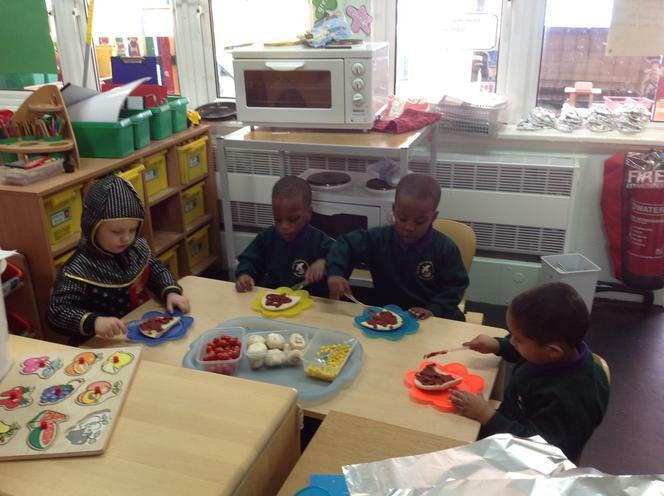 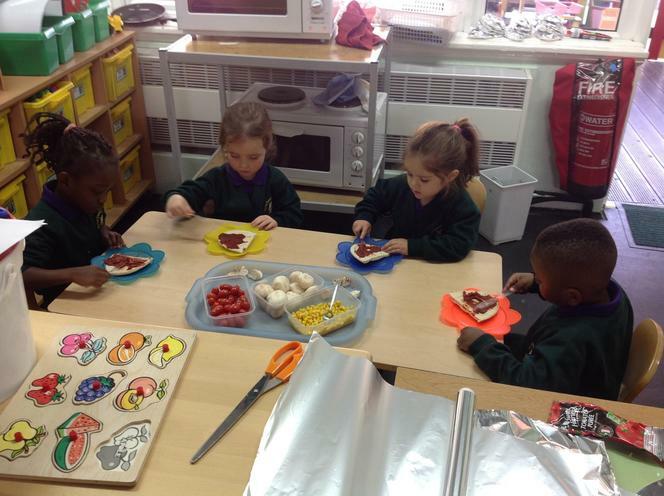 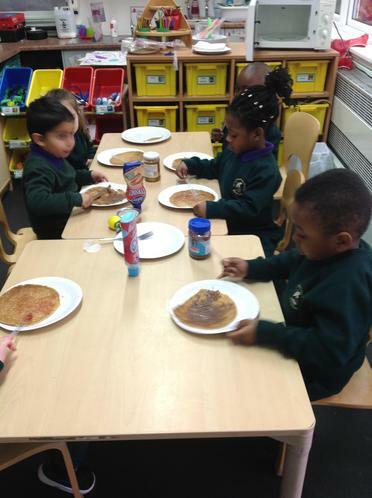 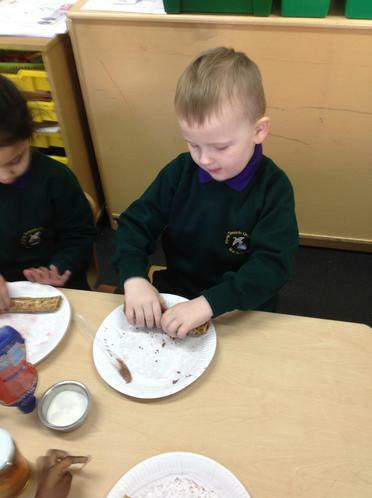 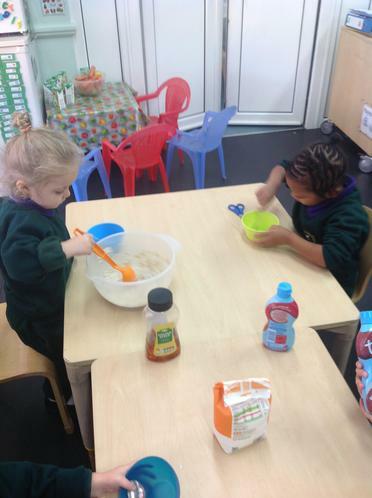 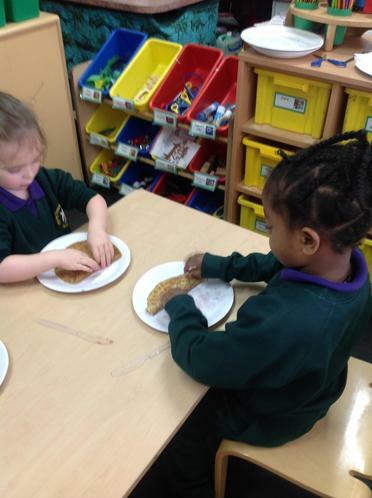 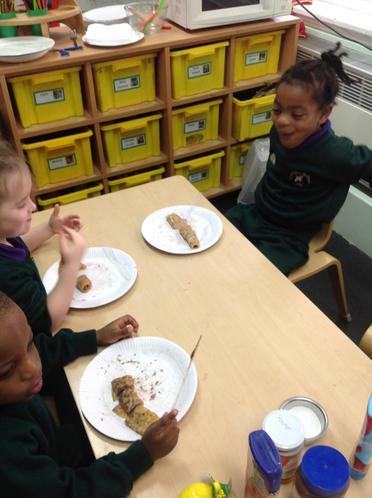 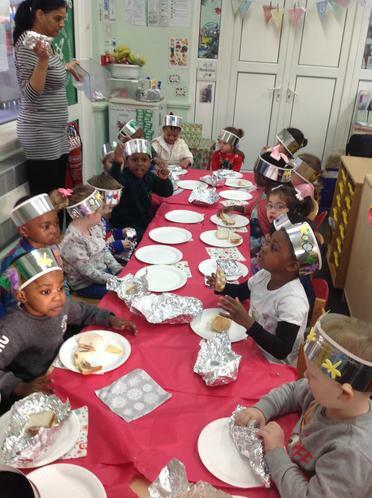 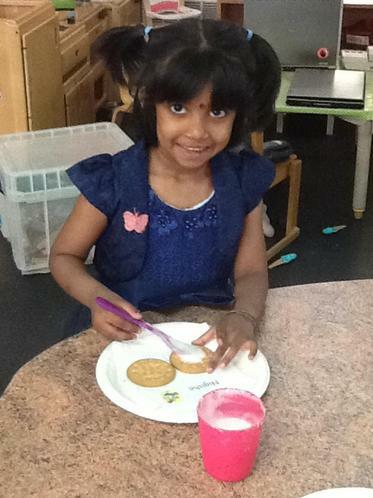 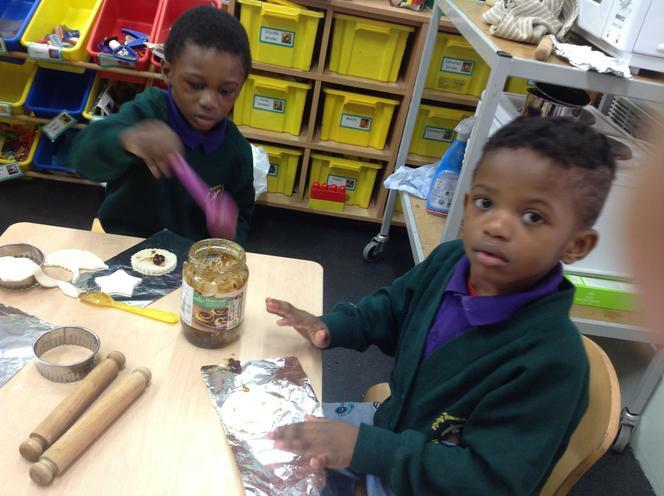 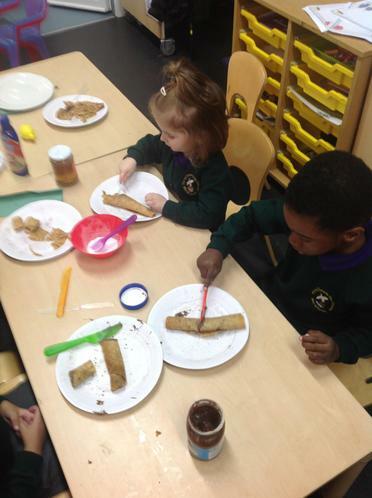 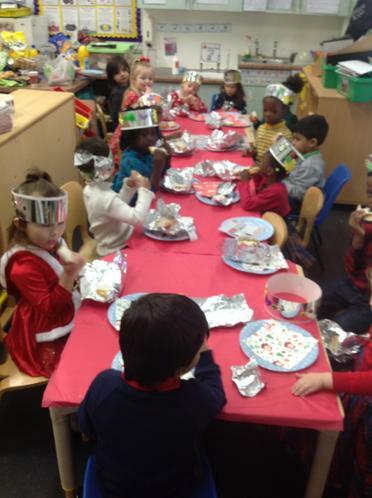 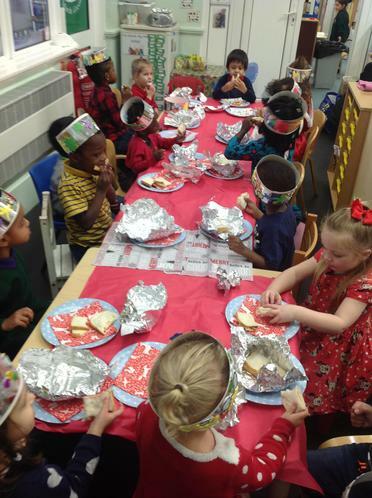 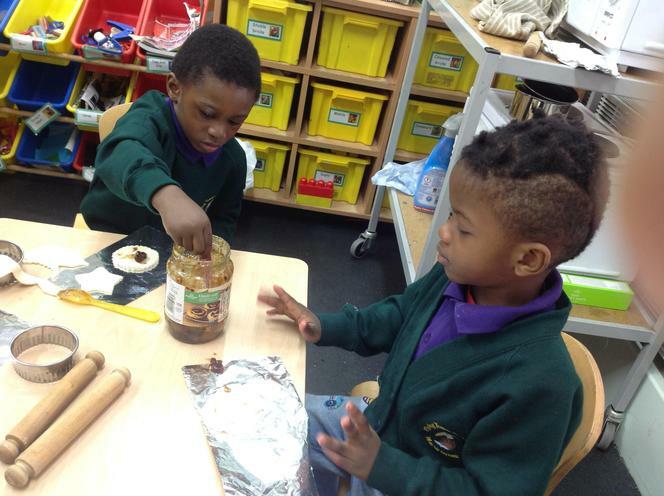 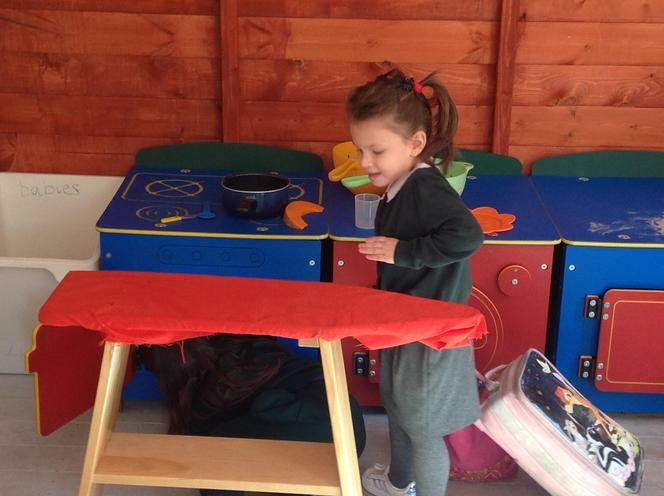 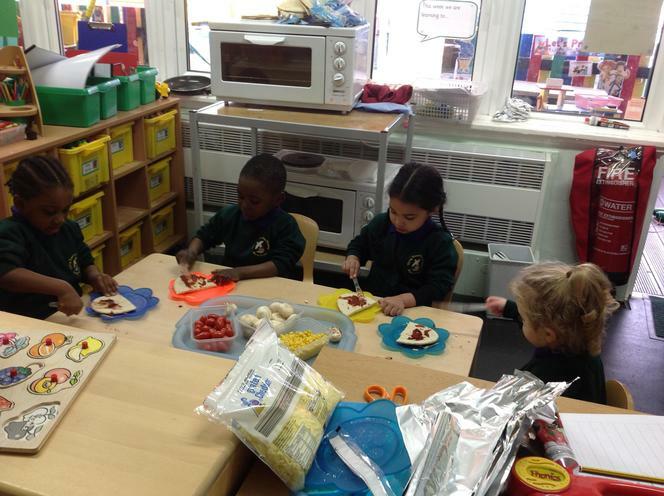 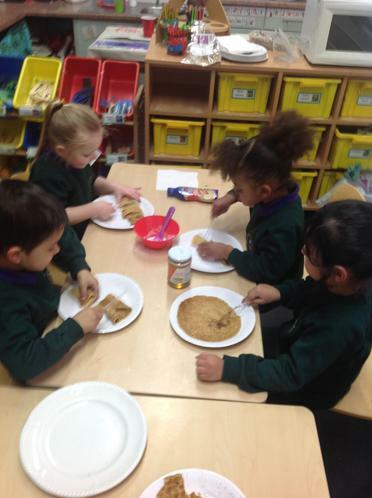 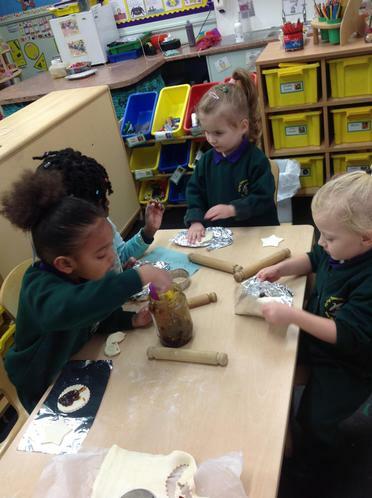 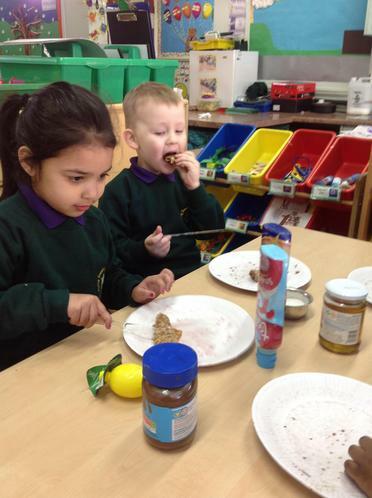 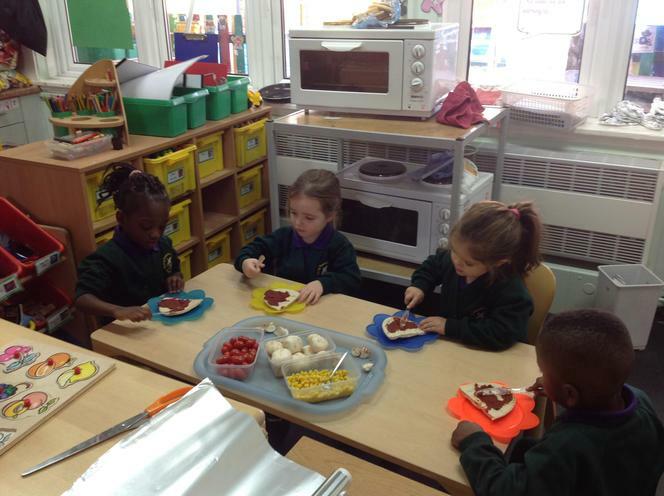 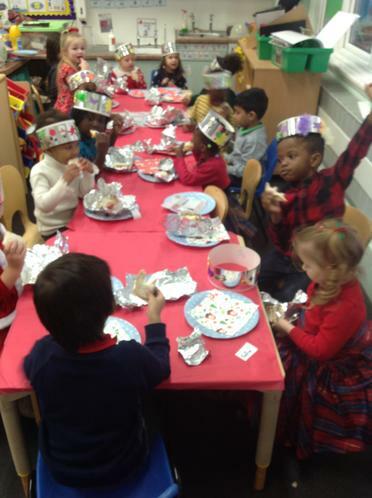 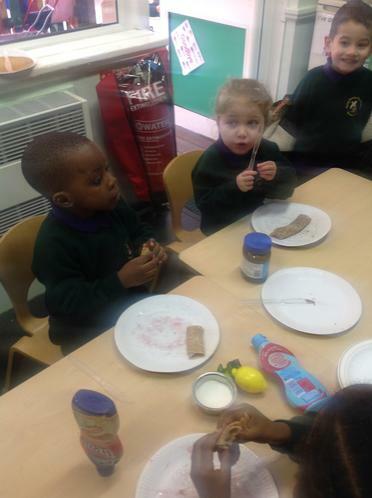 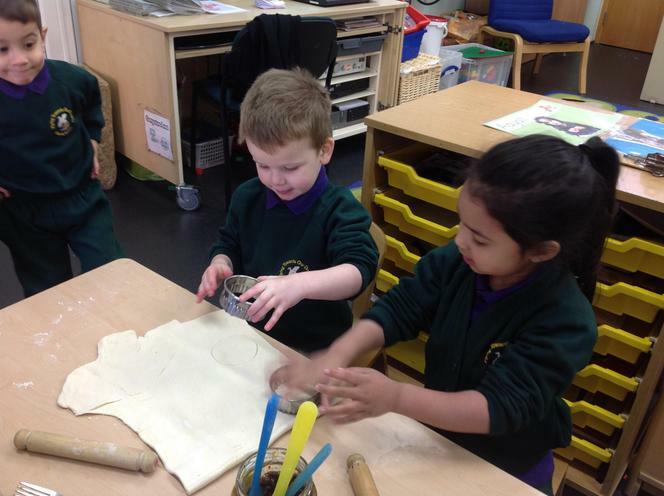 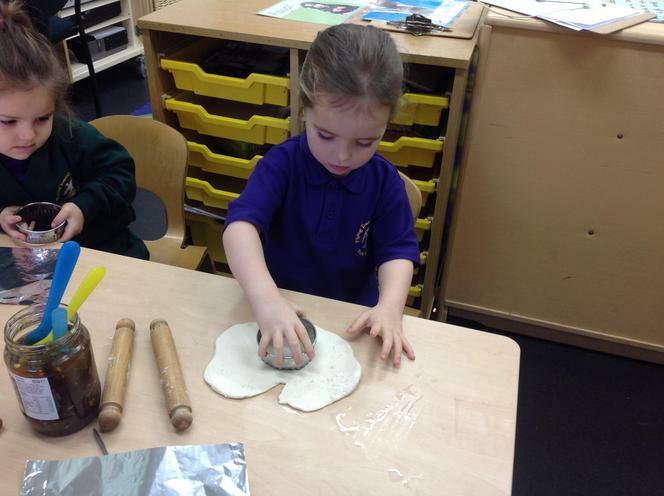 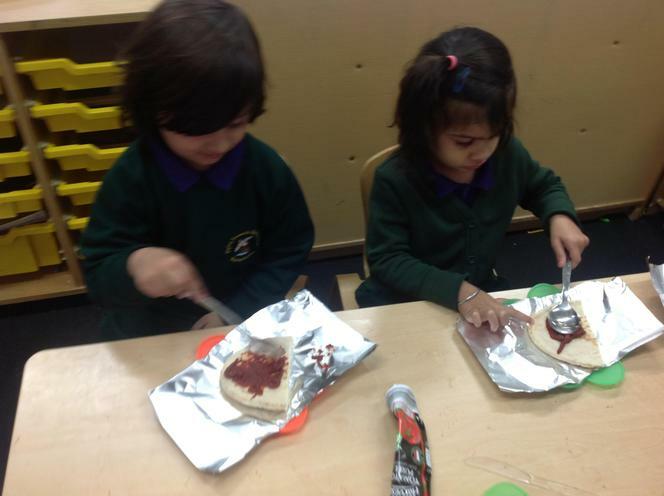 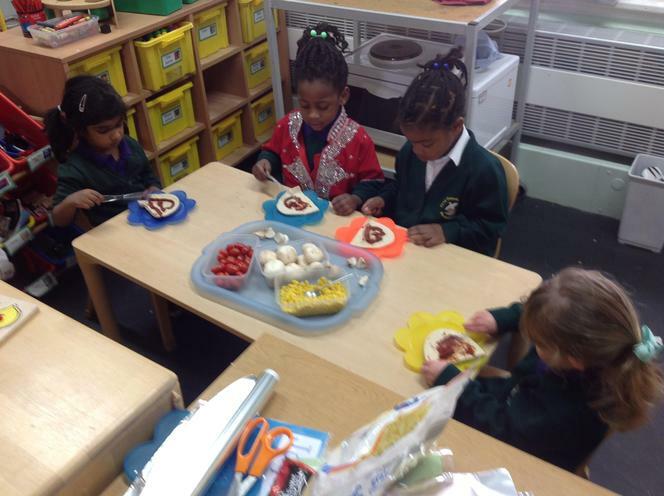 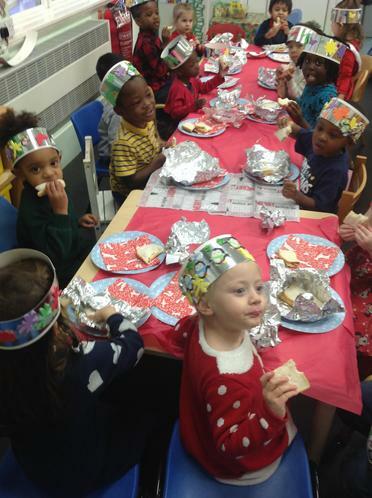 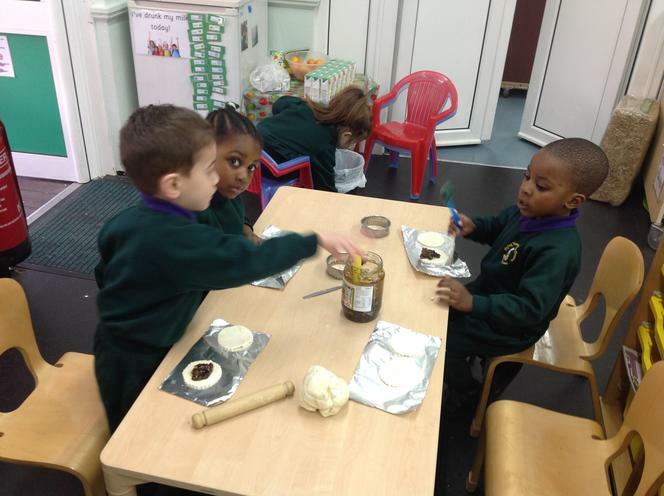 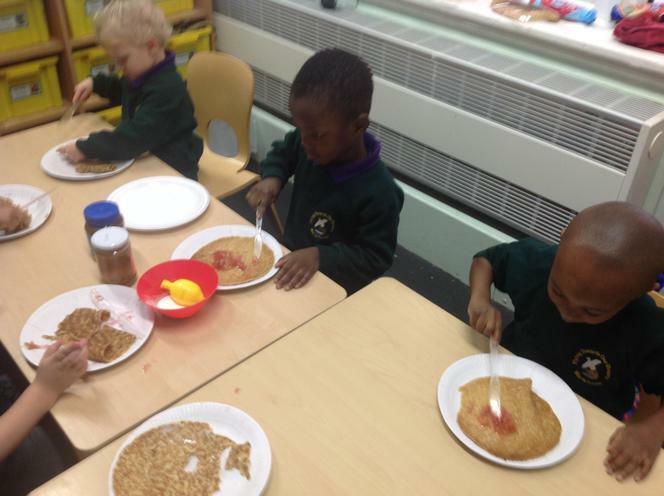 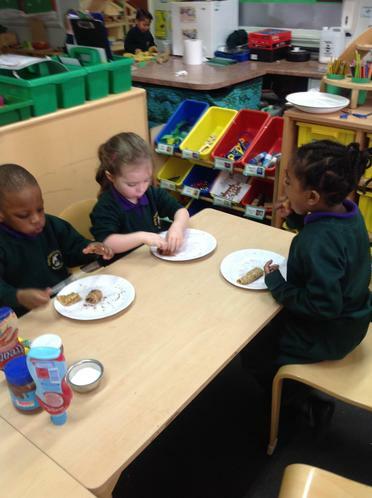 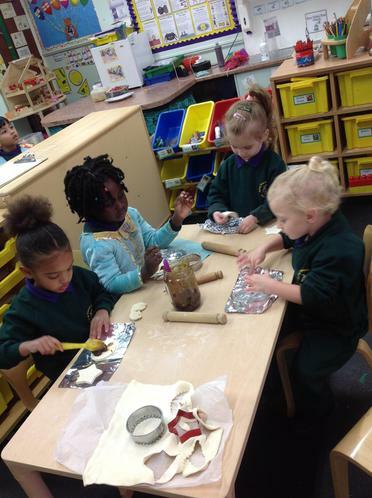 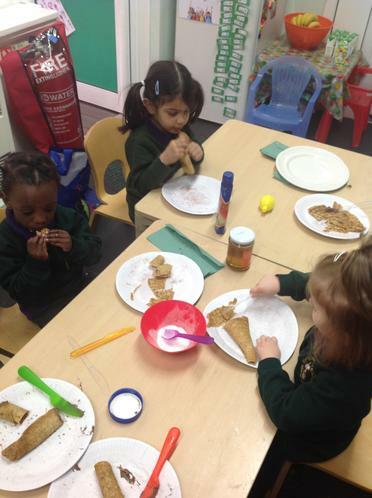 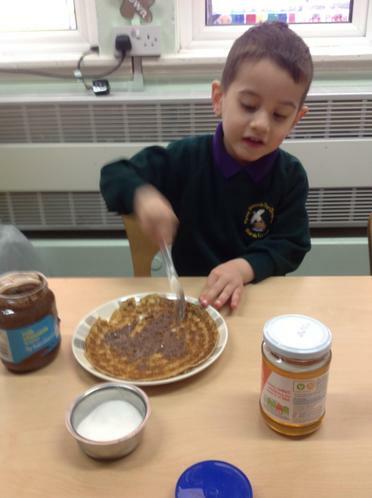 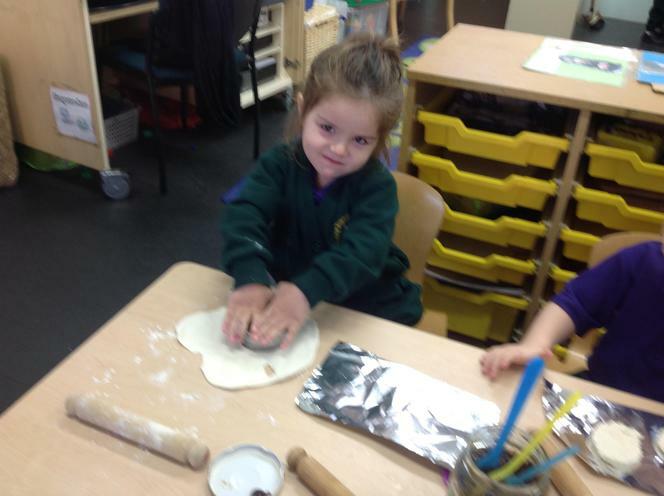 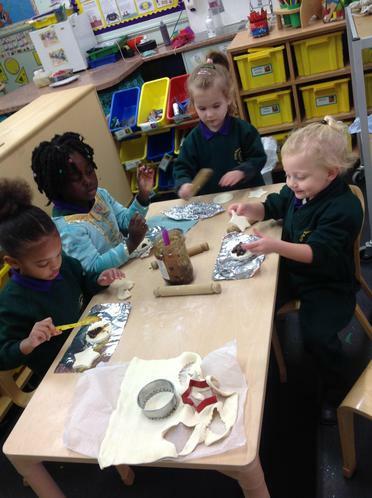 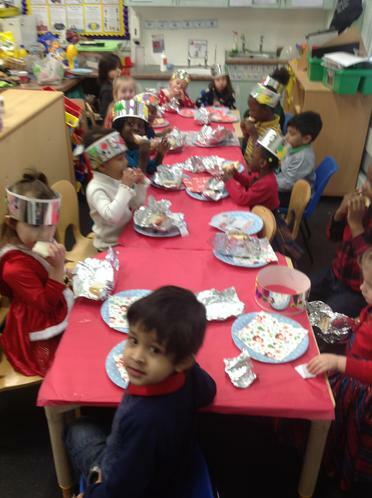 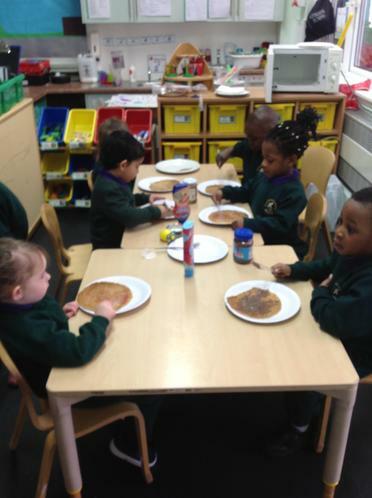 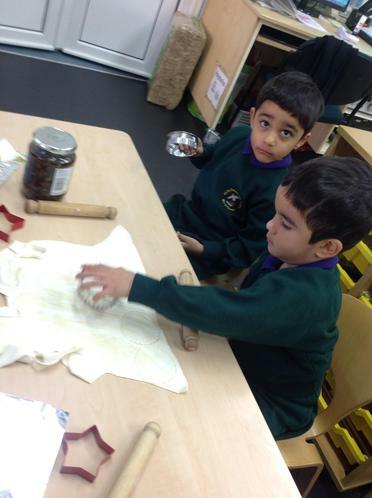 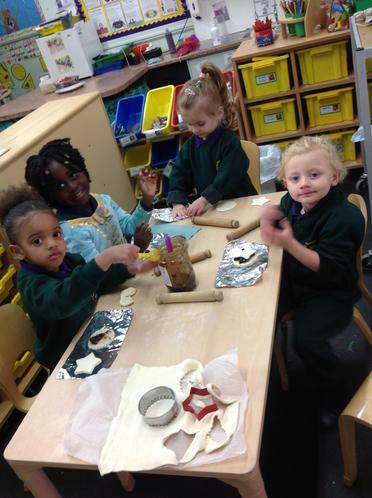 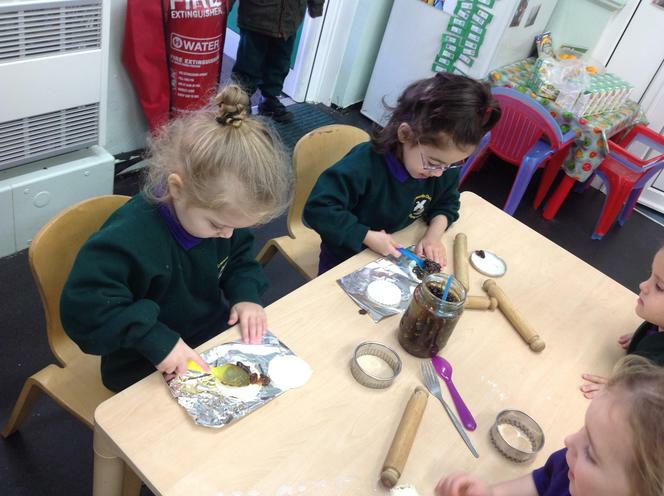 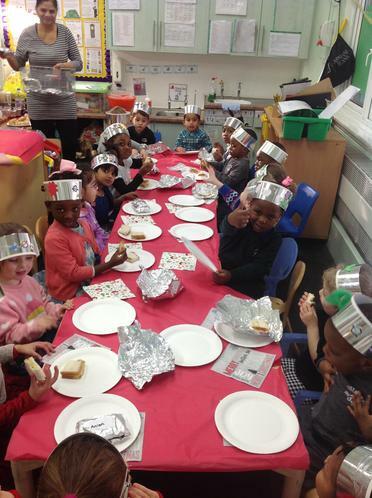 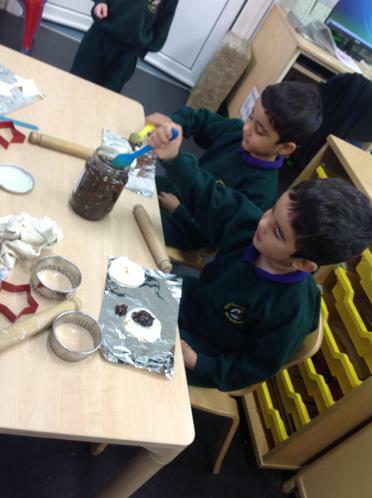 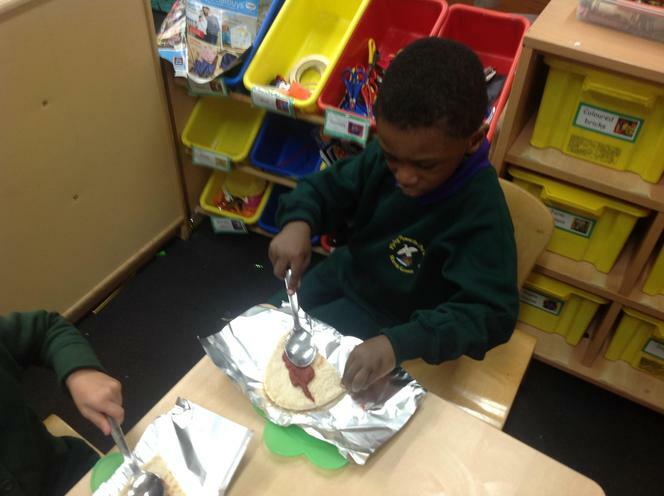 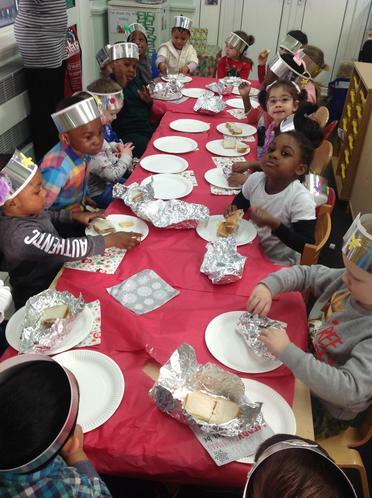 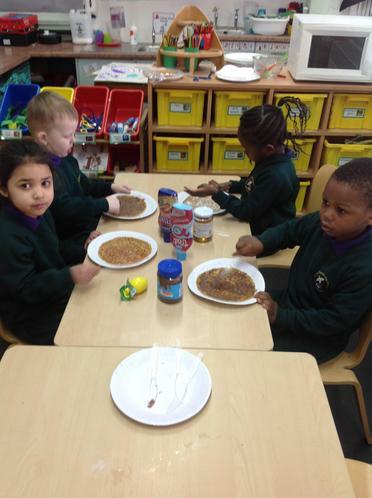 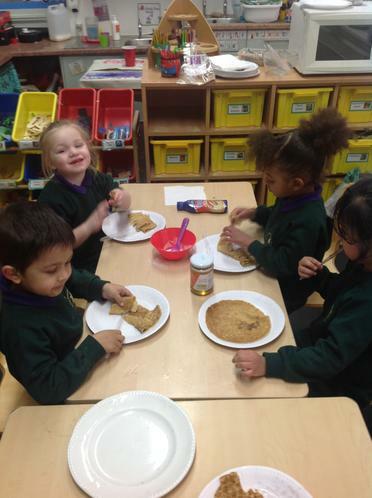 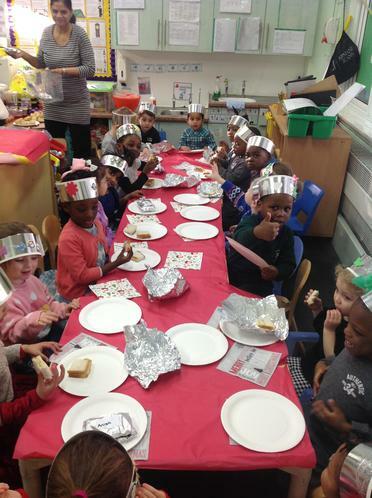 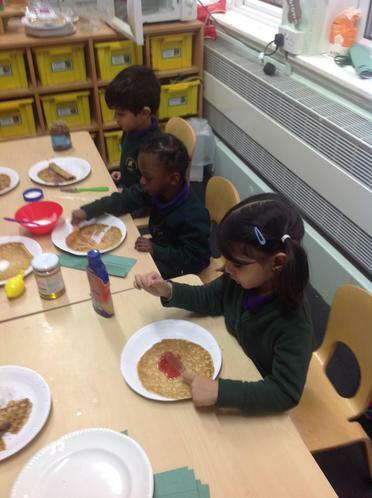 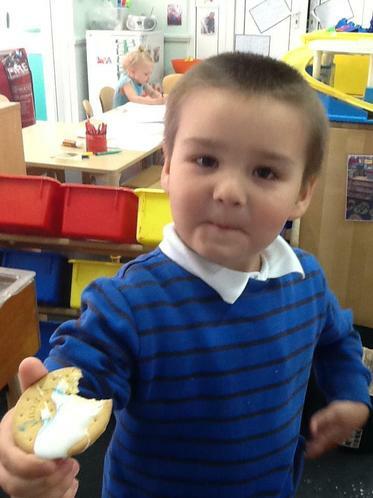 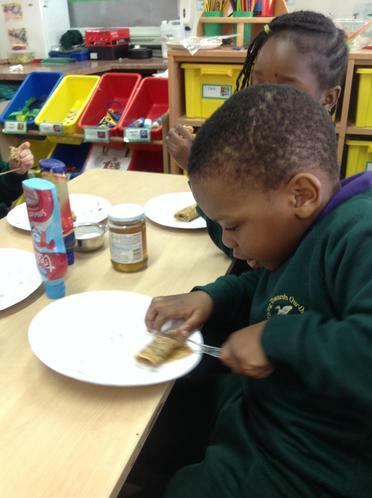 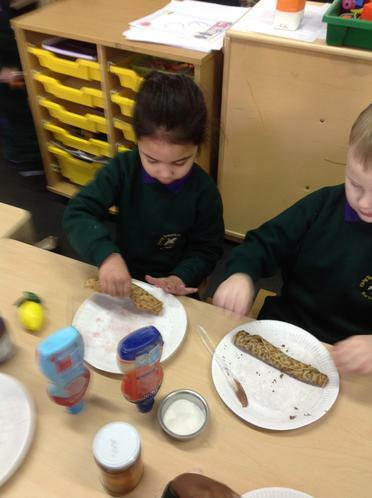 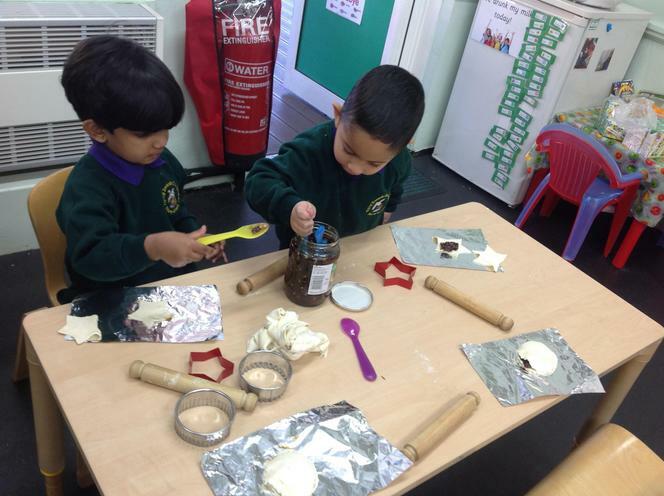 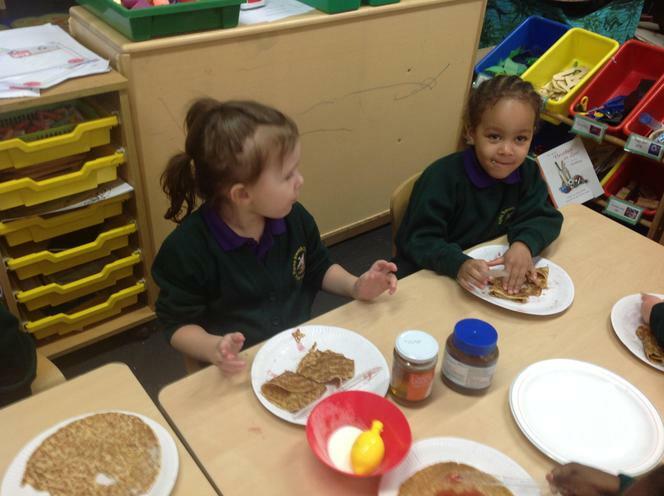 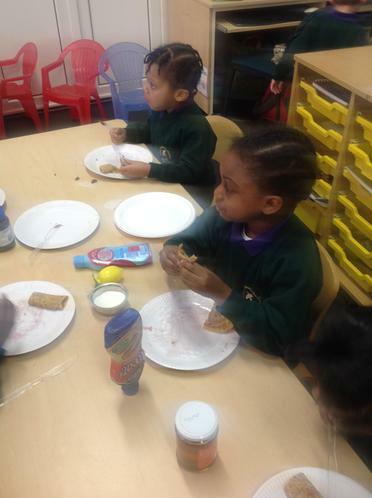 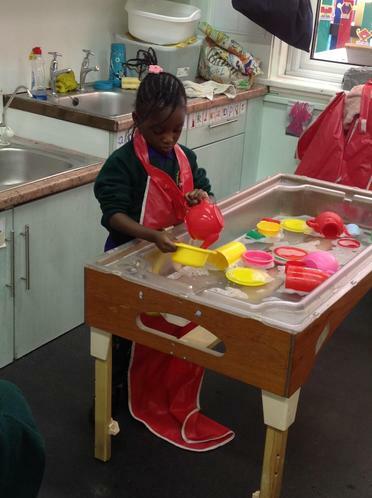 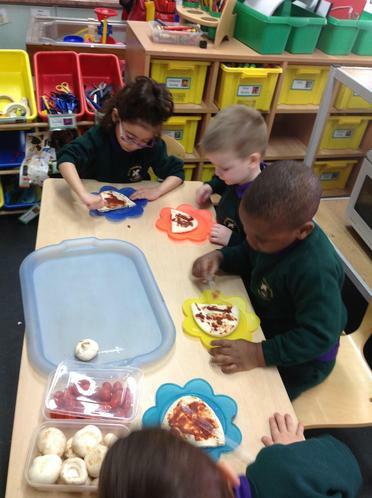 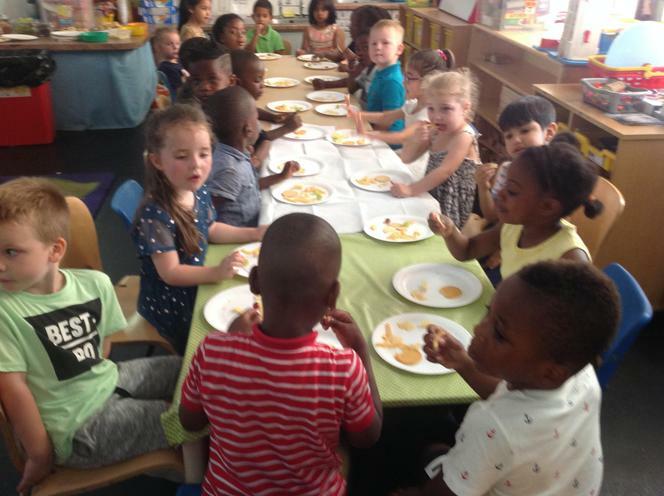 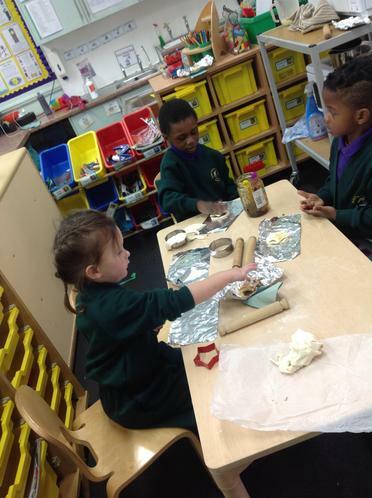 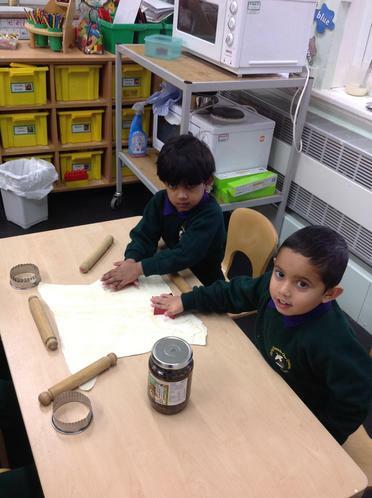 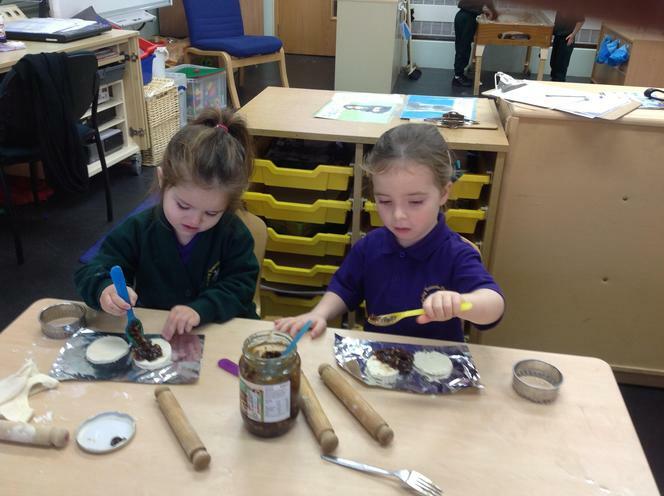 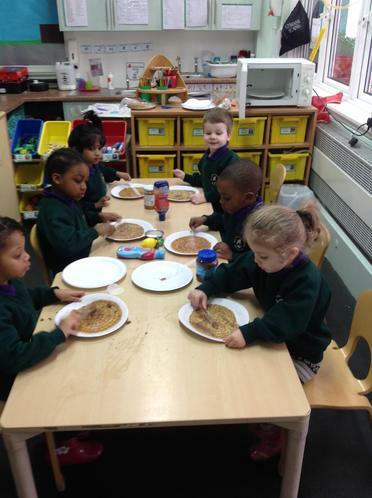 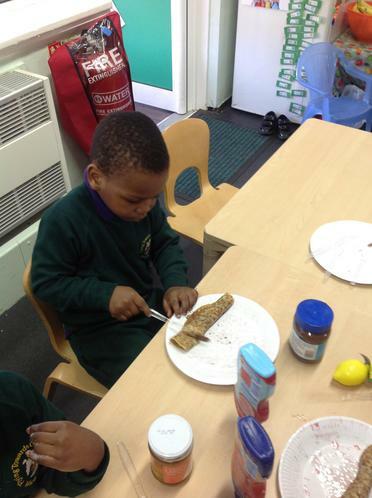 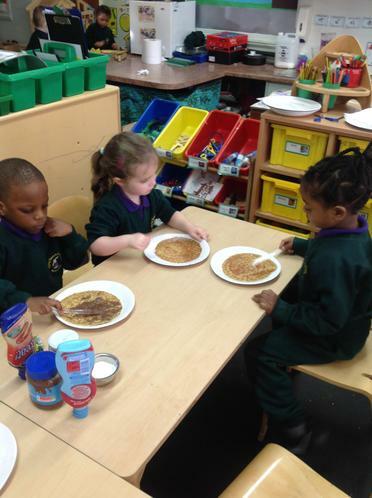 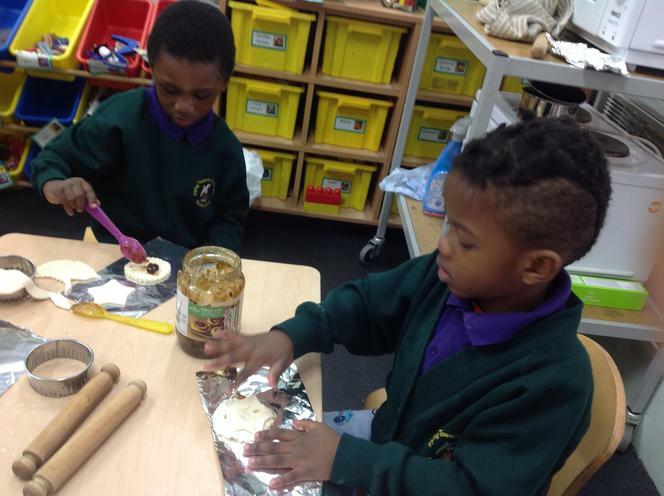 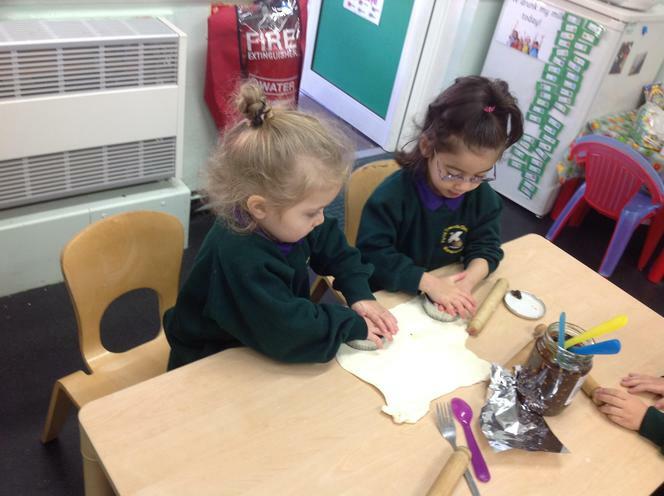 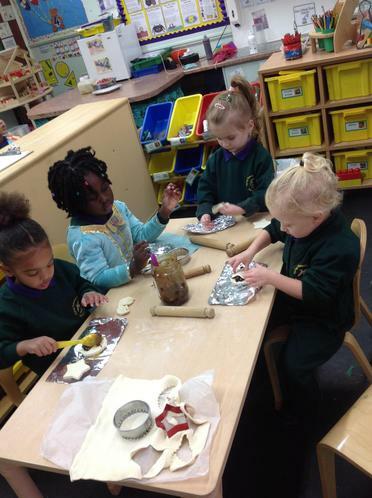 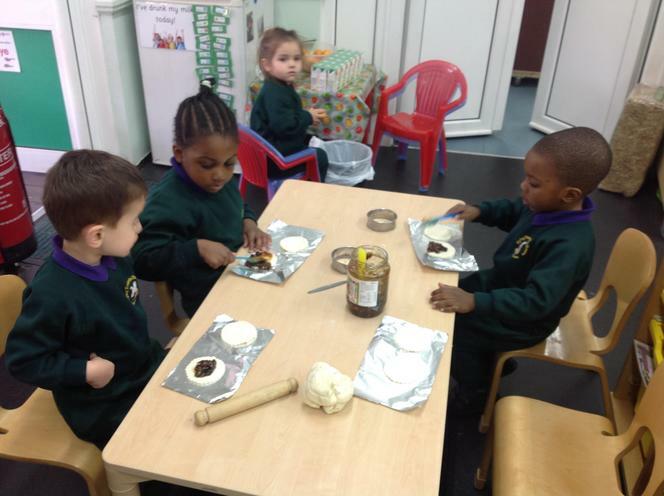 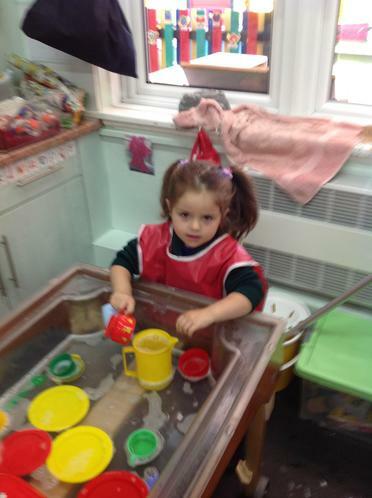 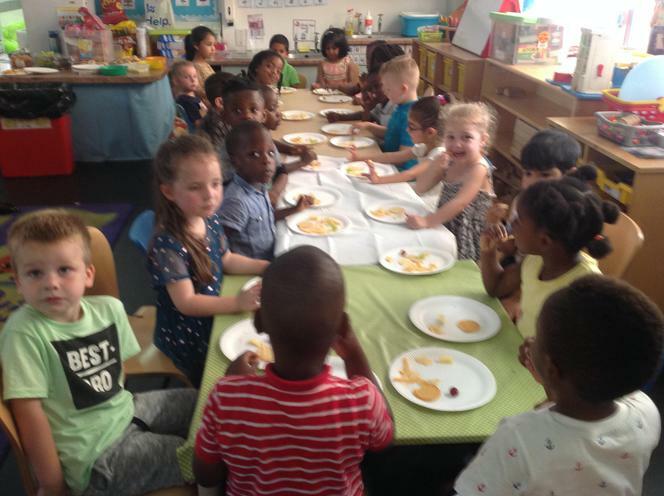 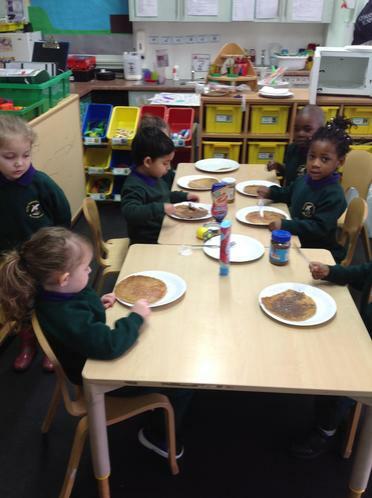 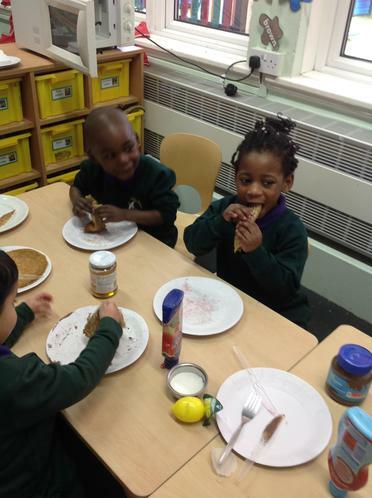 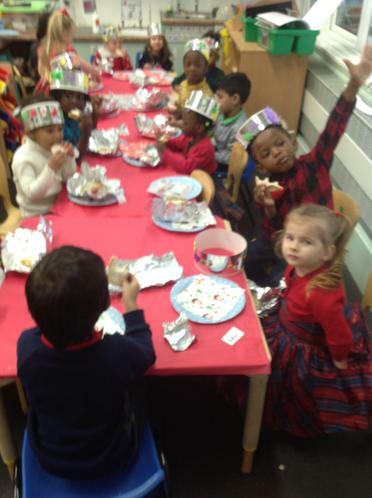 The children chose a topping for their pancake - honey, chocolate spread, strawberry sauce or sugar and honey. 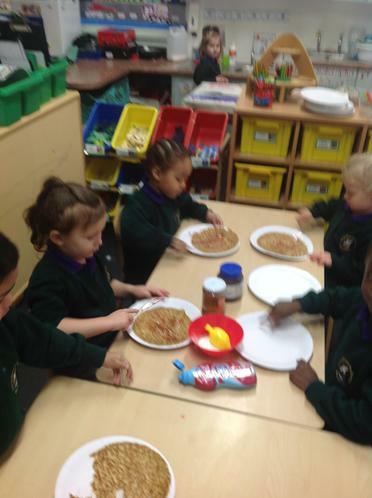 They spread the topping, rolled the pancake, cut it and ate it. 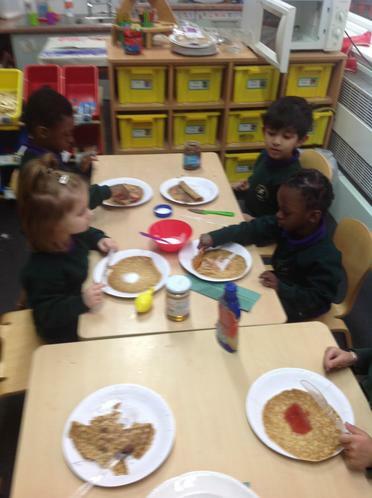 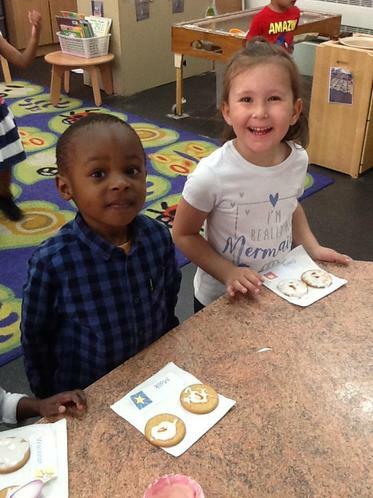 They thought the pancakes were delicious! 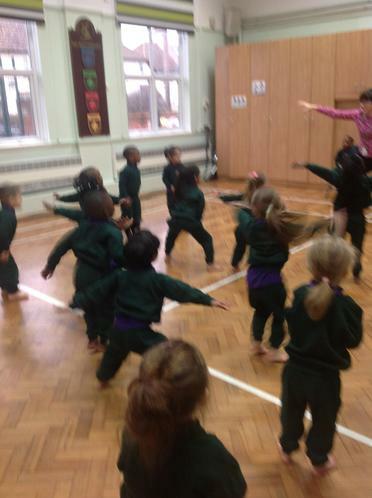 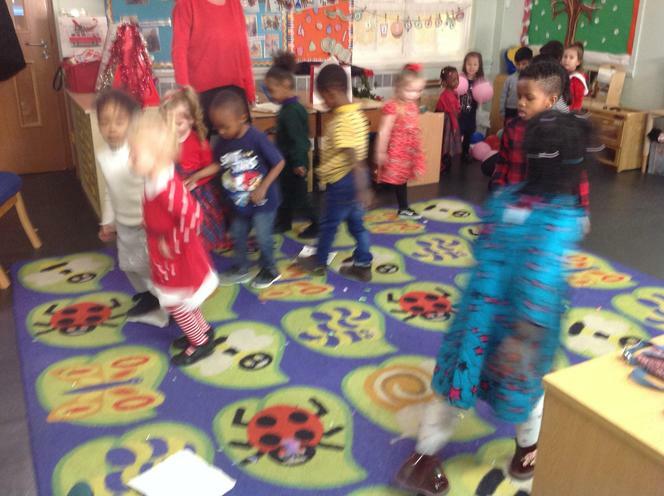 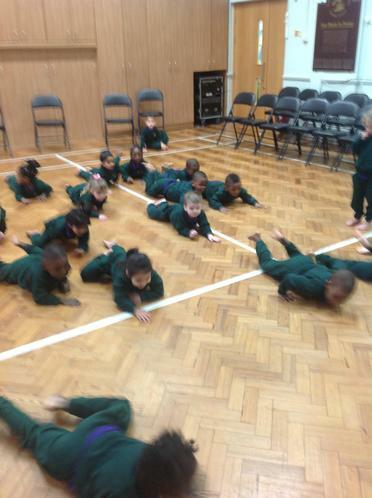 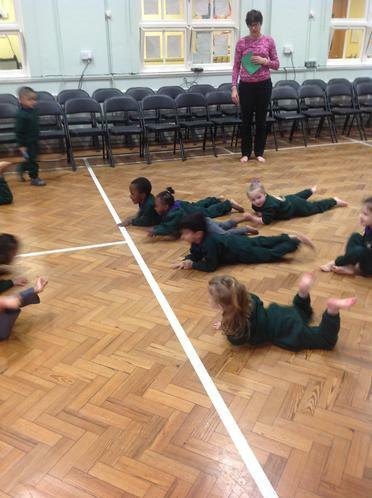 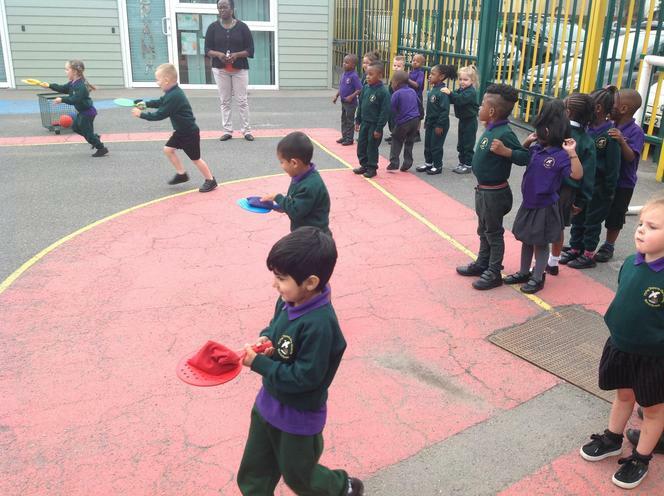 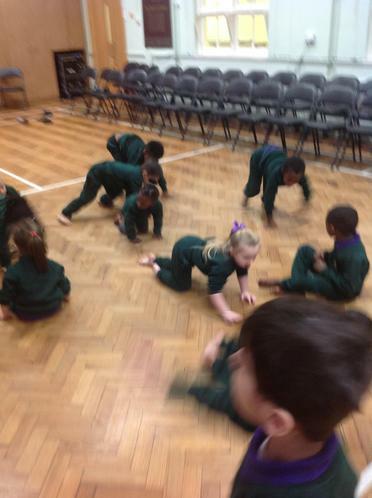 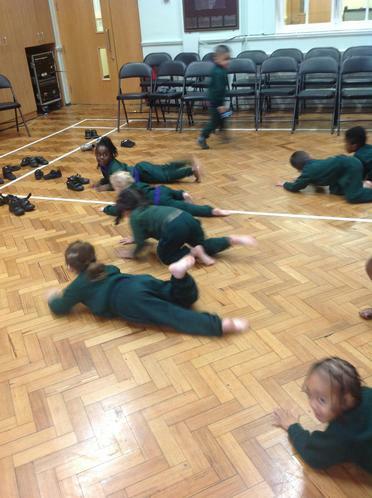 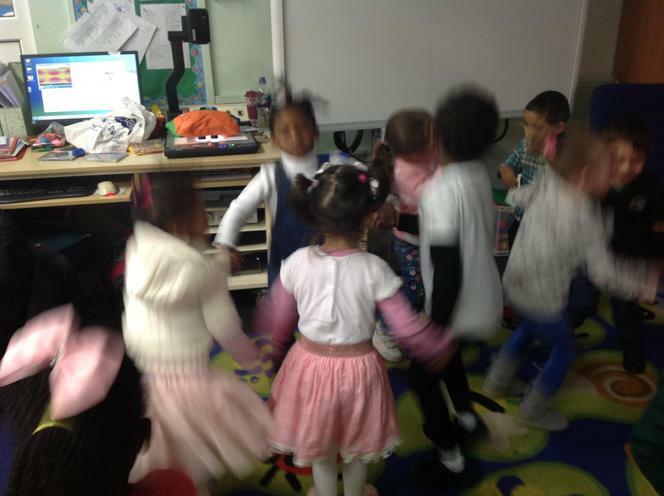 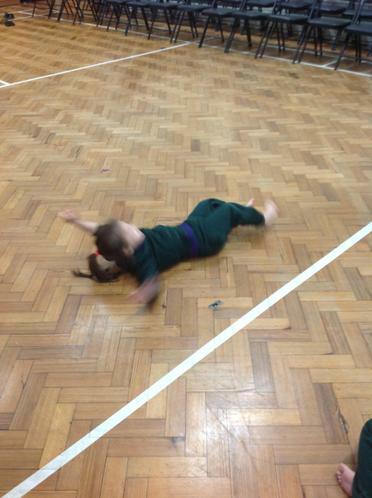 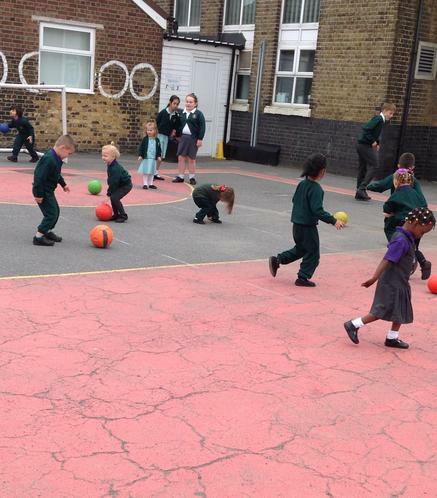 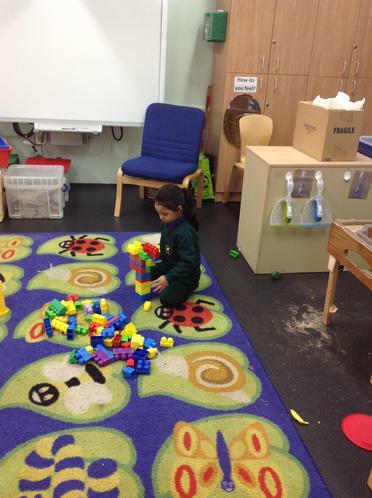 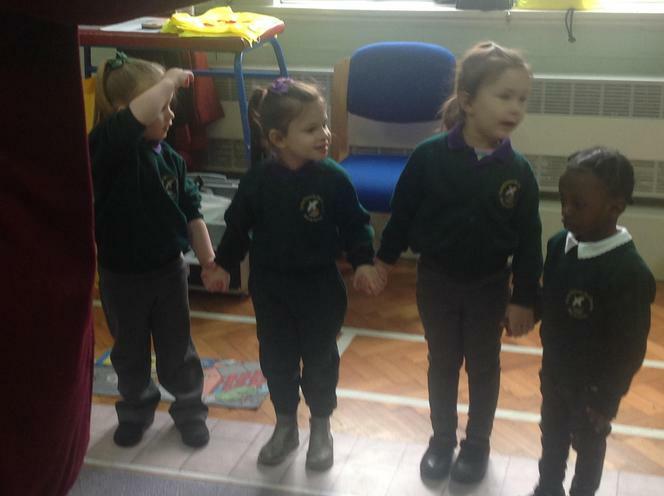 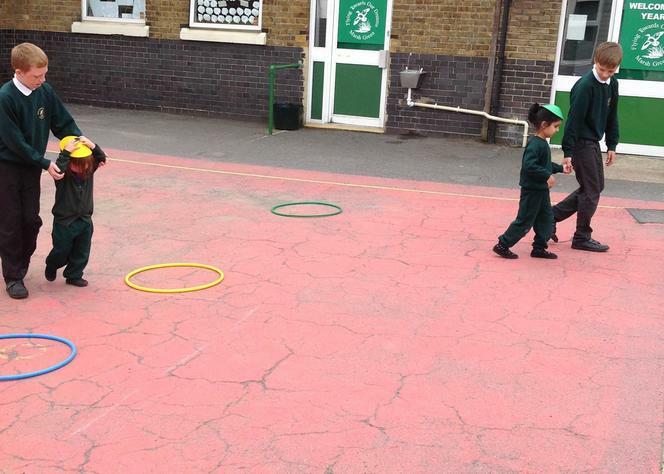 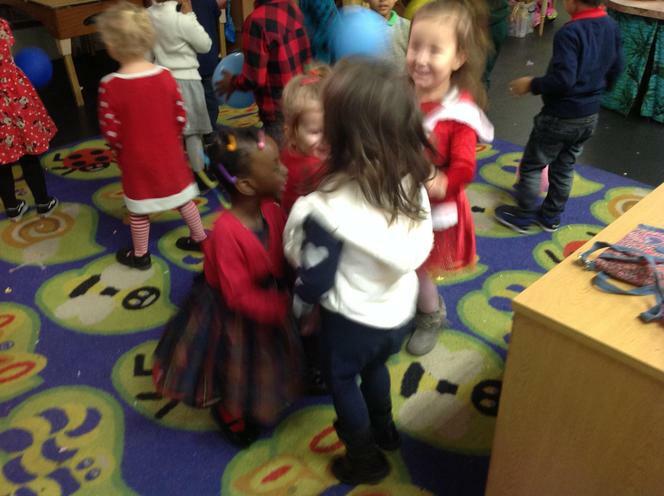 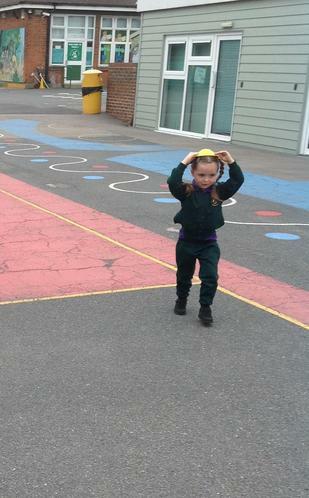 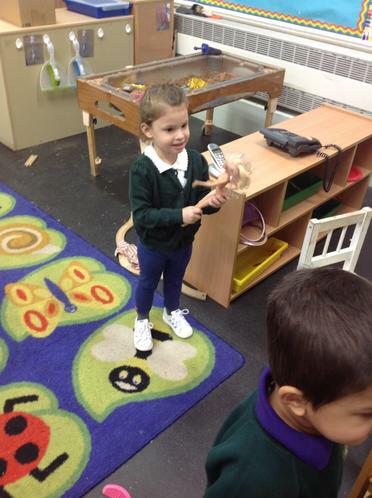 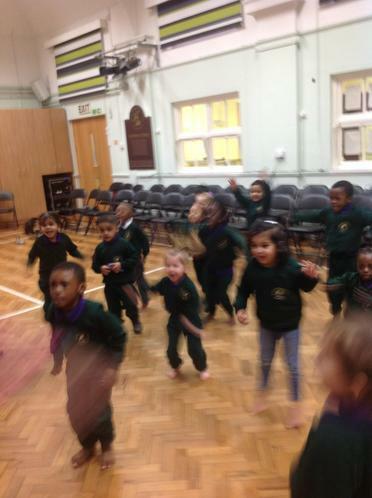 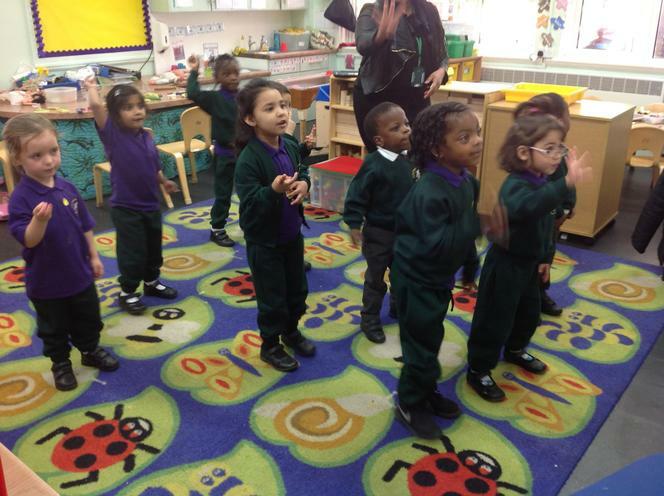 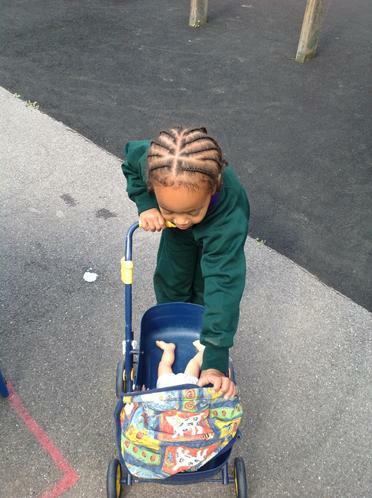 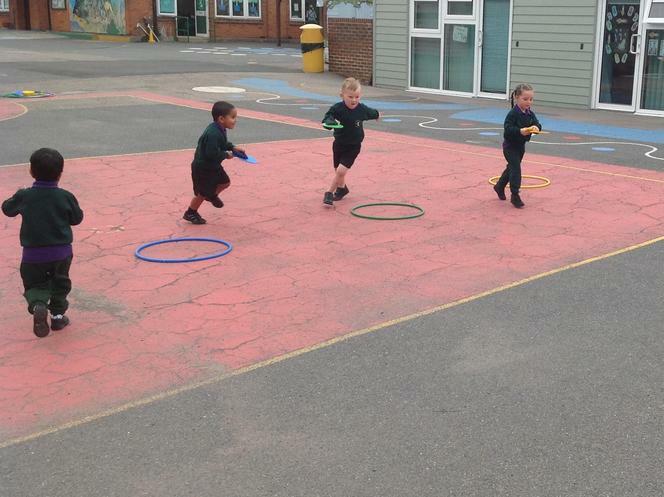 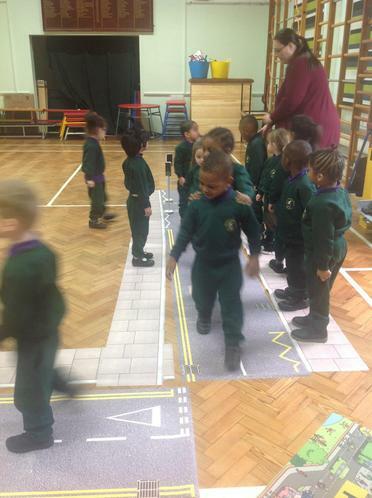 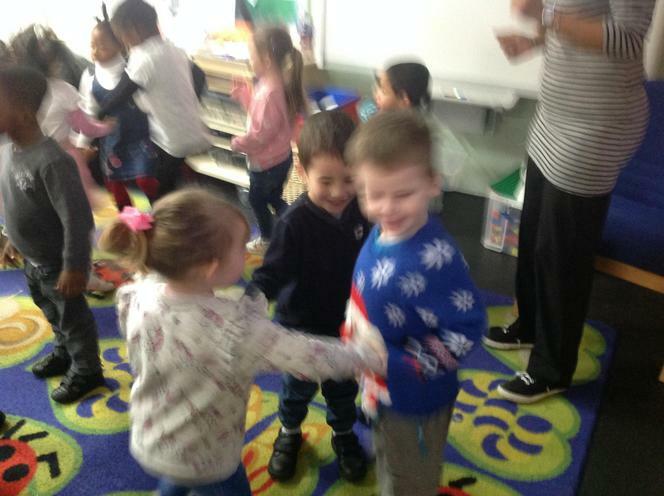 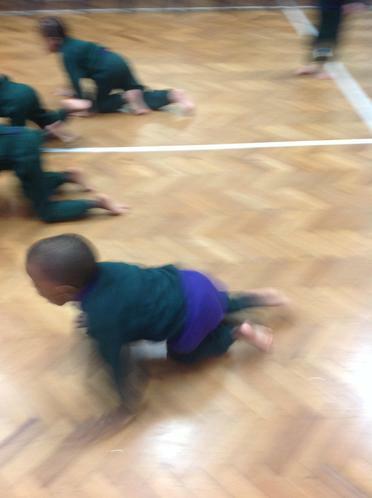 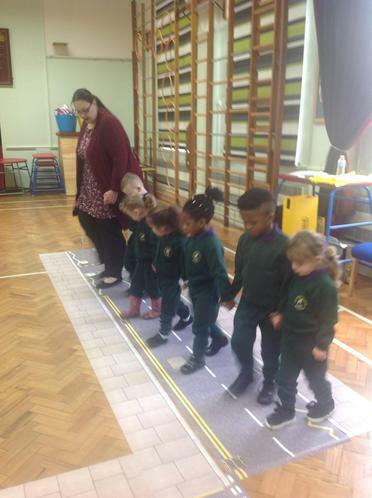 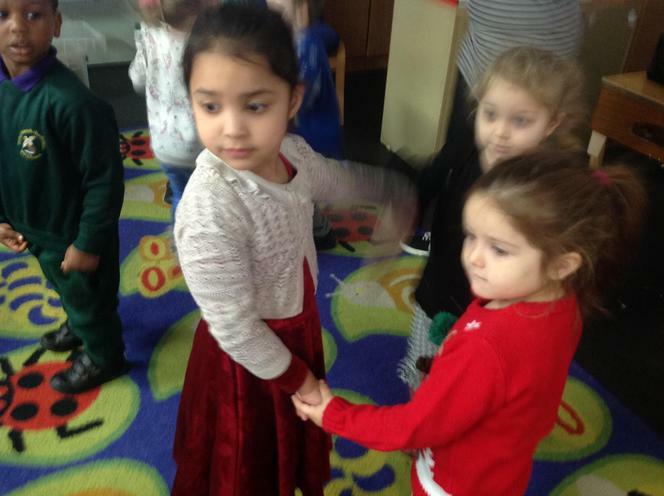 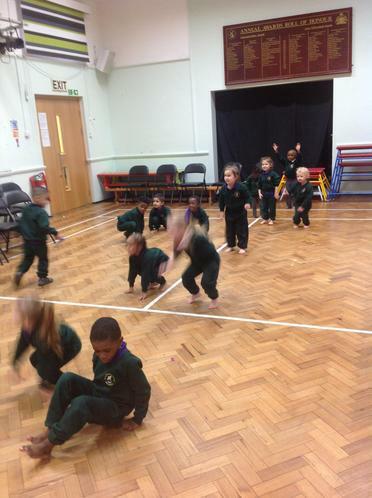 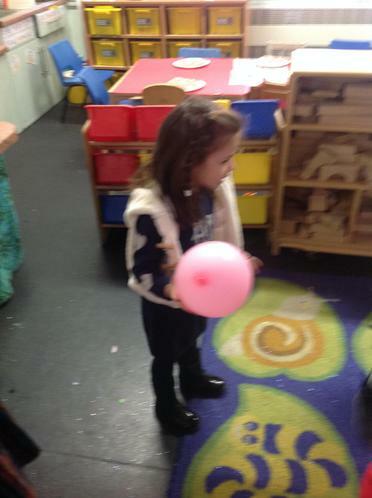 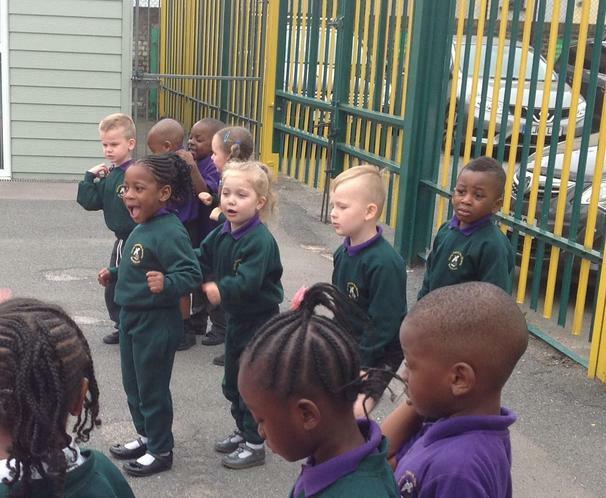 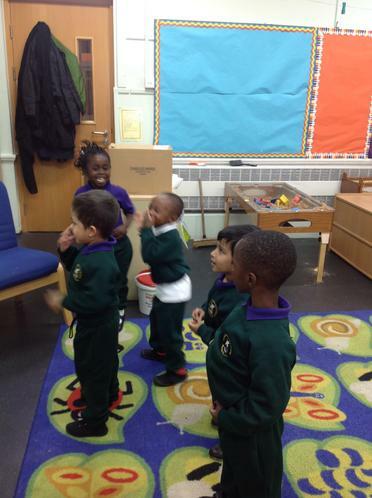 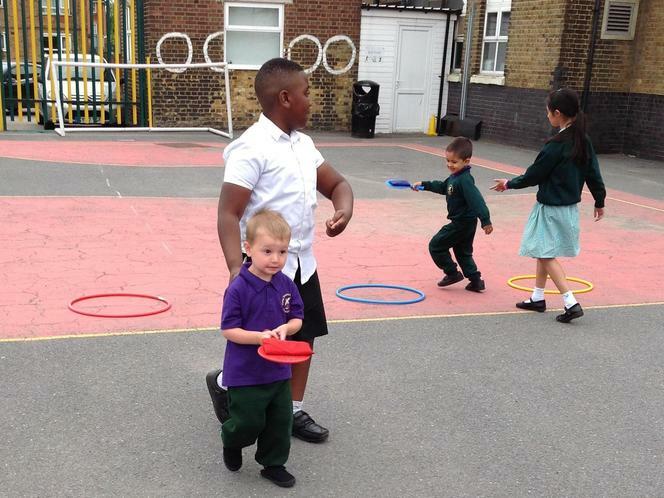 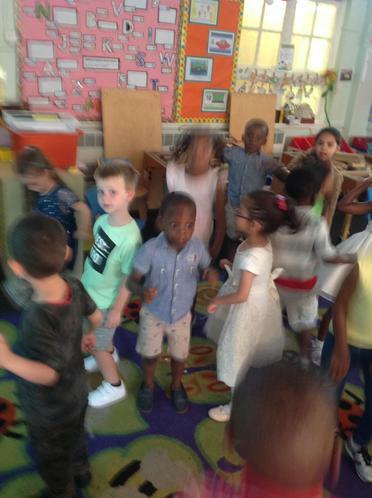 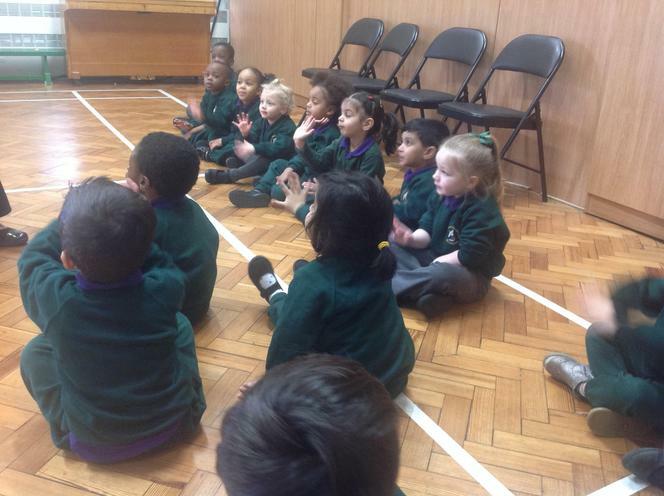 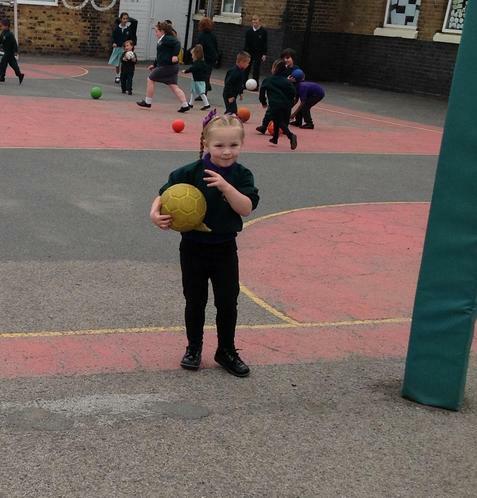 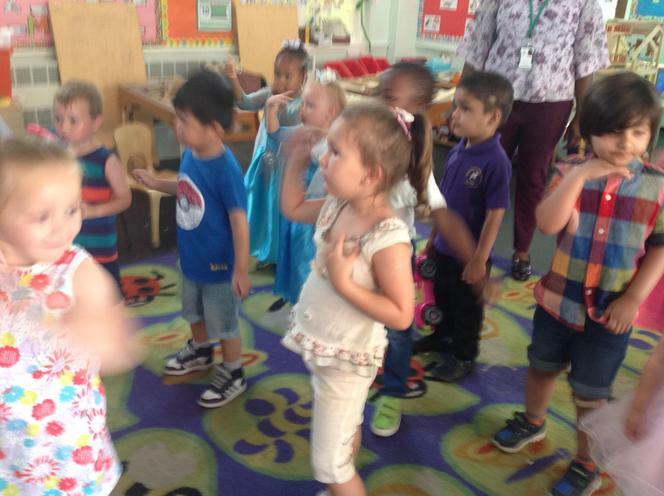 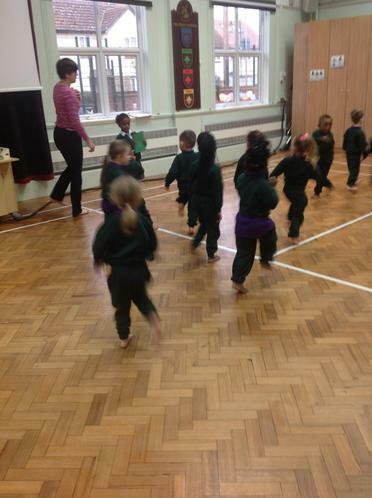 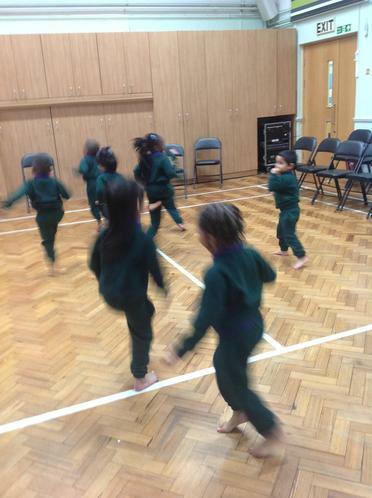 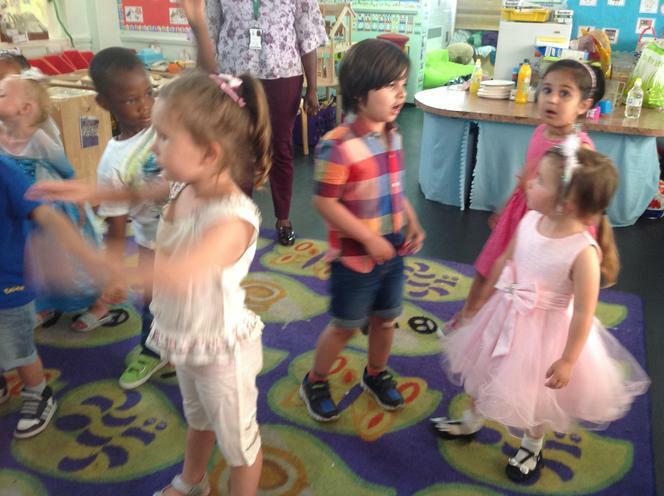 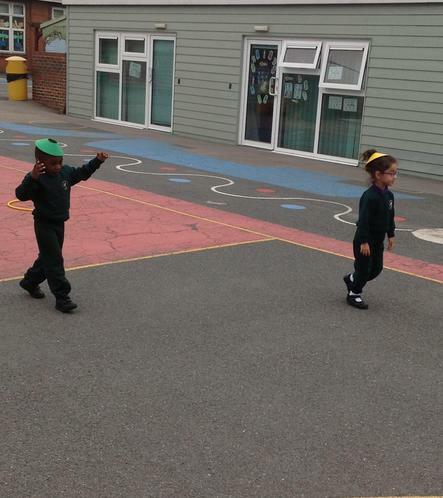 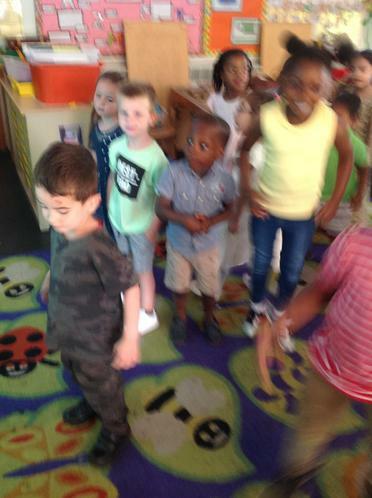 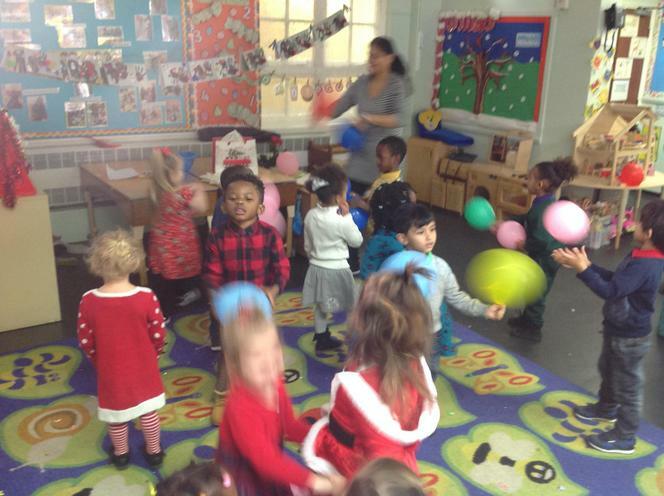 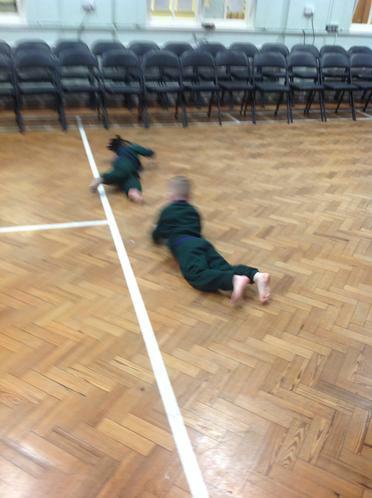 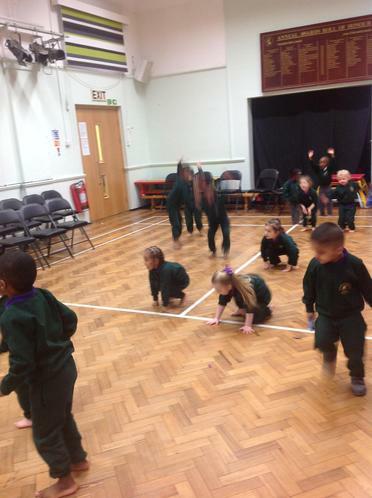 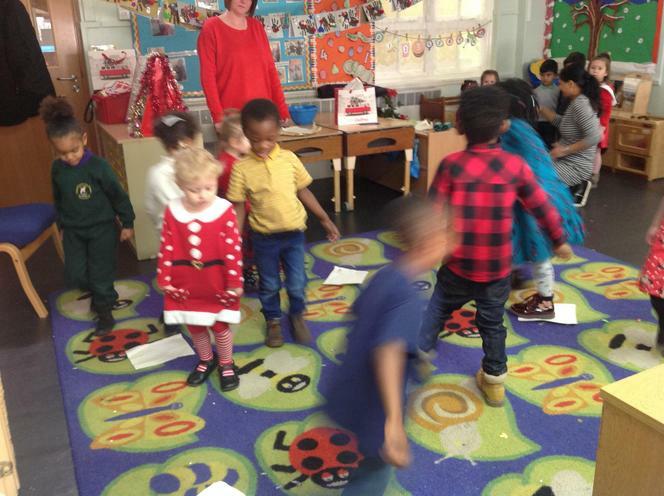 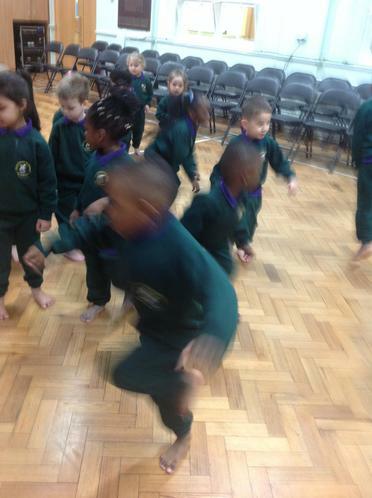 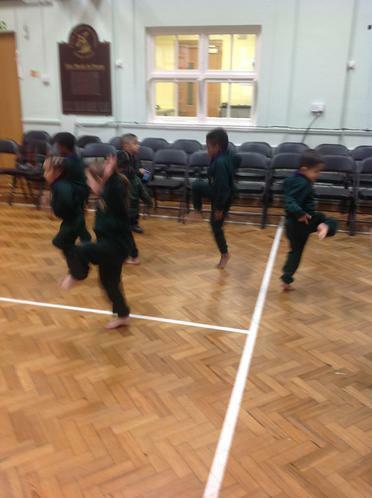 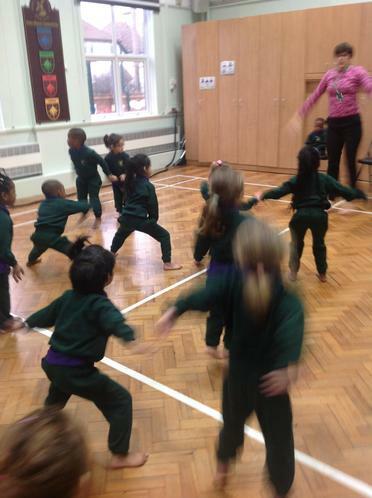 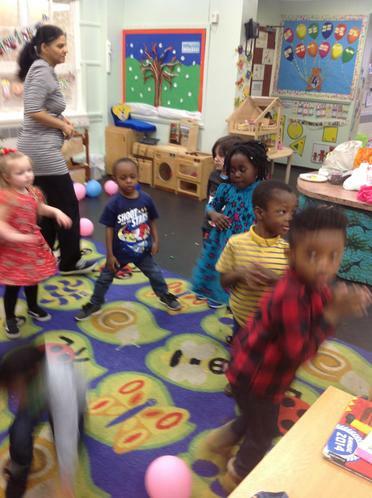 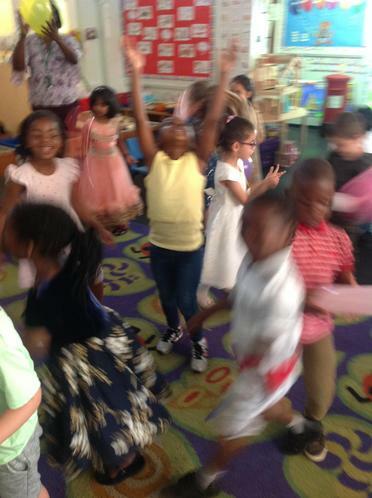 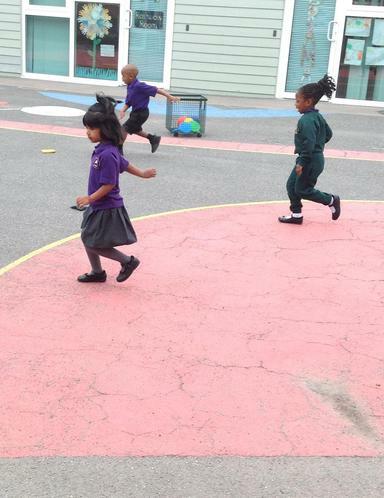 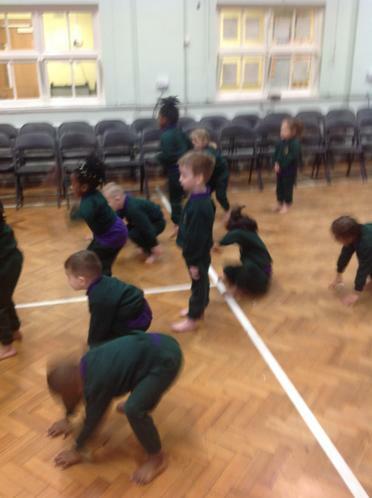 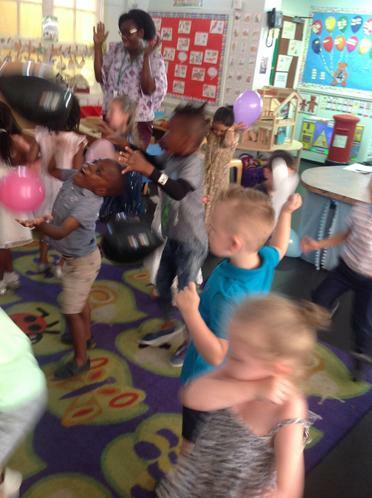 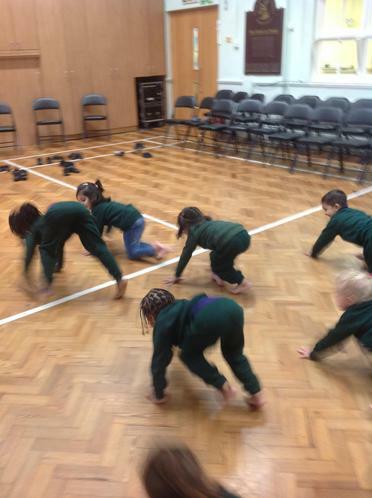 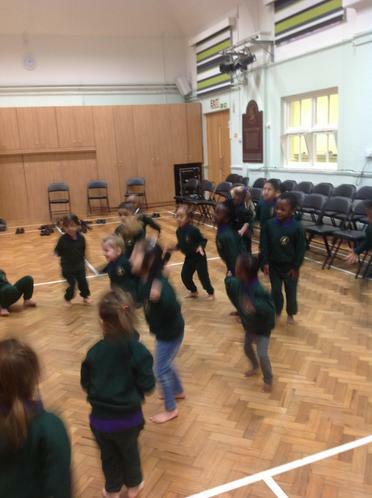 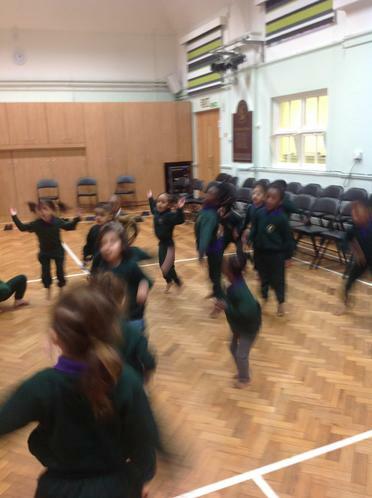 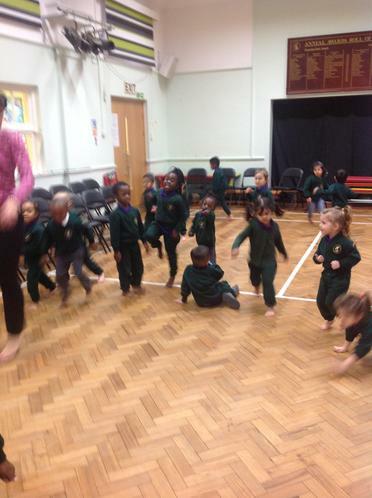 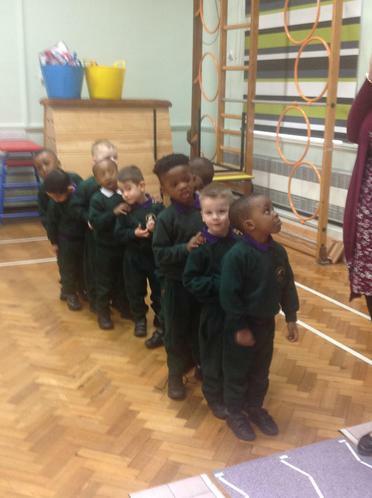 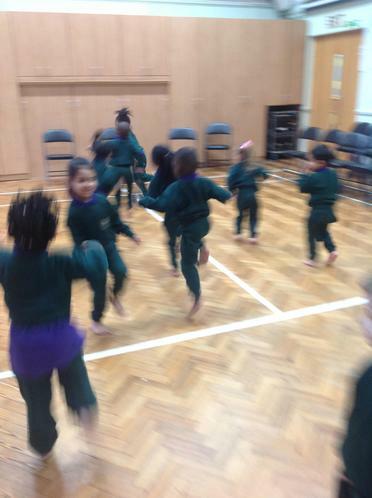 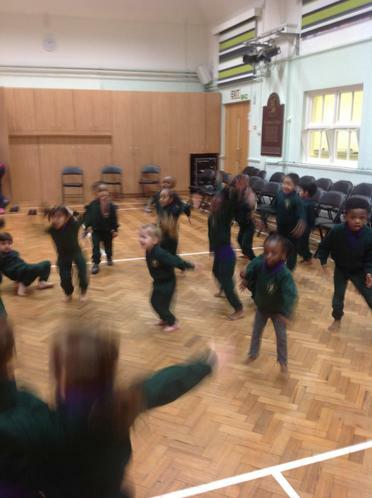 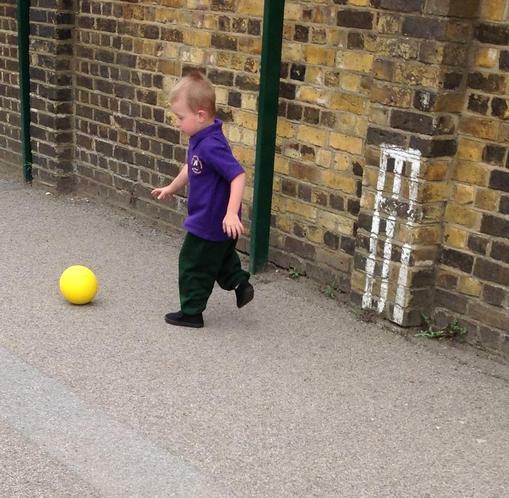 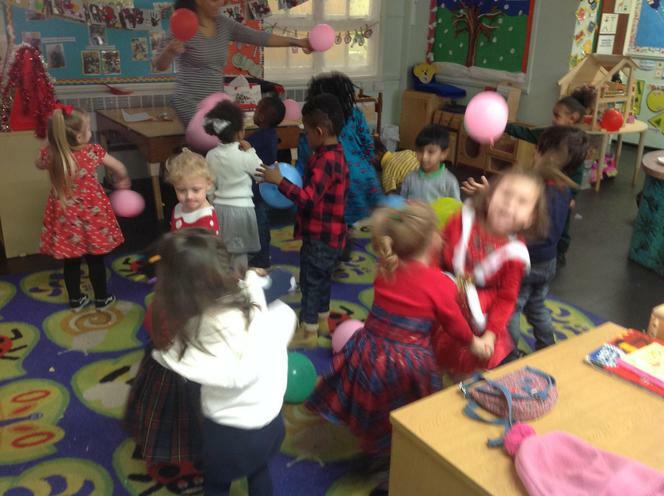 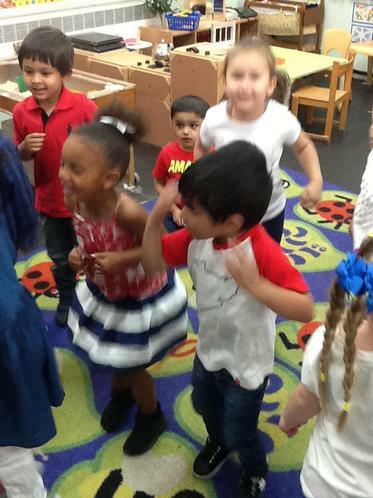 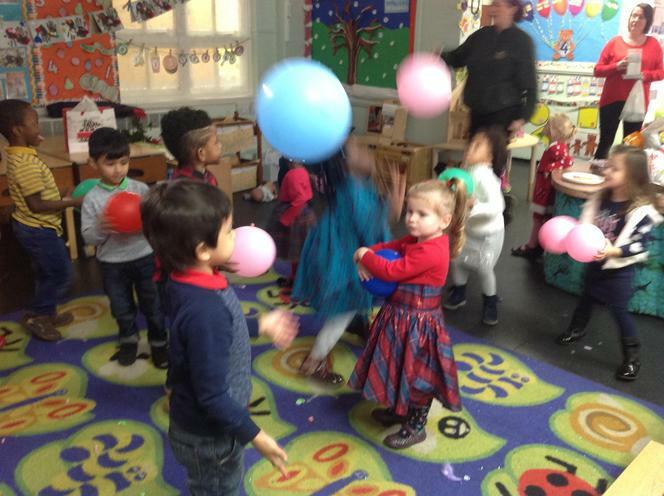 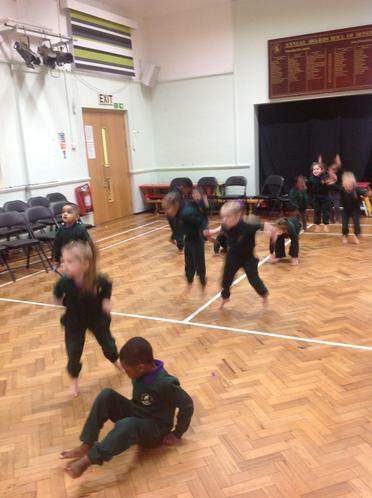 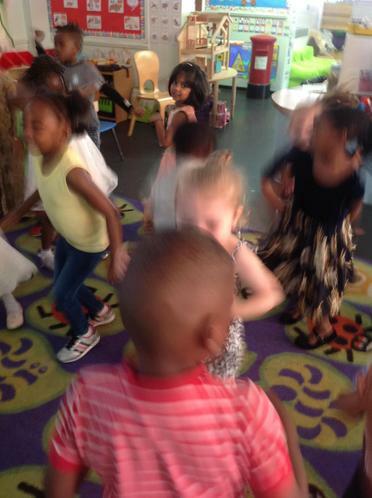 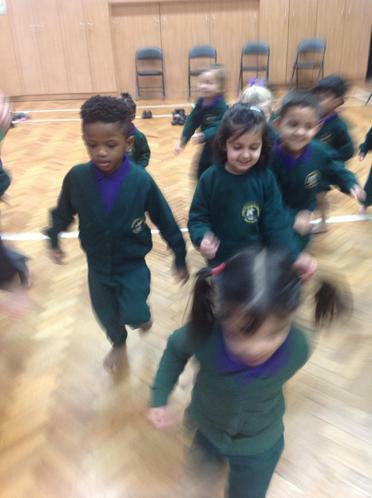 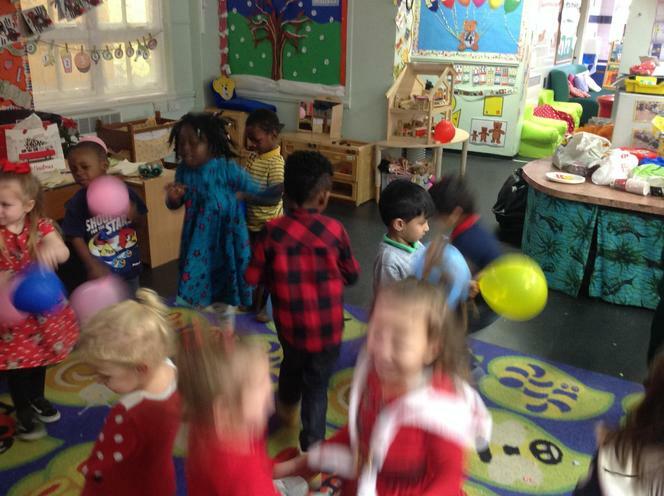 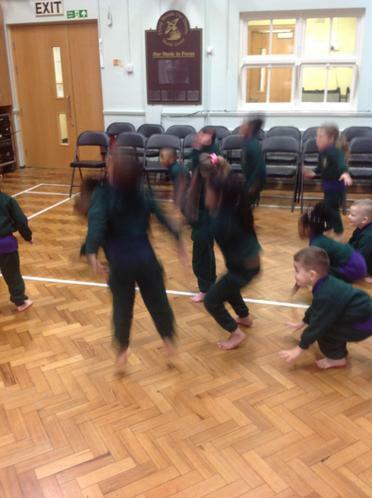 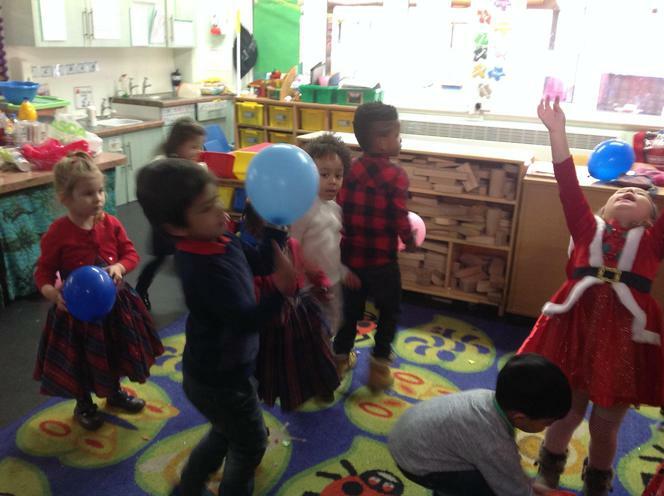 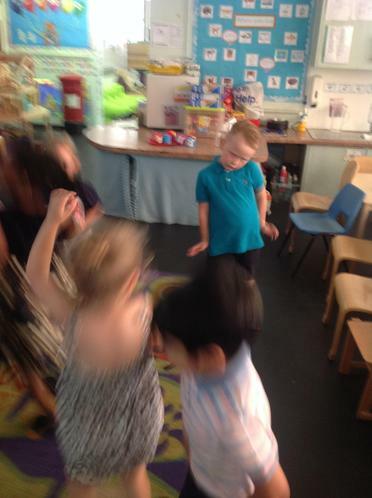 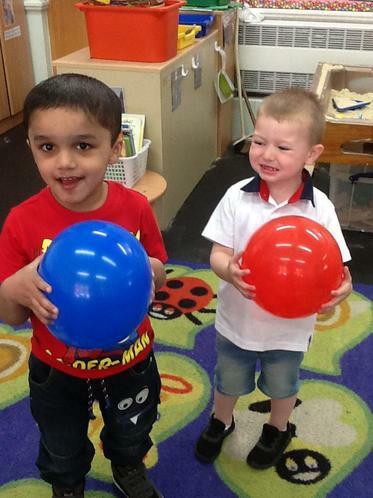 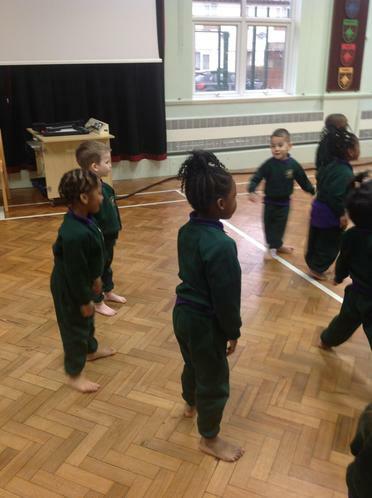 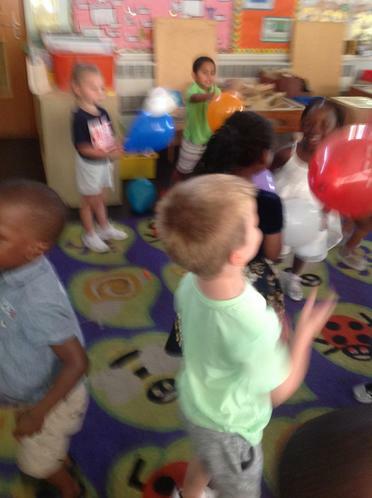 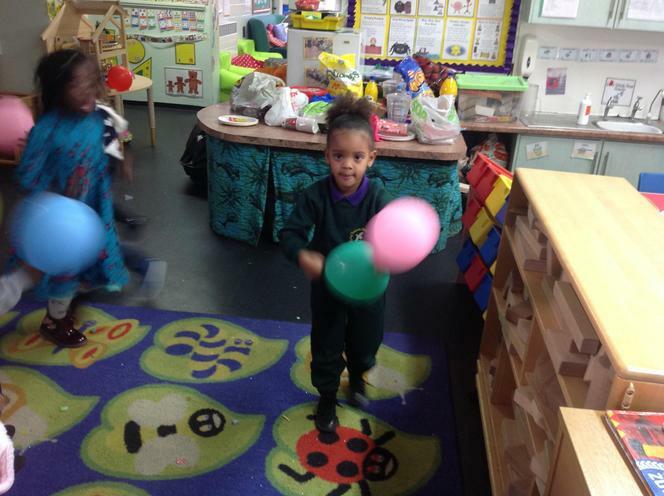 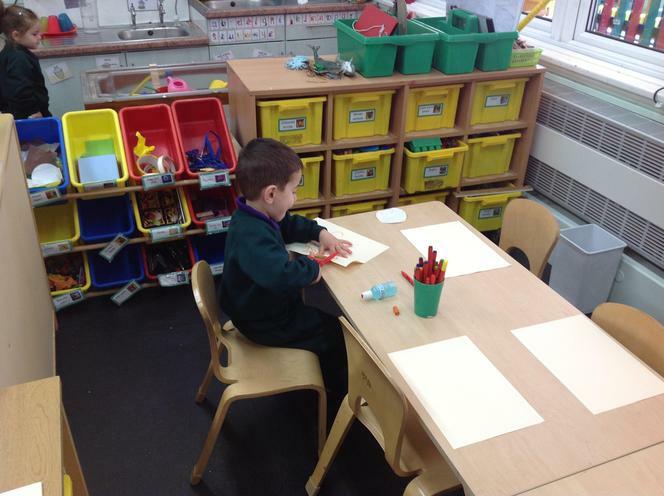 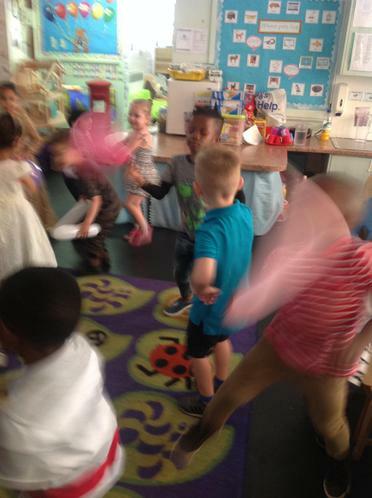 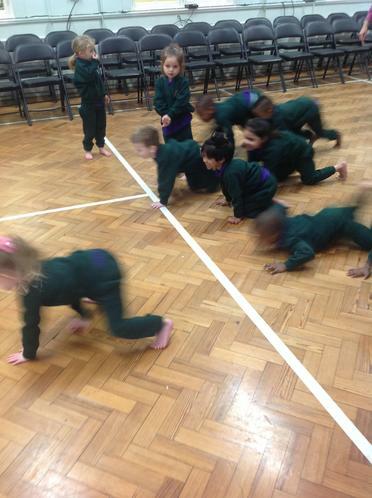 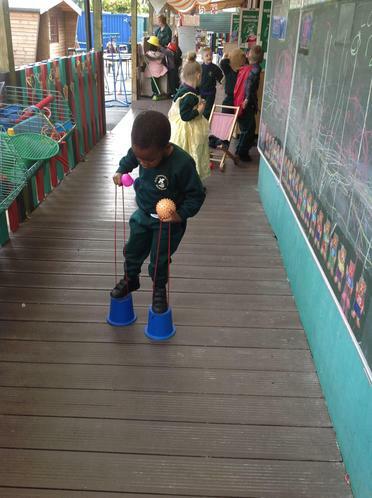 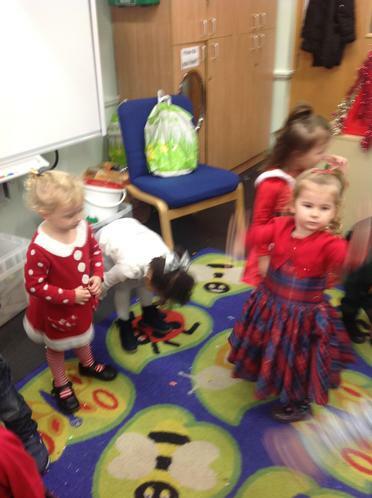 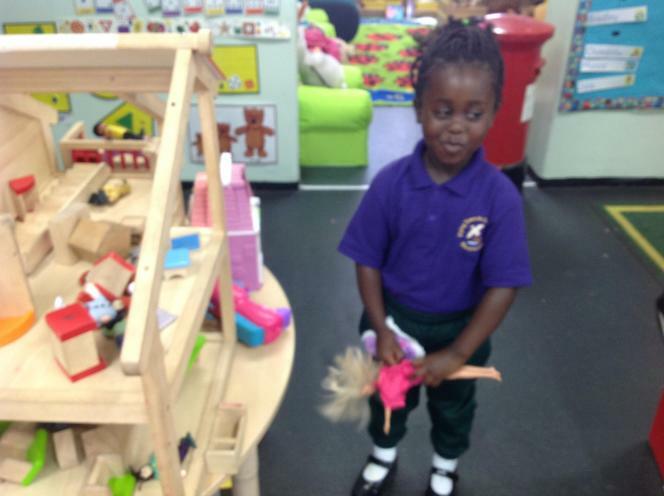 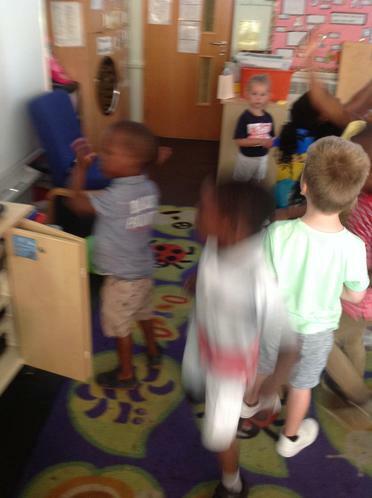 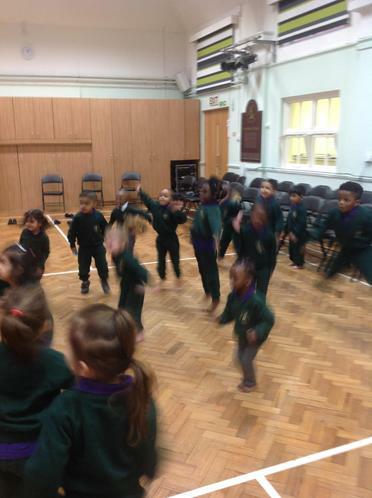 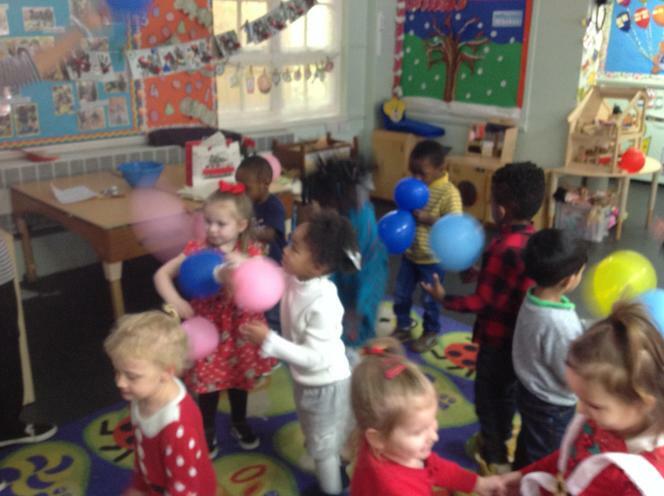 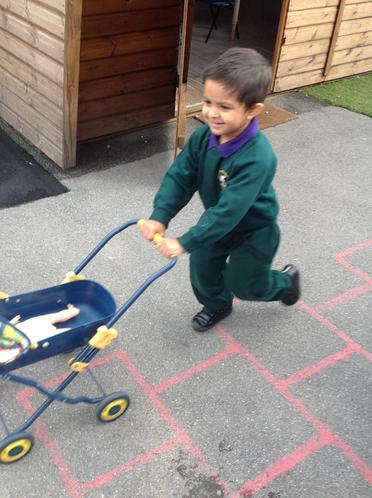 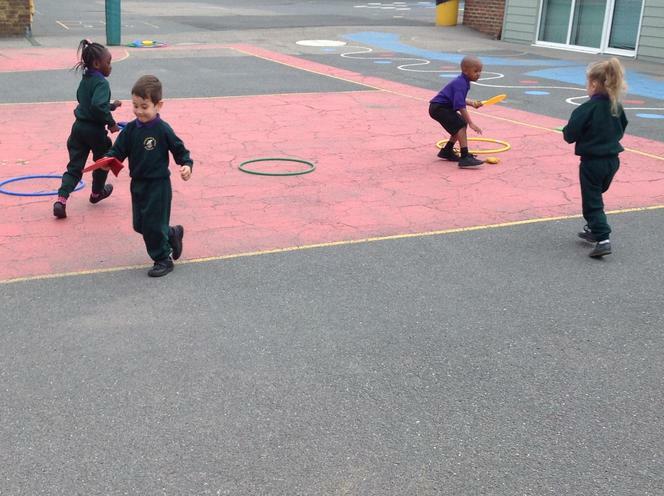 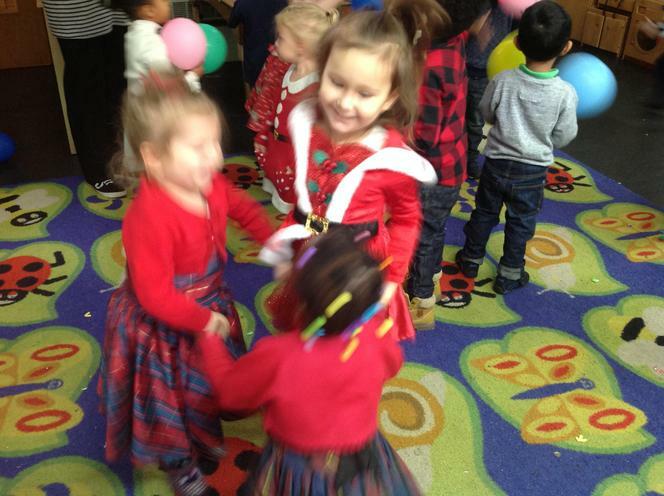 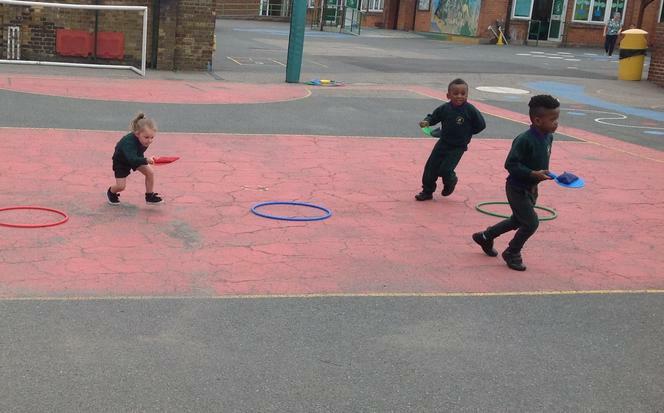 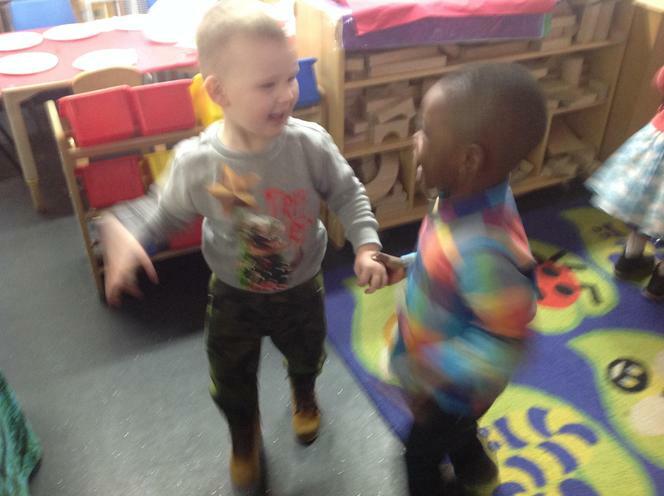 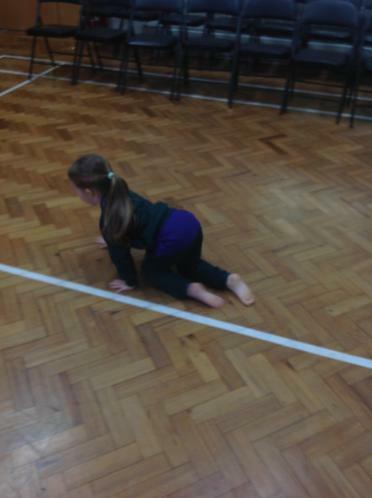 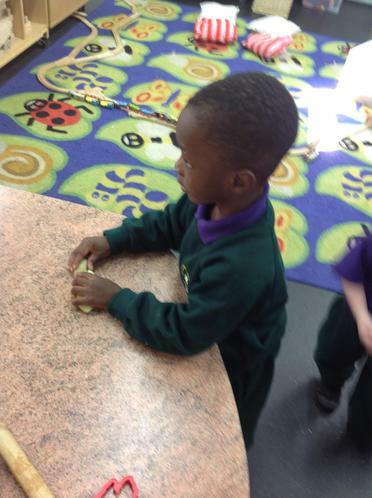 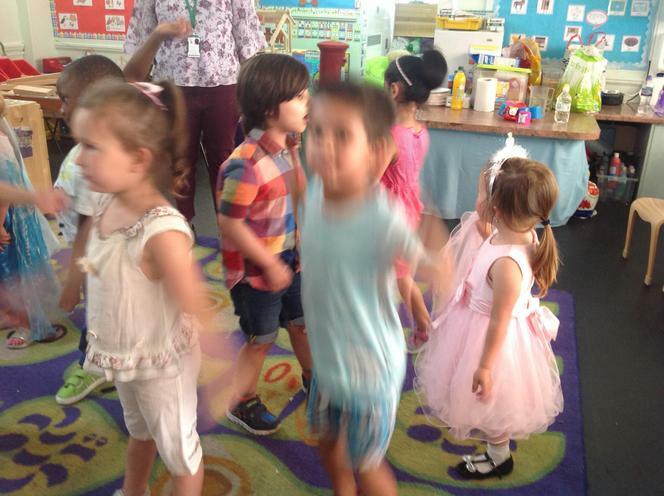 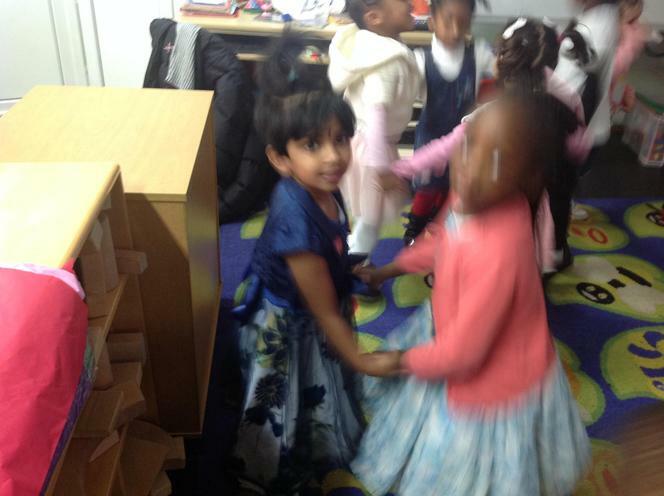 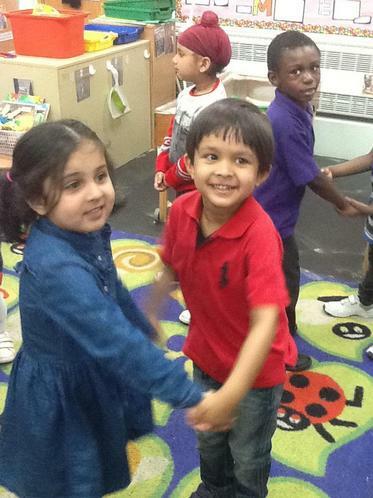 We went into the hall and practised moving in different ways including hopping, skipping, jumping, crawling and rolling. 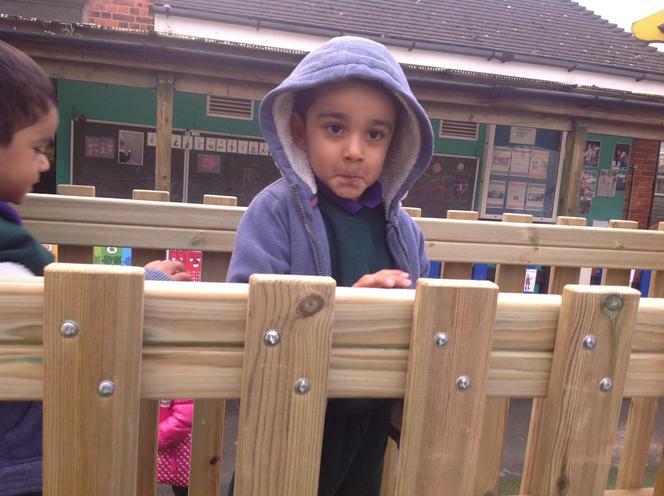 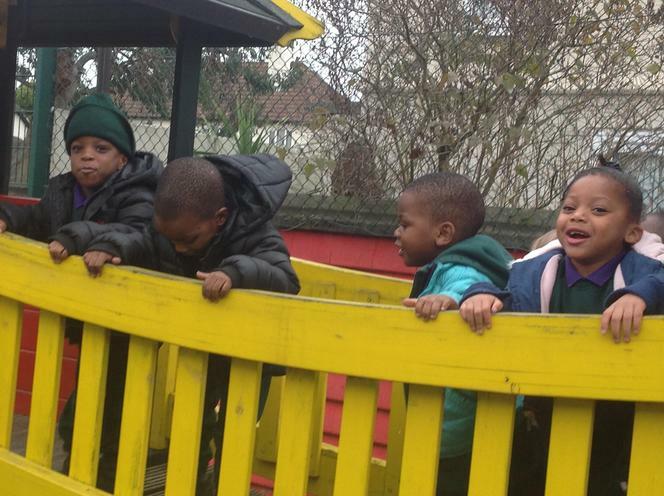 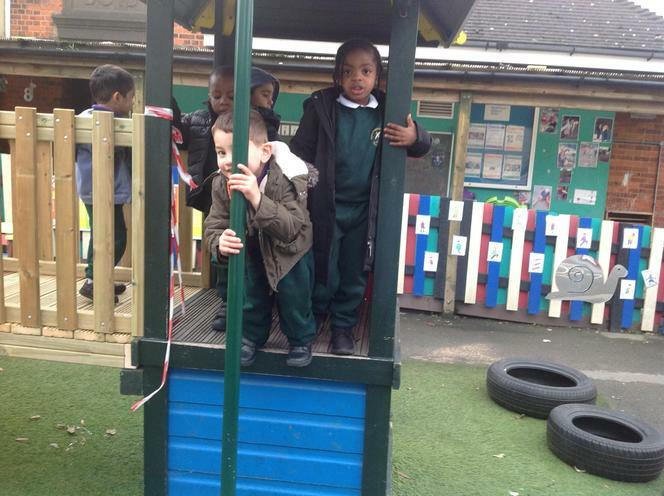 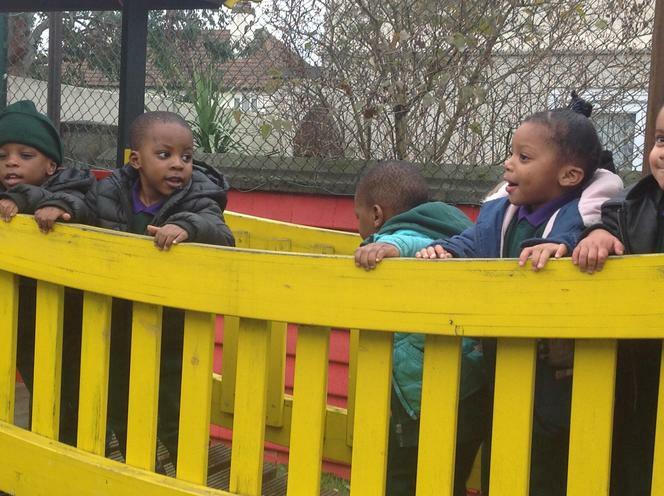 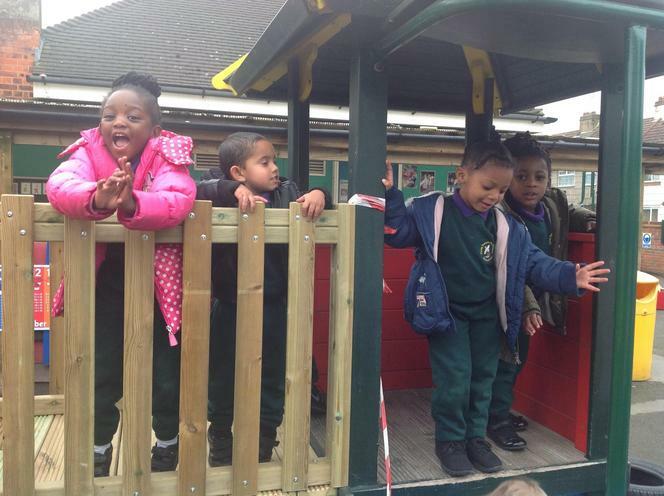 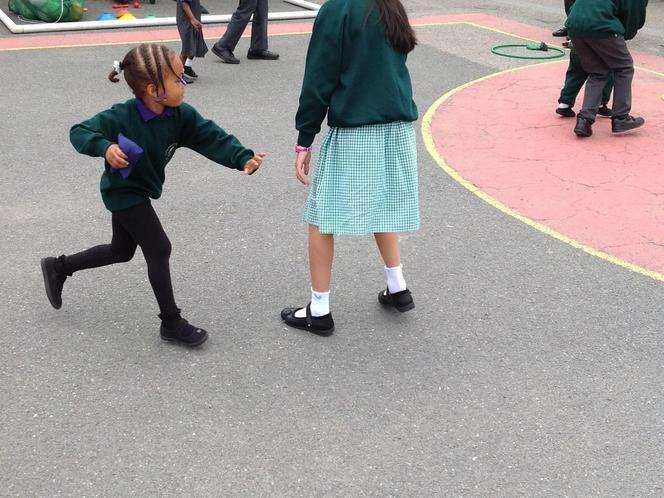 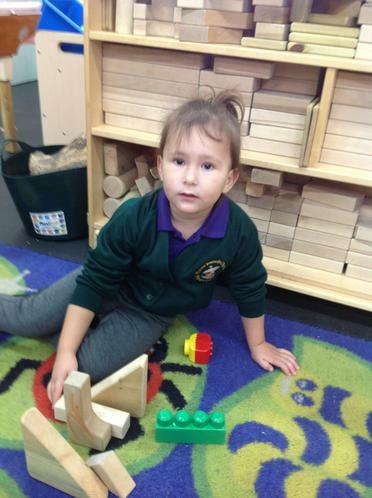 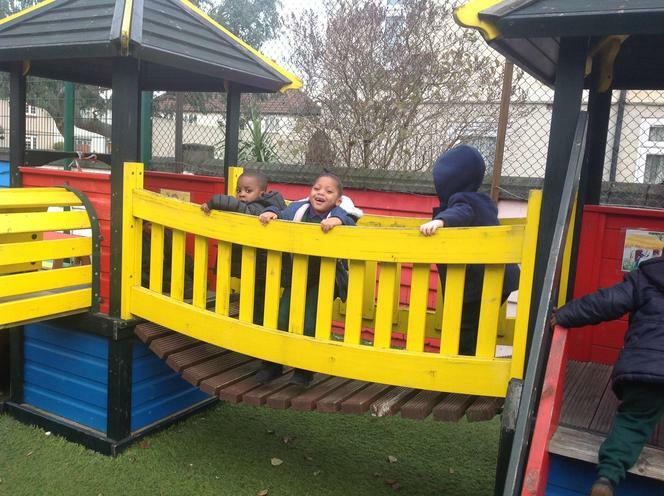 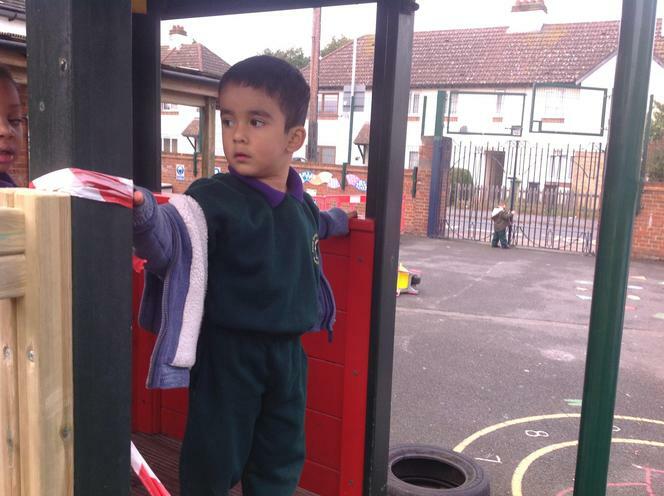 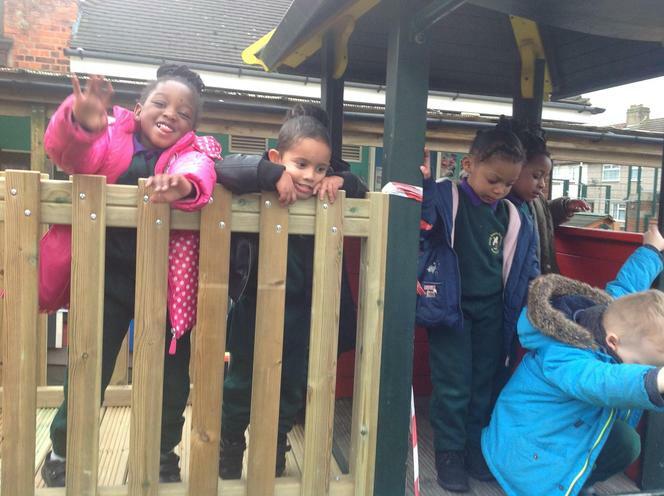 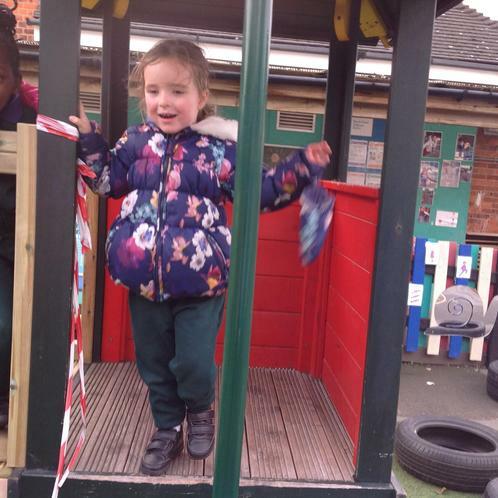 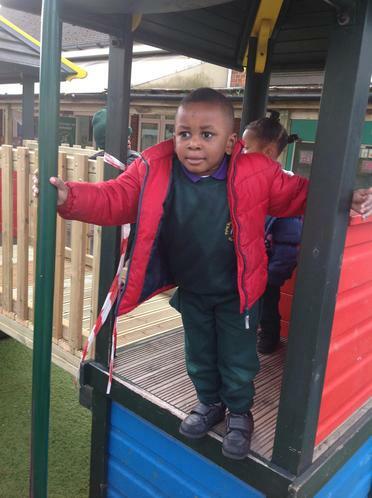 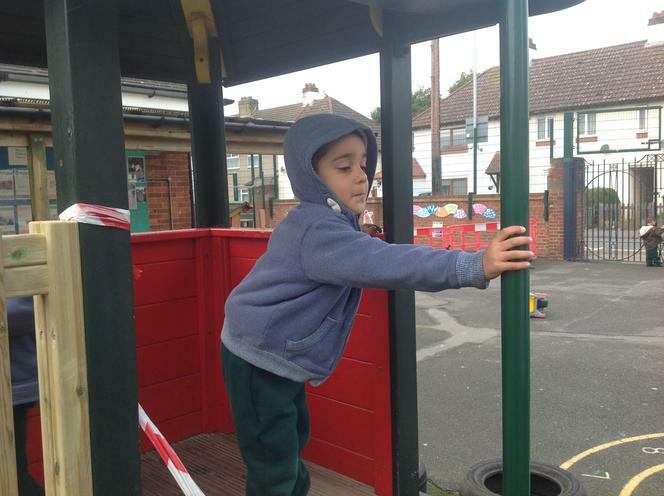 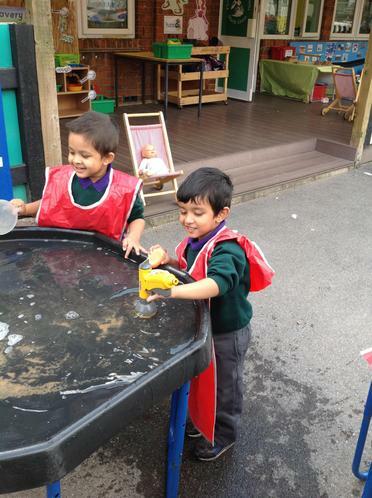 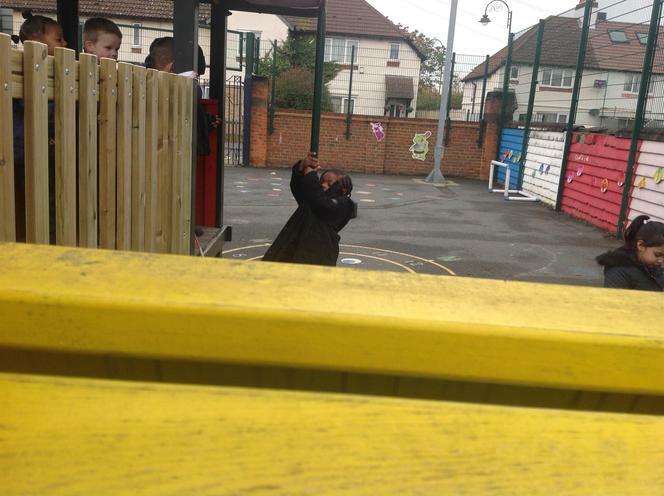 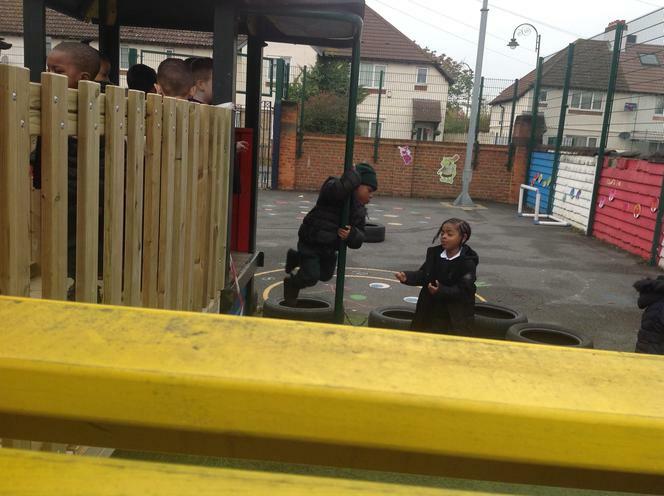 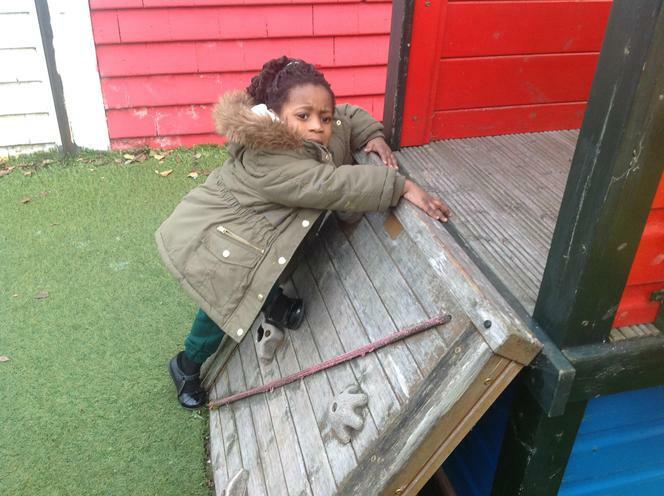 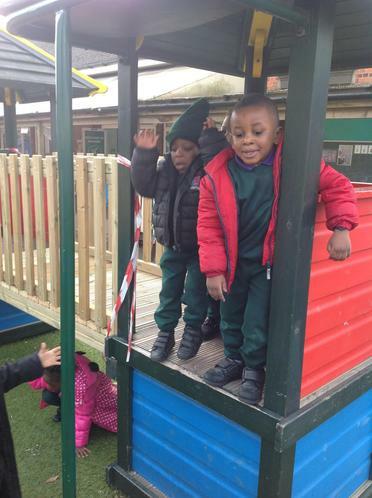 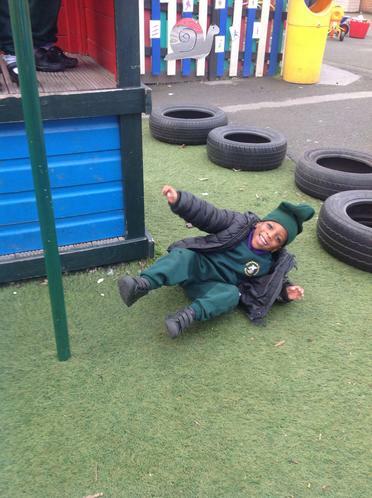 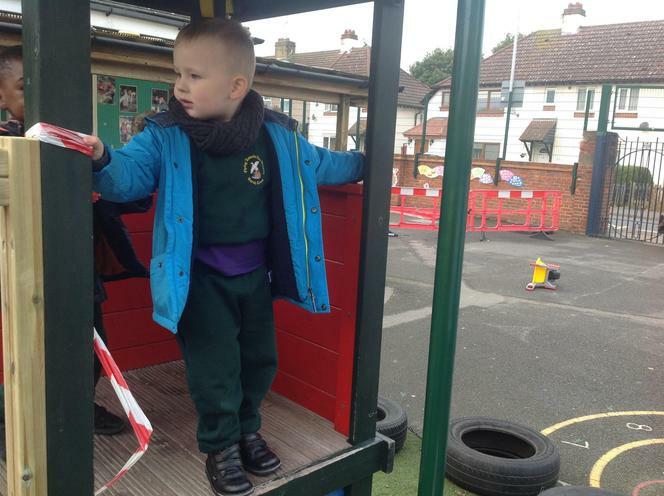 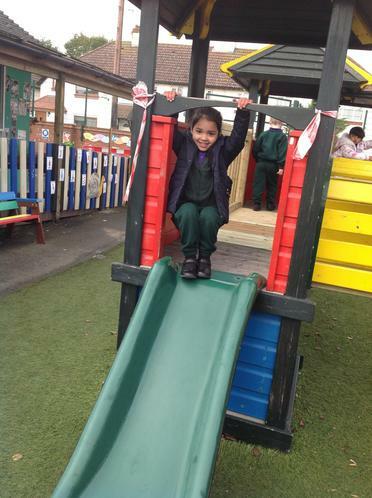 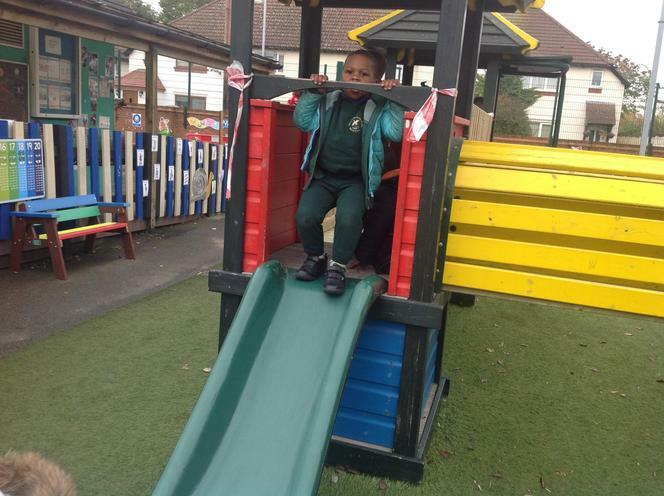 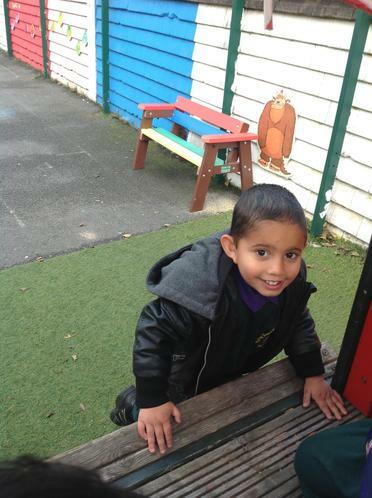 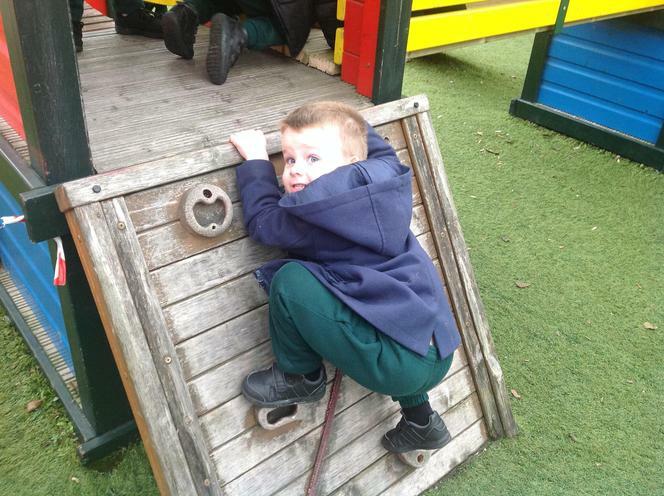 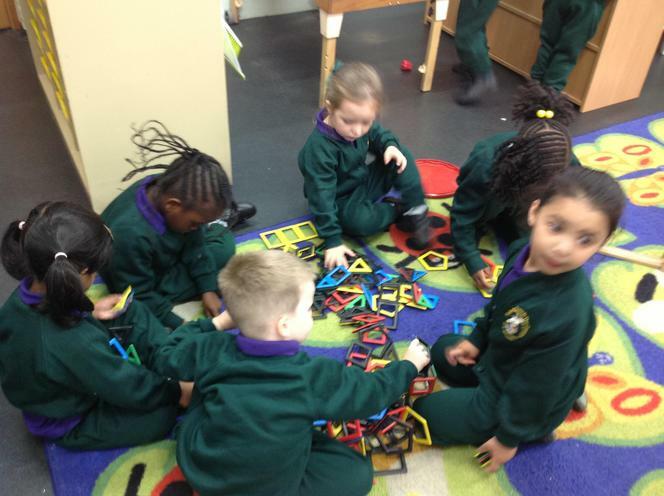 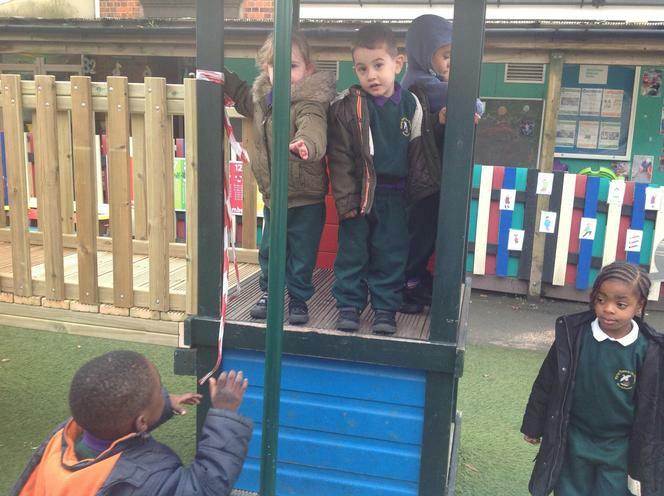 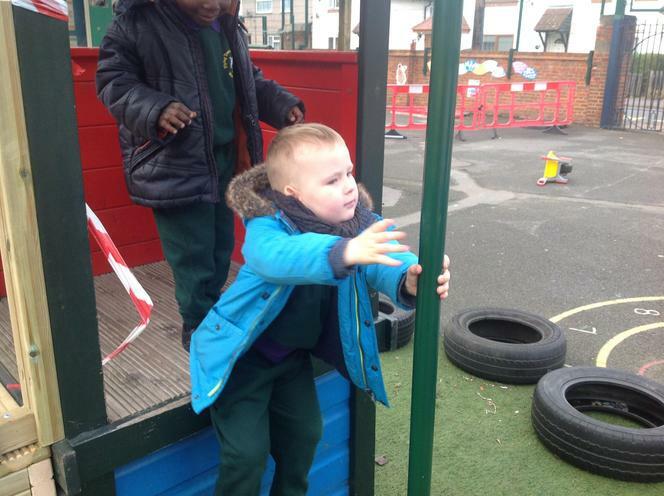 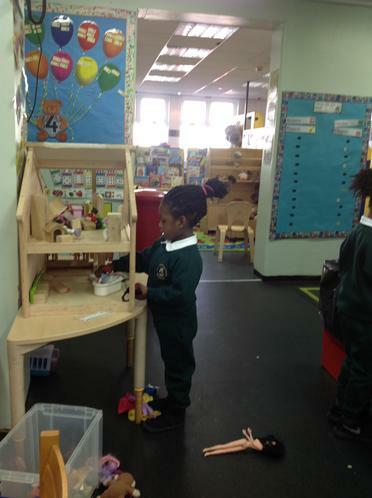 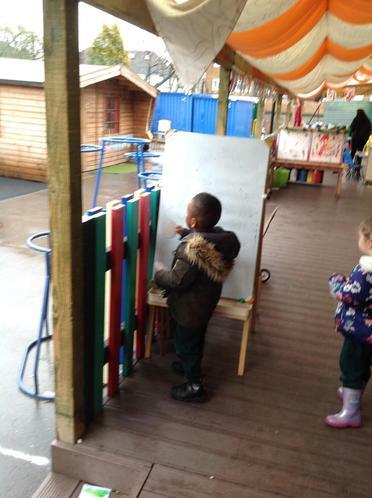 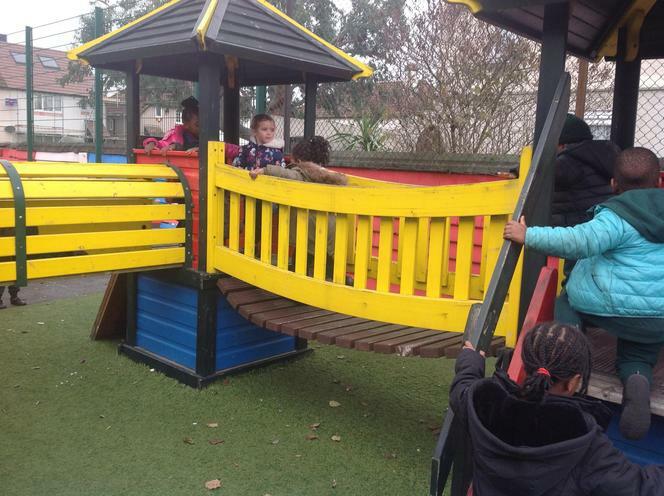 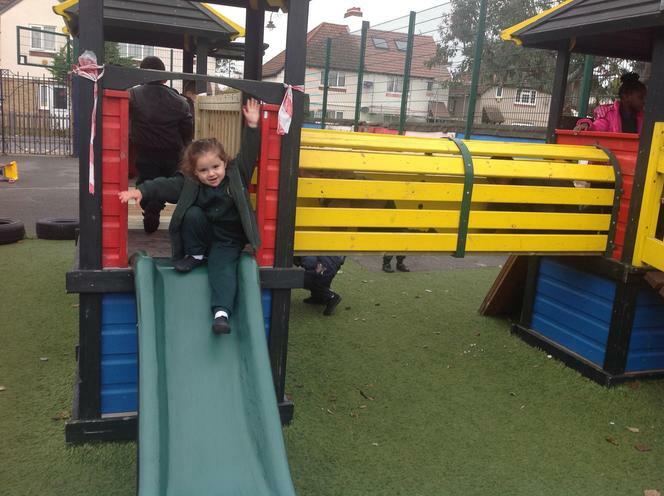 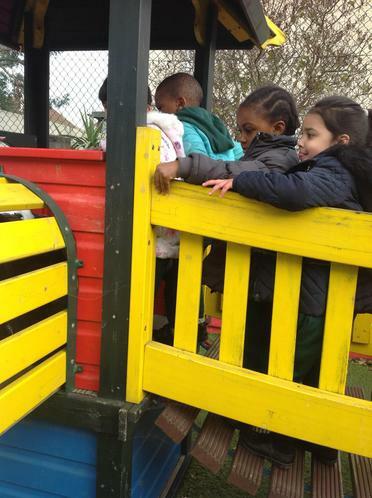 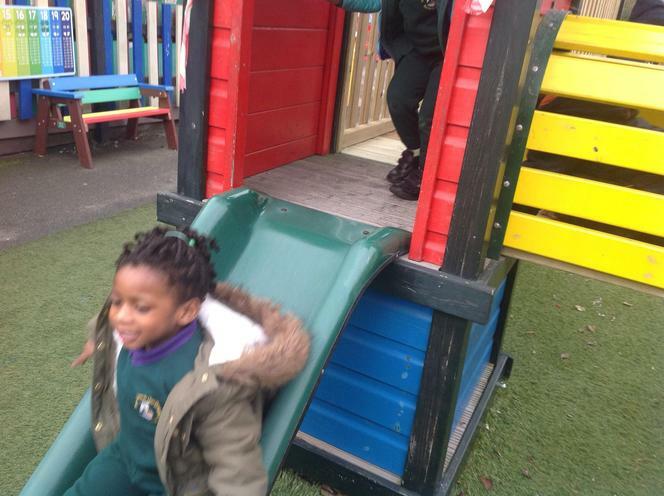 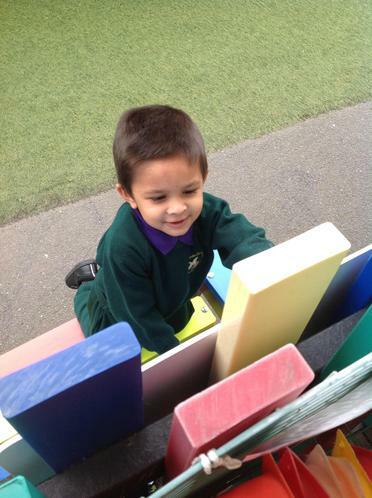 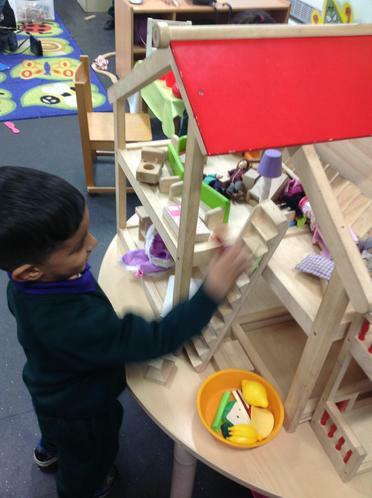 The children were so excited that the climbing frame was mended. 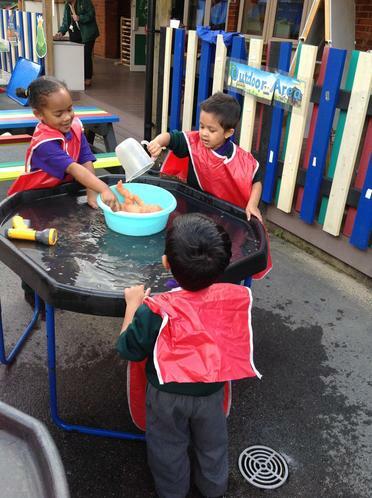 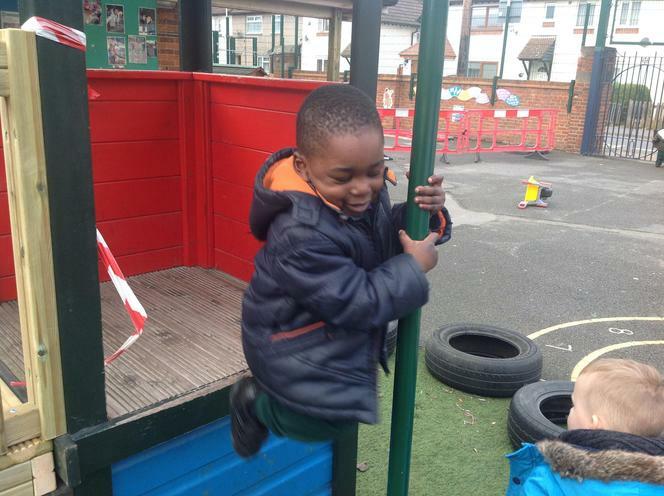 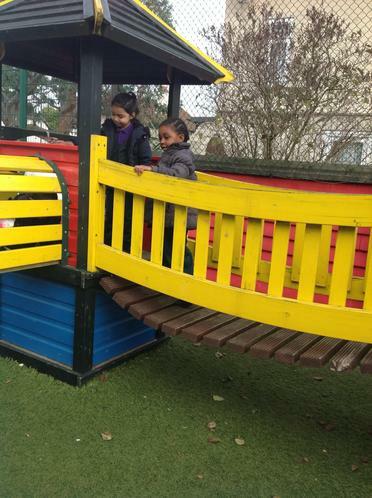 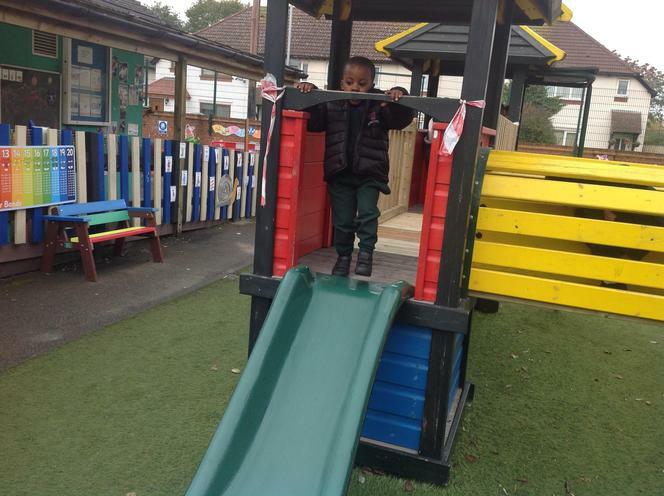 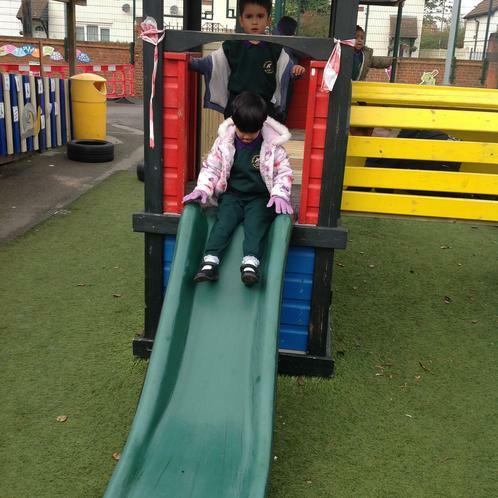 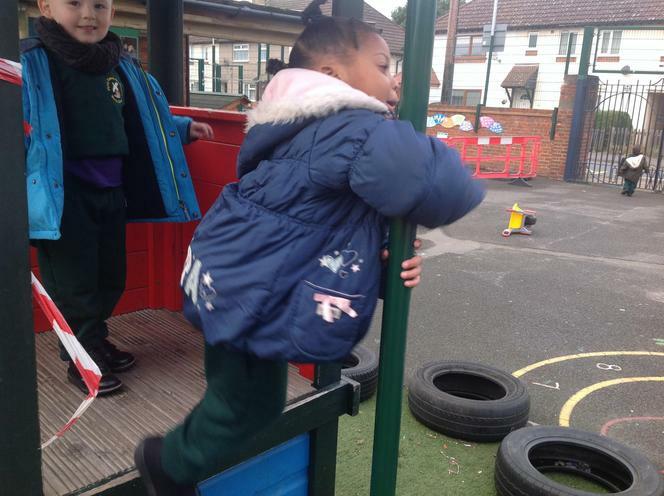 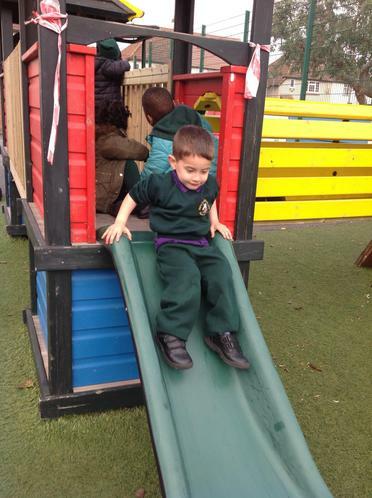 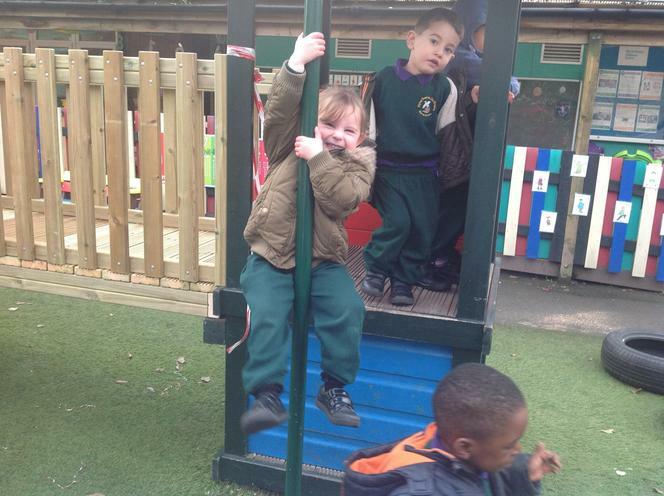 They enjoyed climbing, sliding down the pole and the slide. 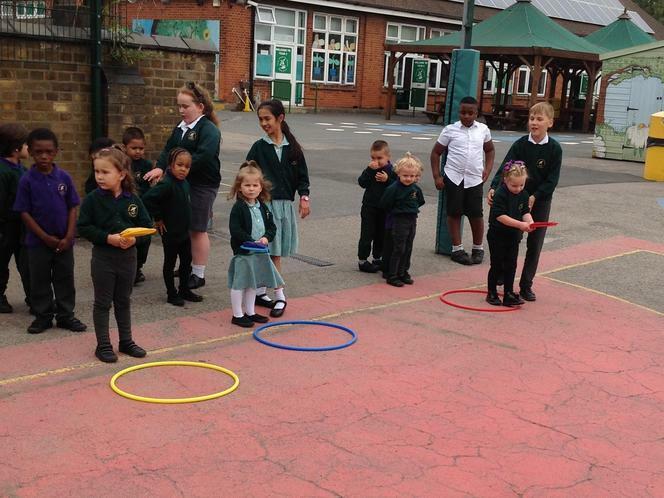 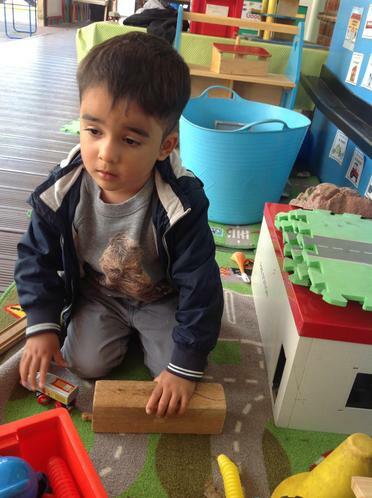 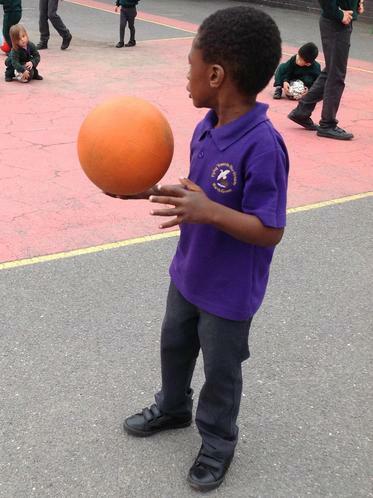 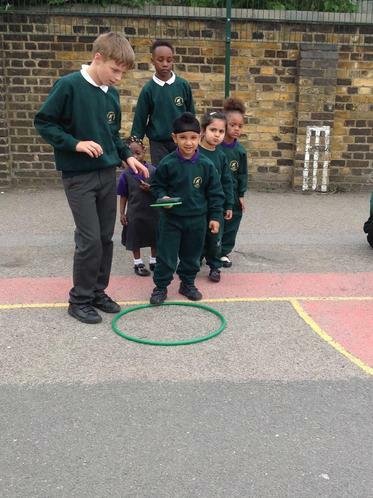 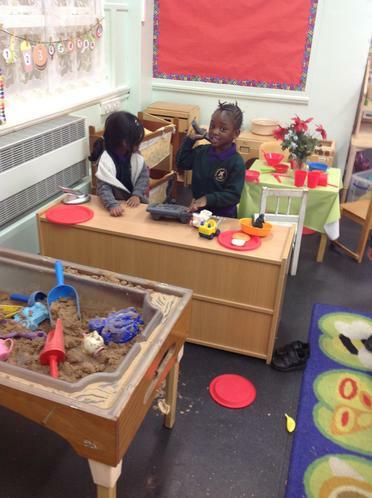 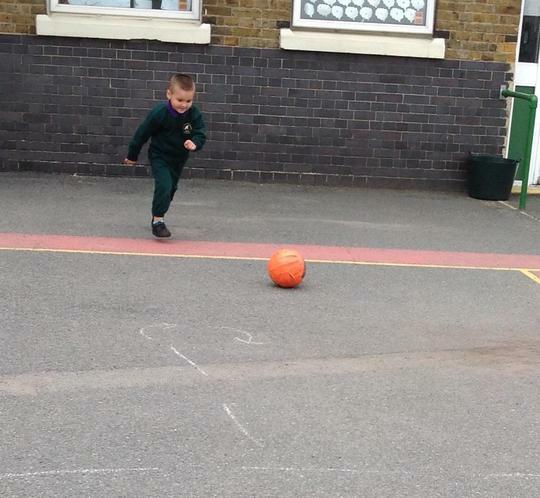 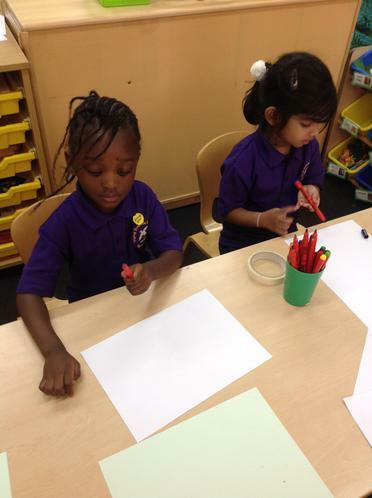 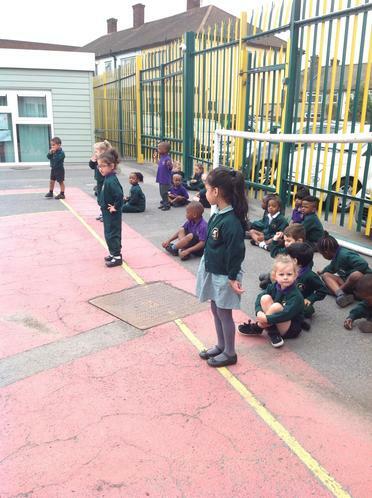 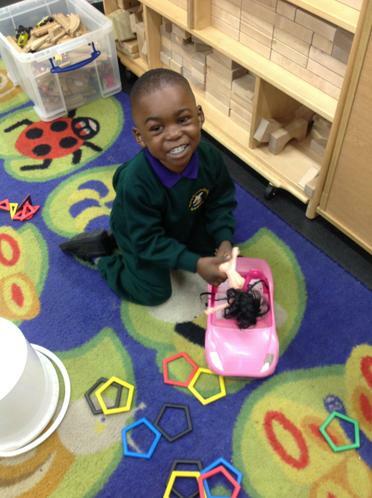 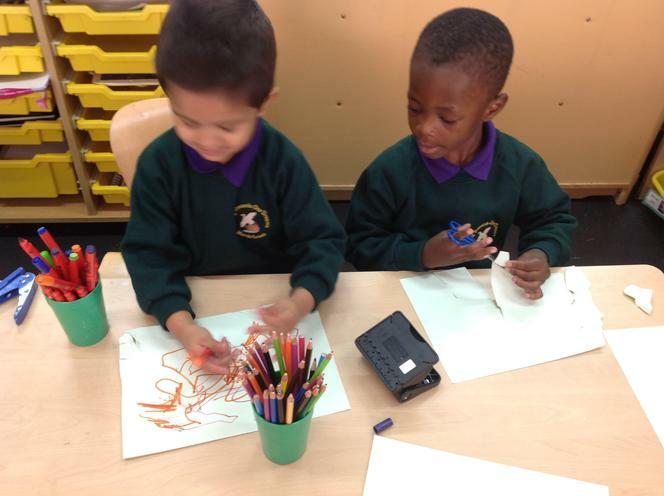 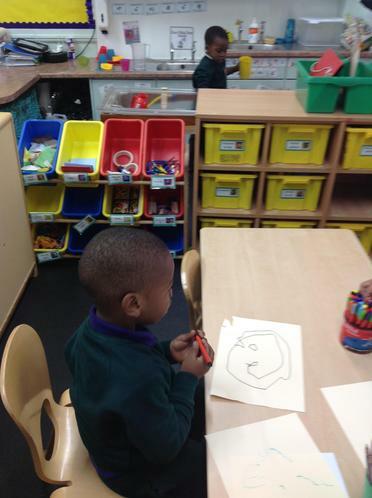 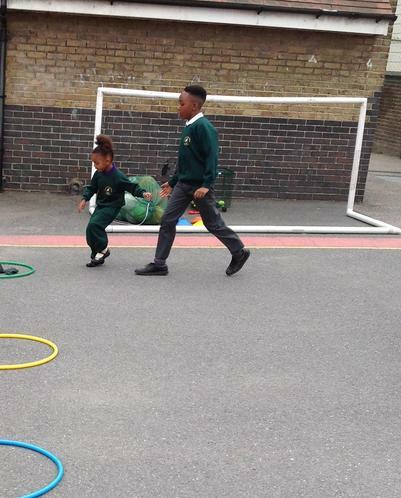 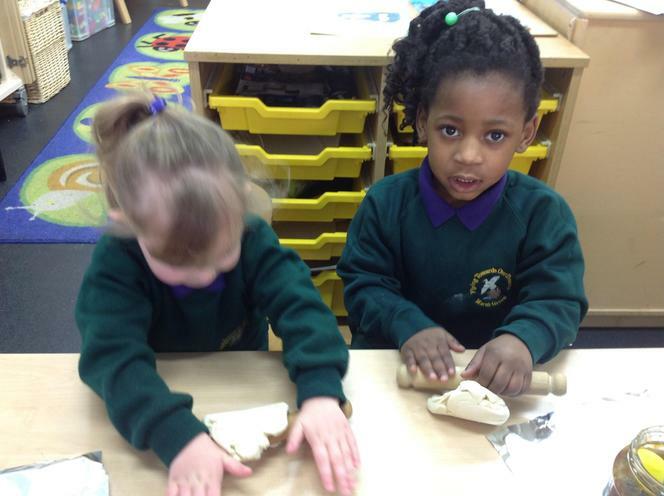 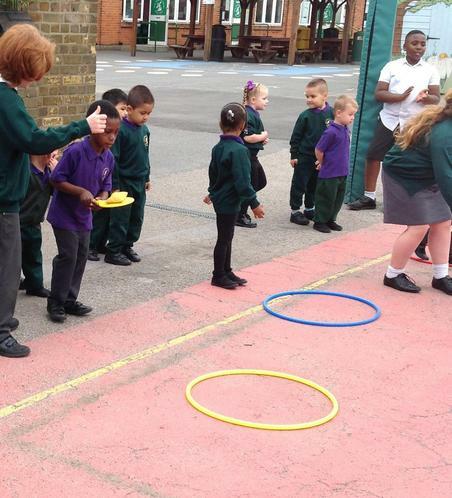 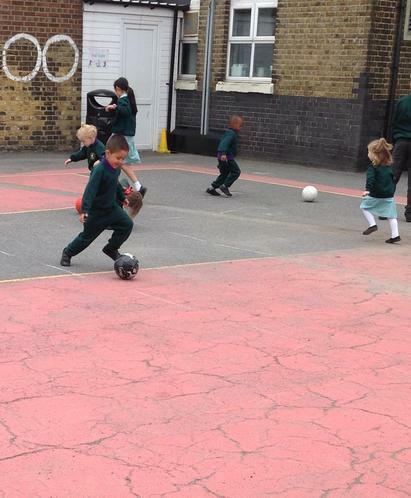 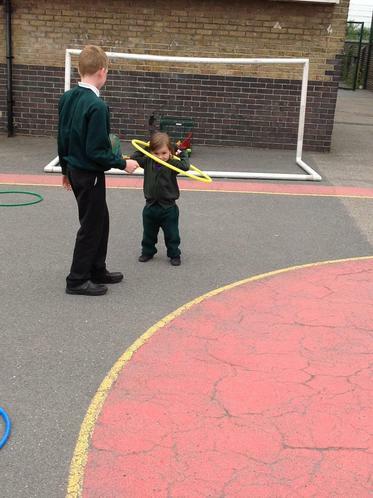 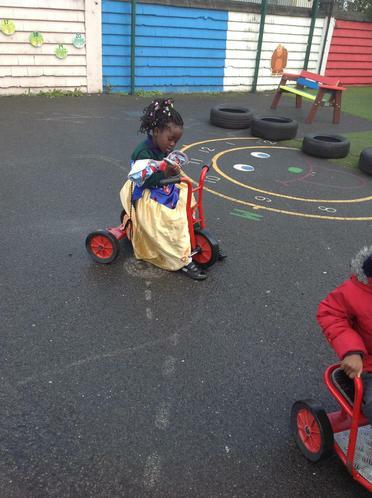 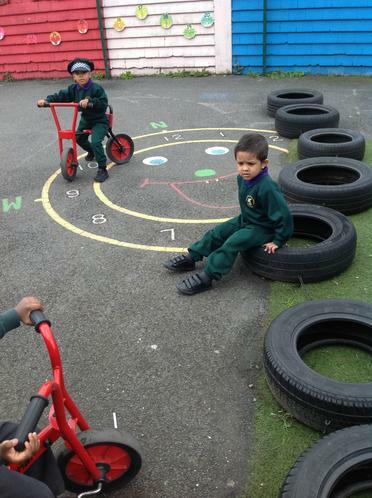 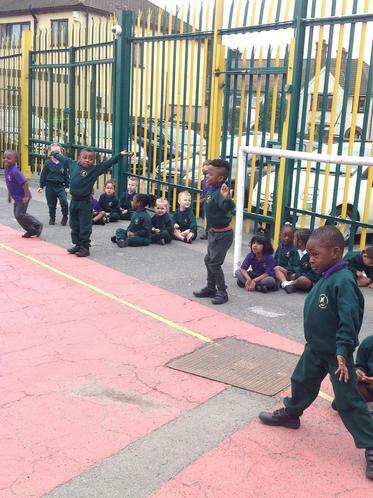 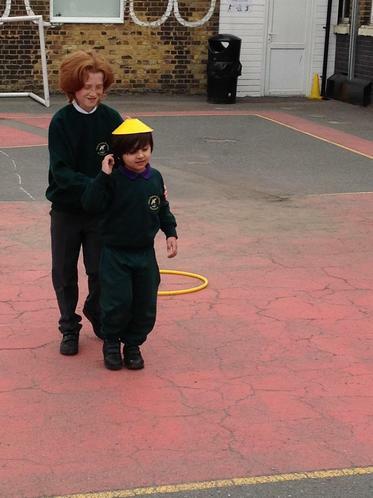 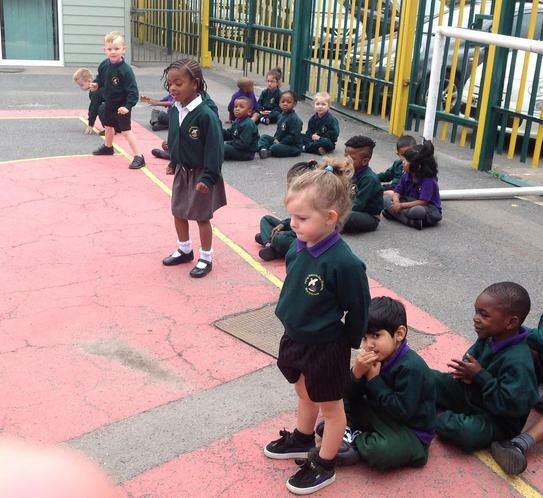 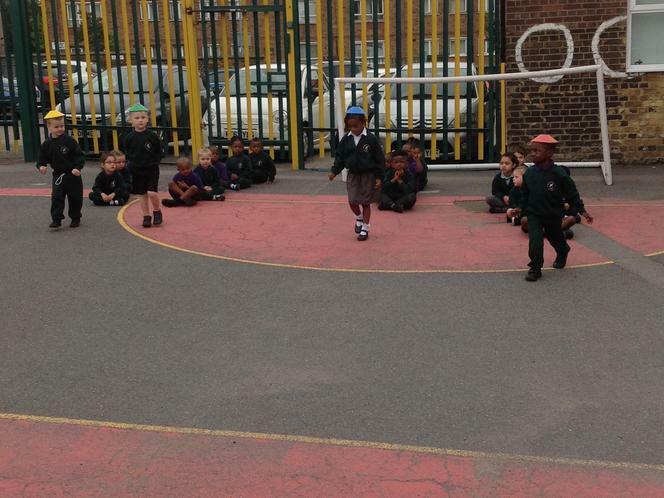 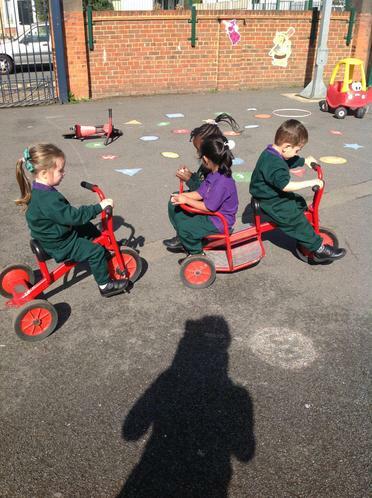 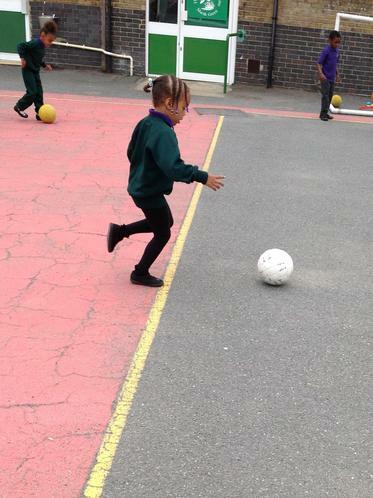 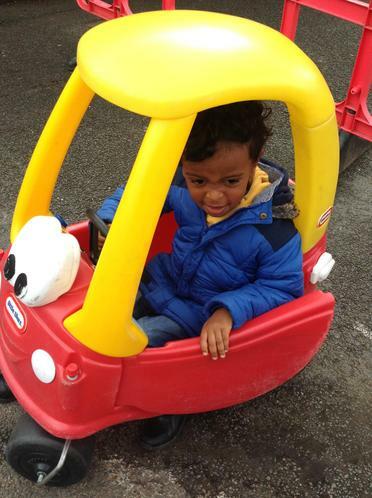 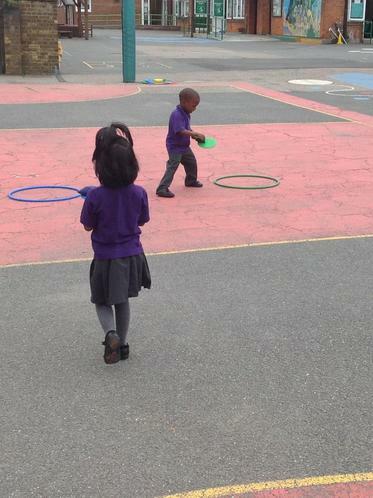 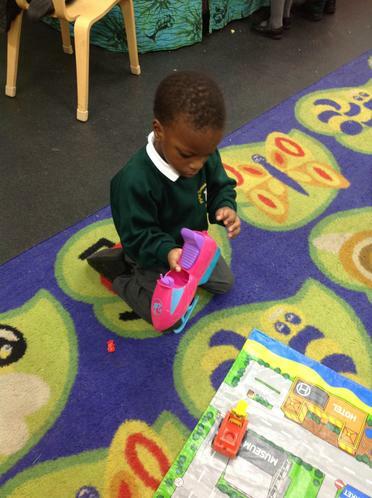 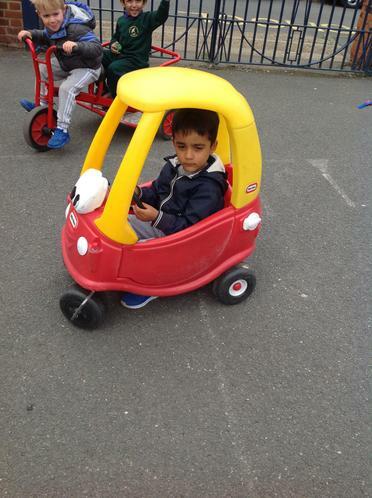 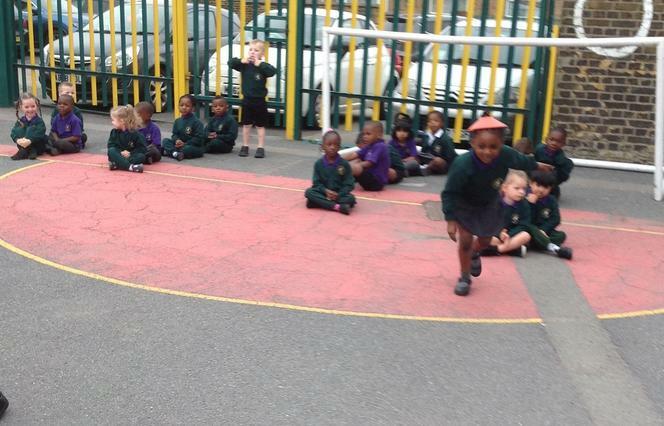 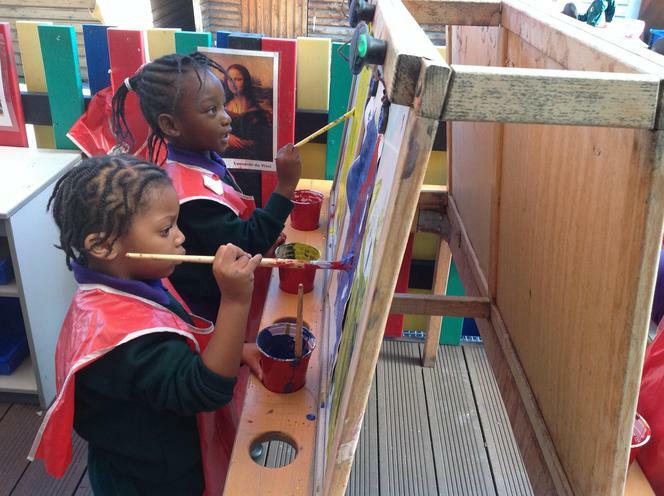 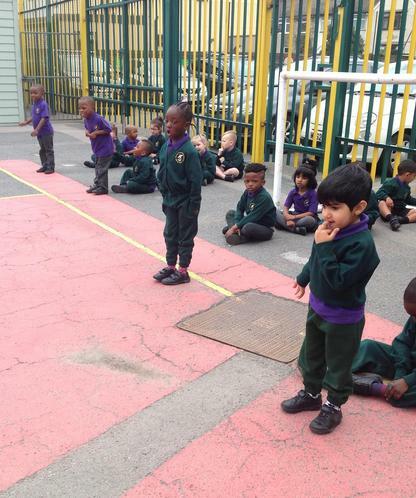 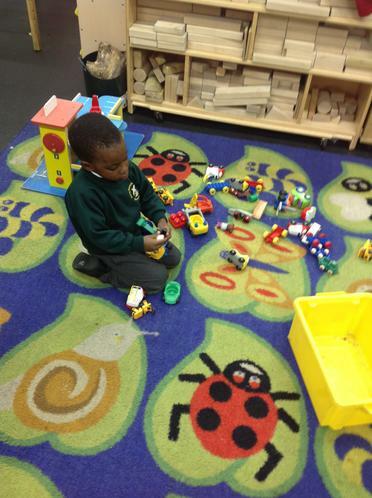 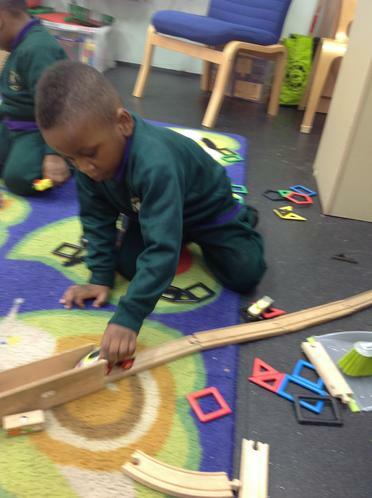 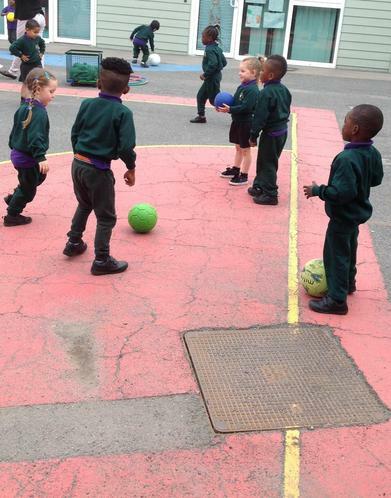 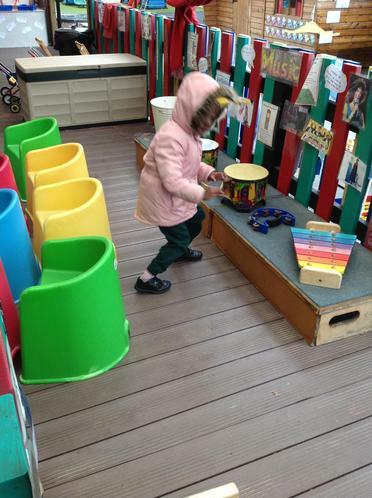 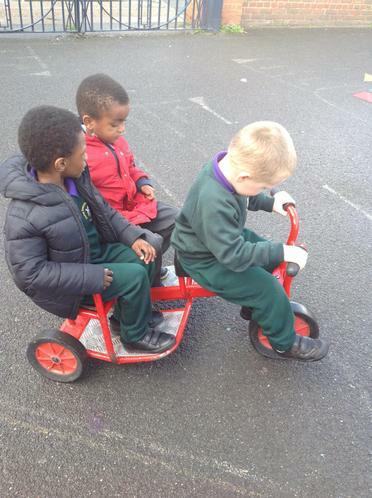 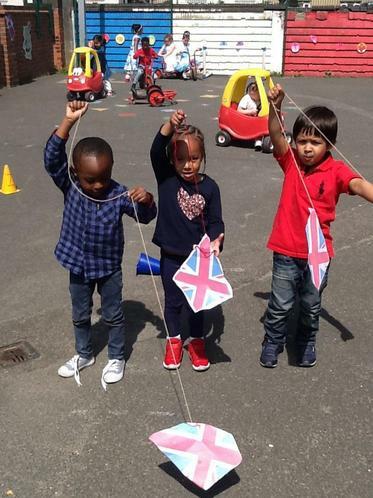 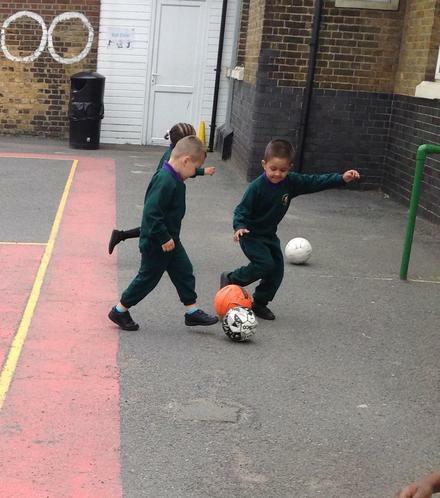 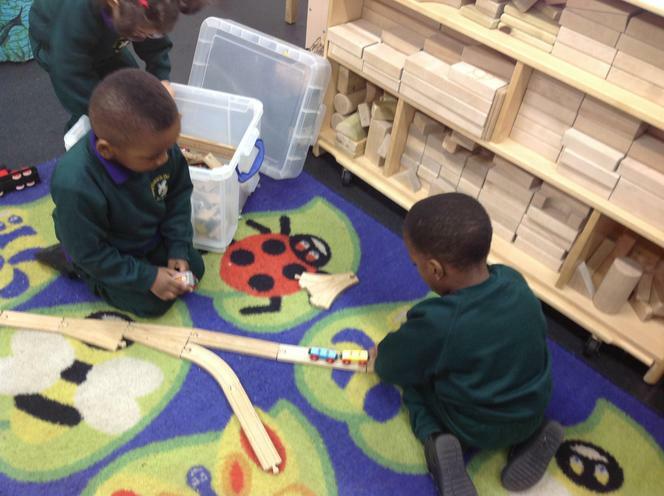 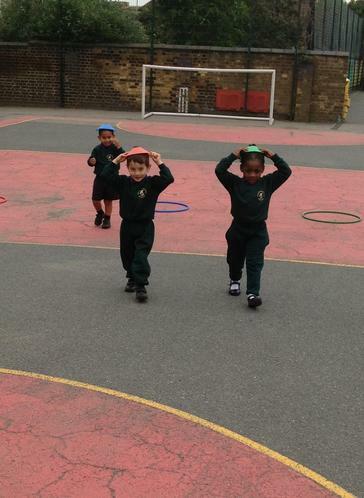 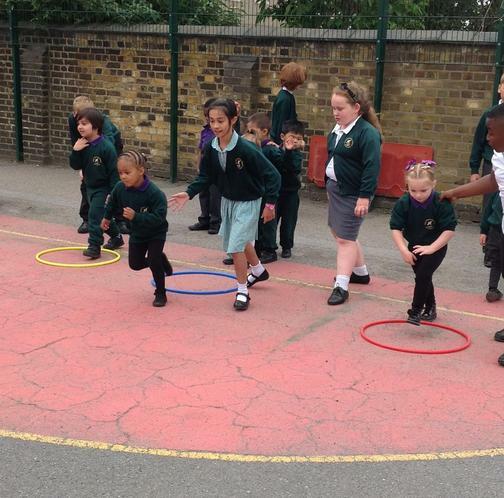 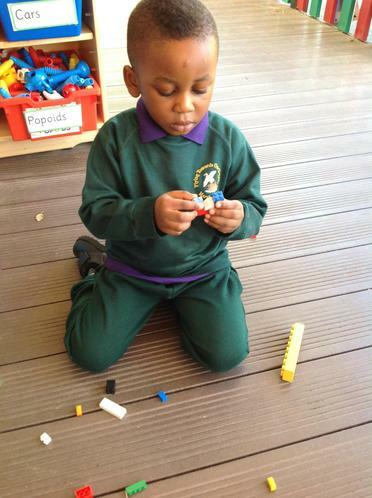 They also practised waiting for a turn! 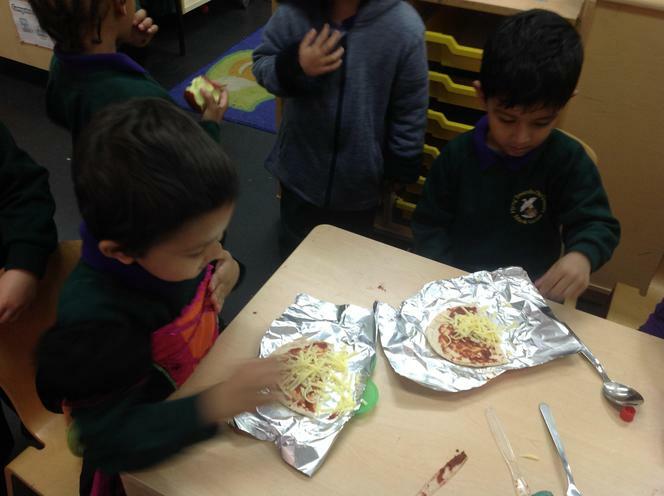 We made pizza. 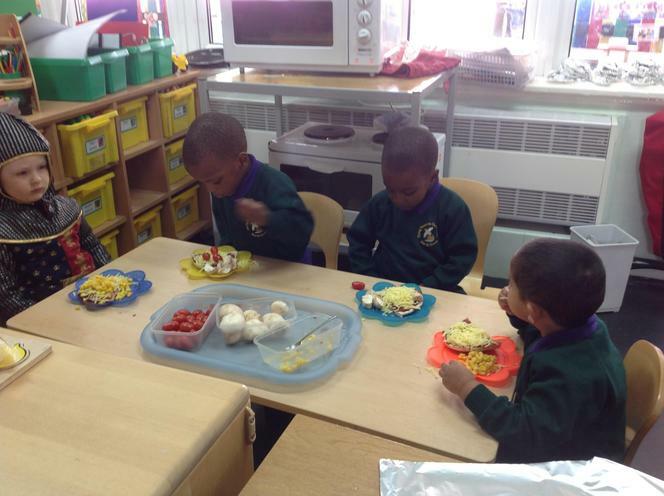 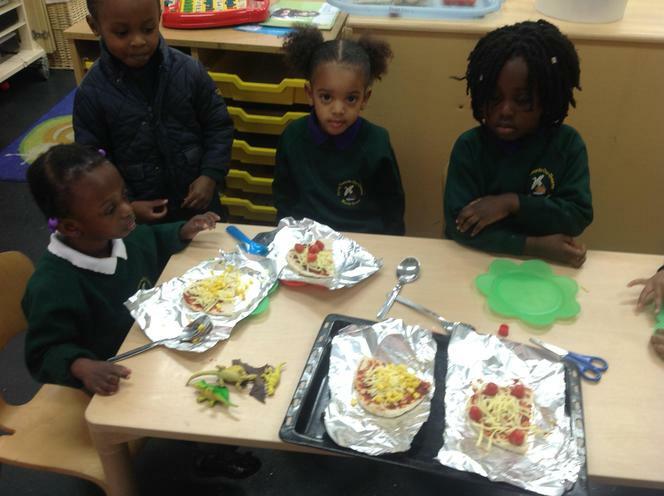 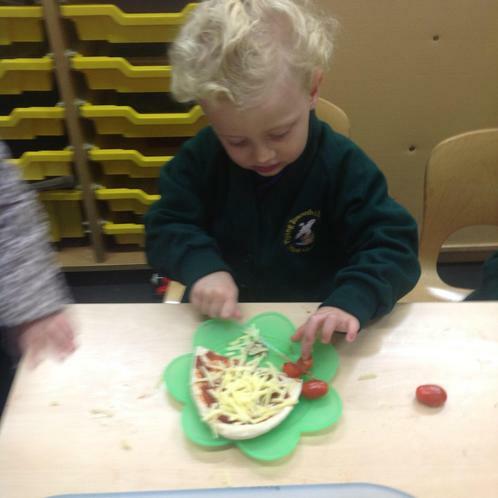 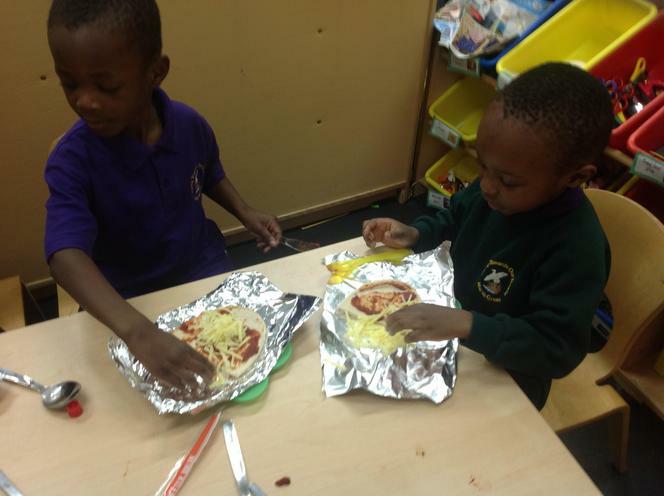 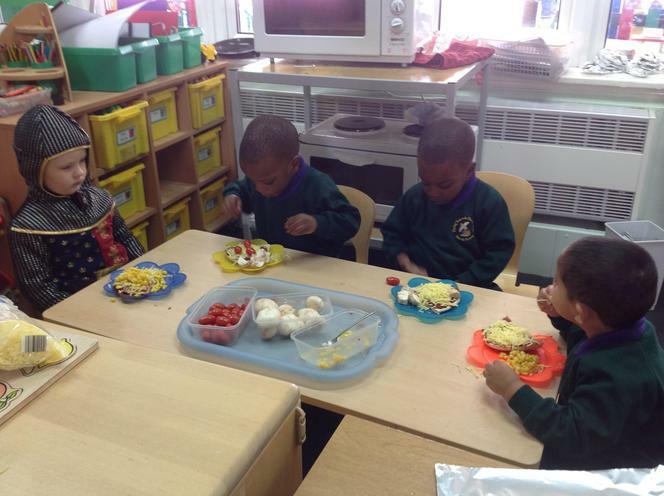 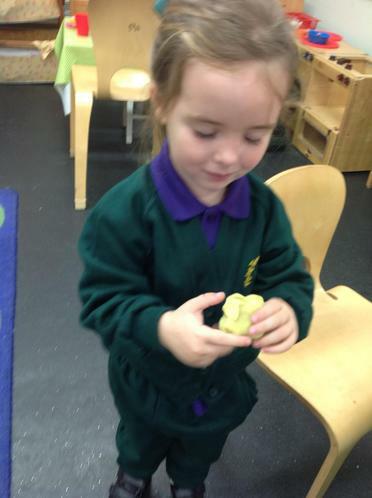 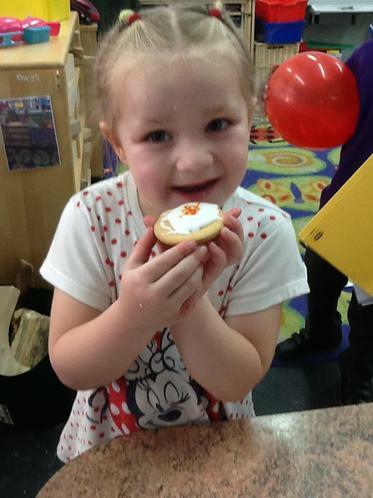 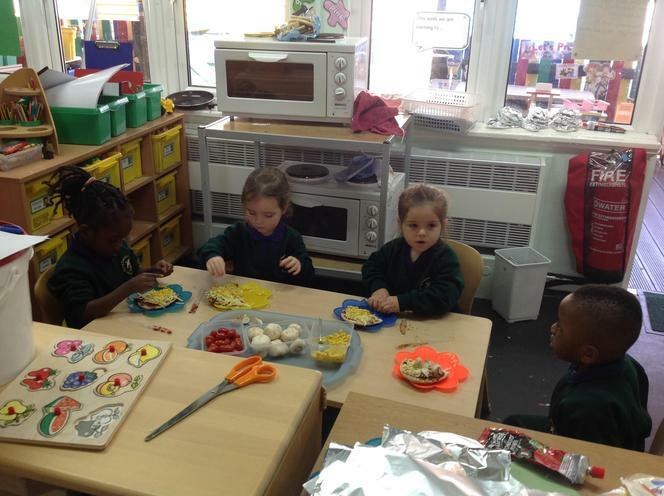 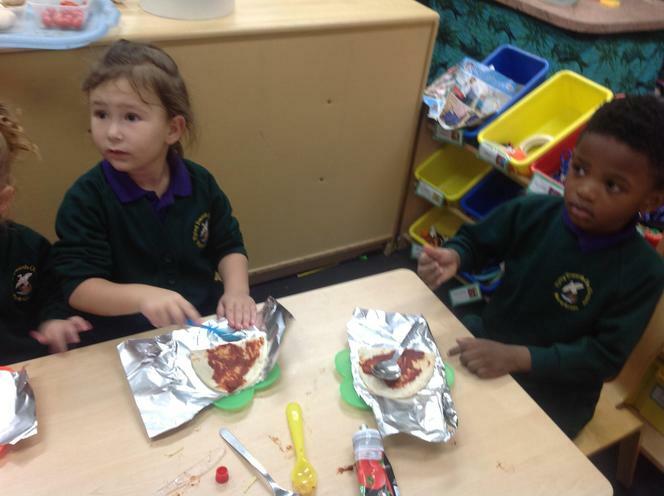 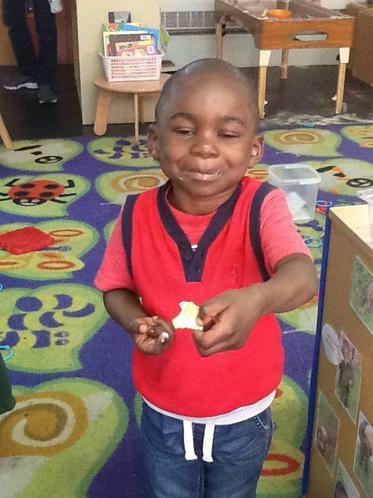 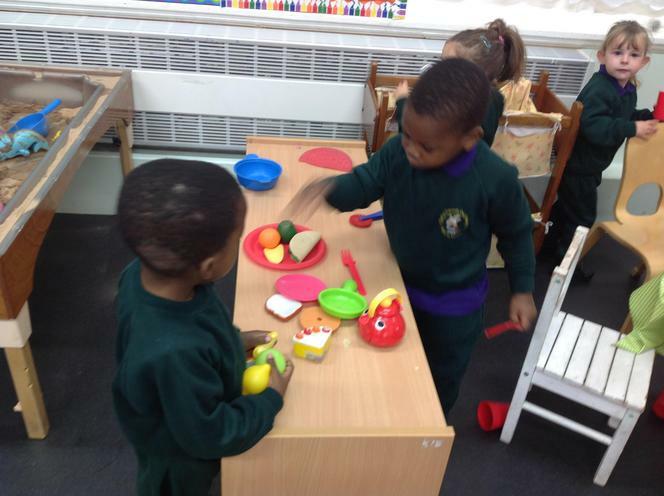 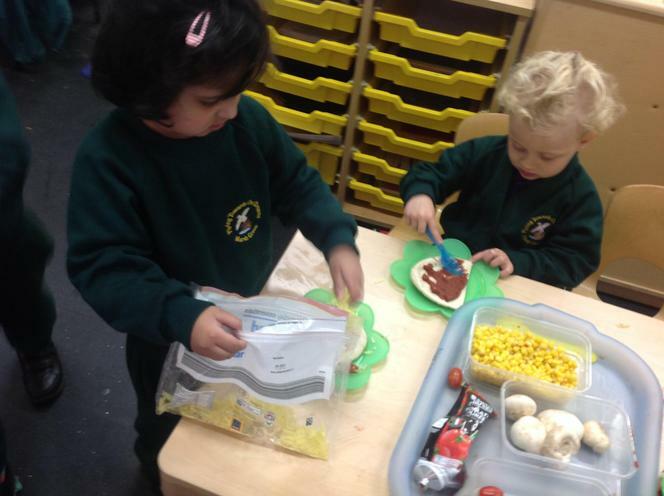 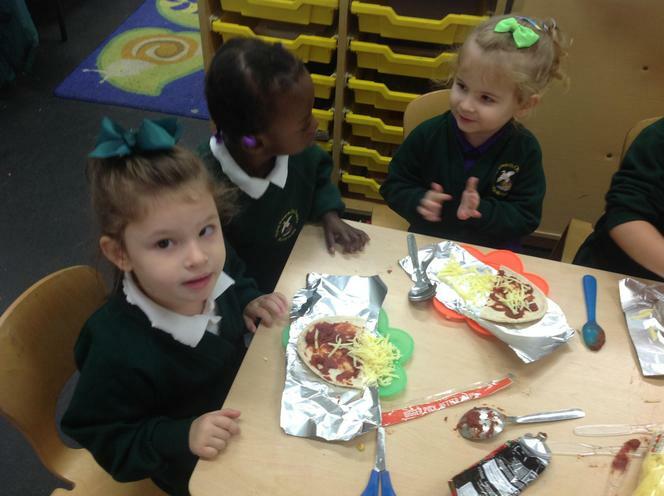 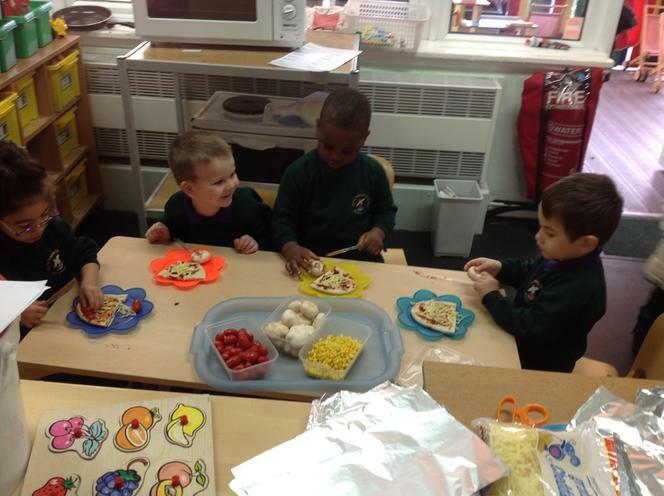 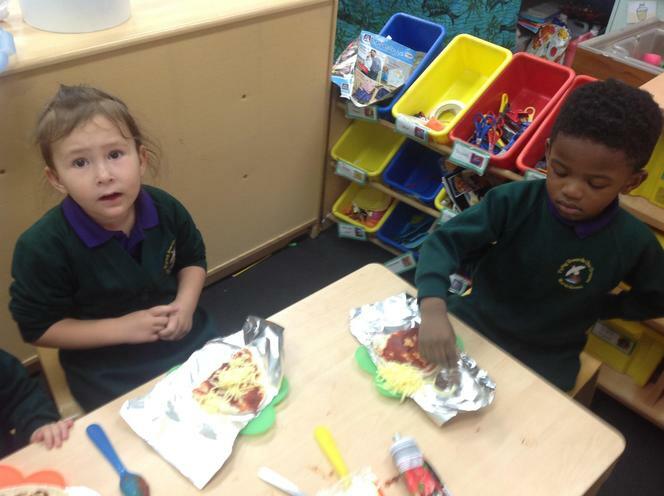 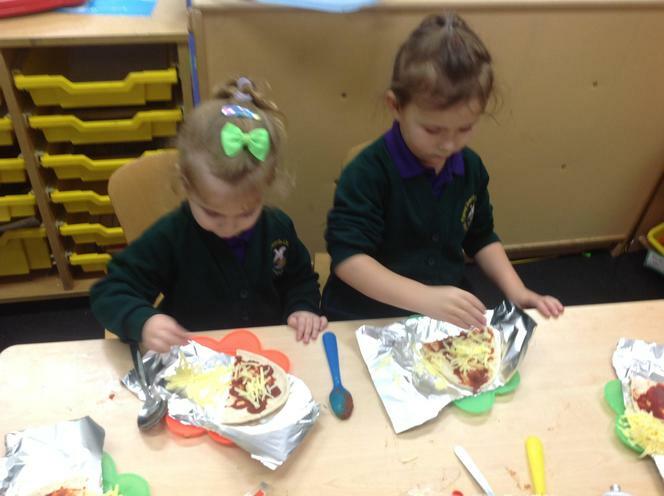 The children chose mushroom, sweetcorn or tomato for a topping. 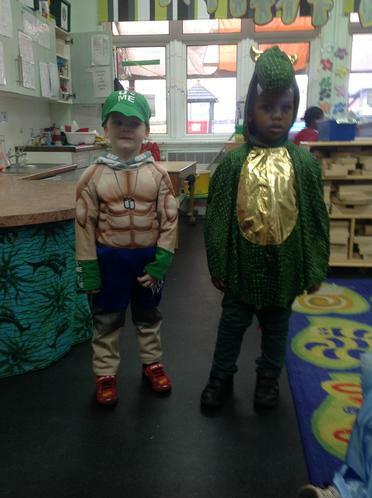 Which would you choose? 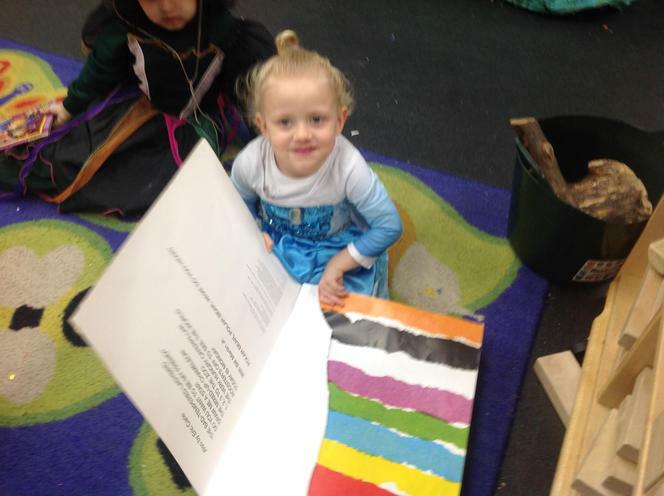 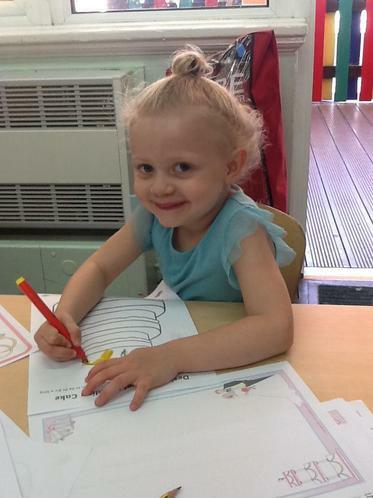 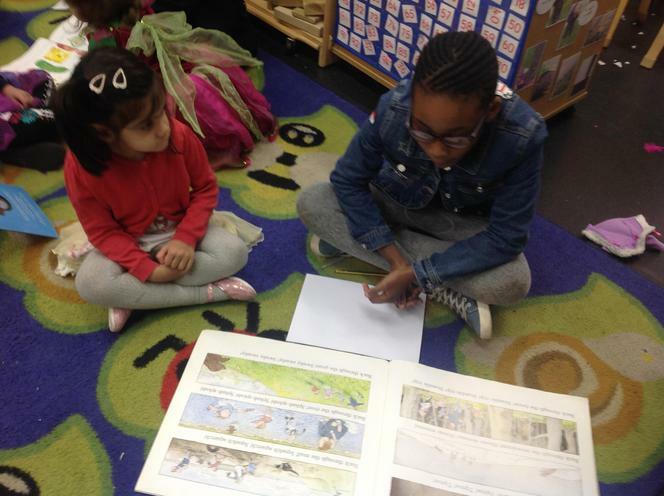 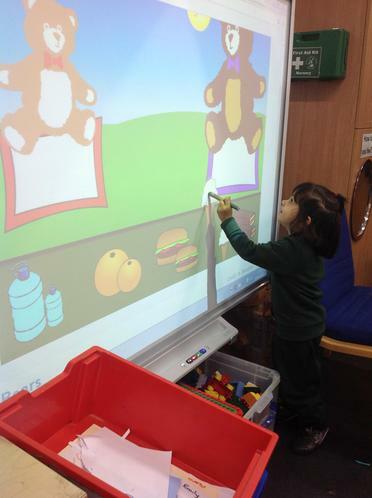 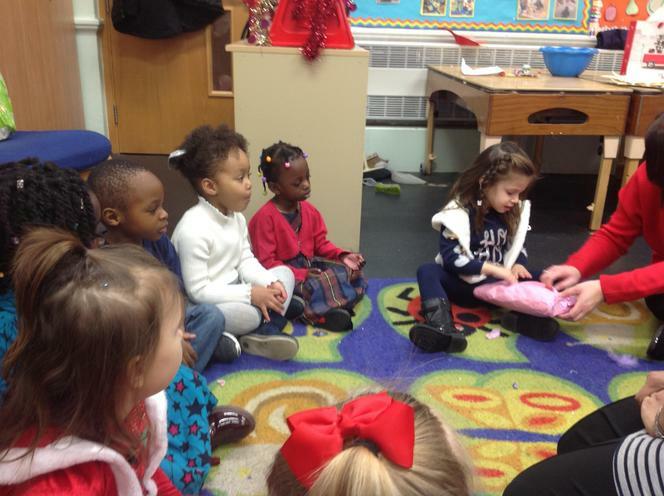 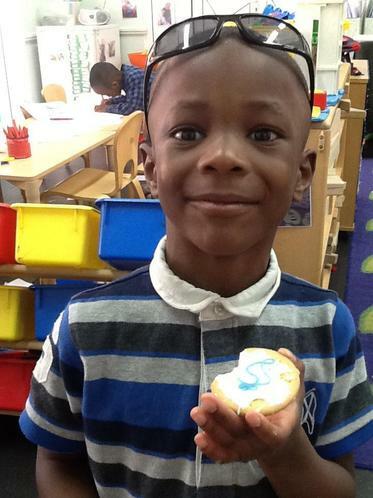 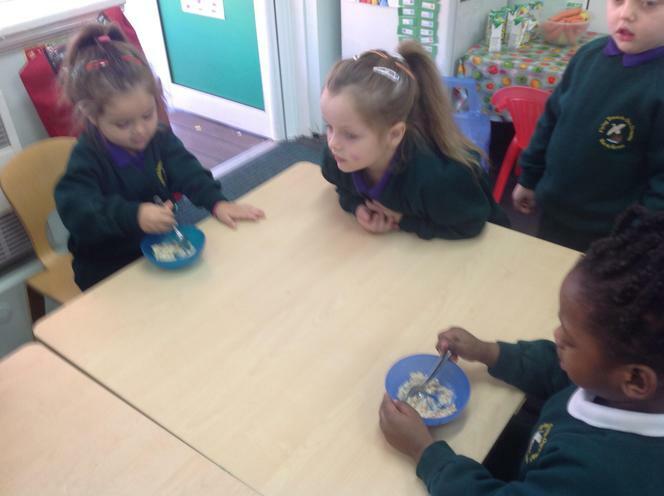 We read the story of Goldilocks and the three bears. 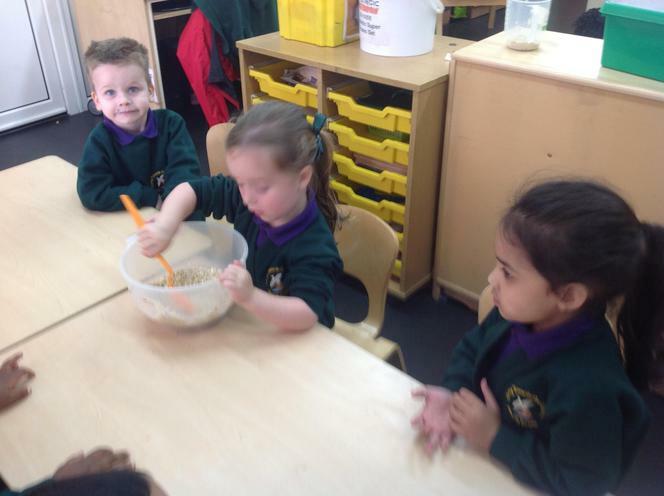 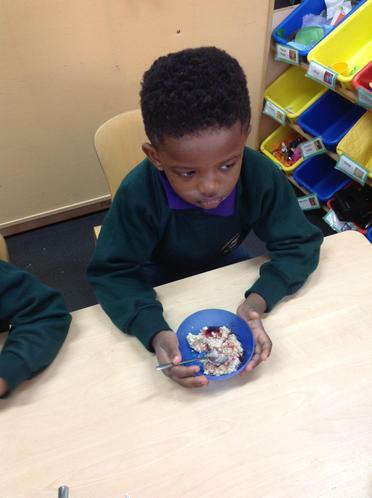 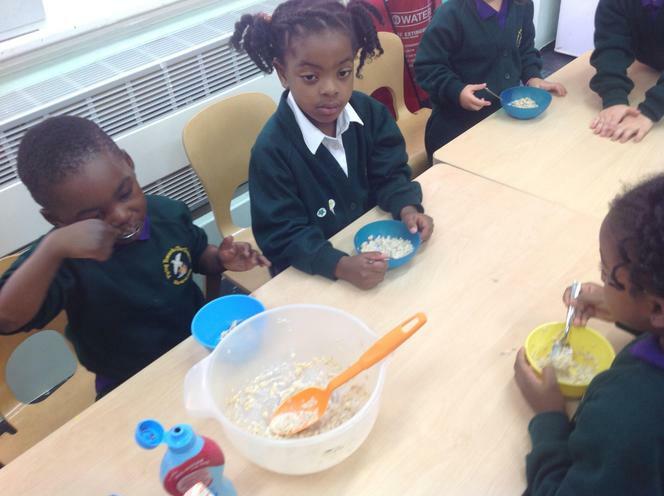 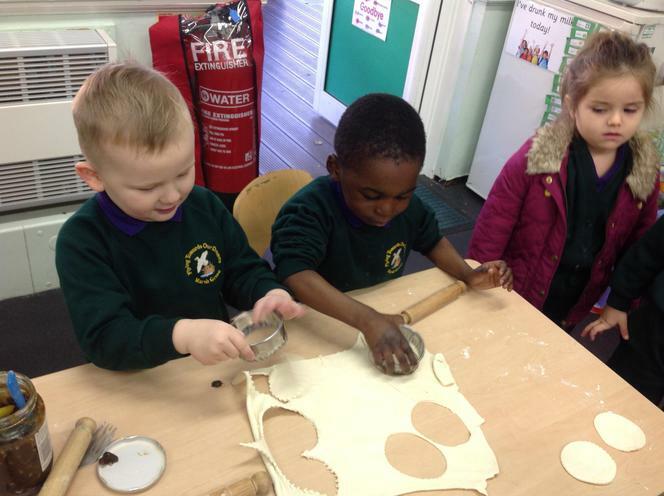 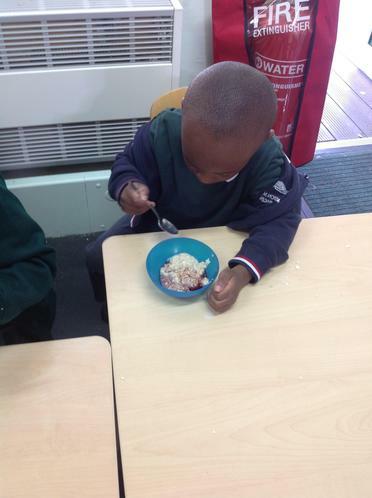 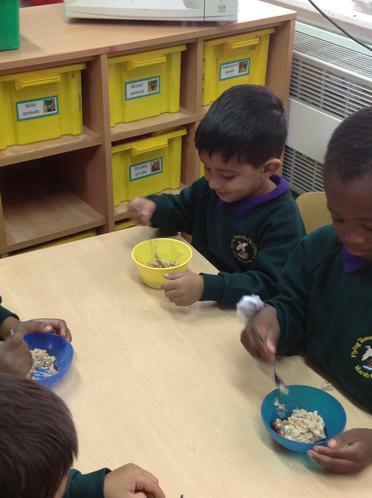 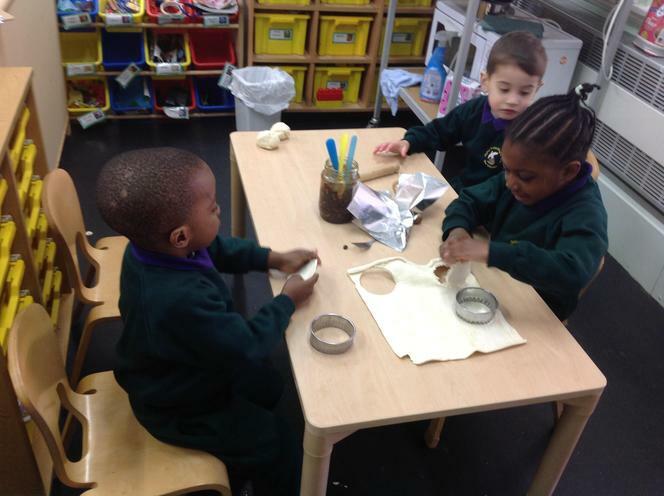 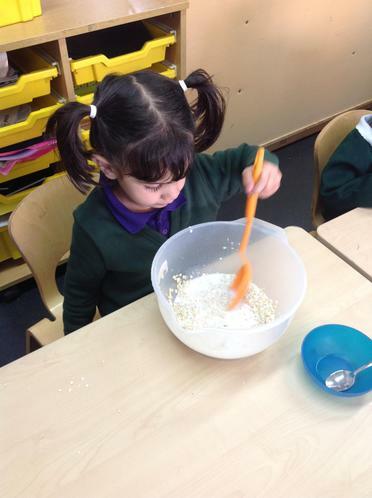 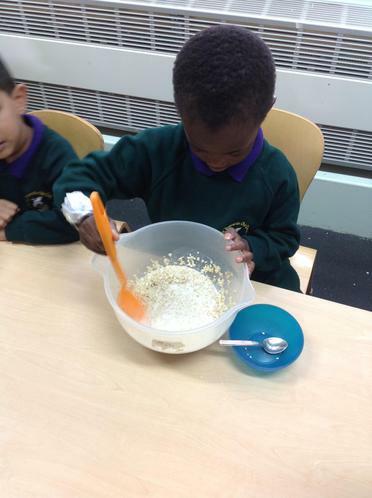 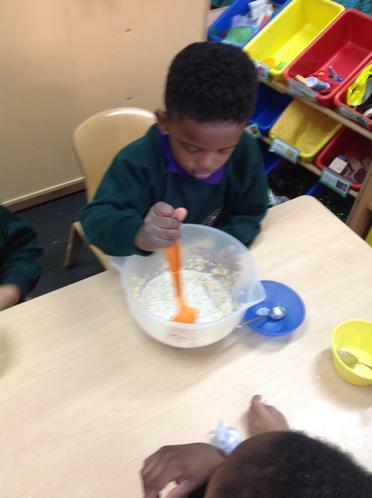 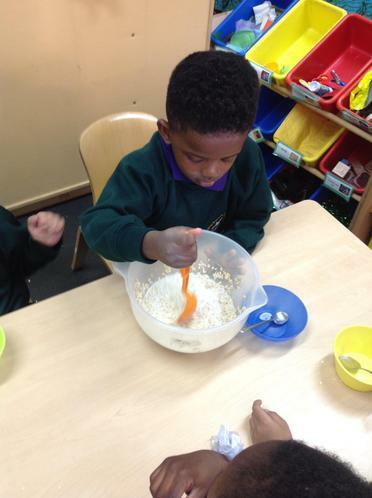 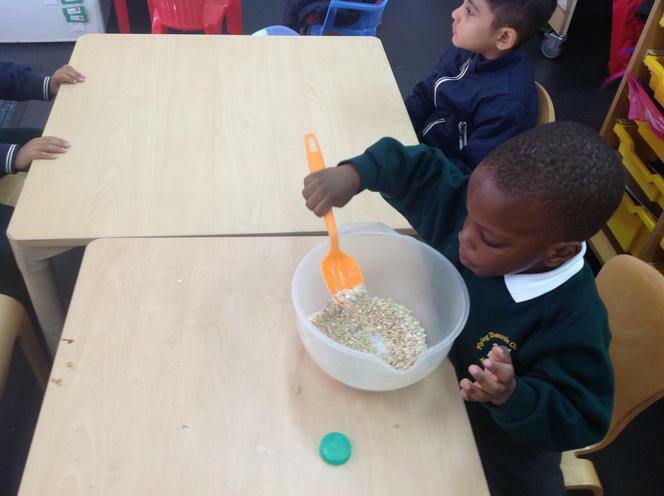 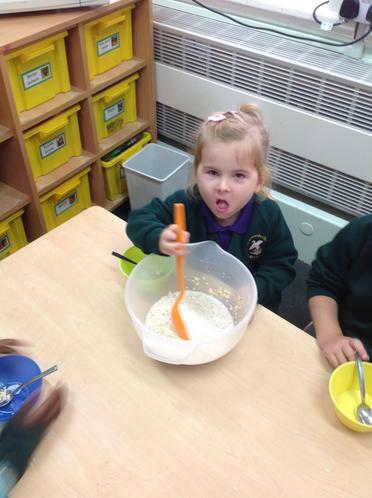 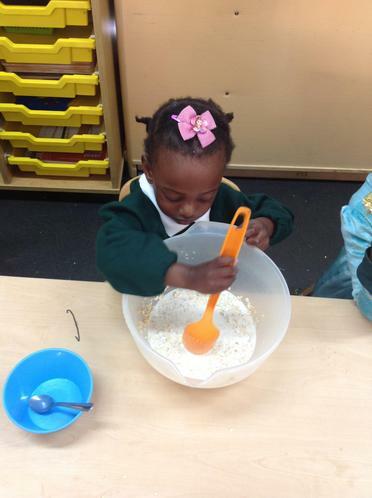 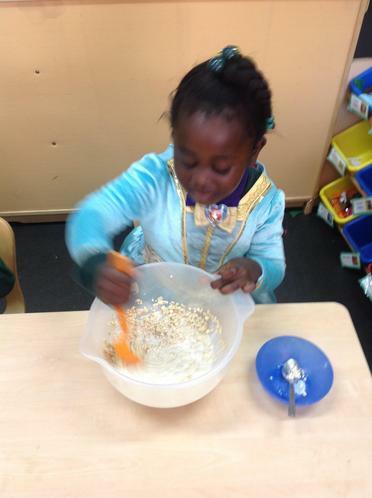 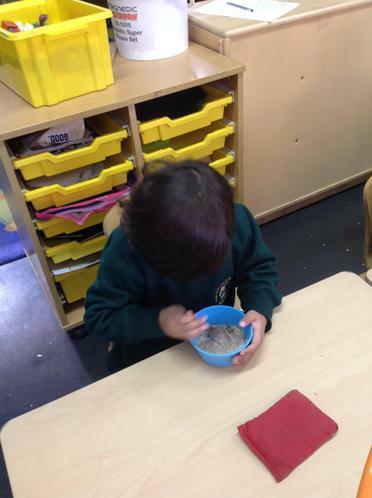 We made porridge like the mummy bear did. 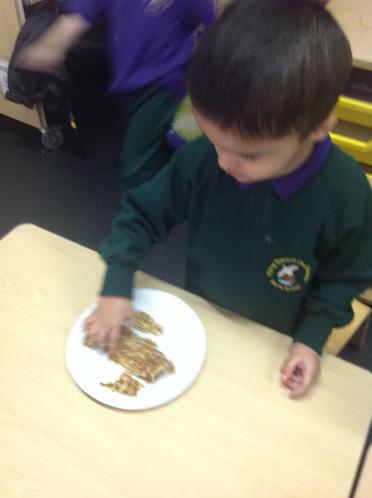 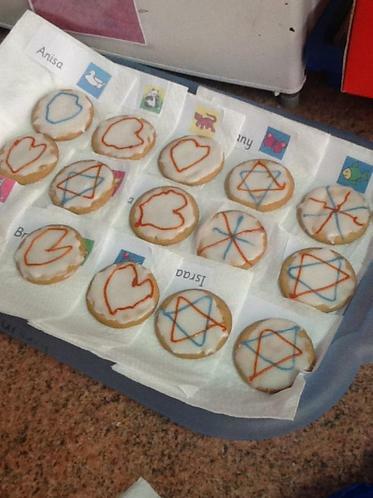 Then we tasted it, like Goldilocks did. 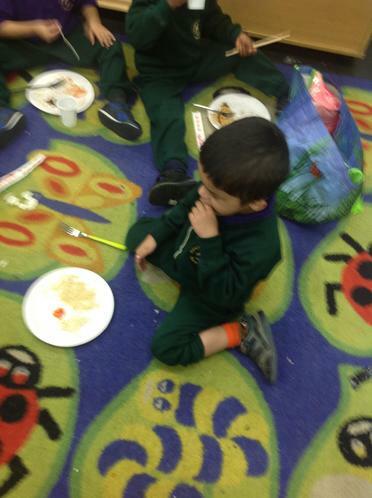 Some of us ate it all up!